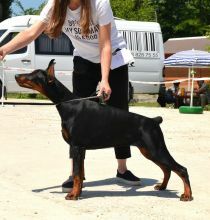 VIVA DE VINKO WENDI MARVEL (AYK VON ELBTOR x KALINKA -MALINKA DE GRAND VINCO) 1ex JCAC, Best Junior! 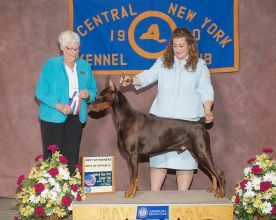 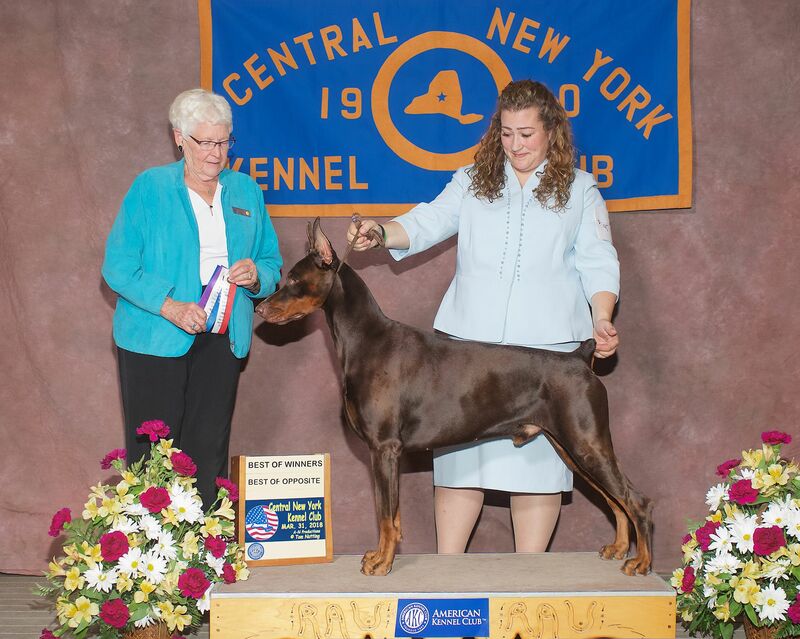 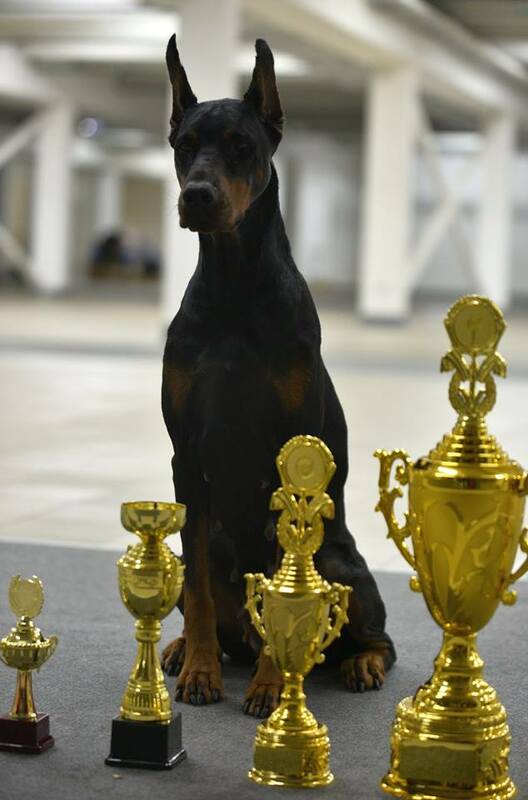 YOUNG CHAMPION OF BREED! Great news from Germany today! 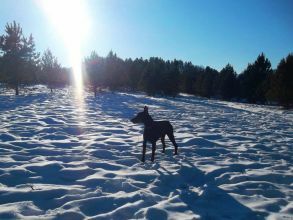 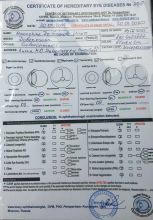 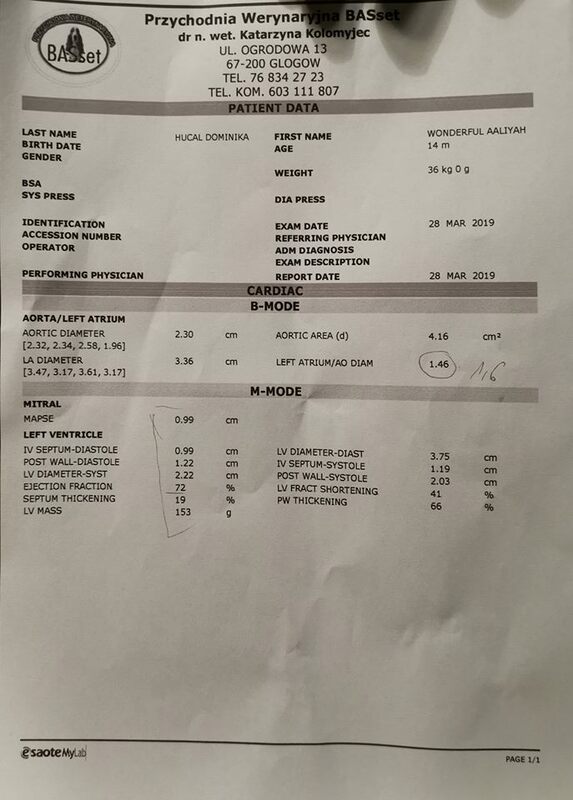 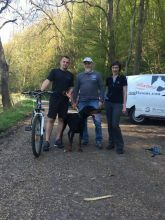 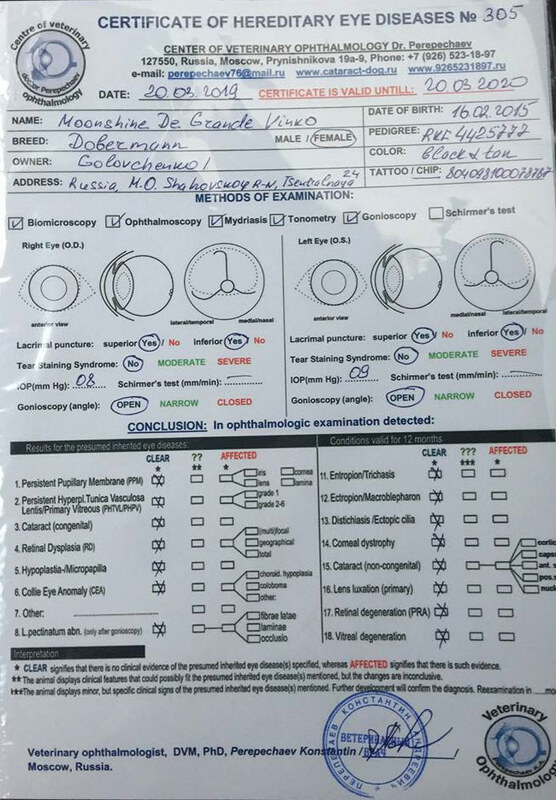 Our inimitable MOONSHINE DE GRANDE VINKO (Smart Wood Hills Boromir-Diana Princess Warrior de Grande Vinko) passed the endurance test of ADPr! 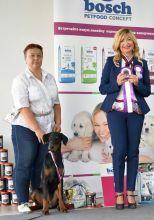 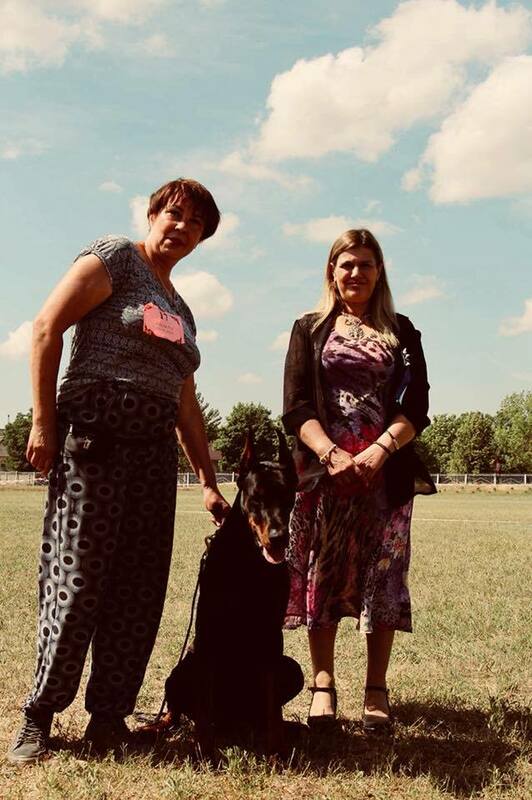 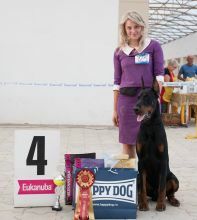 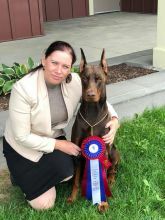 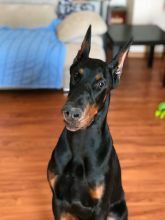 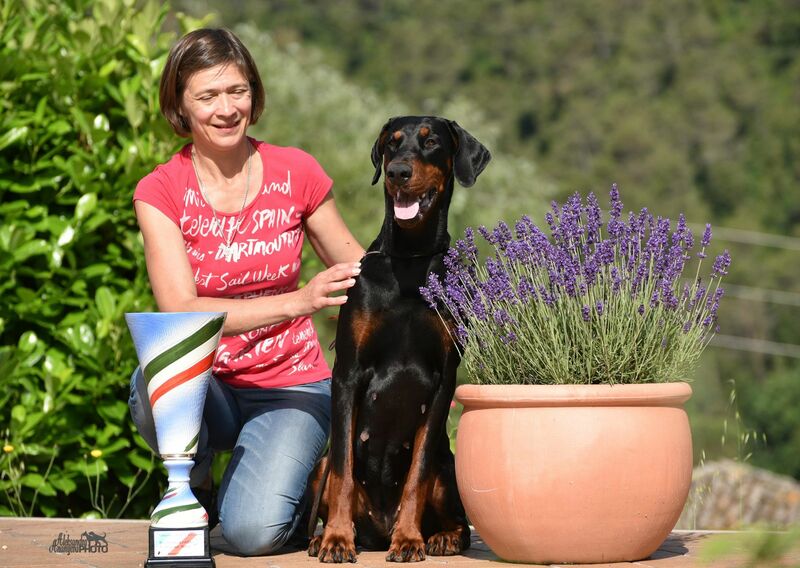 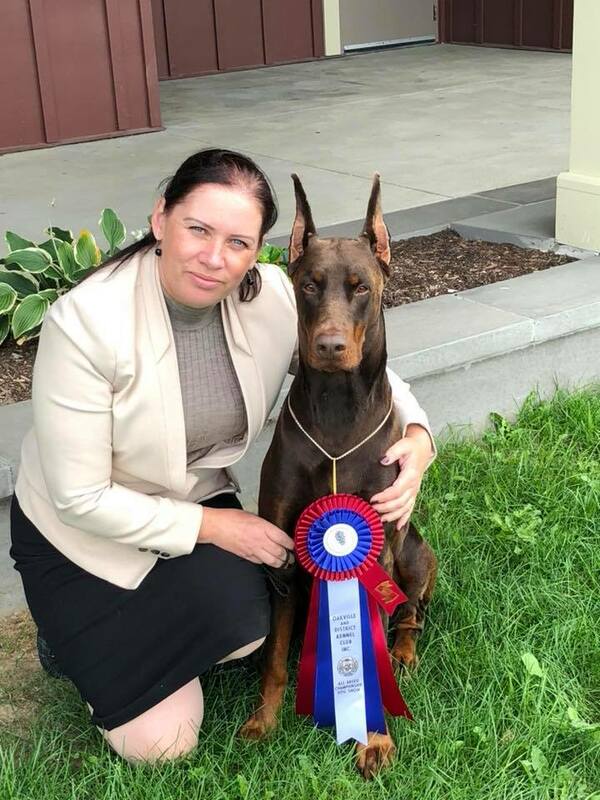 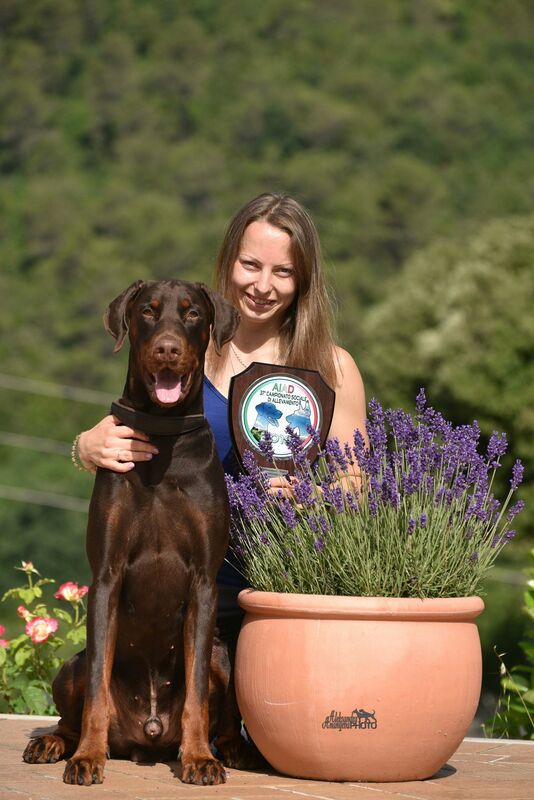 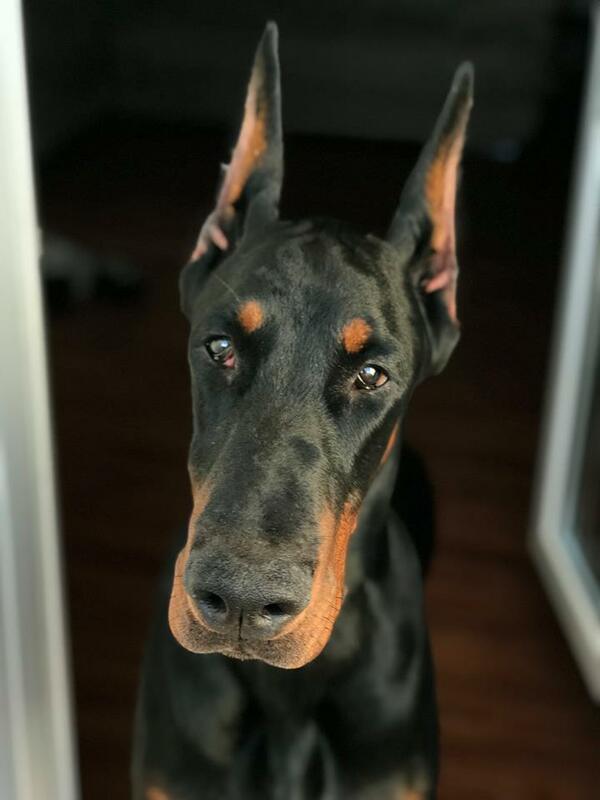 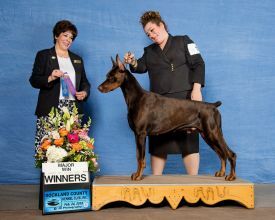 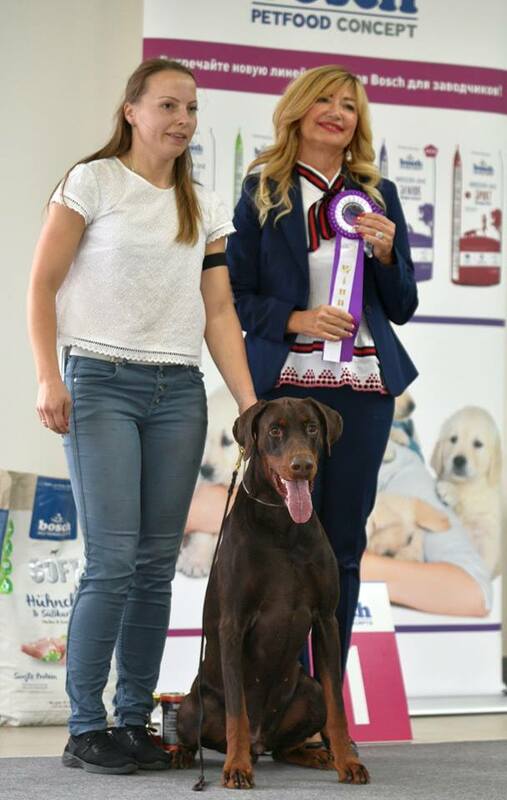 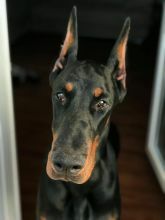 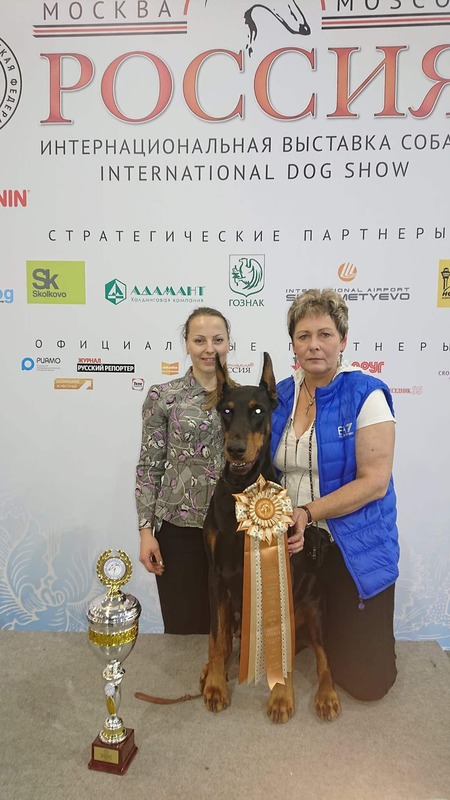 Huge congratulations to the owners Inna Golovchenko and Oksana Bem of this wonderful dog! 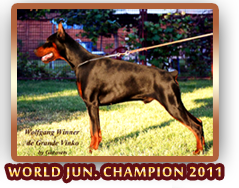 Patricia de Grande Vinko (Filimamont Direct Hit x Alastriona de Grande Vinko) 1 ex, CCC, Best black female, Club Winner. 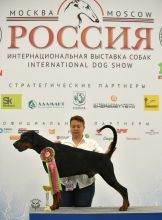 Moscow Champion. 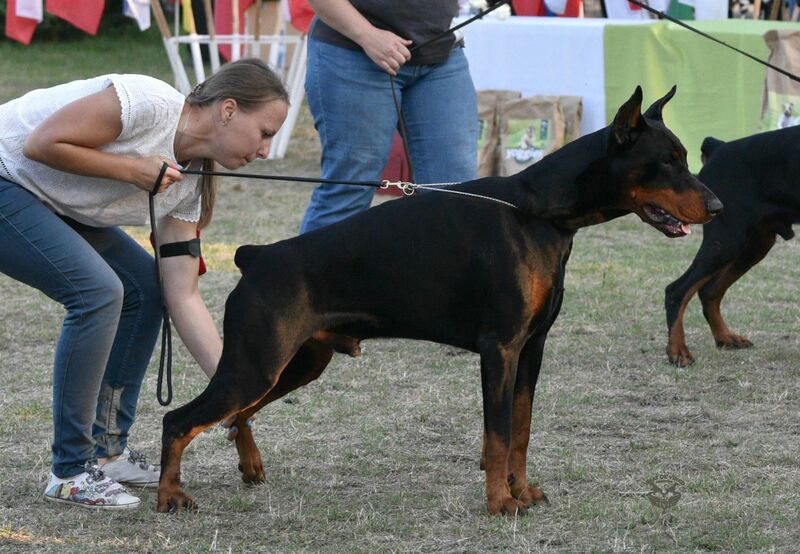 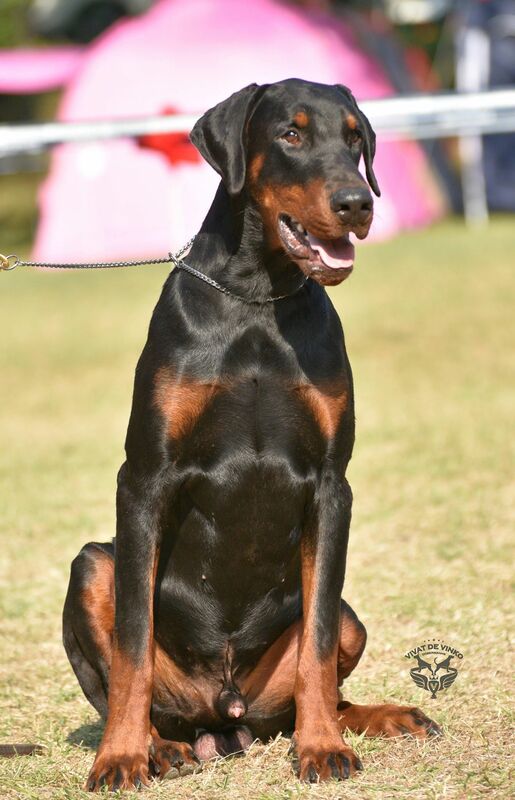 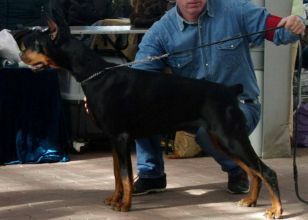 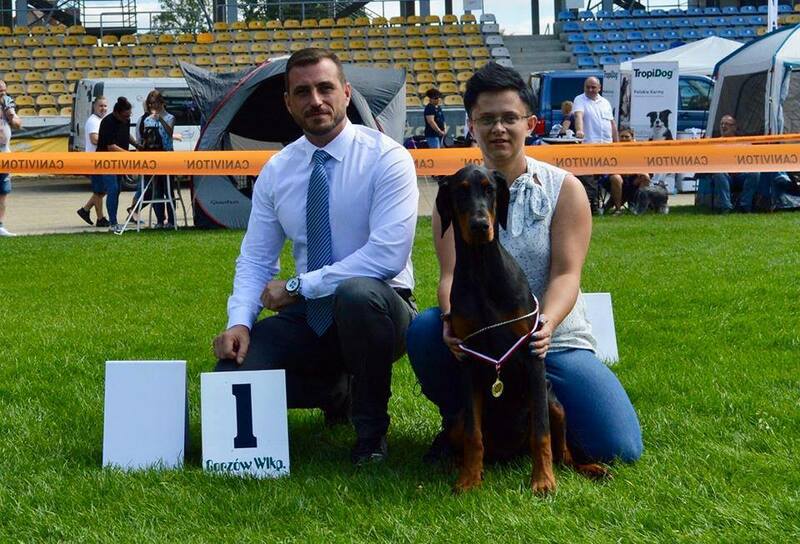 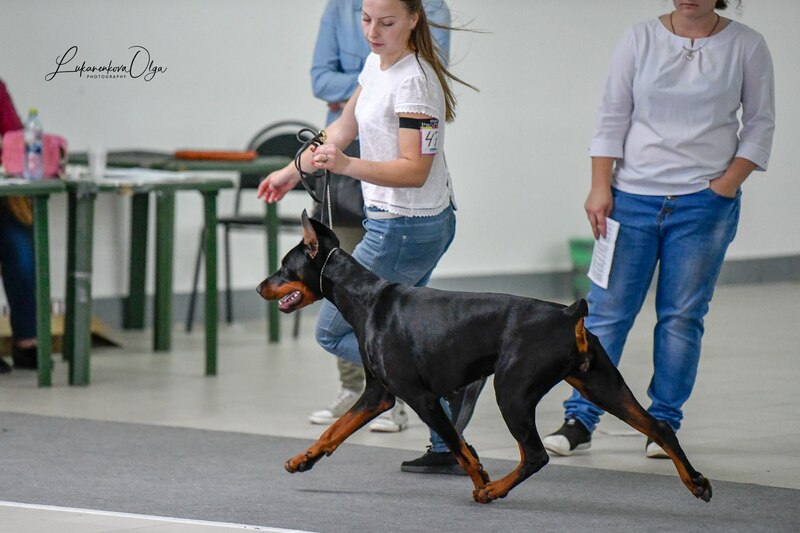 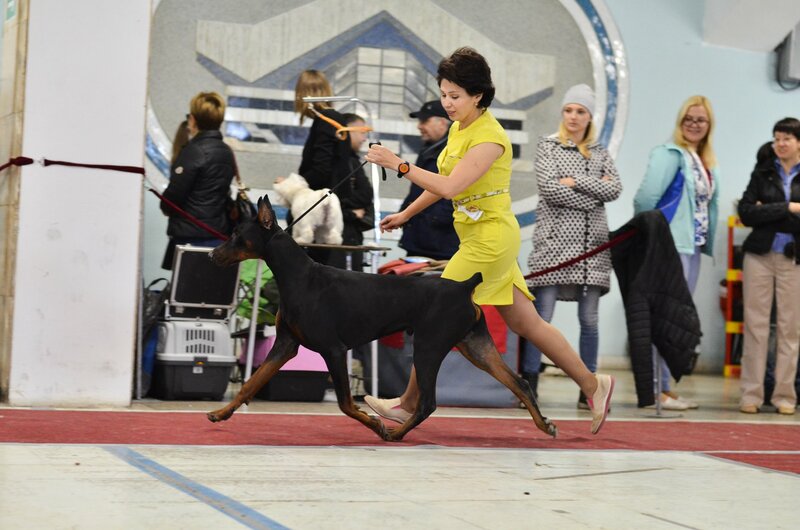 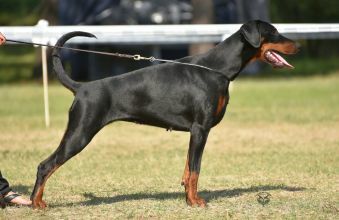 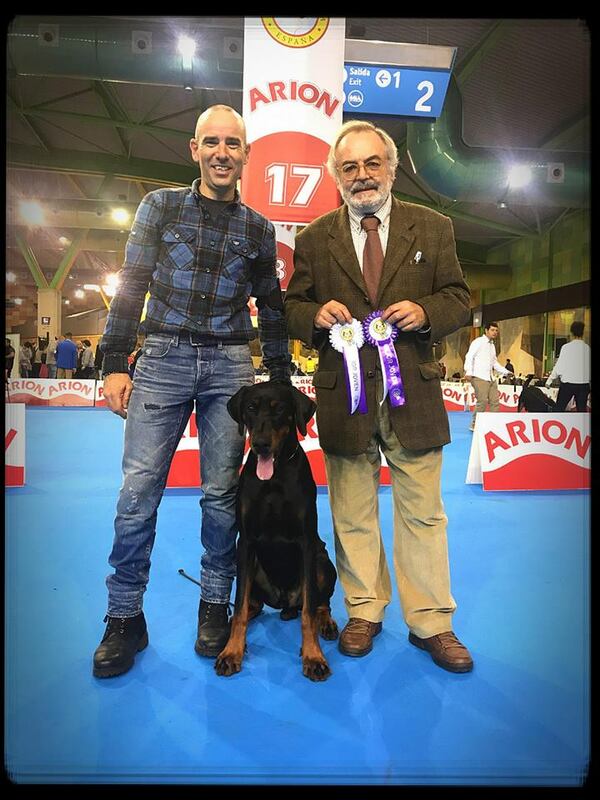 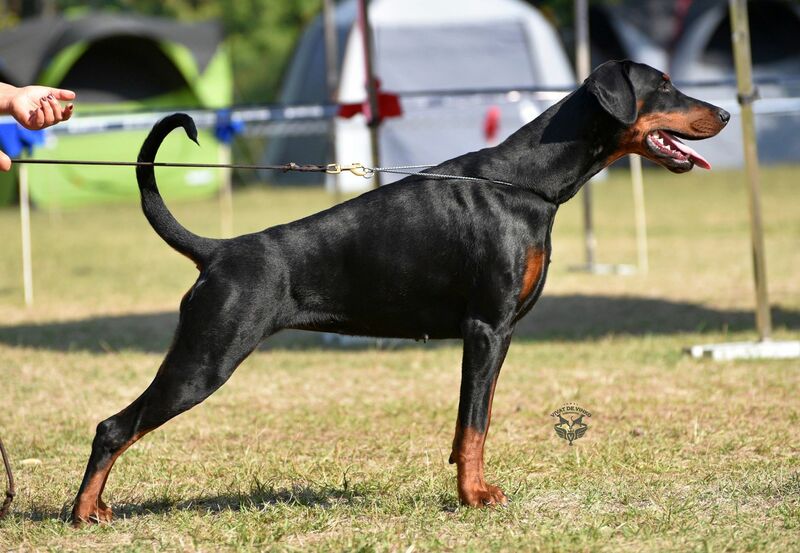 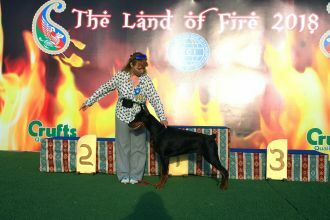 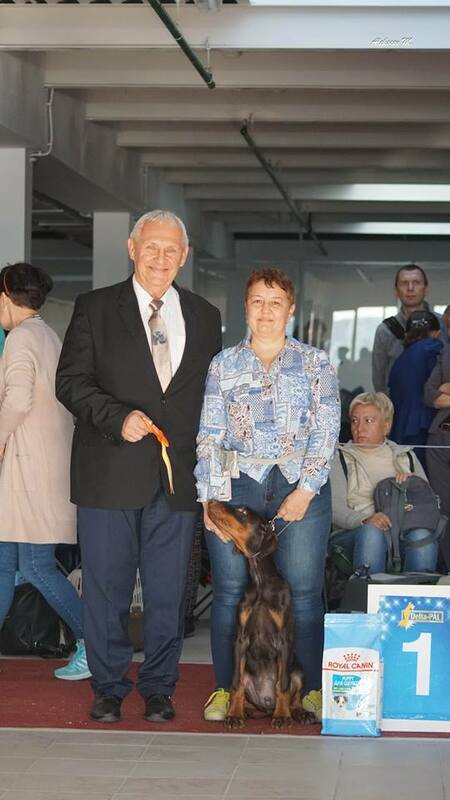 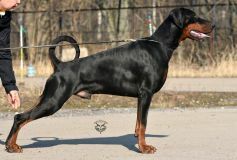 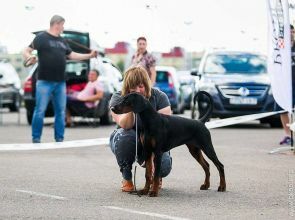 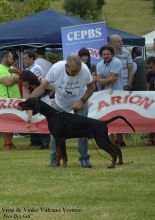 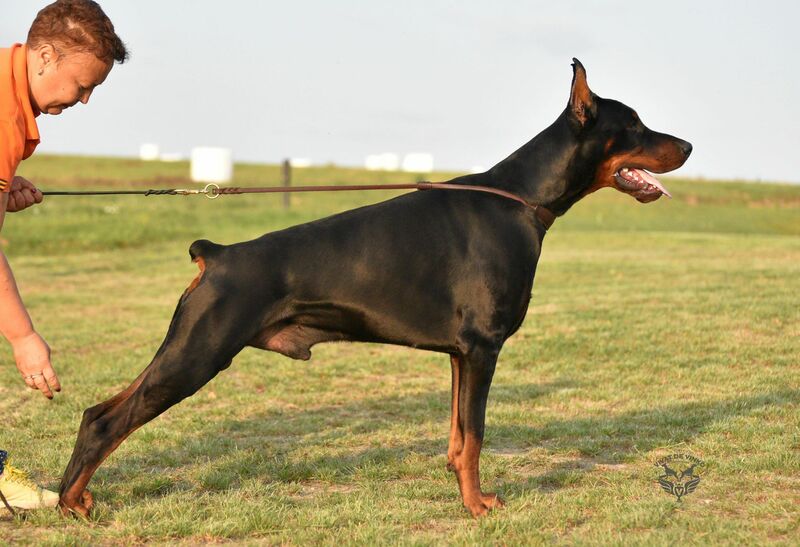 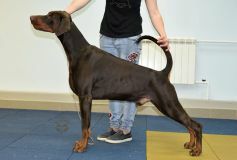 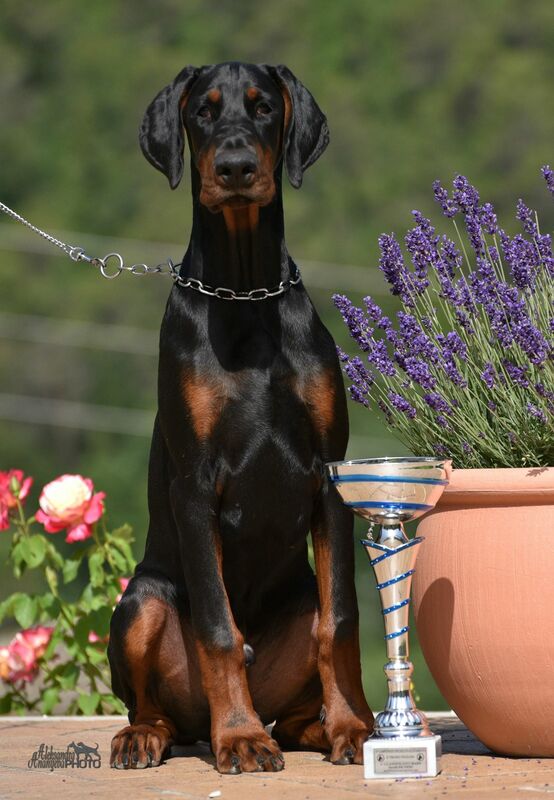 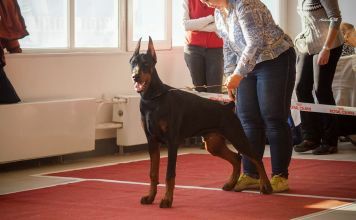 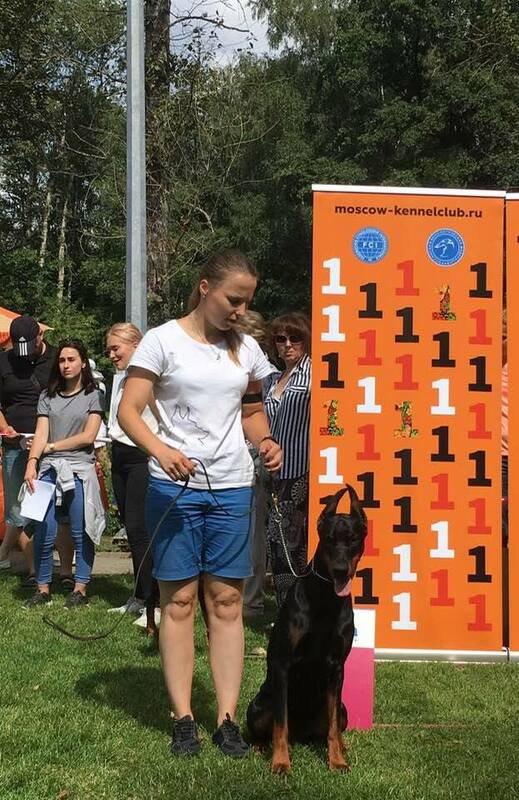 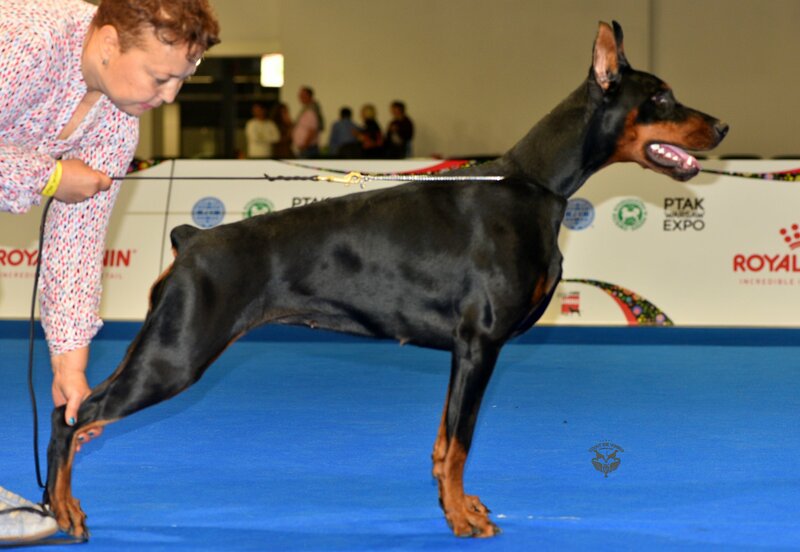 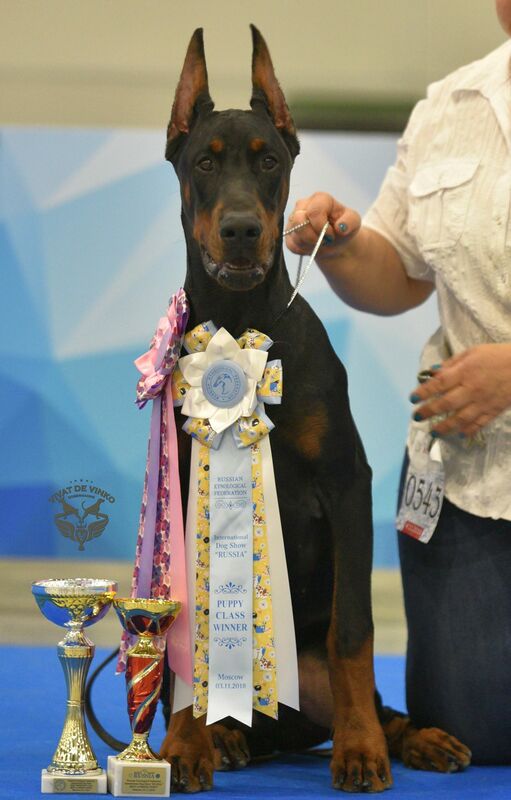 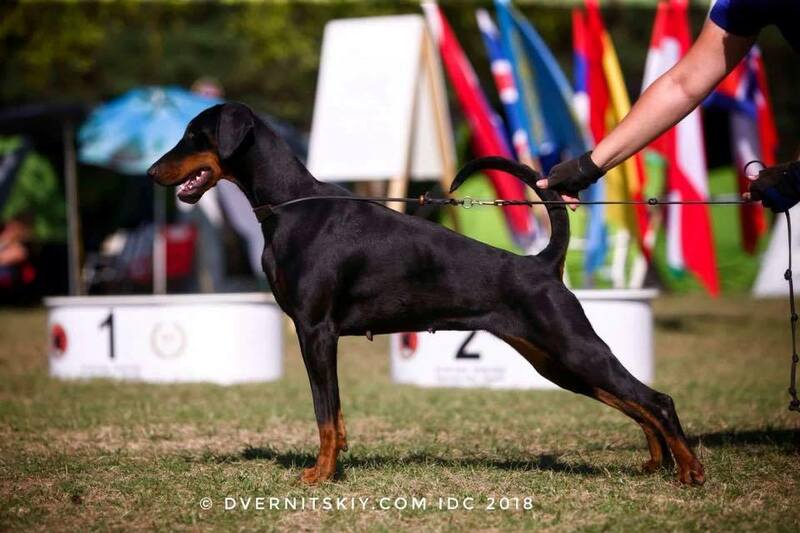 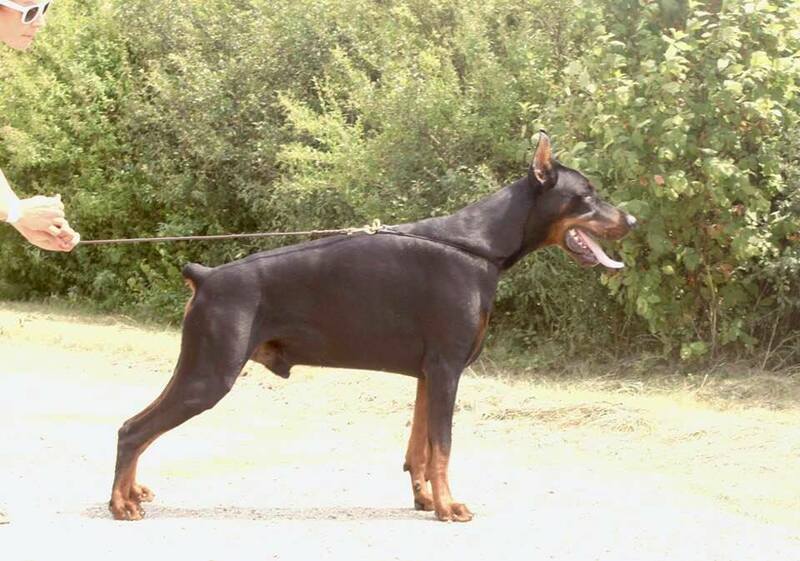 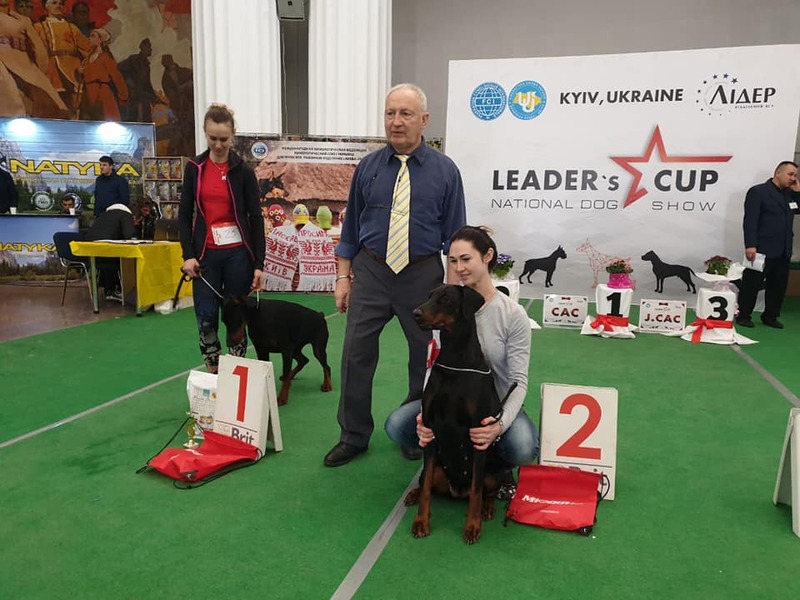 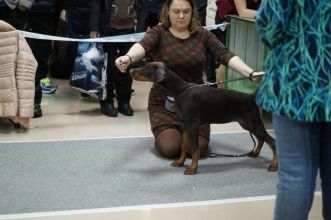 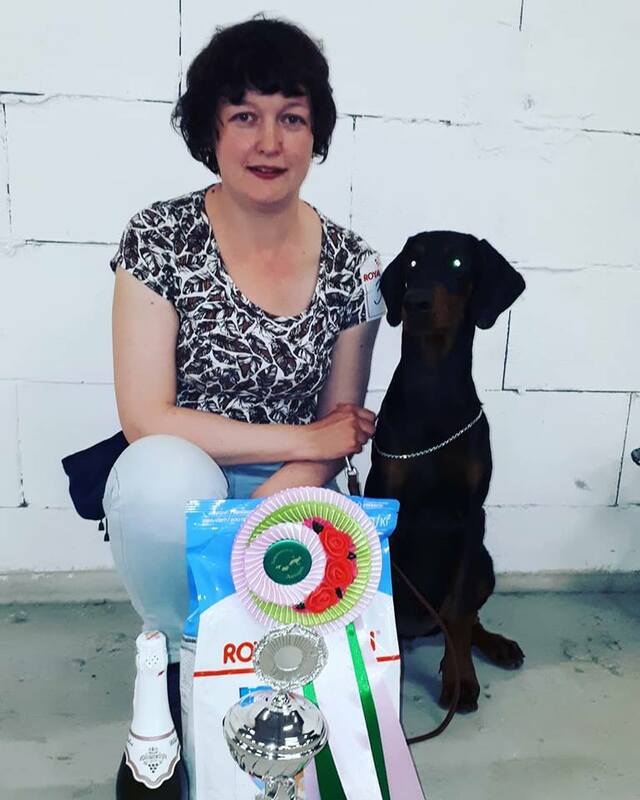 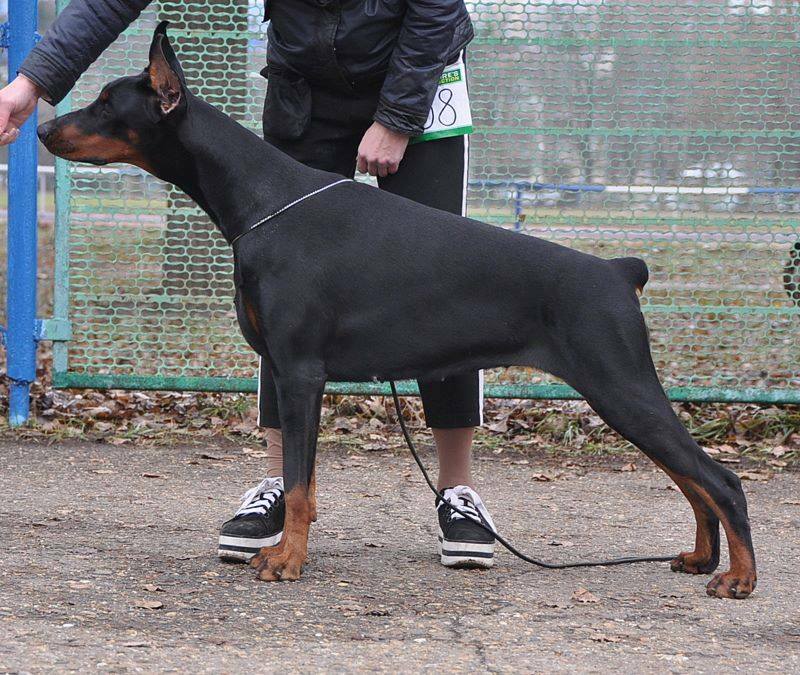 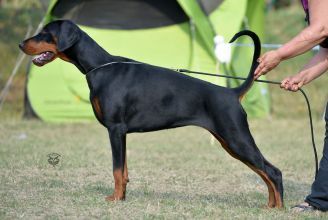 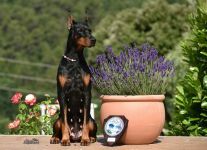 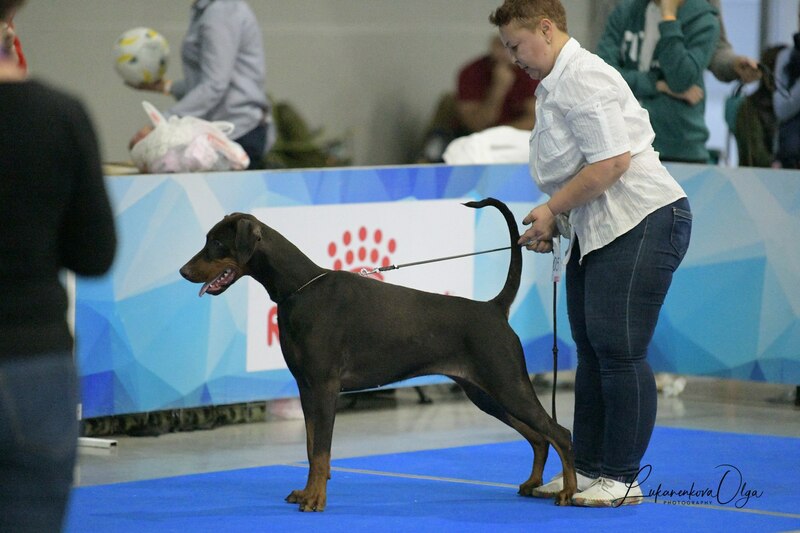 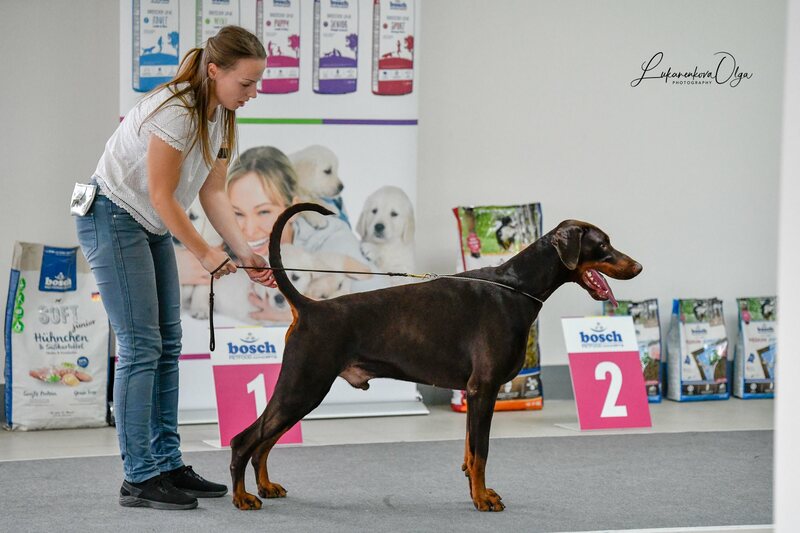 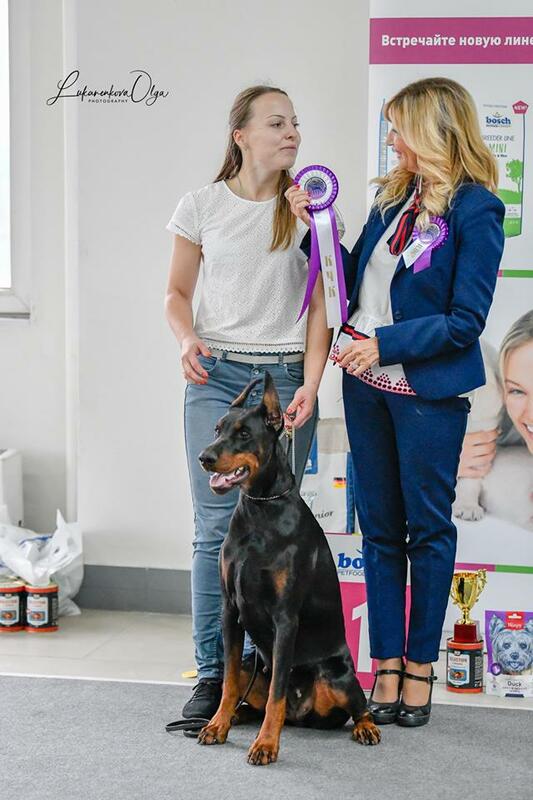 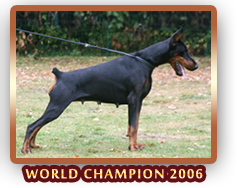 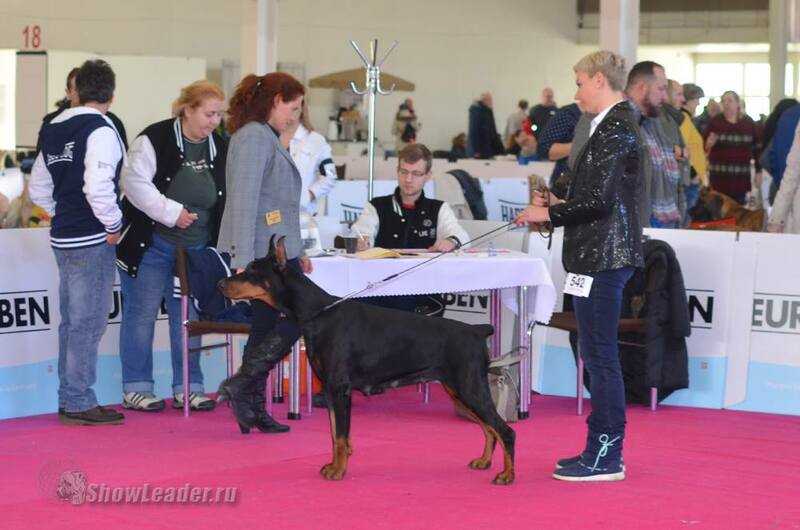 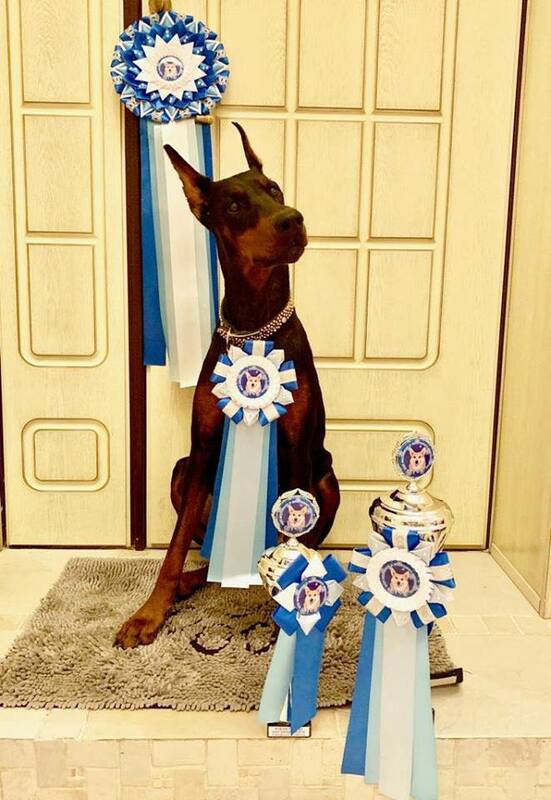 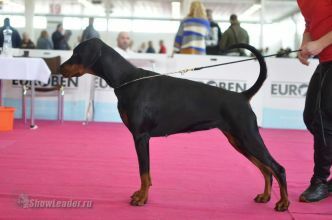 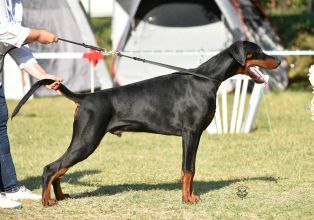 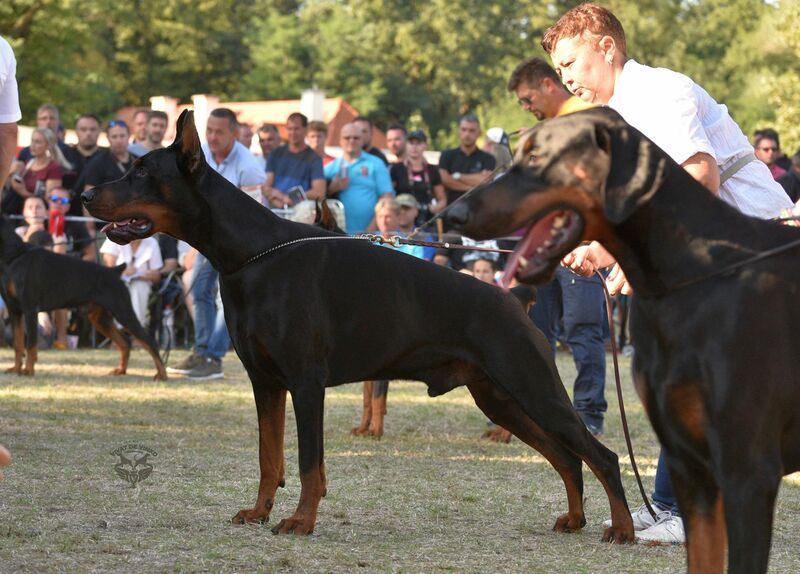 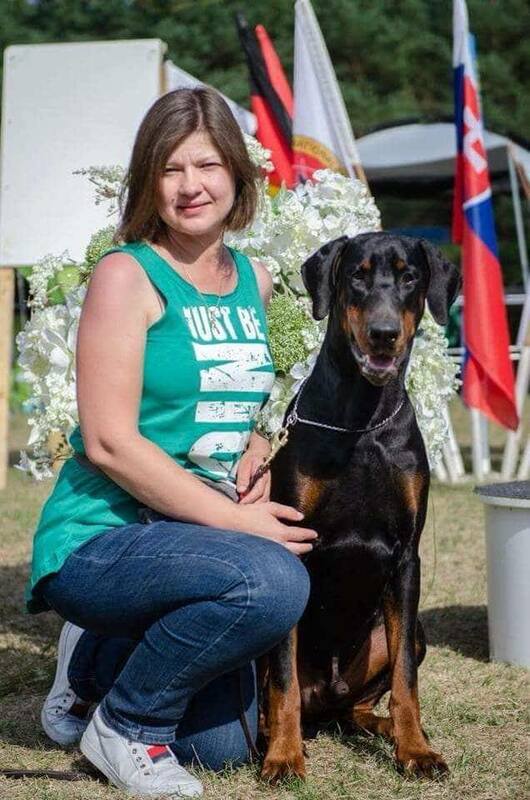 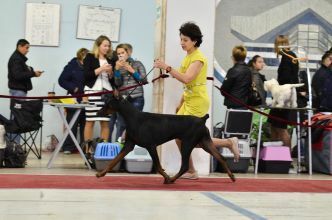 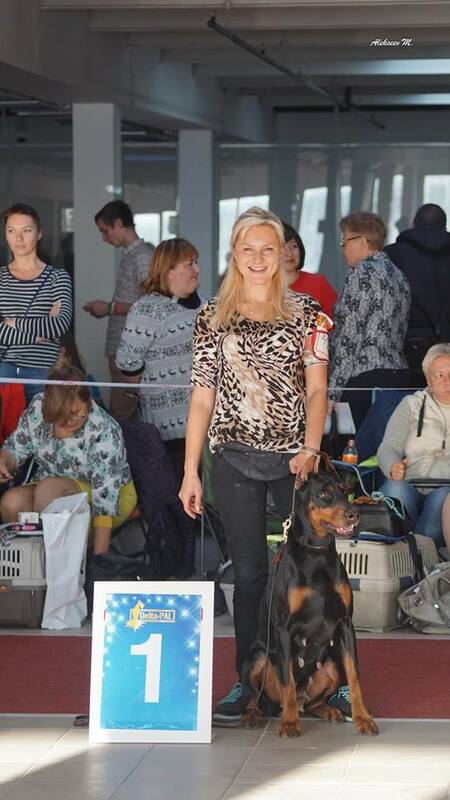 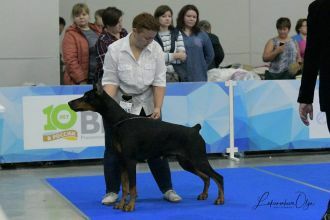 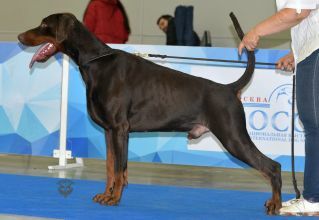 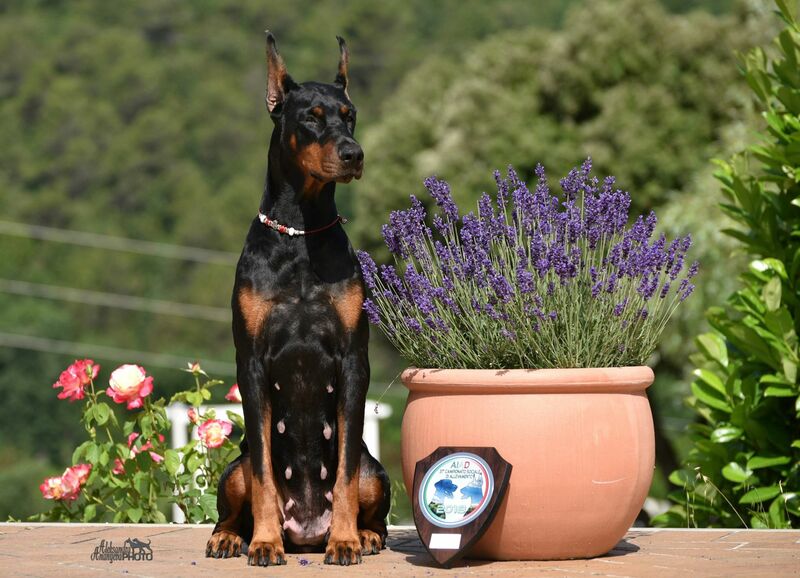 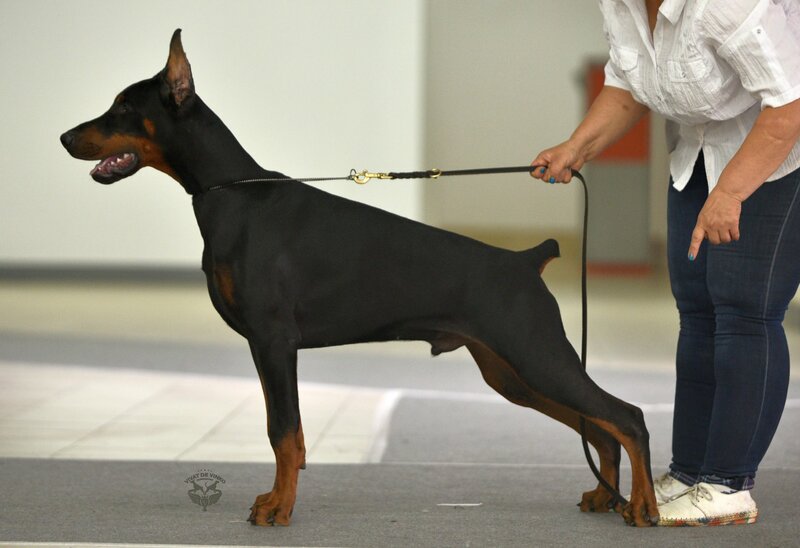 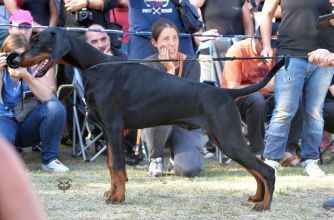 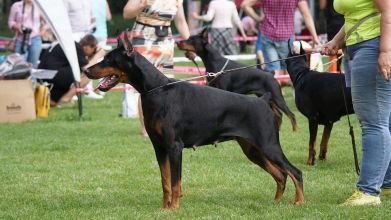 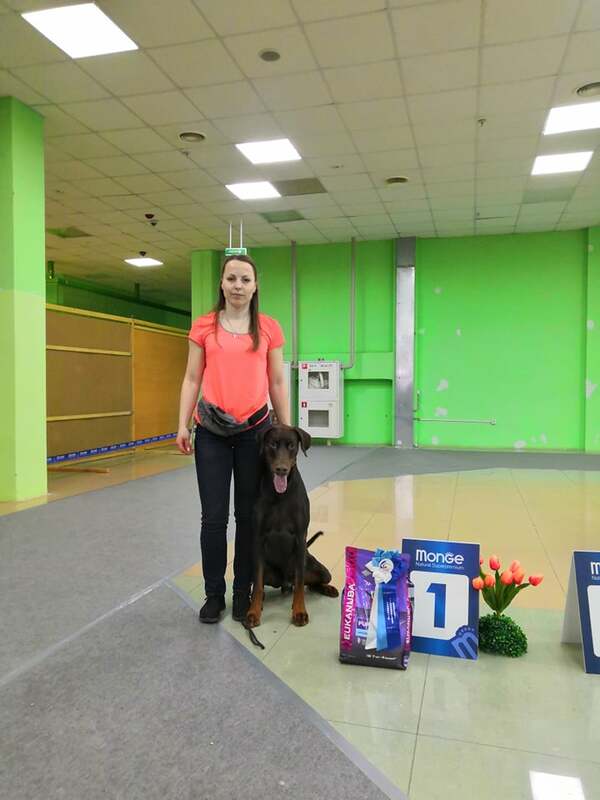 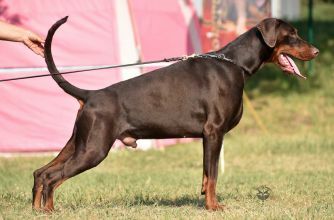 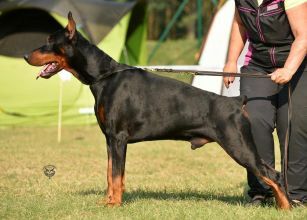 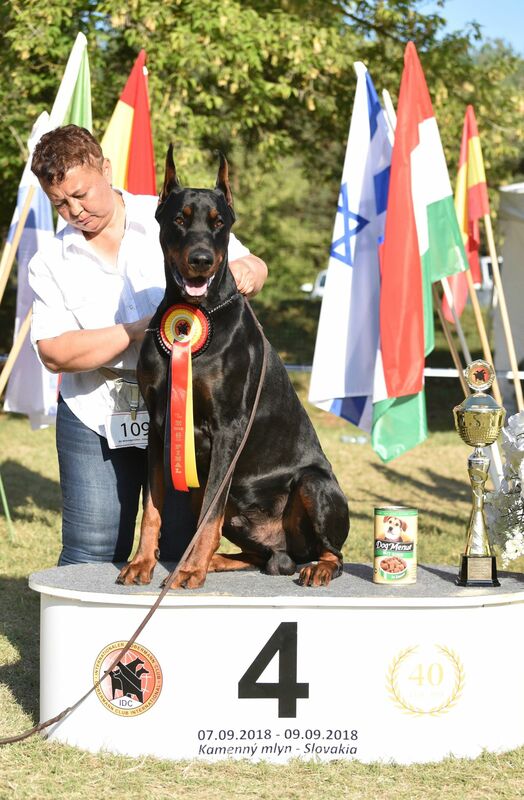 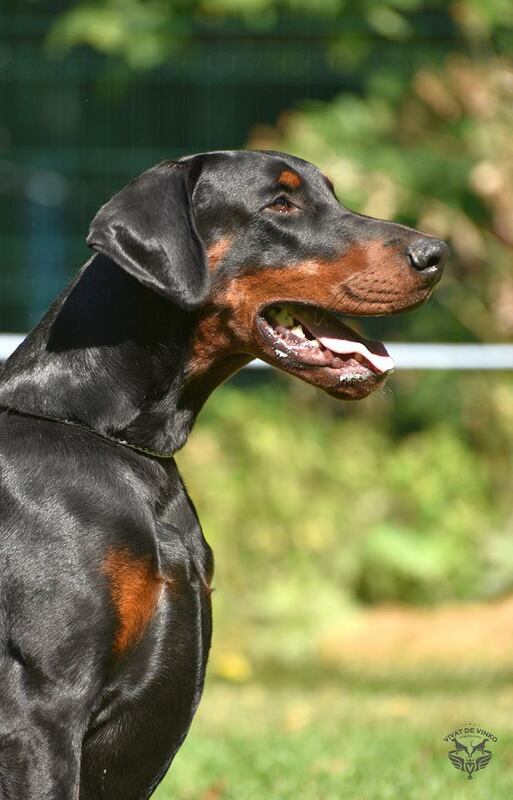 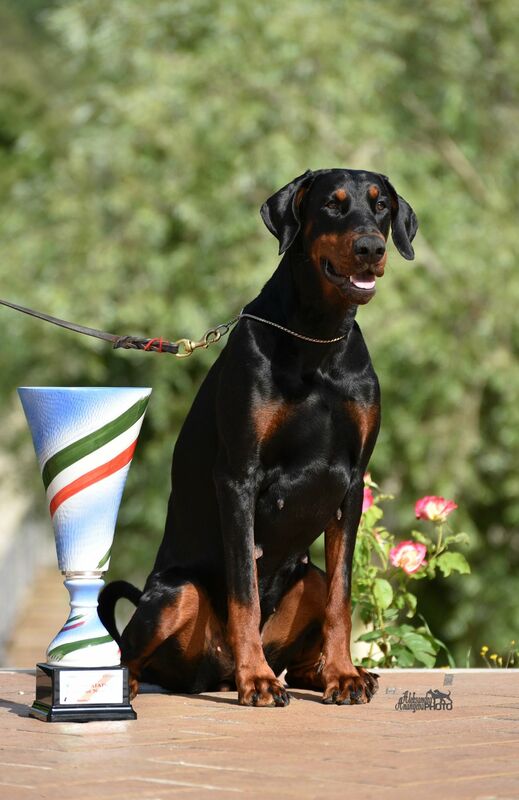 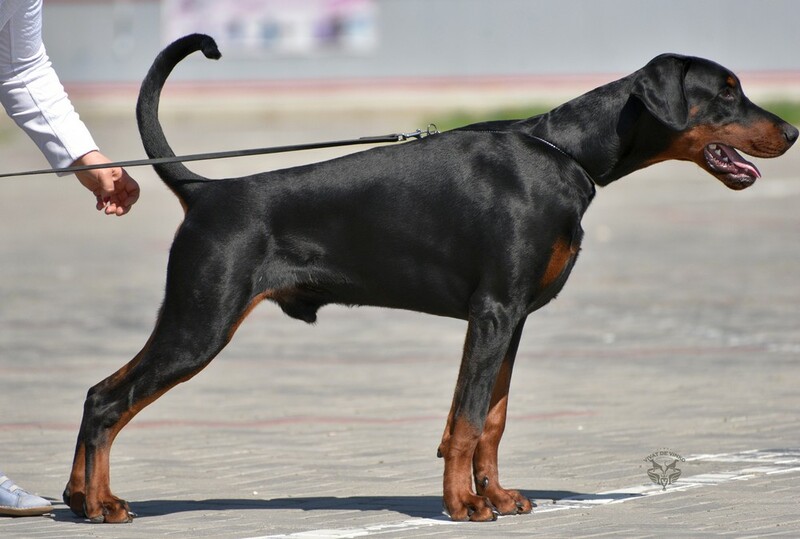 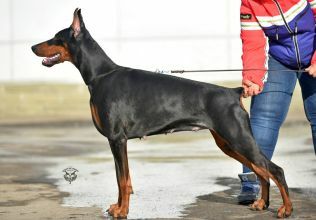 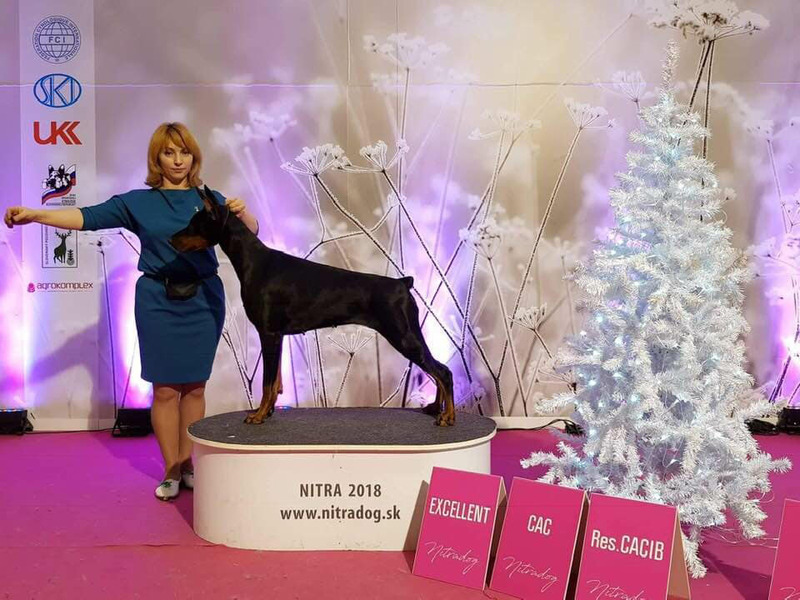 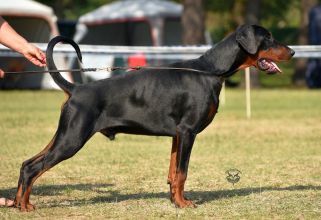 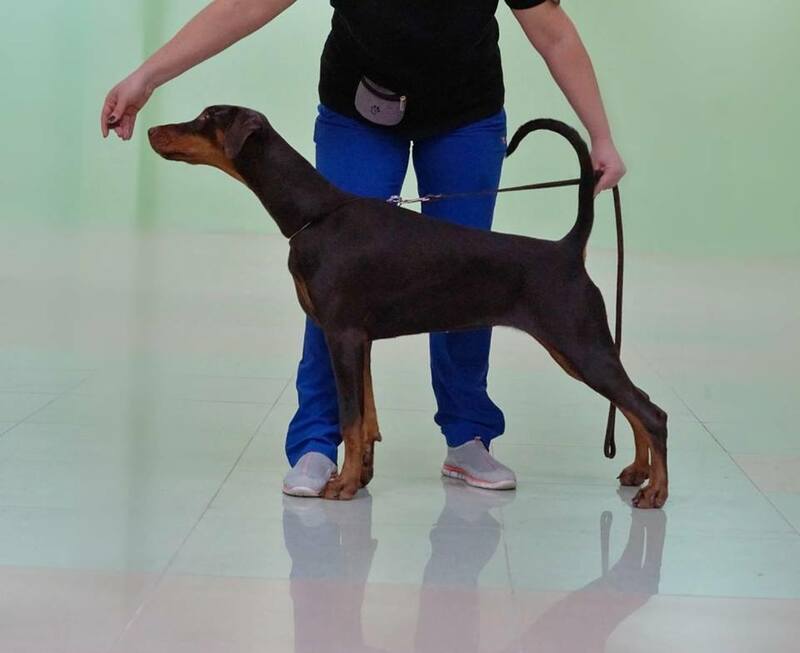 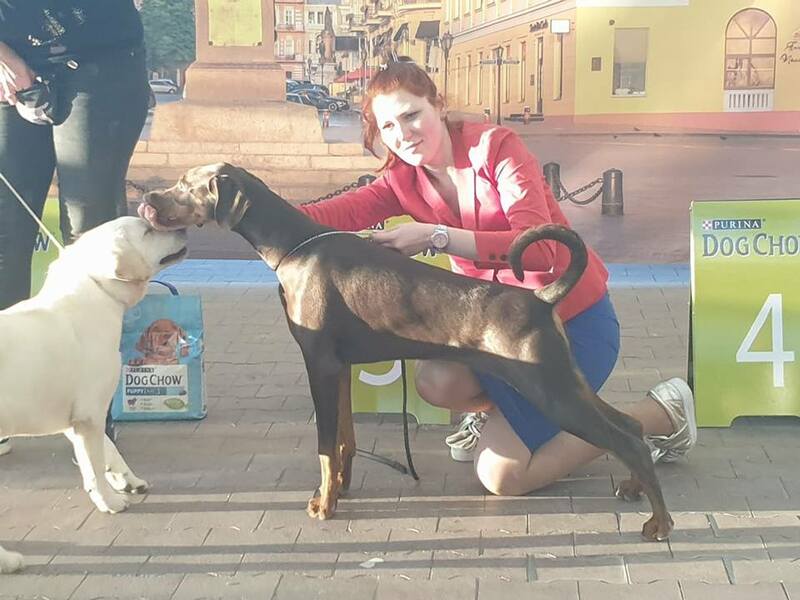 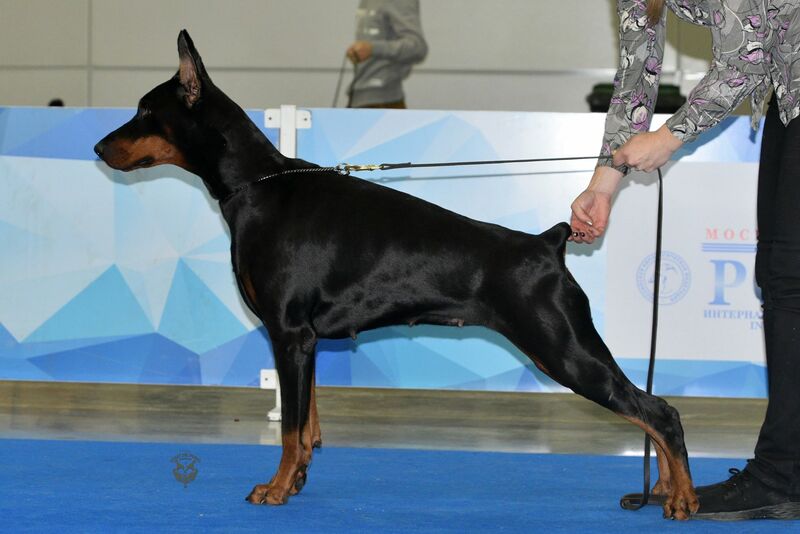 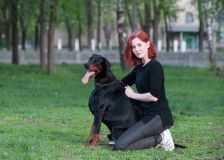 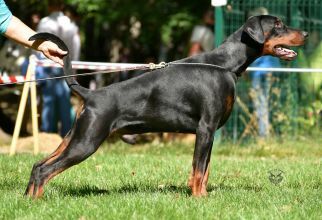 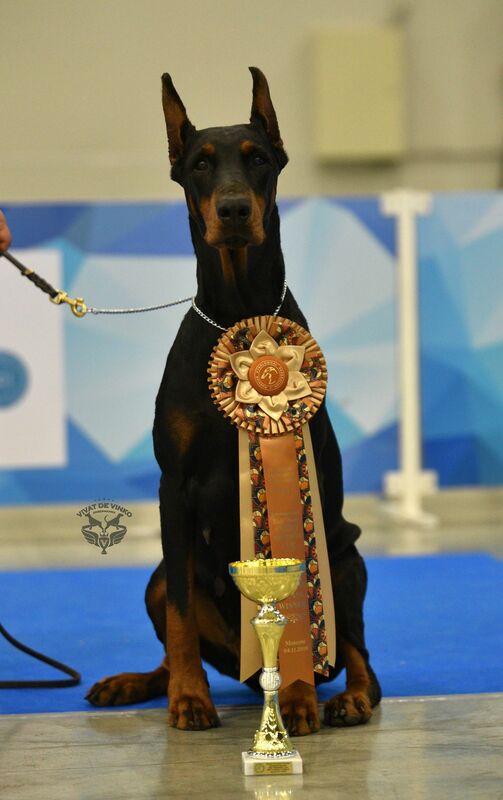 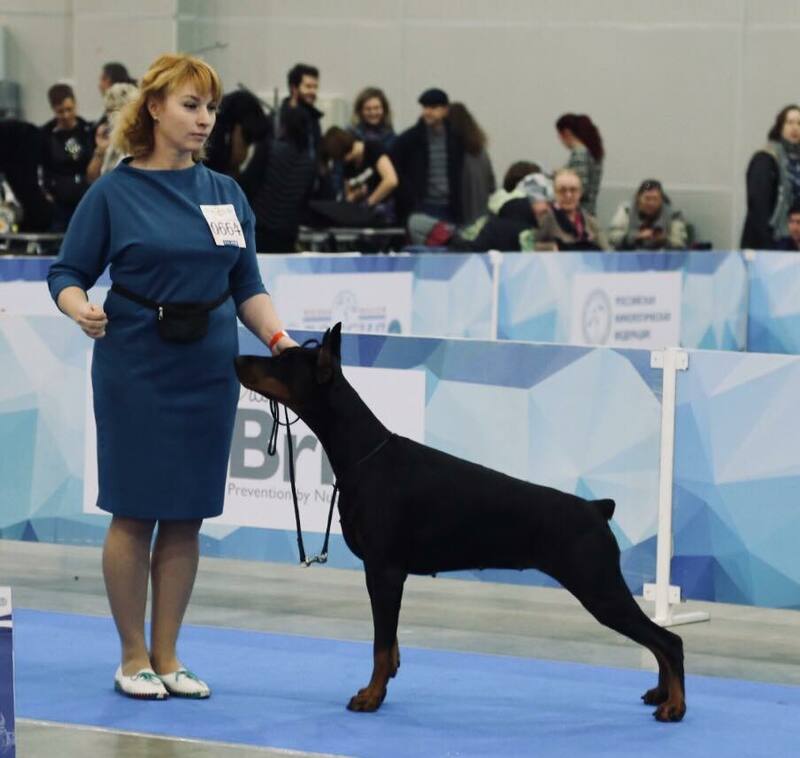 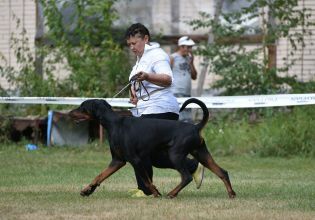 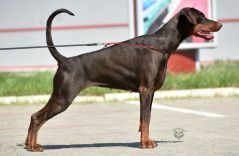 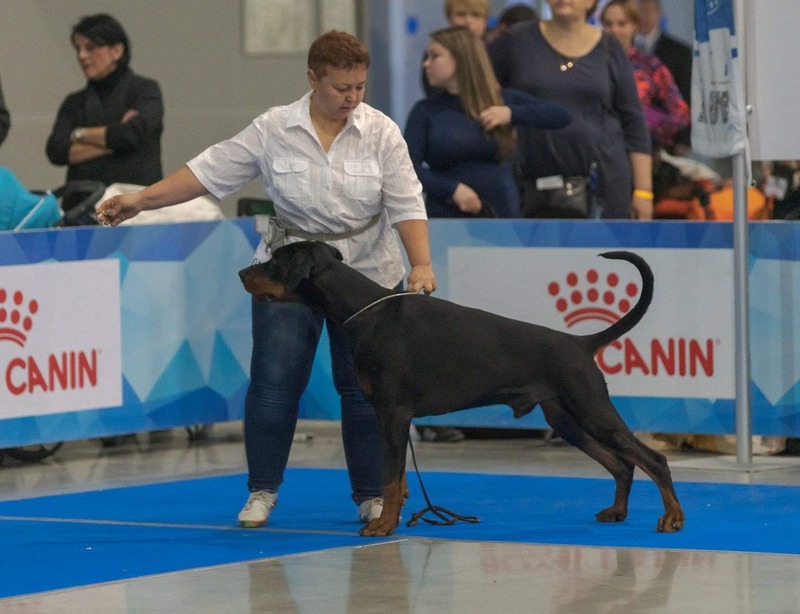 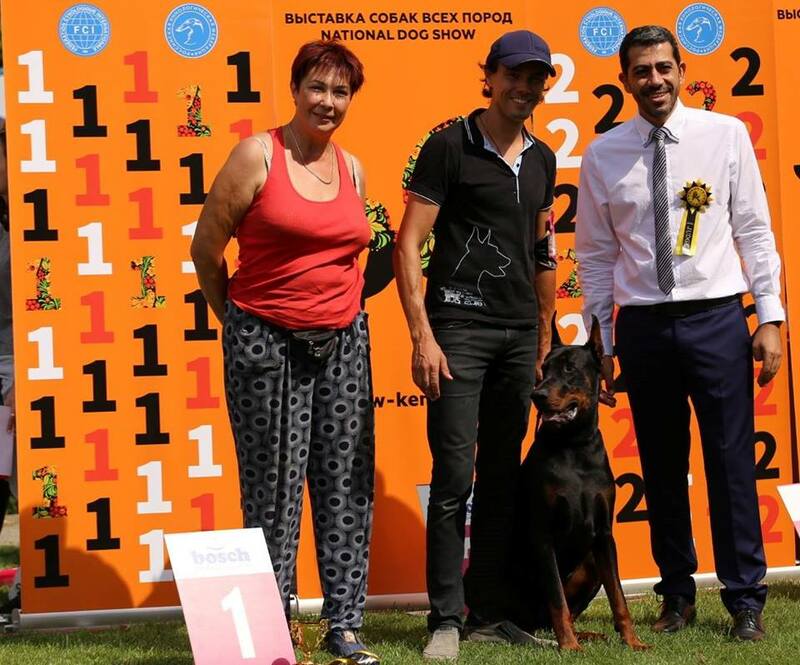 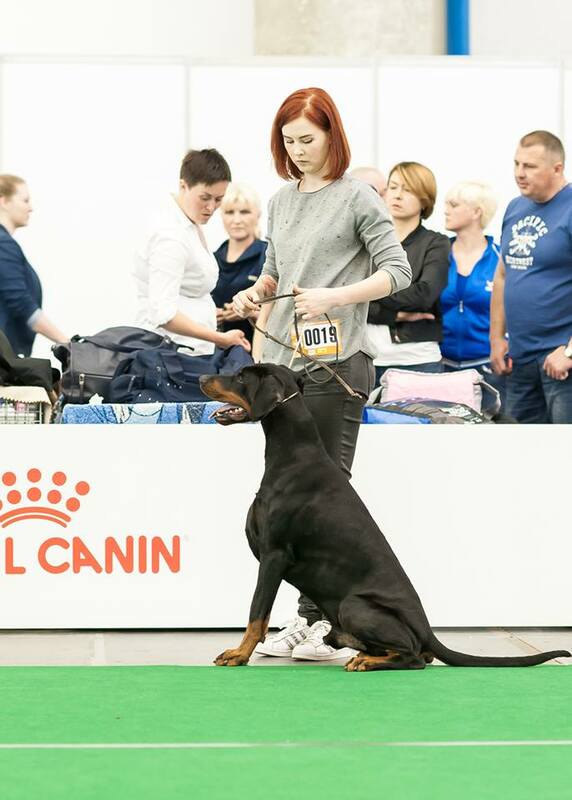 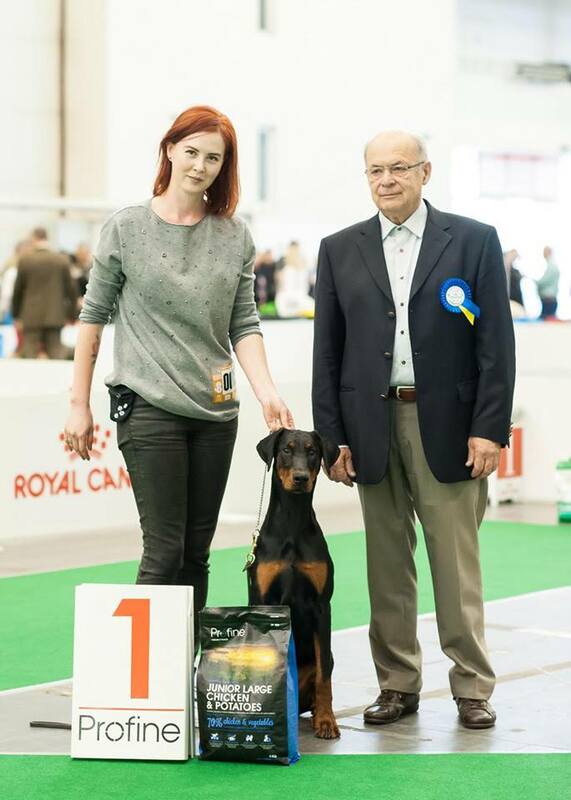 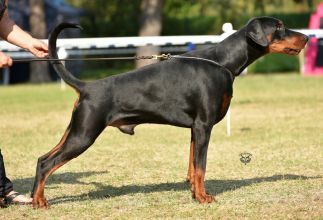 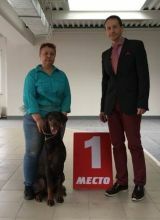 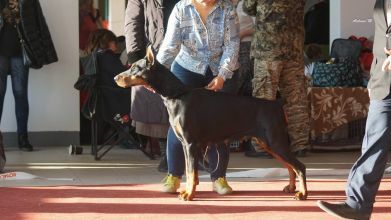 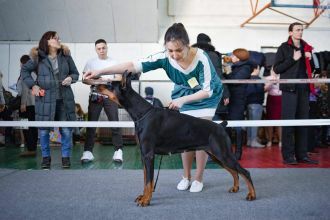 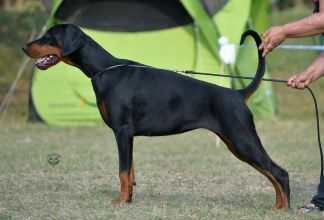 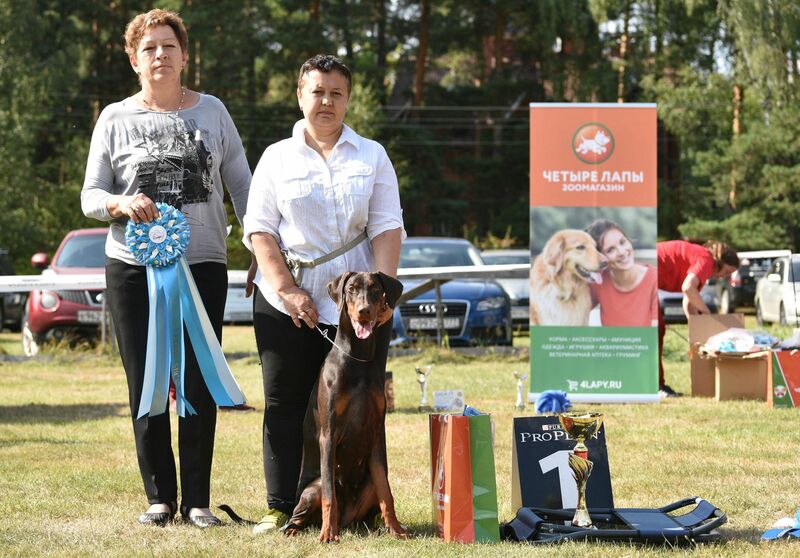 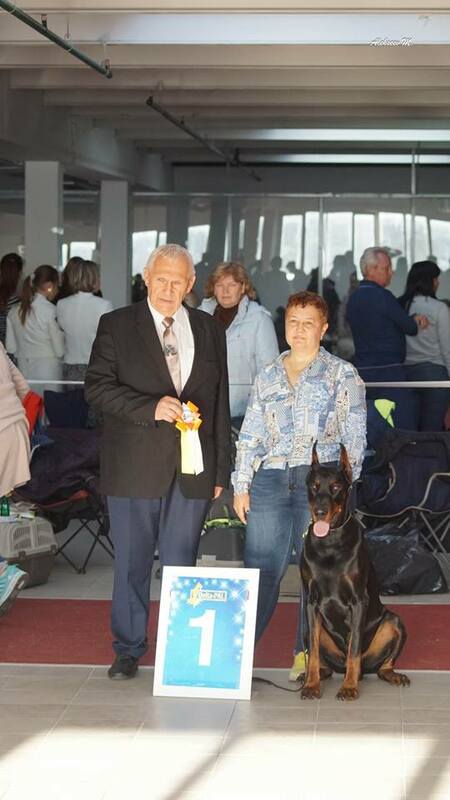 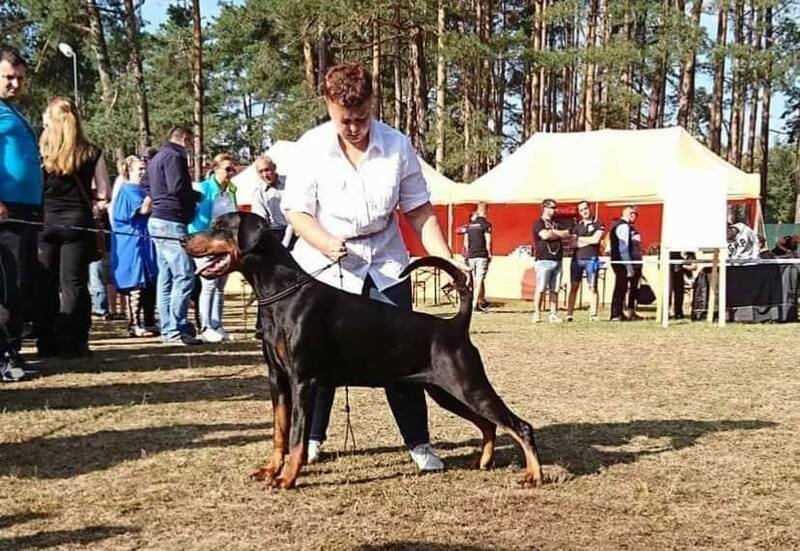 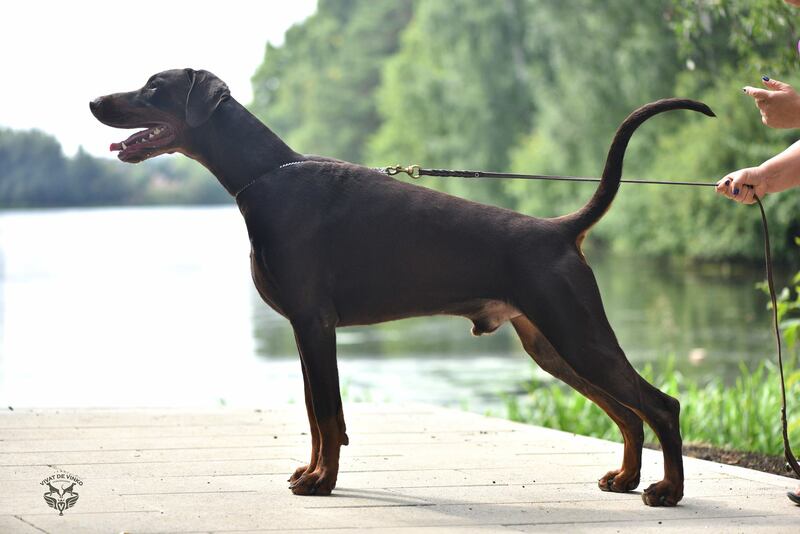 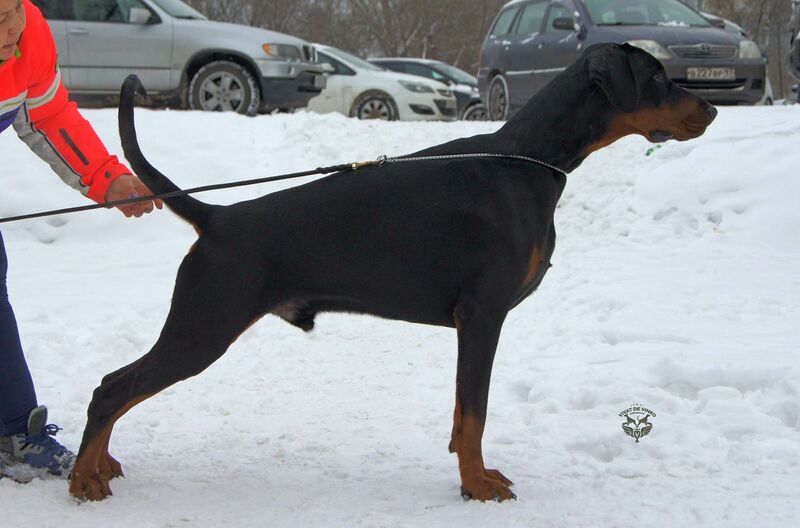 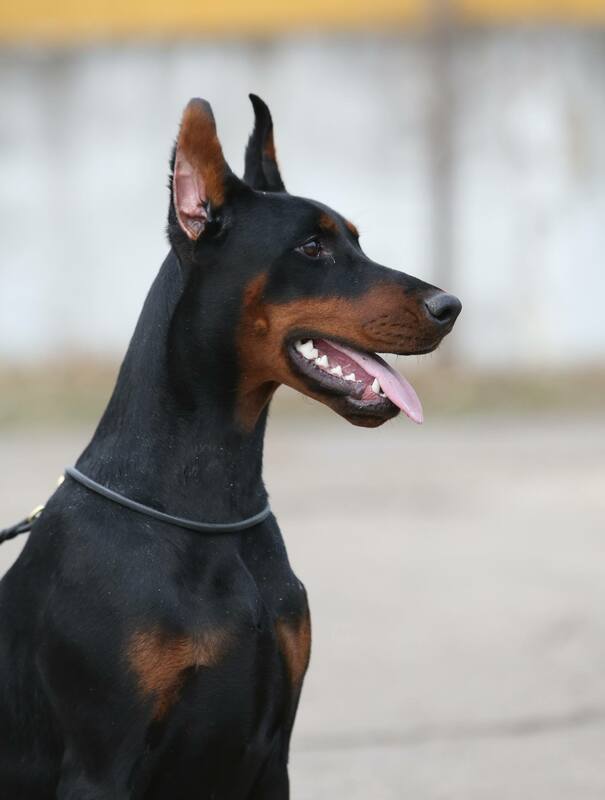 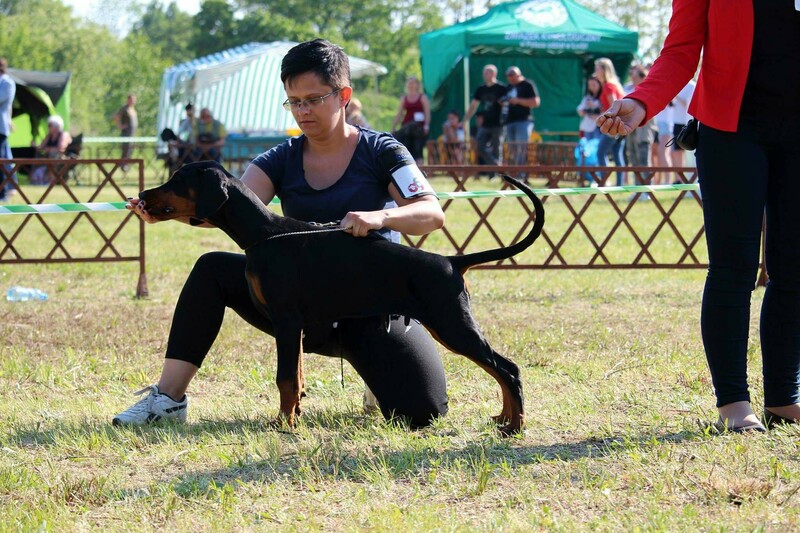 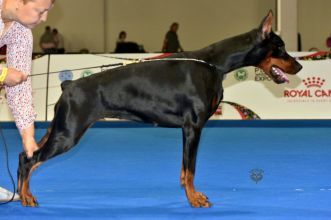 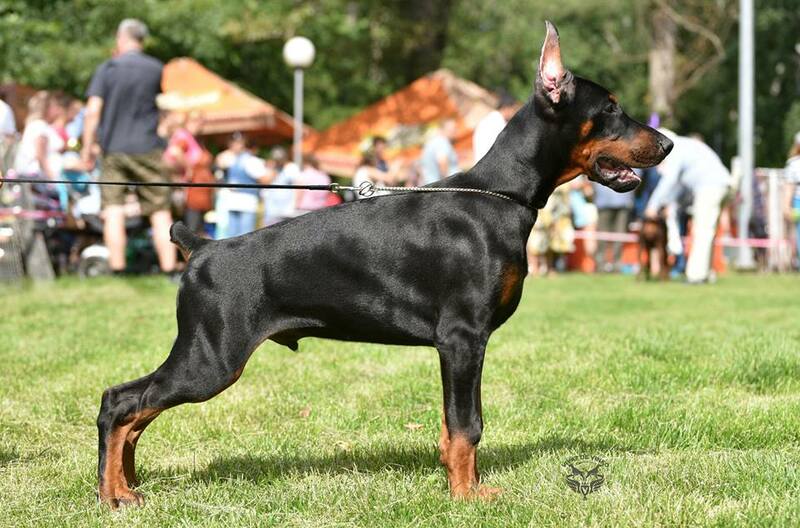 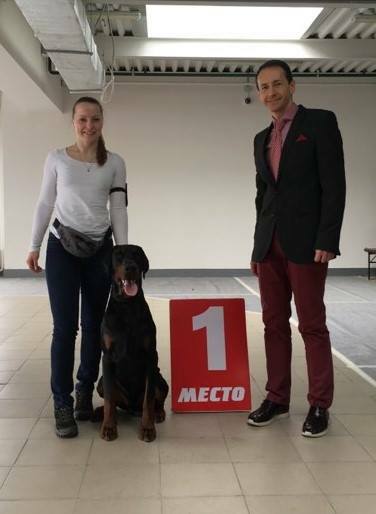 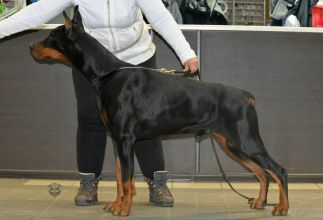 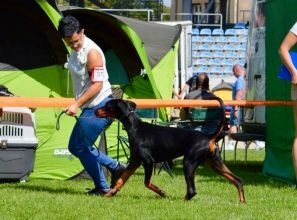 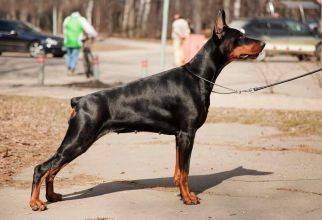 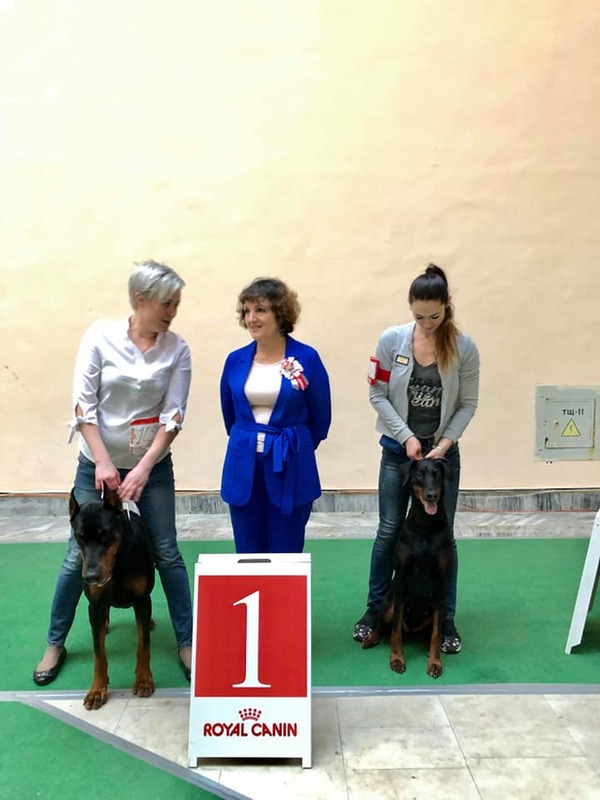 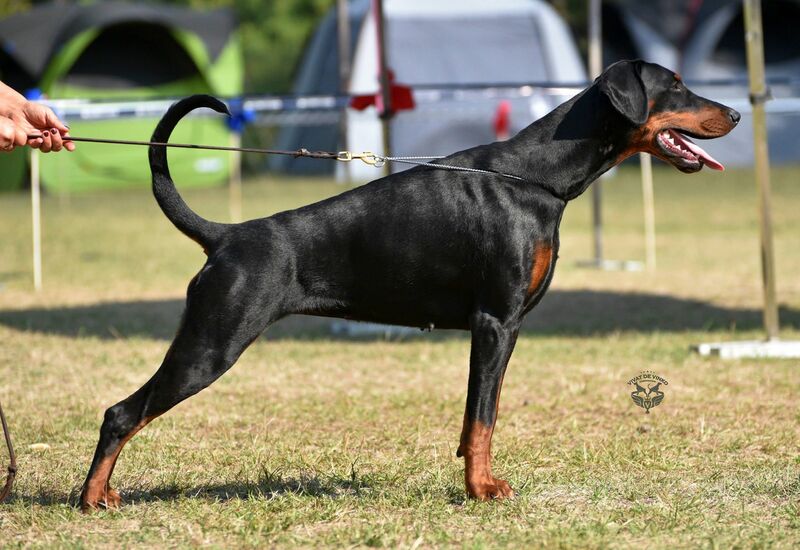 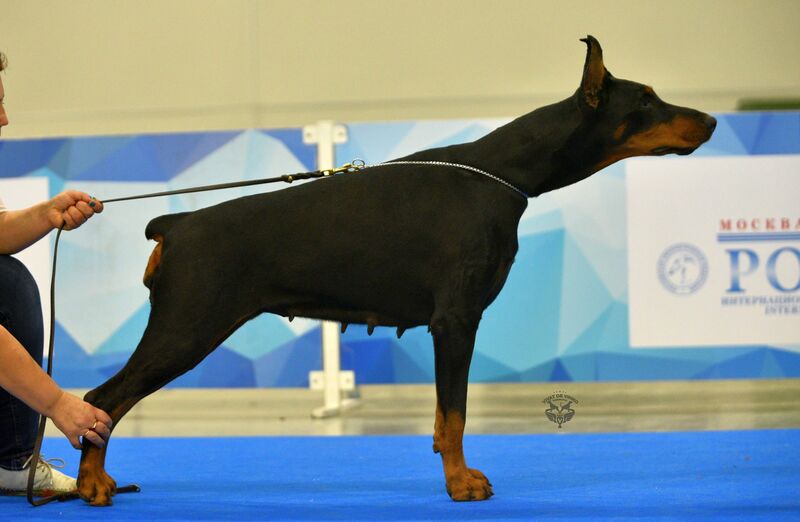 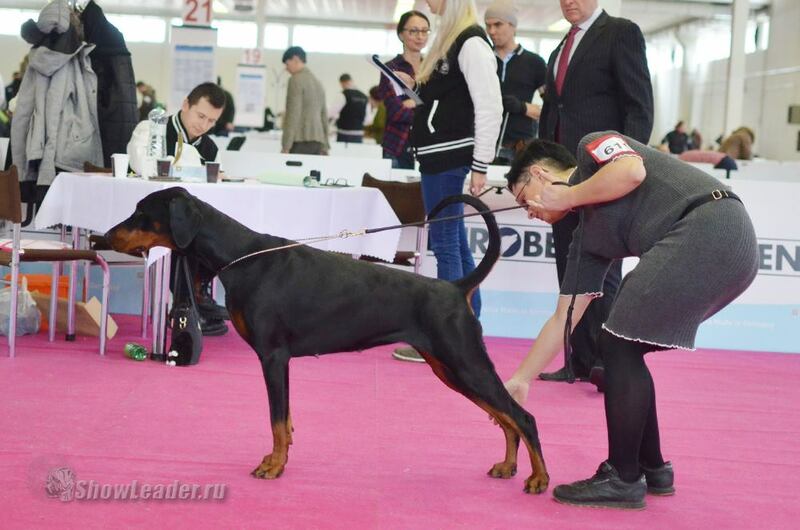 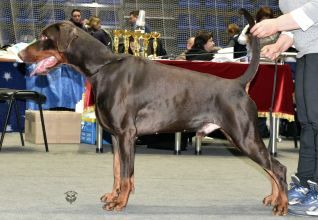 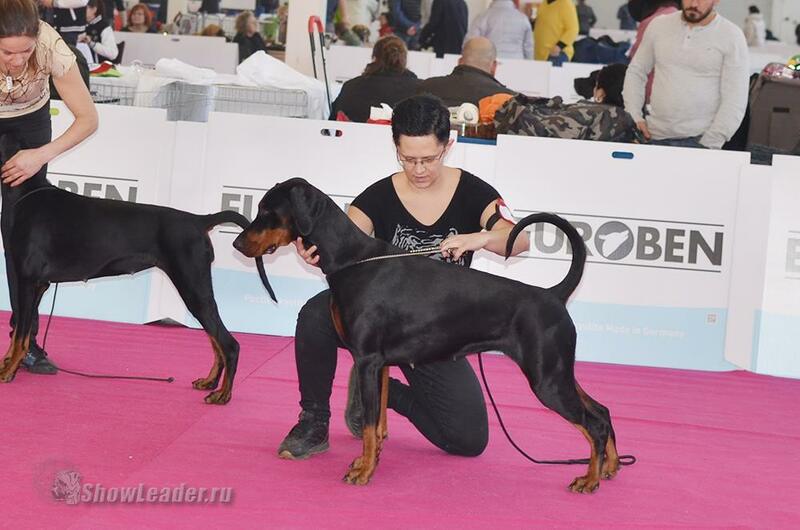 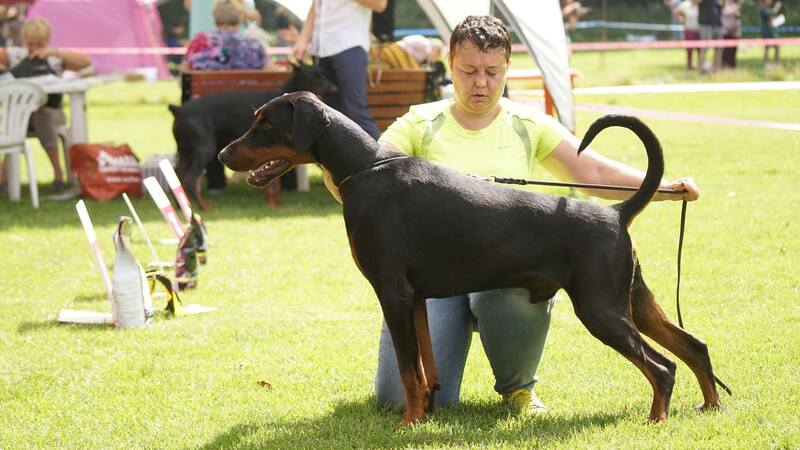 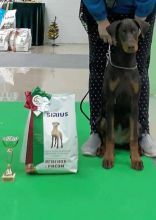 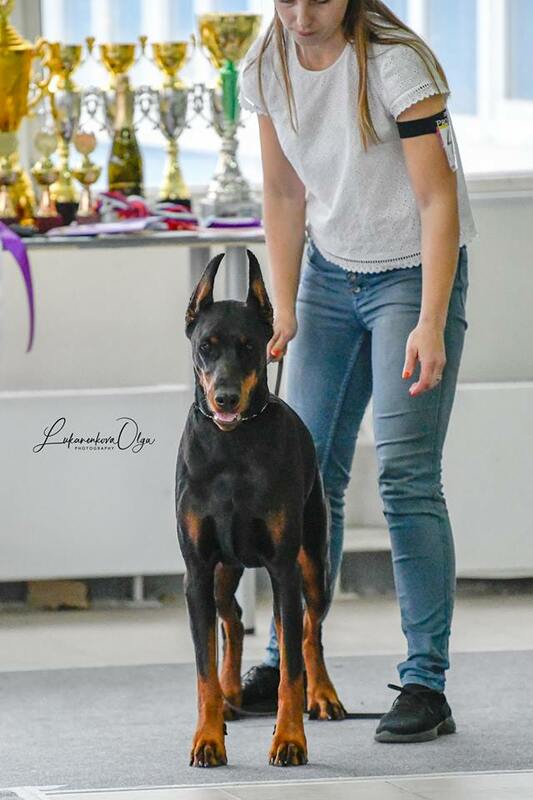 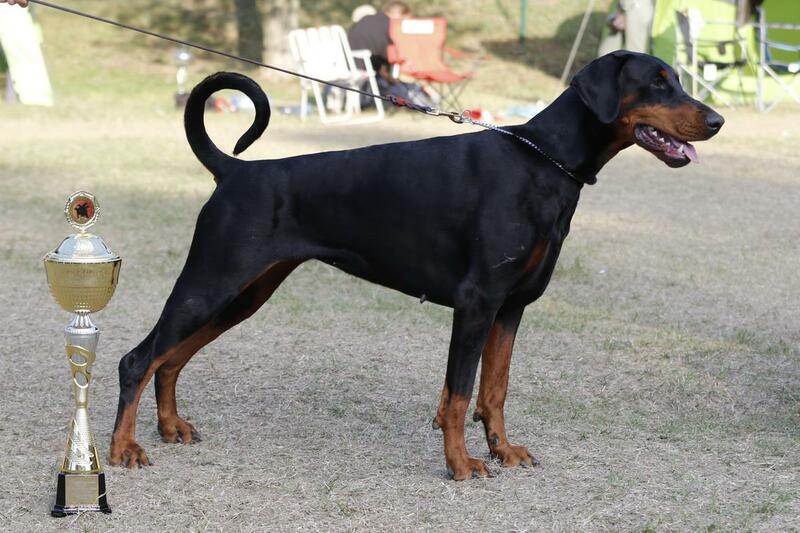 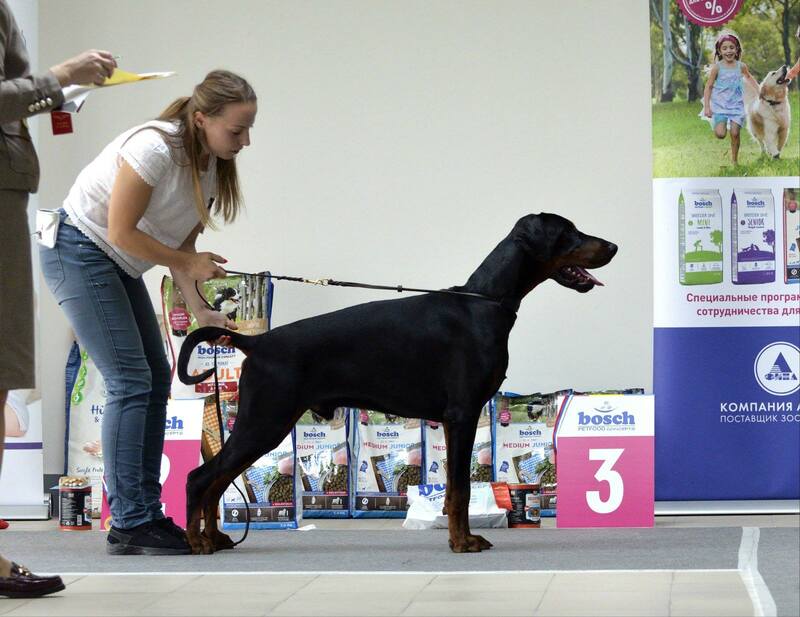 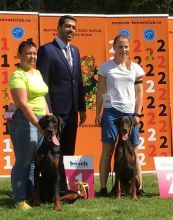 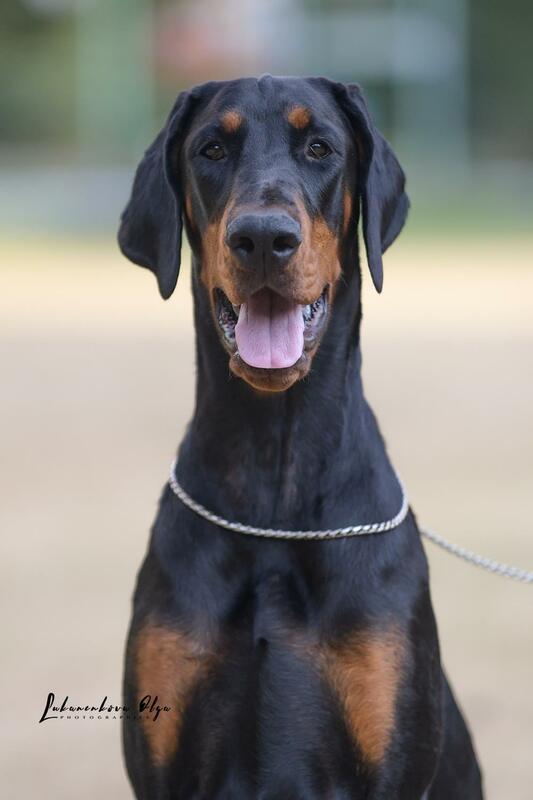 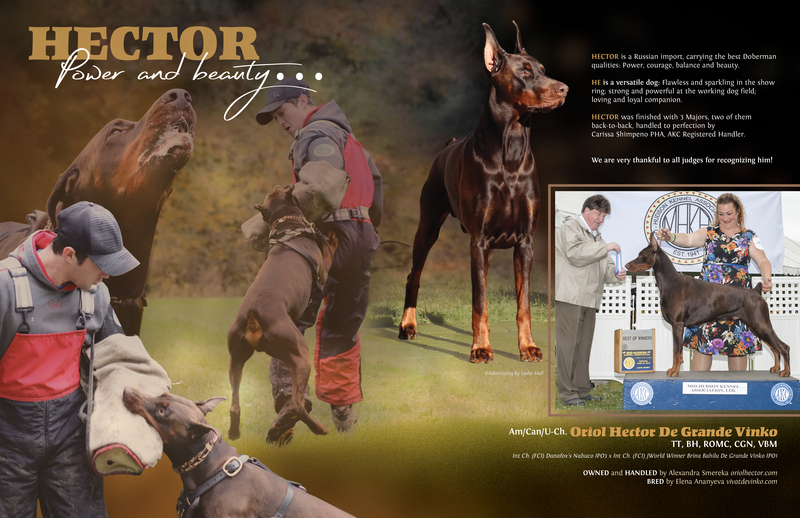 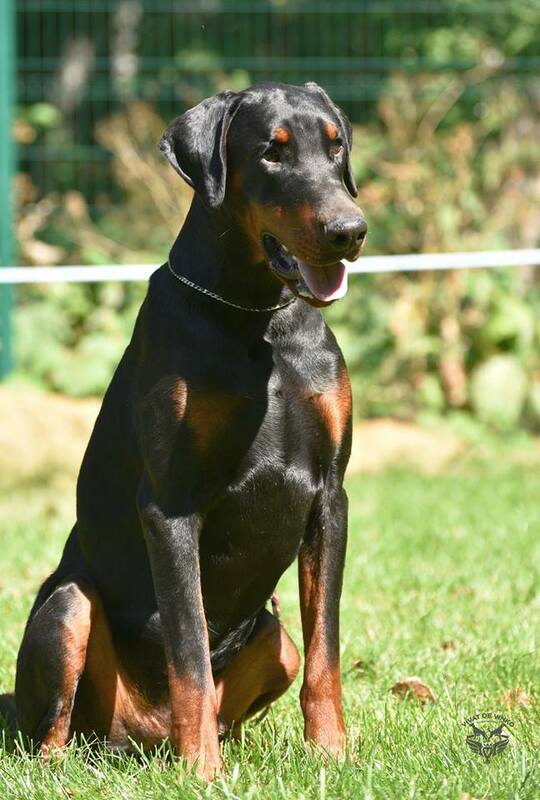 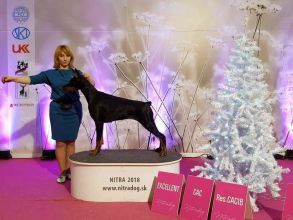 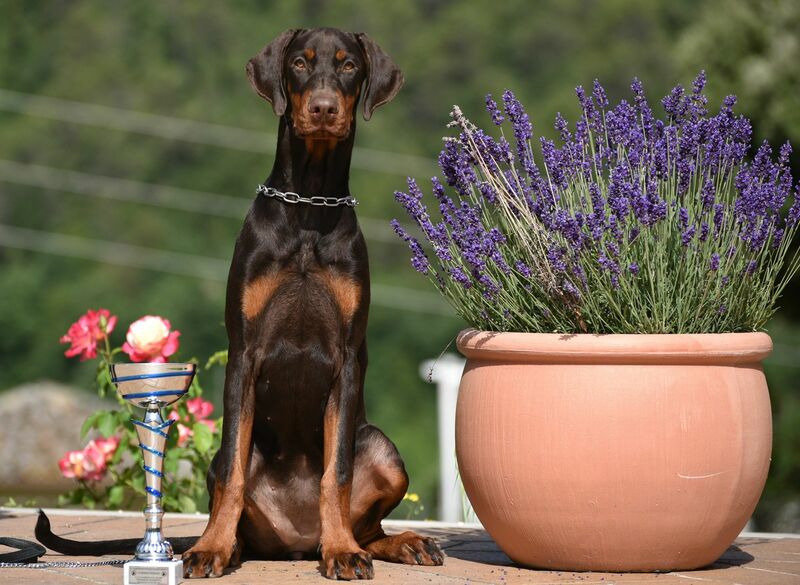 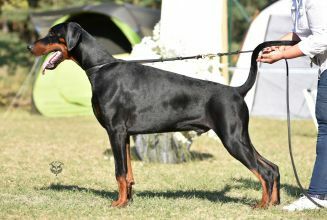 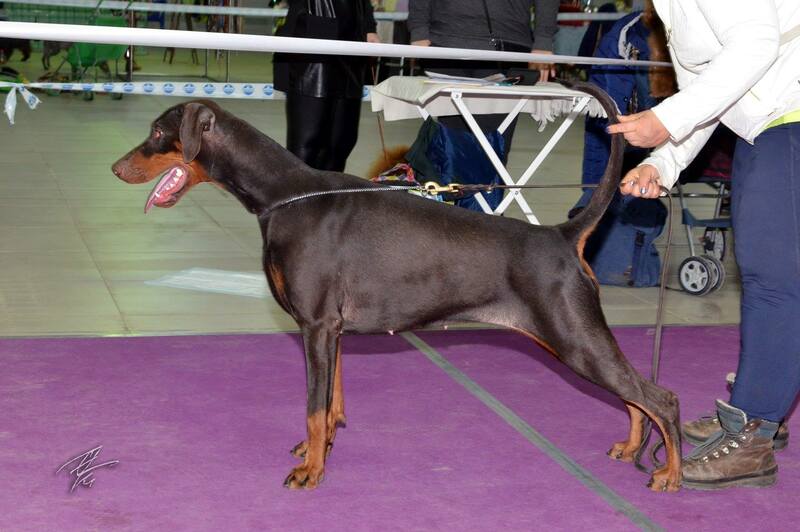 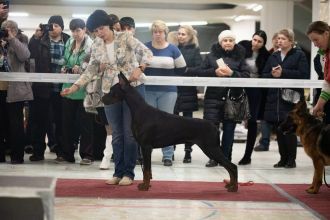 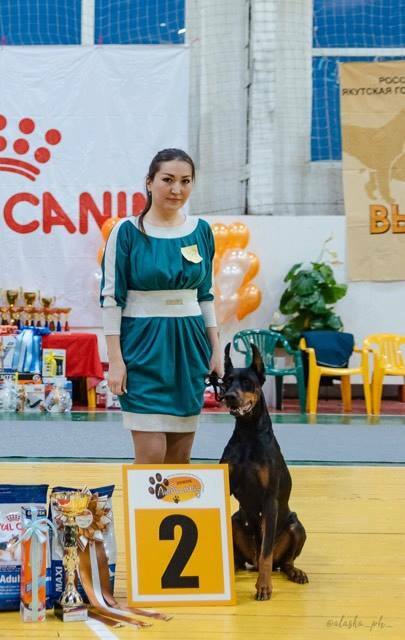 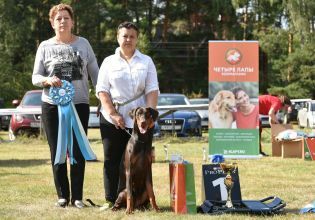 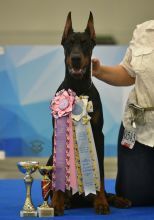 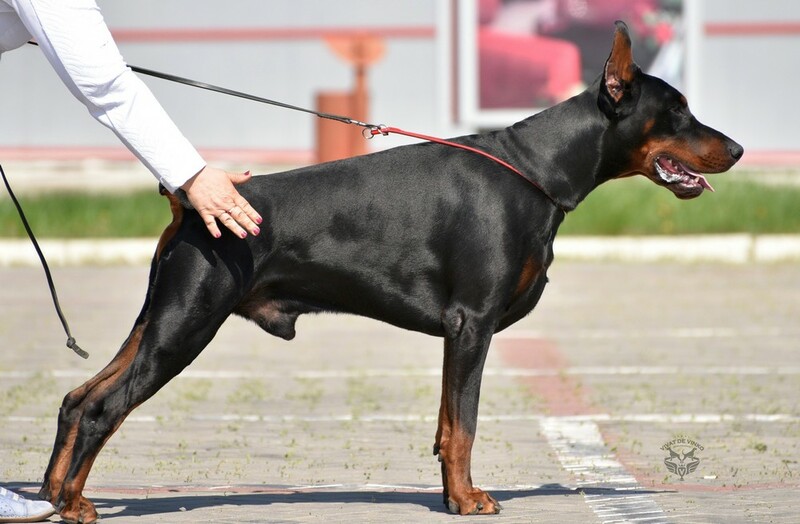 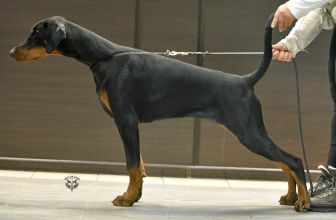 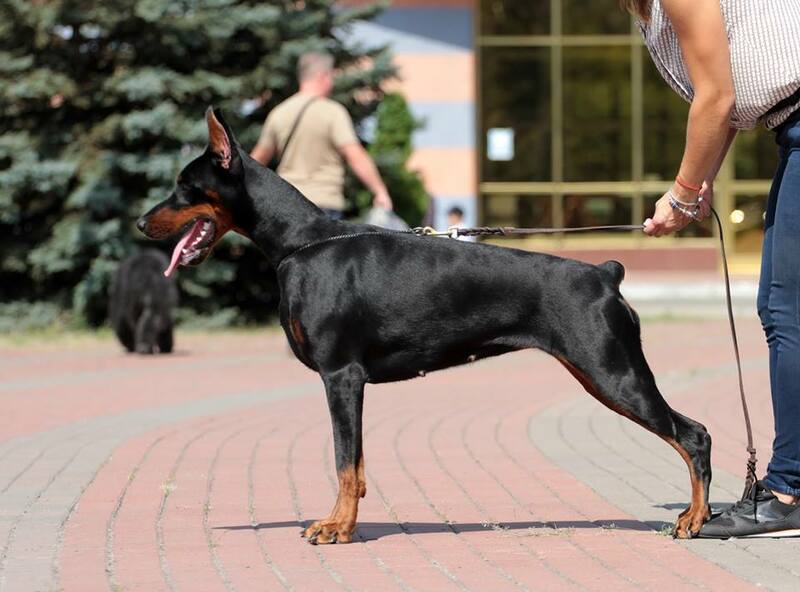 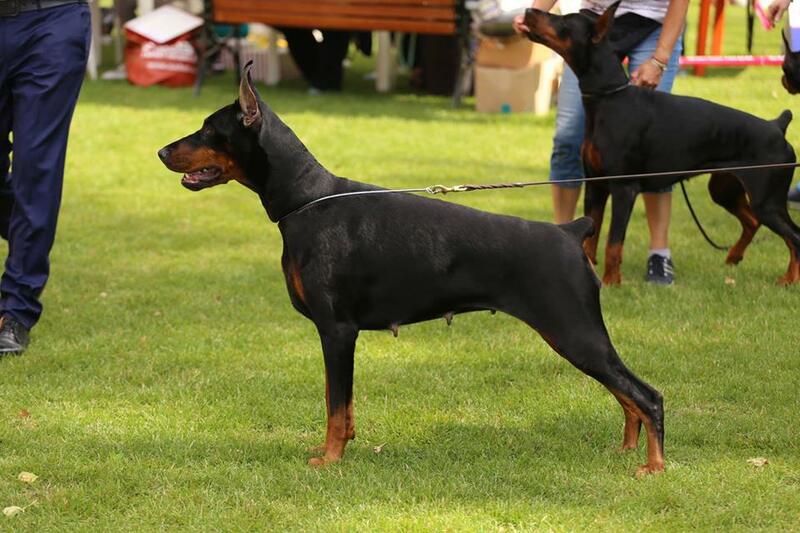 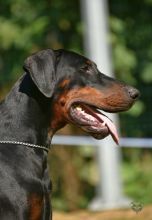 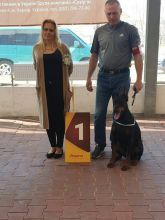 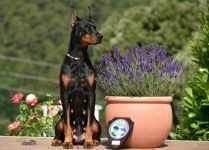 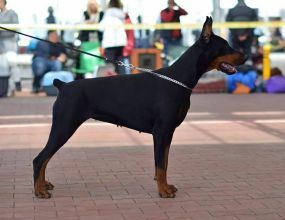 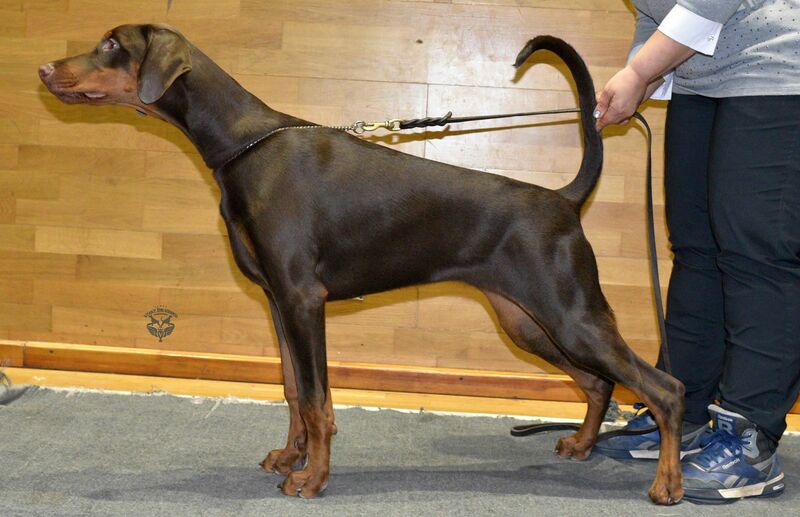 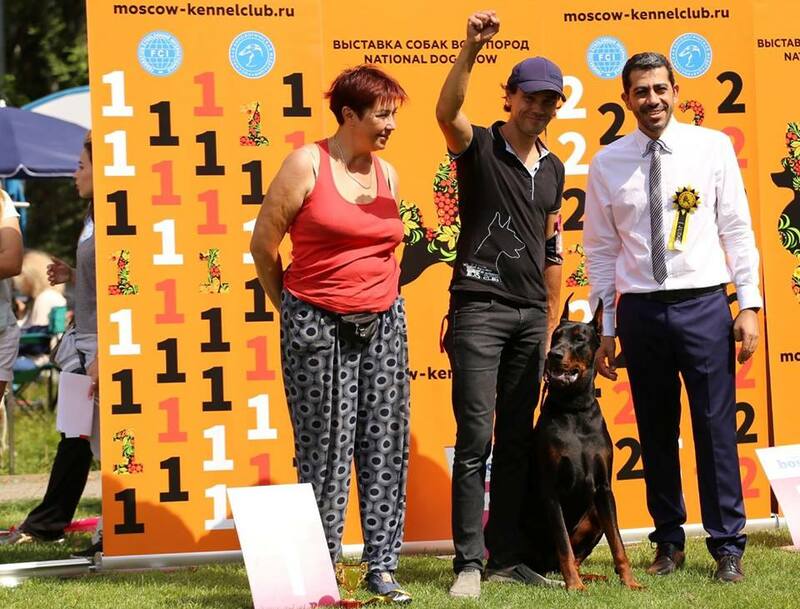 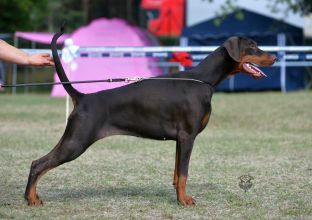 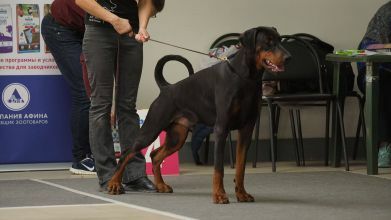 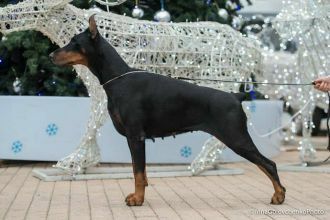 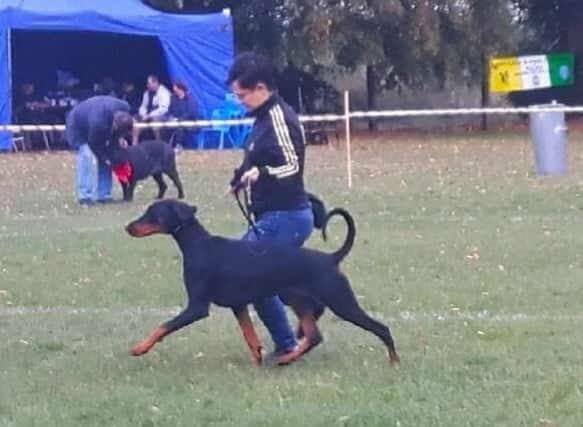 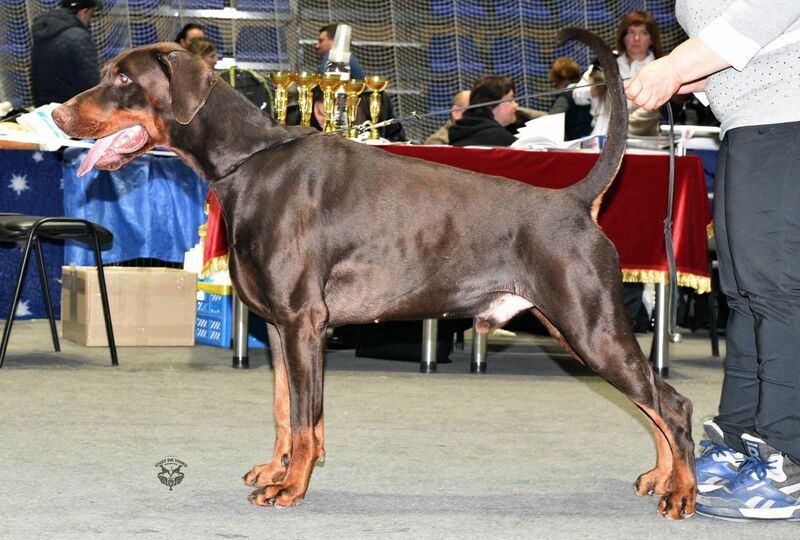 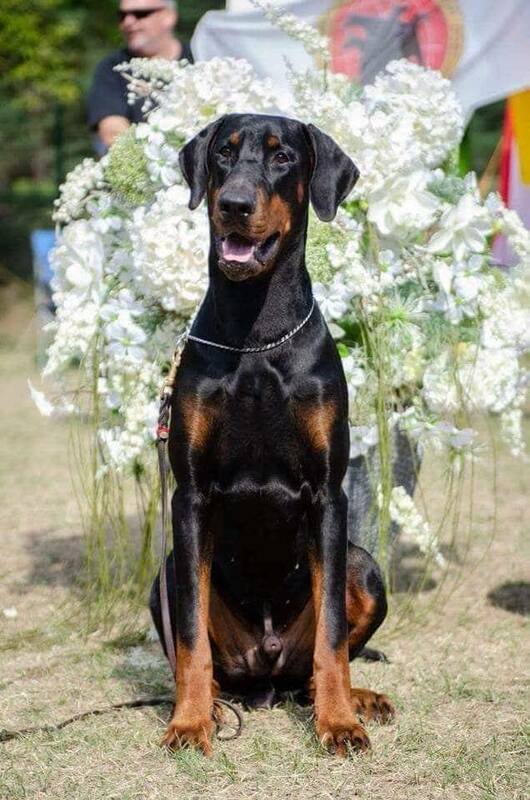 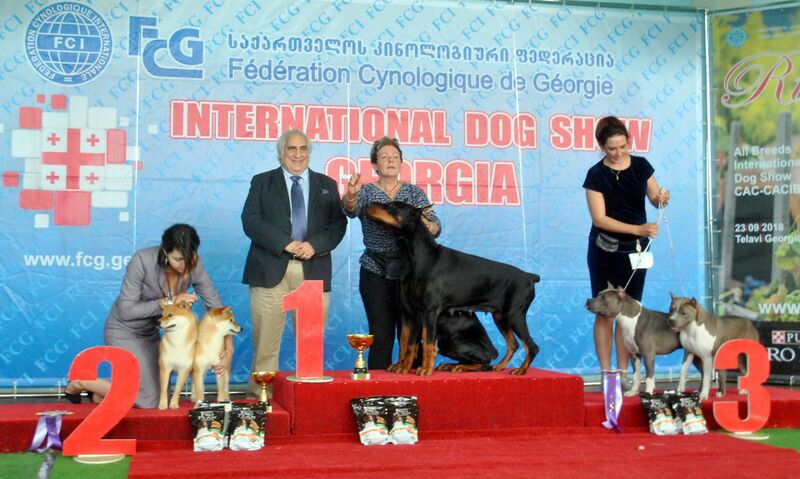 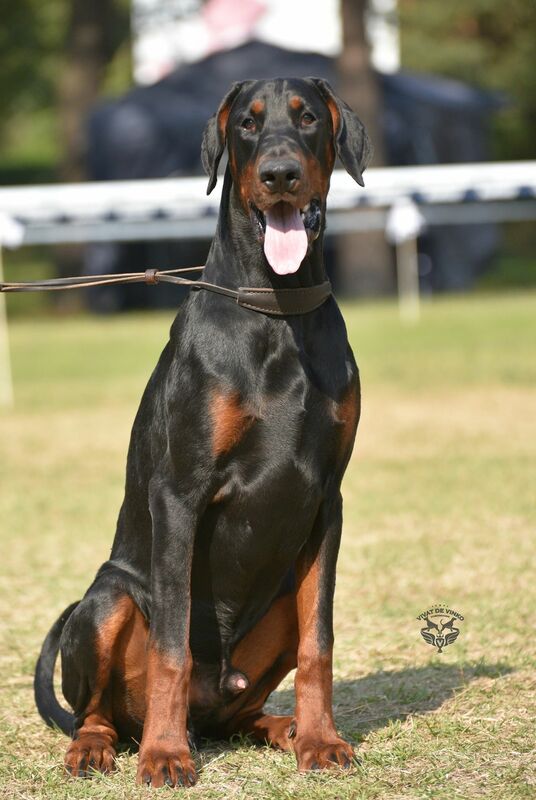 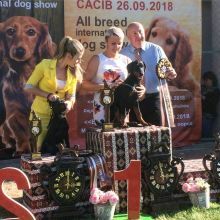 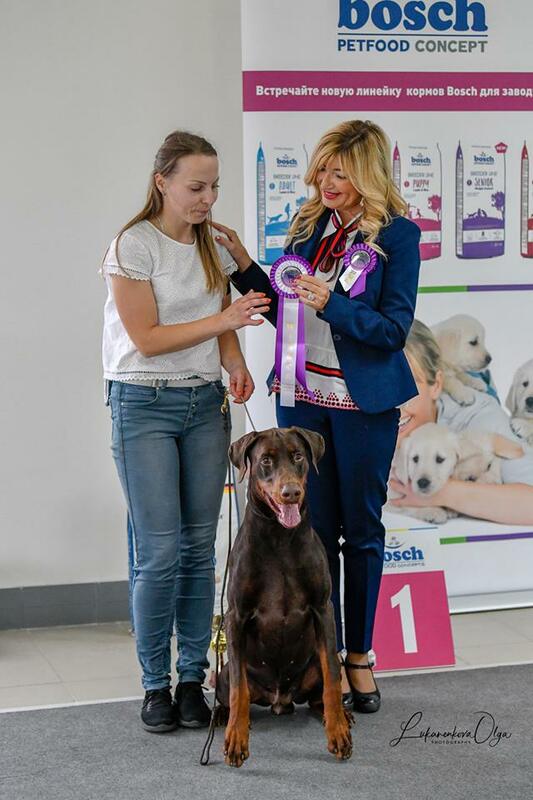 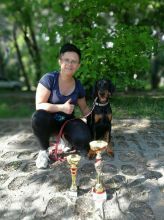 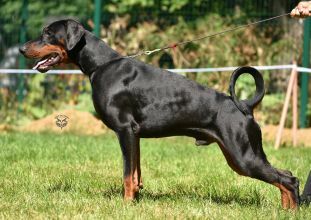 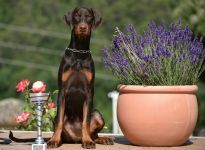 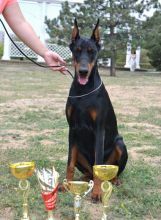 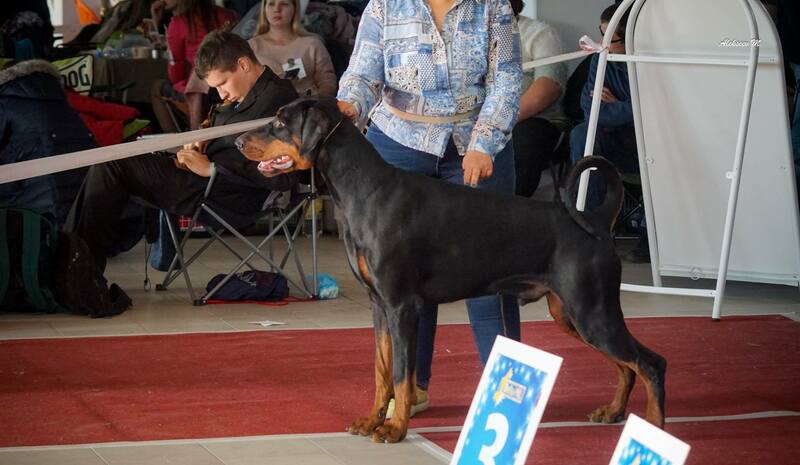 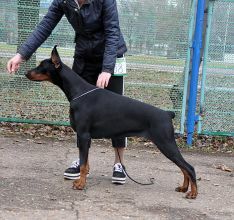 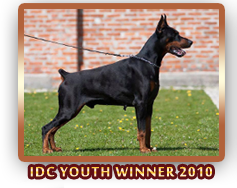 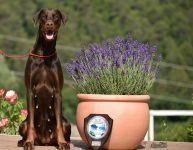 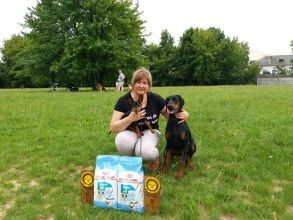 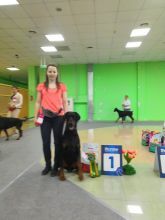 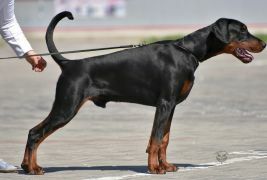 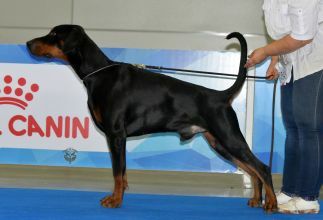 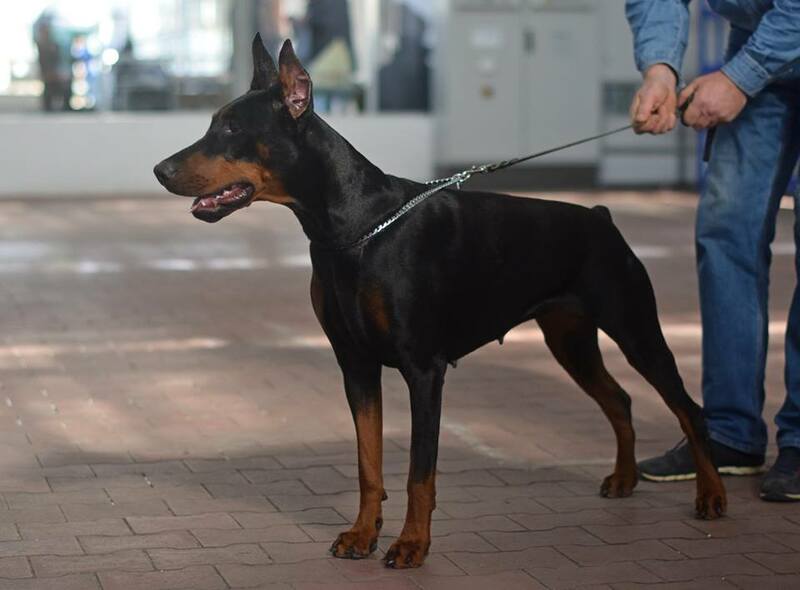 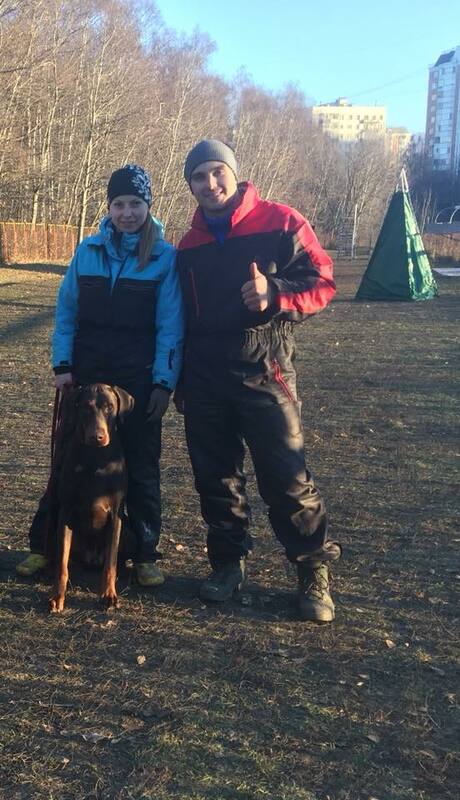 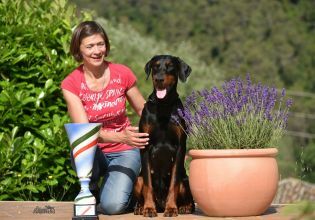 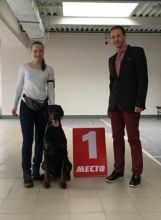 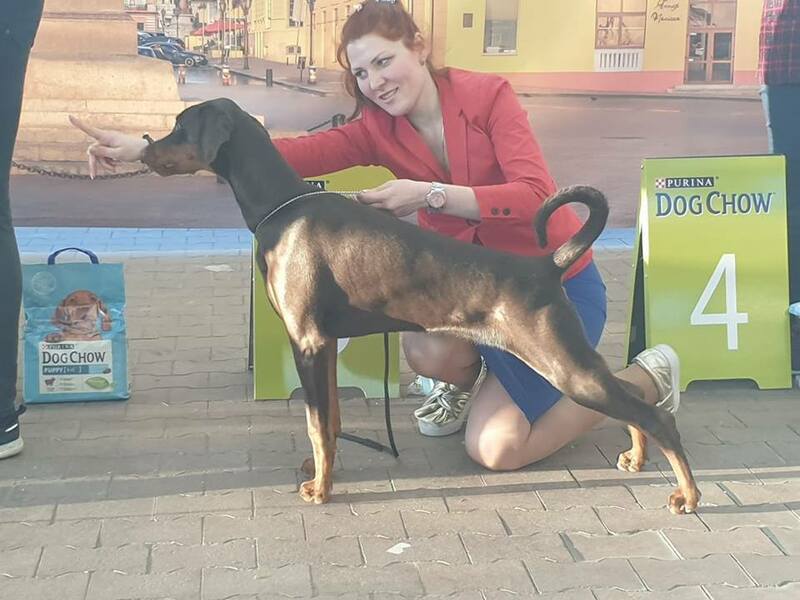 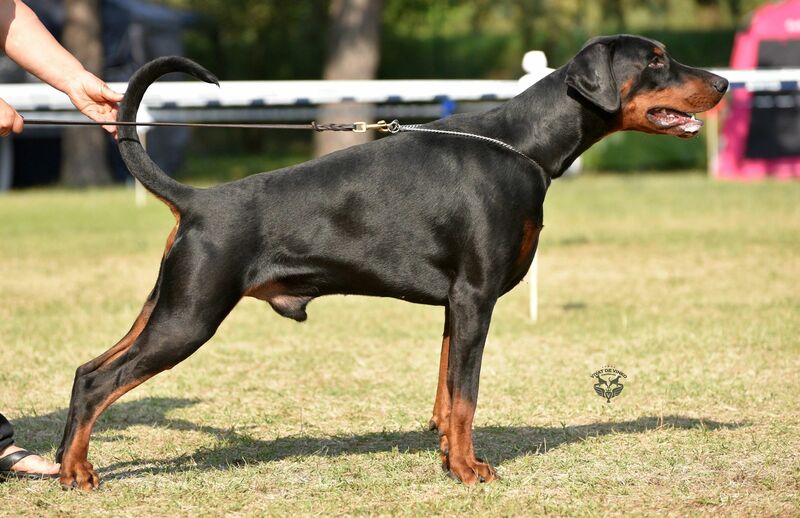 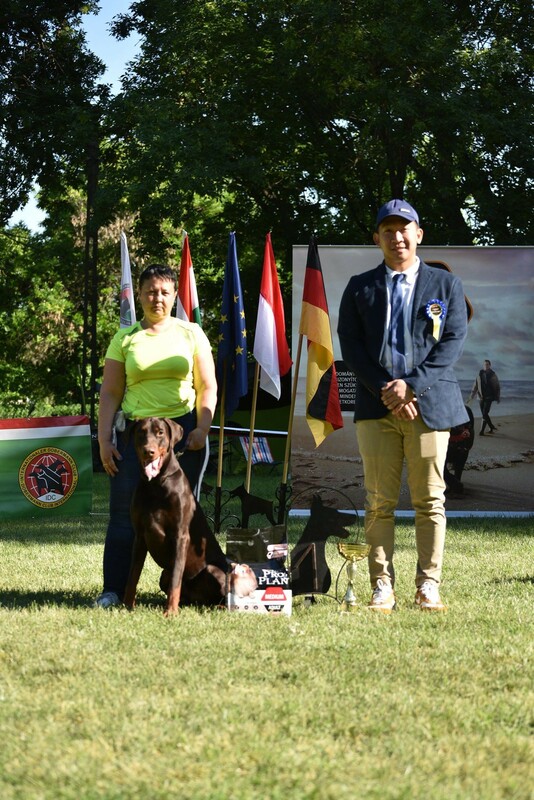 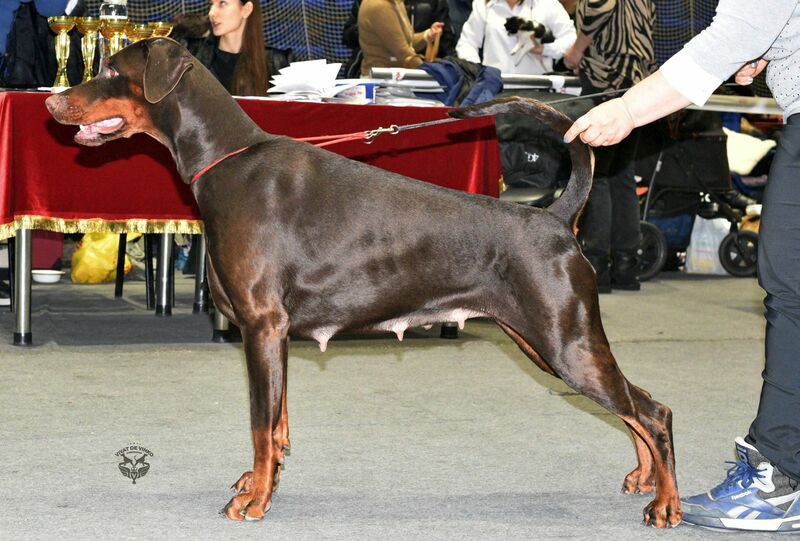 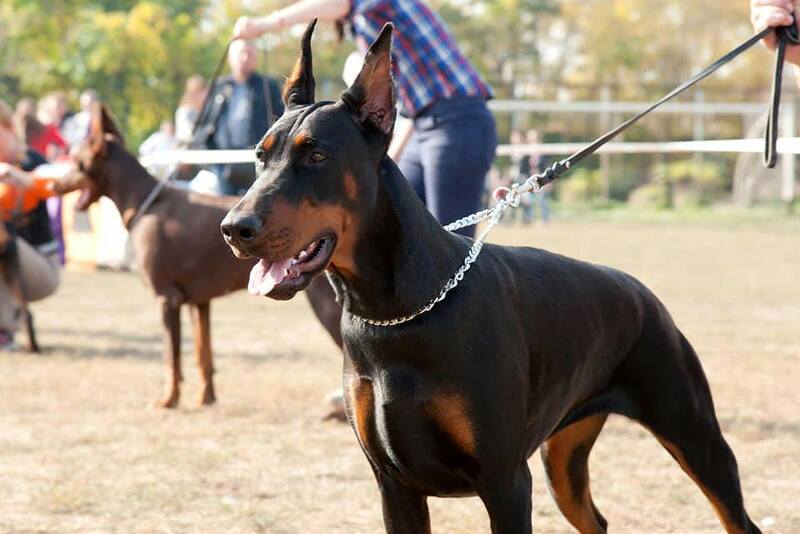 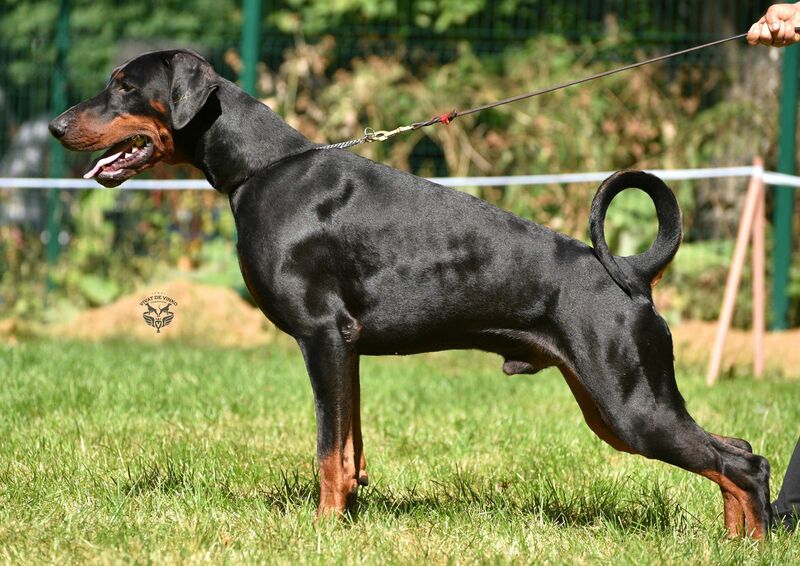 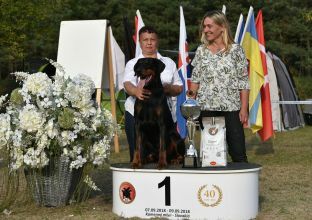 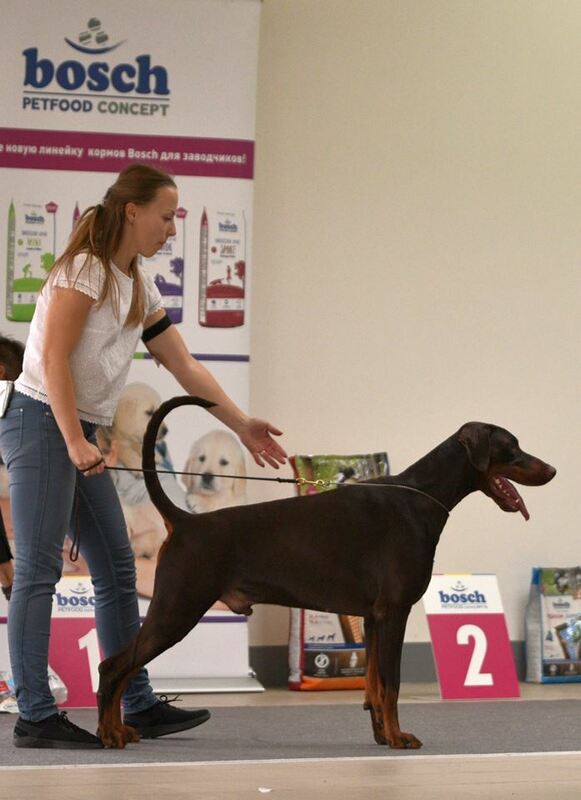 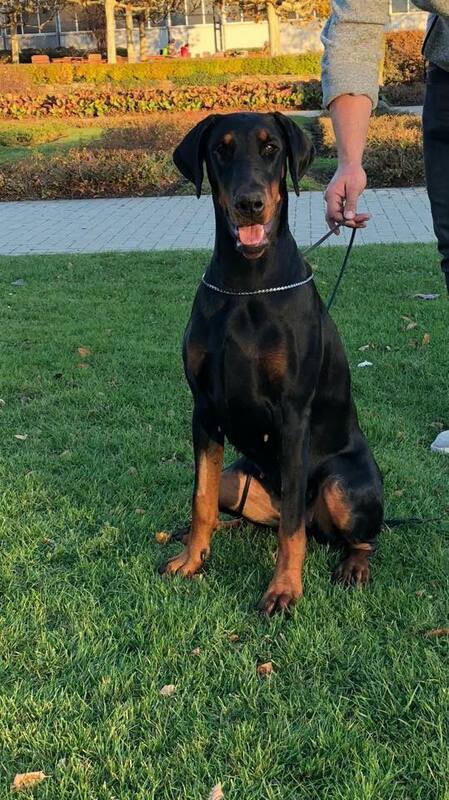 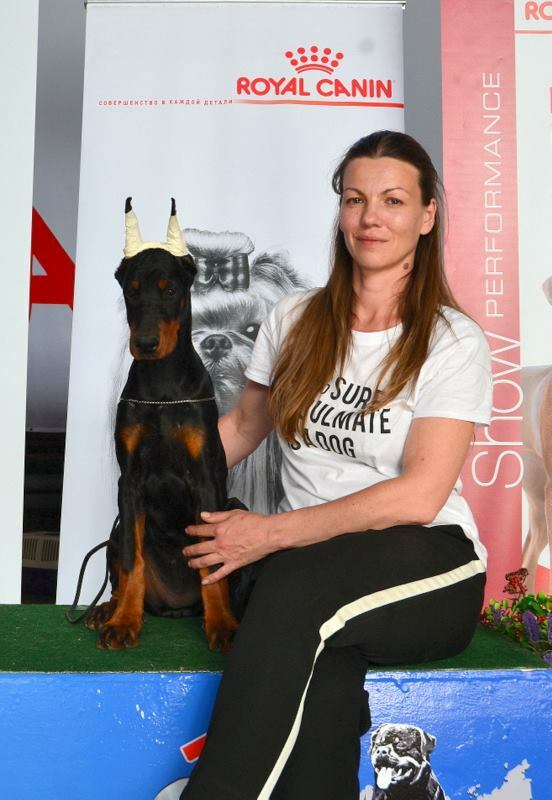 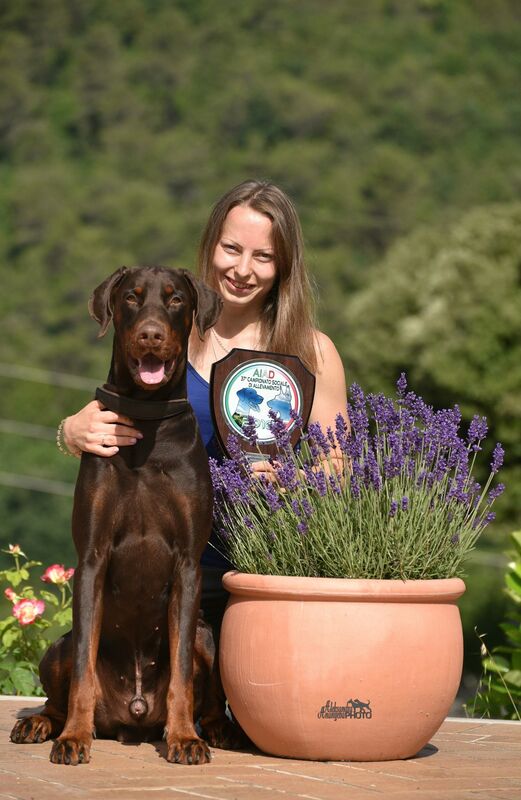 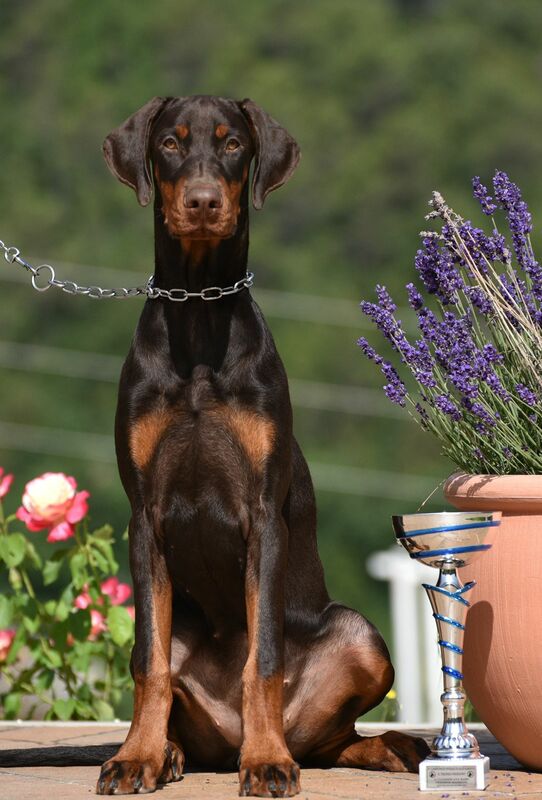 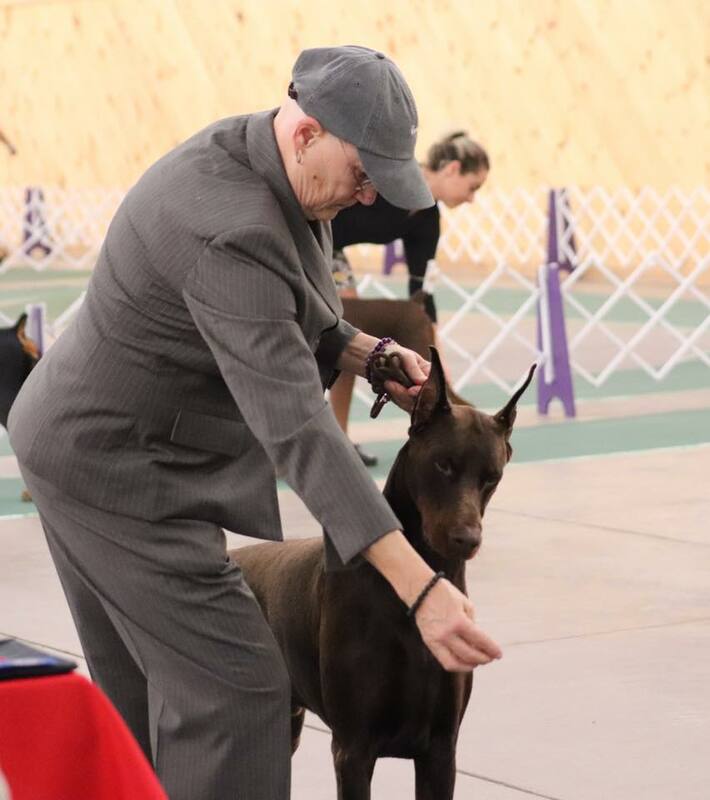 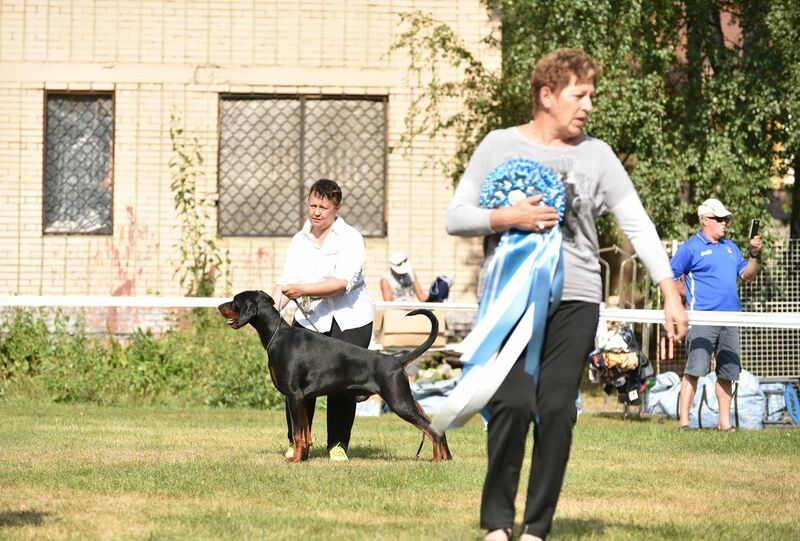 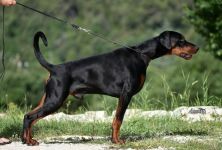 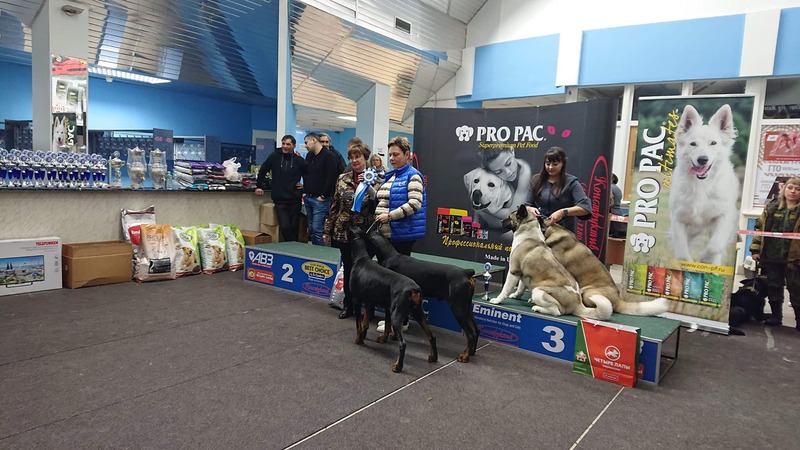 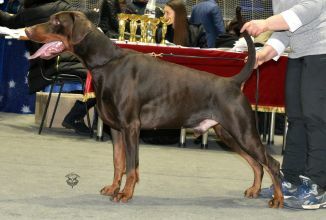 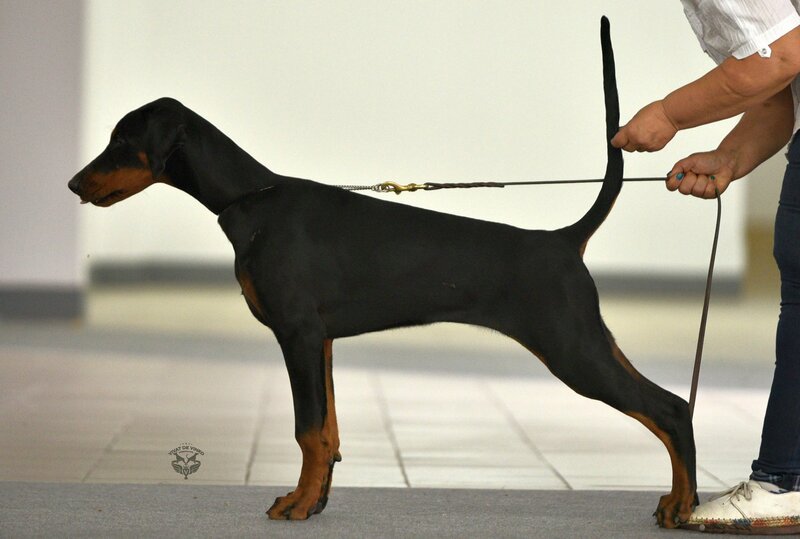 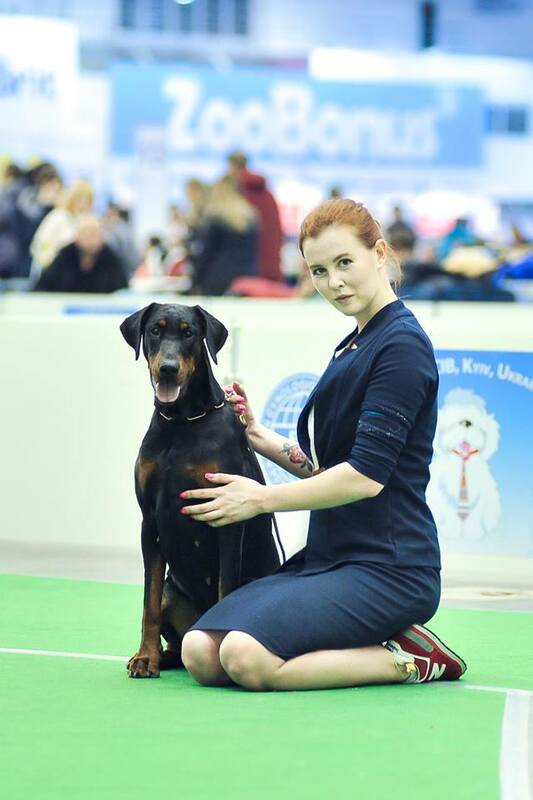 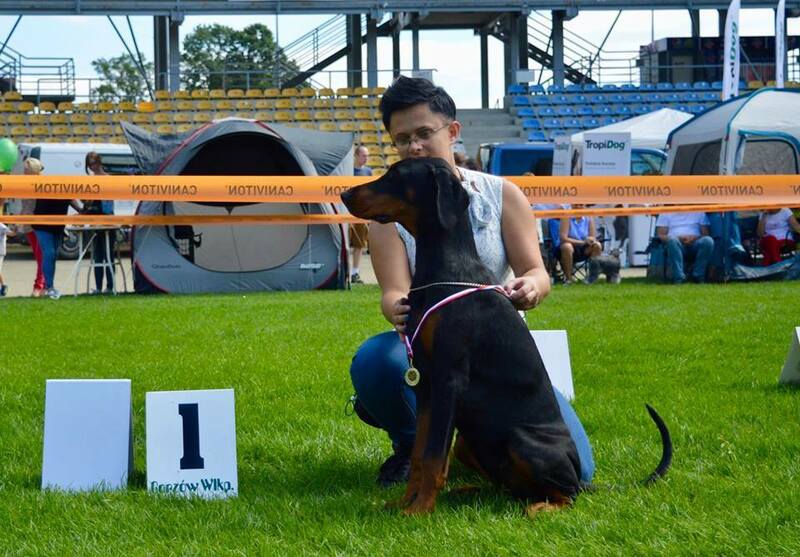 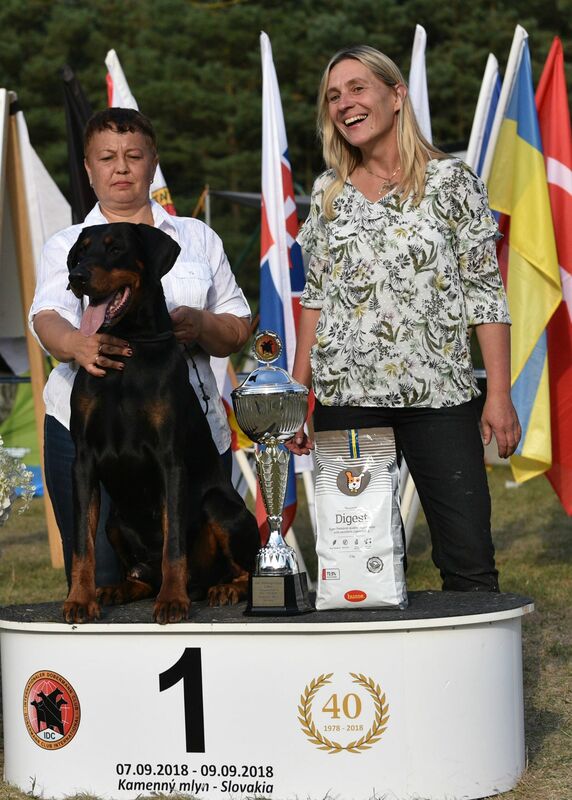 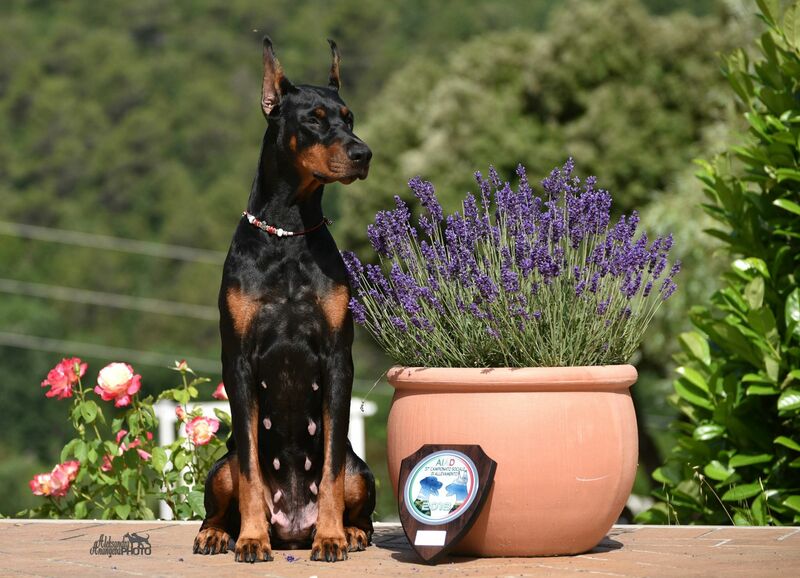 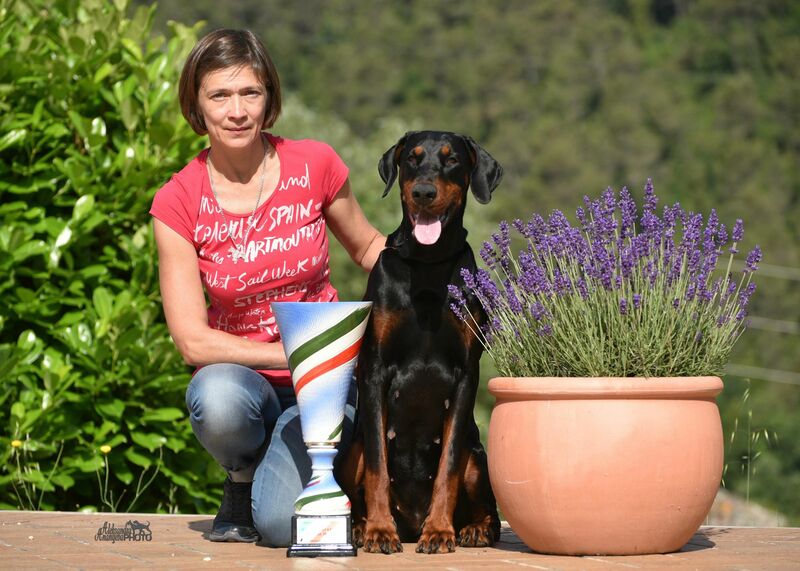 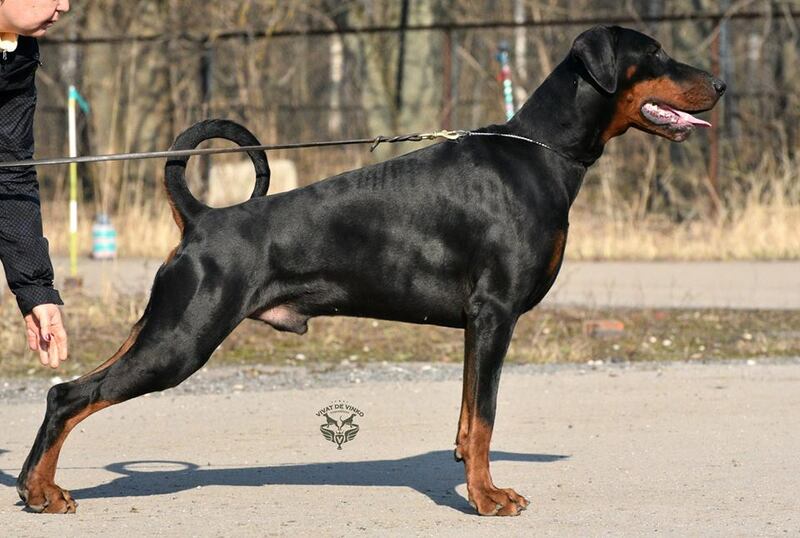 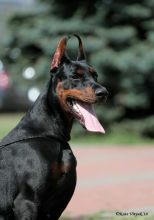 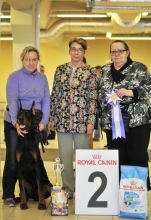 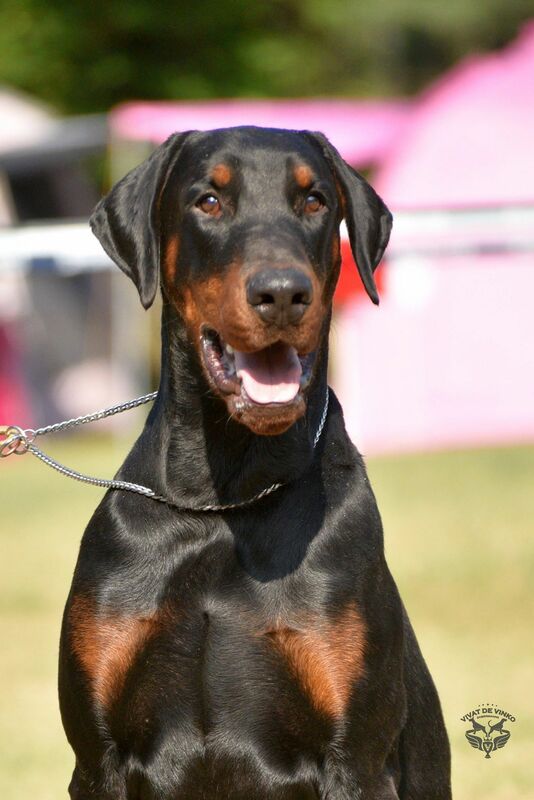 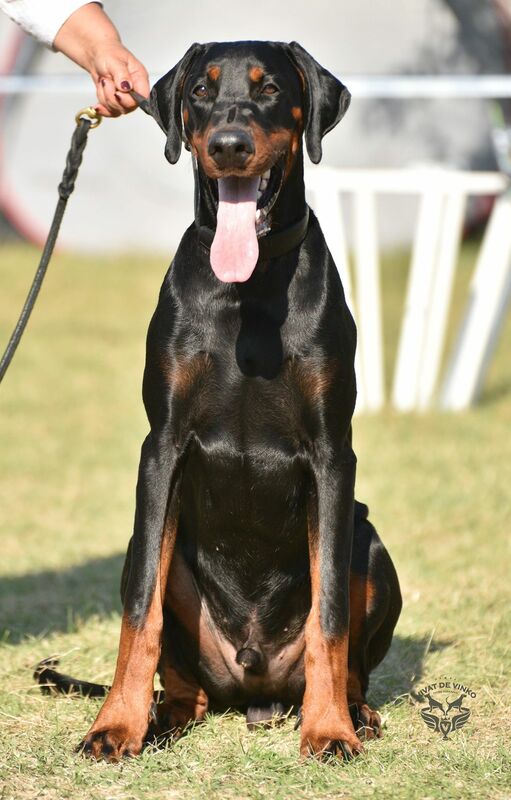 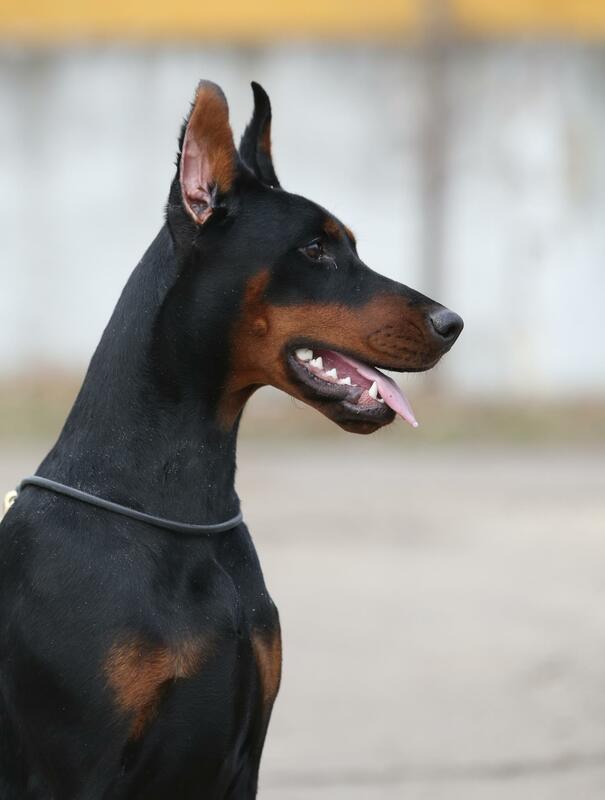 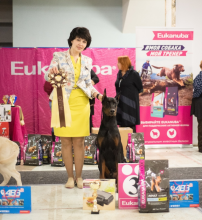 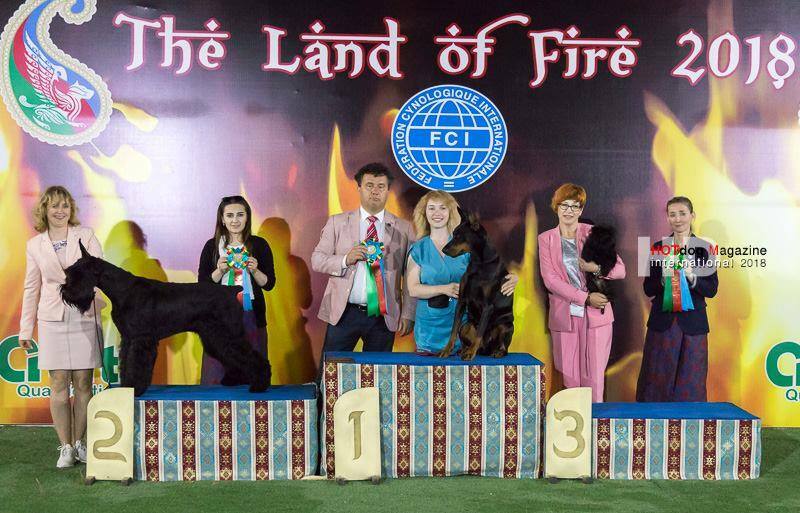 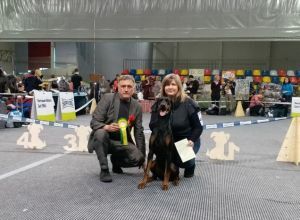 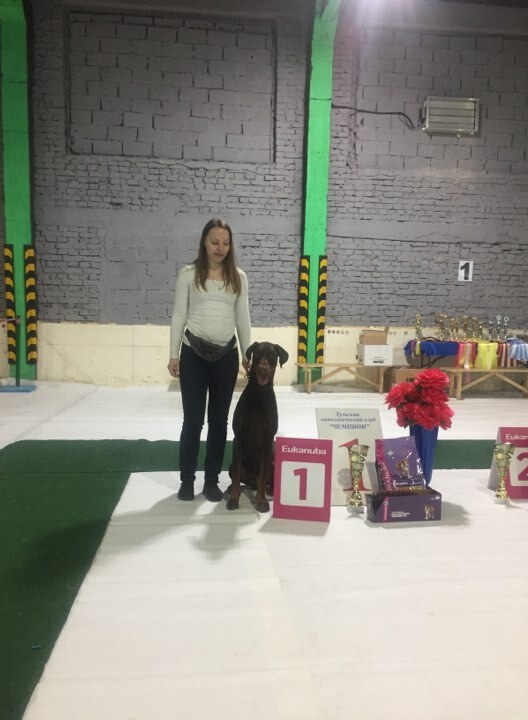 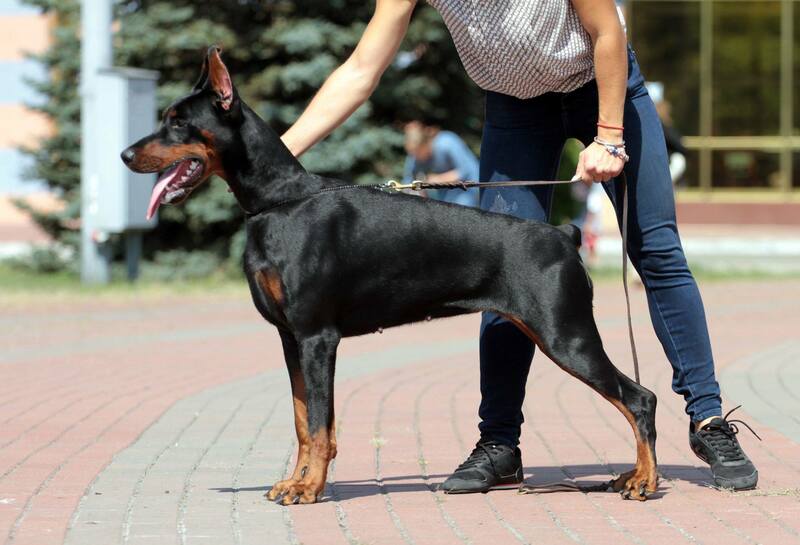 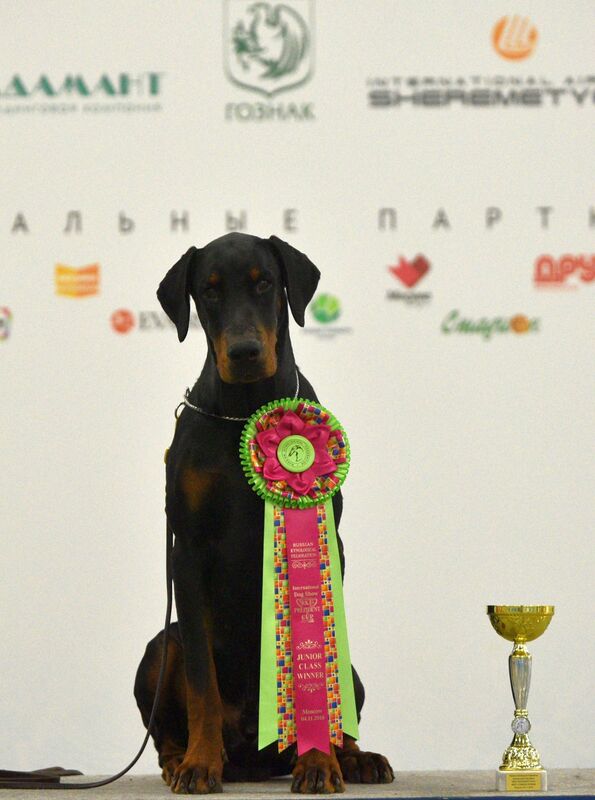 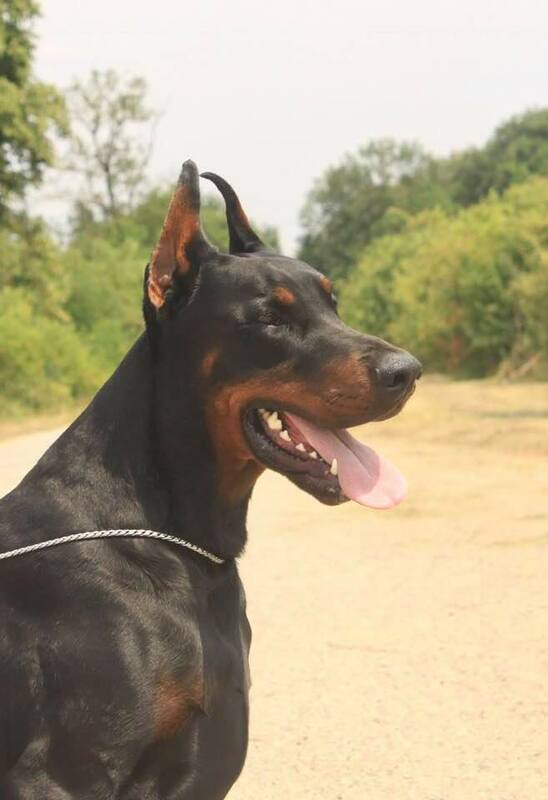 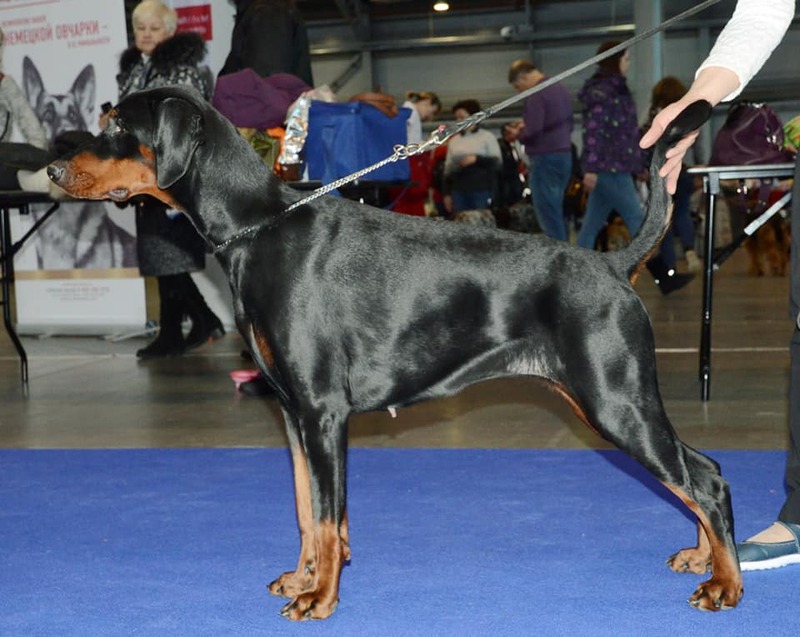 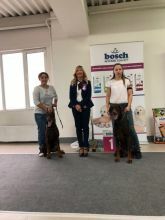 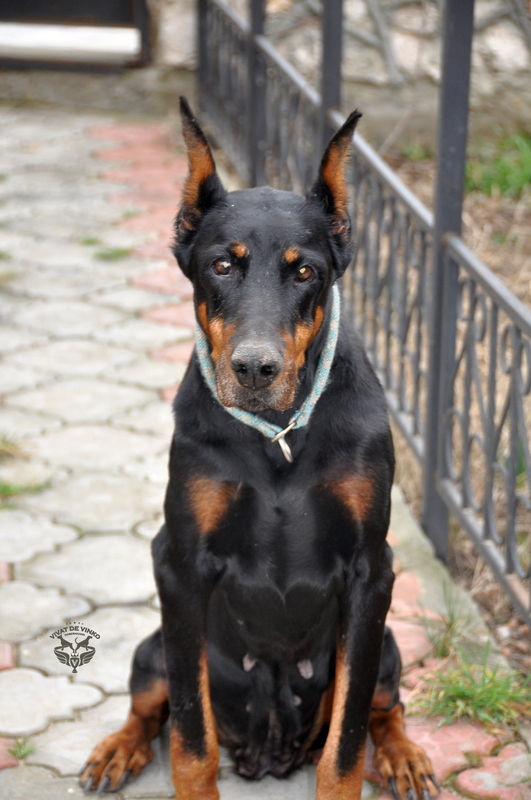 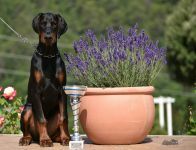 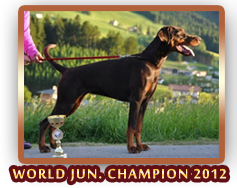 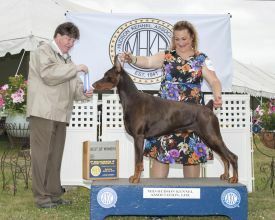 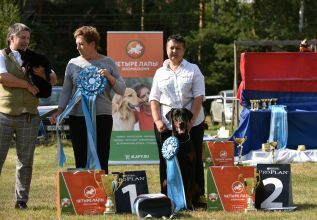 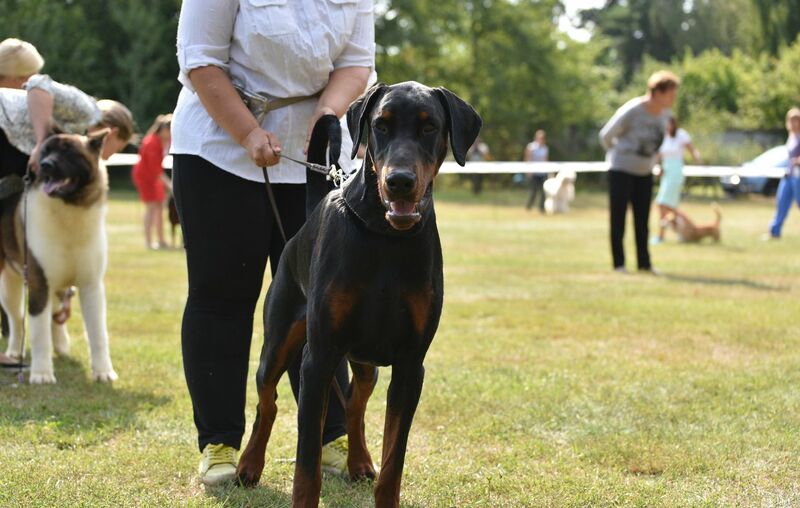 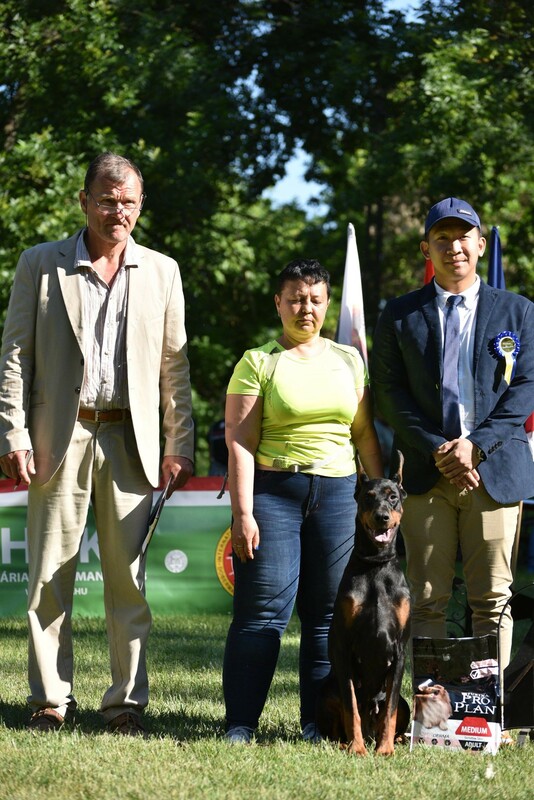 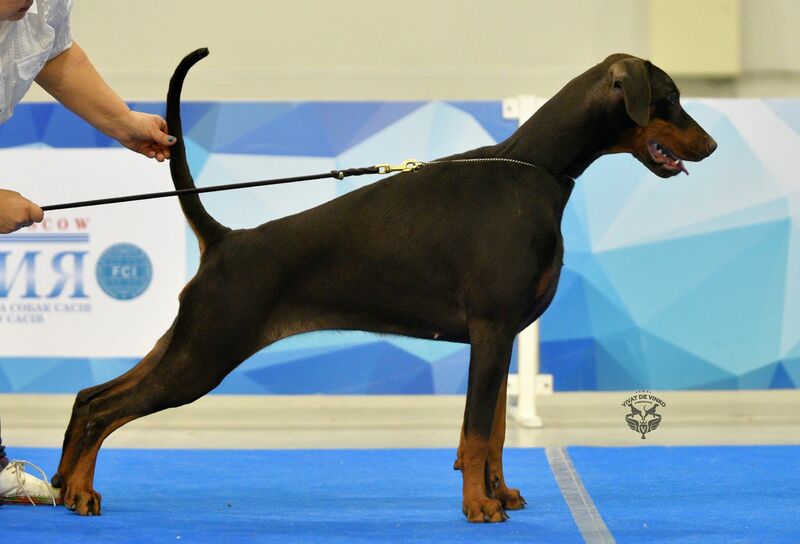 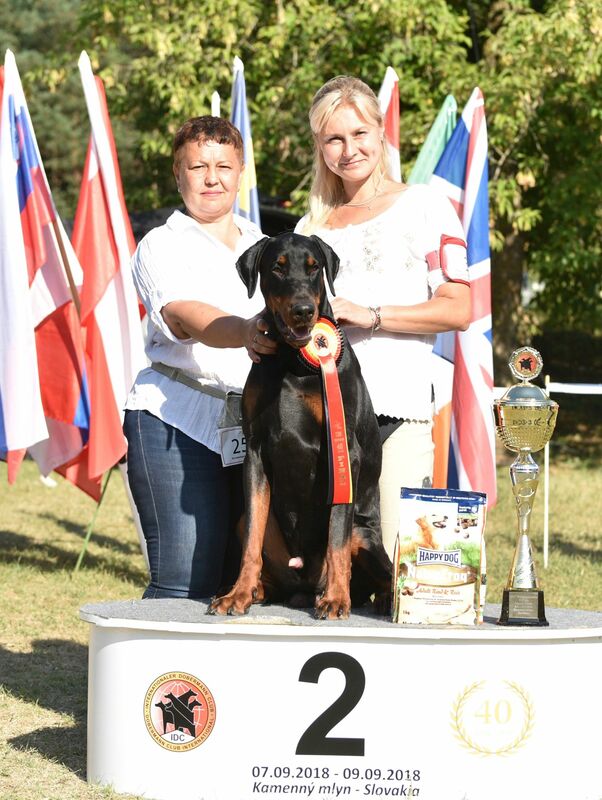 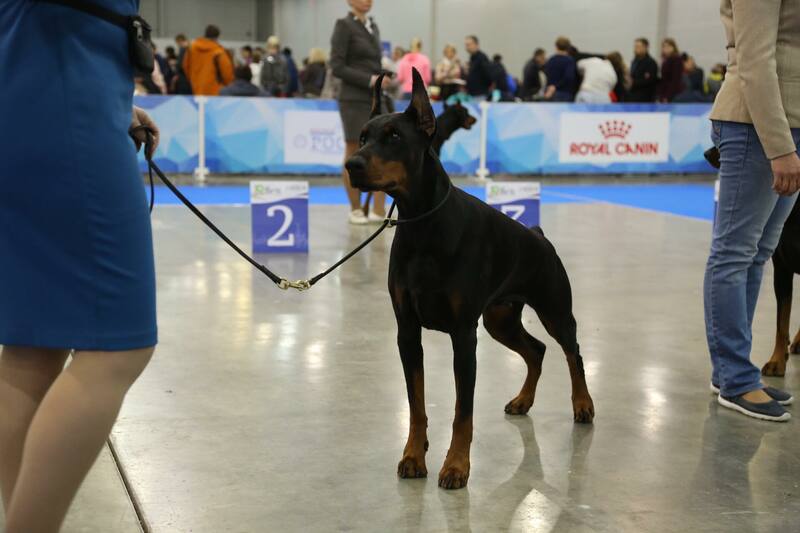 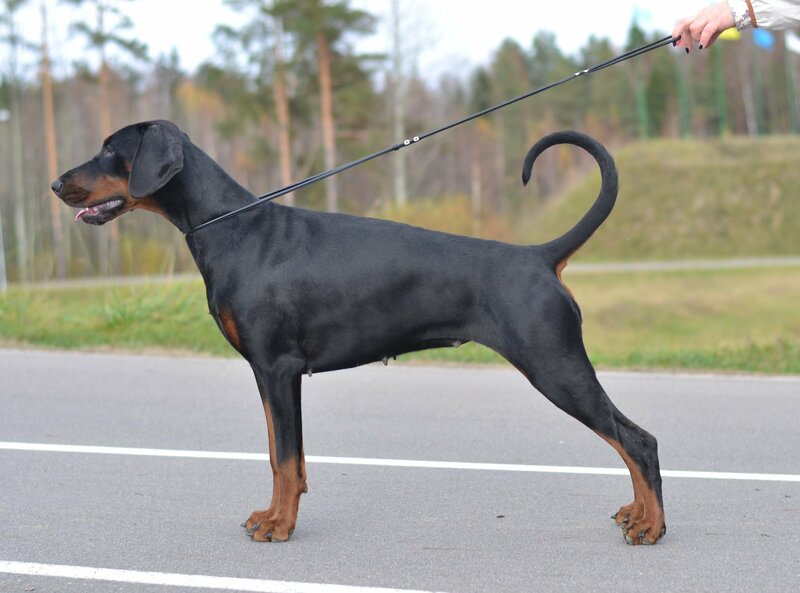 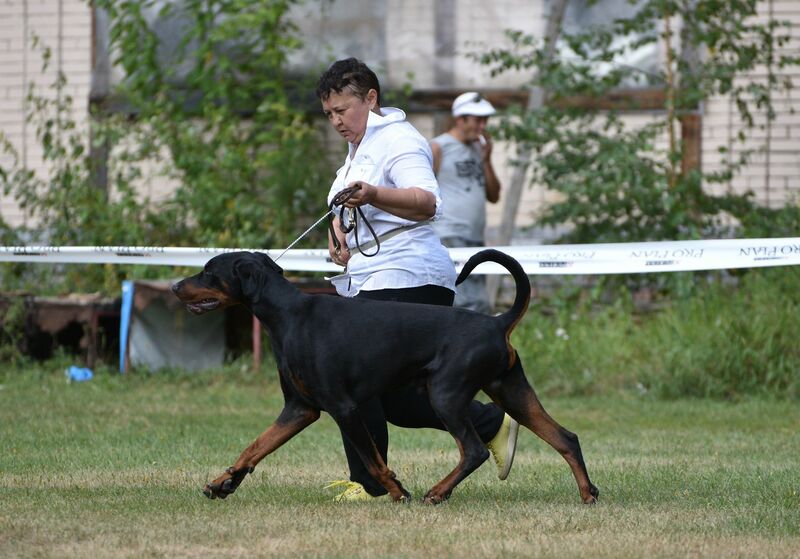 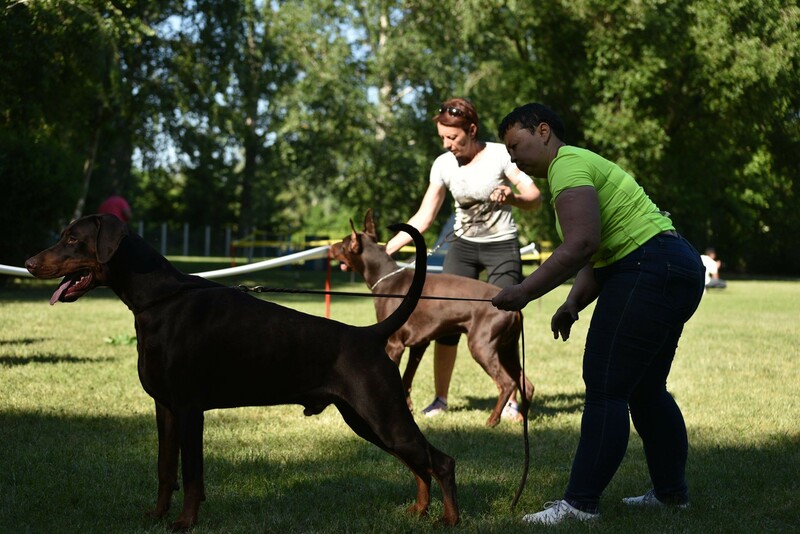 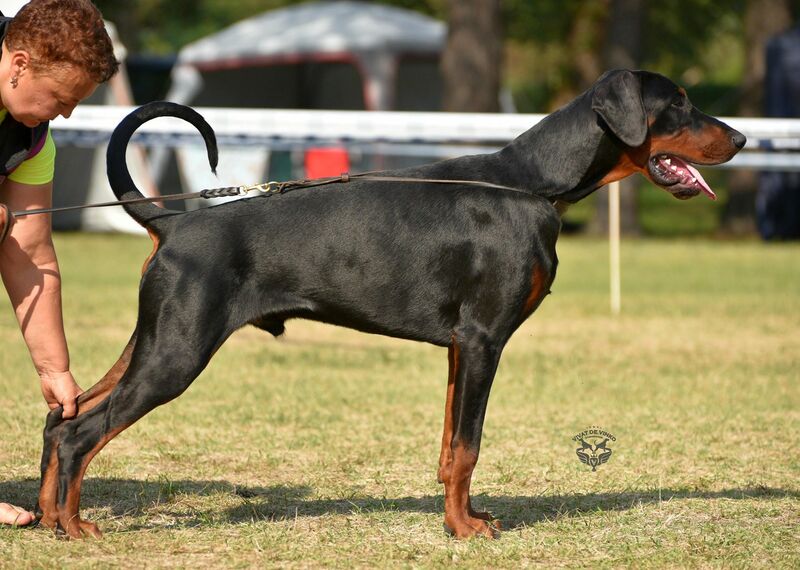 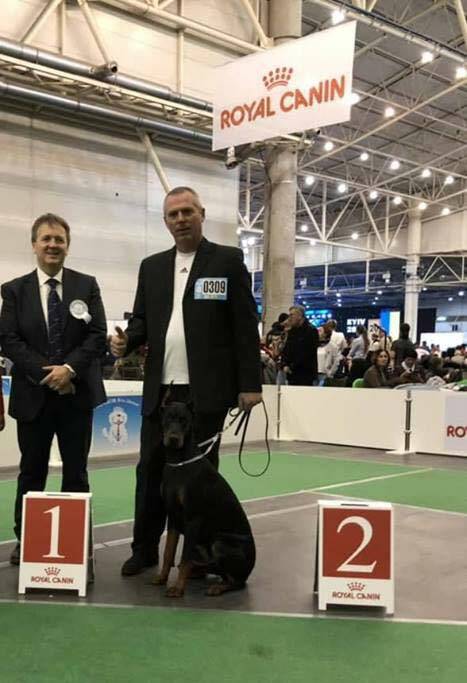 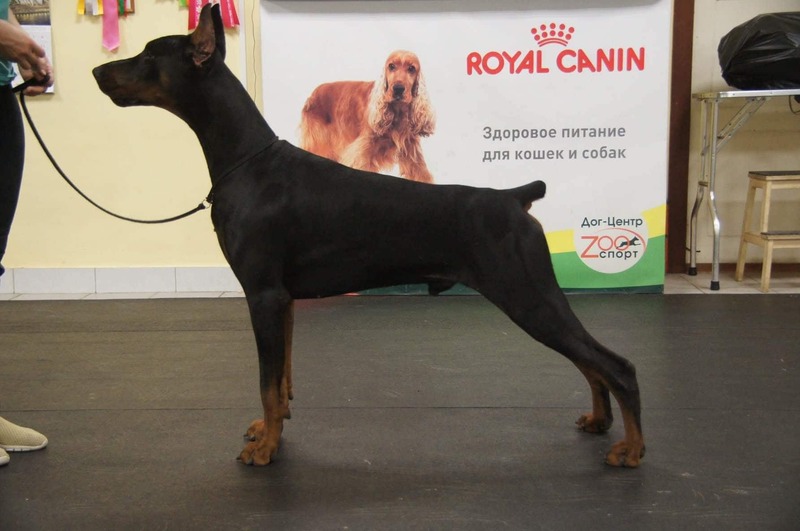 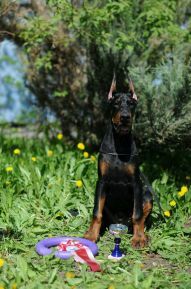 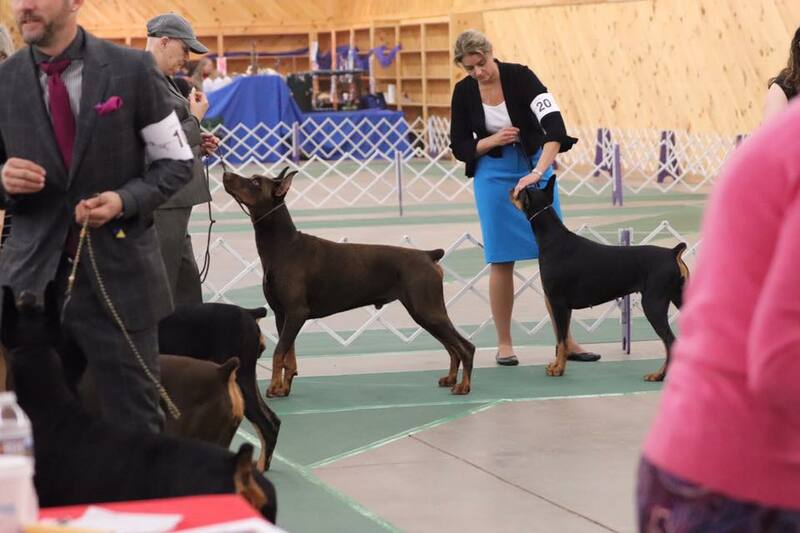 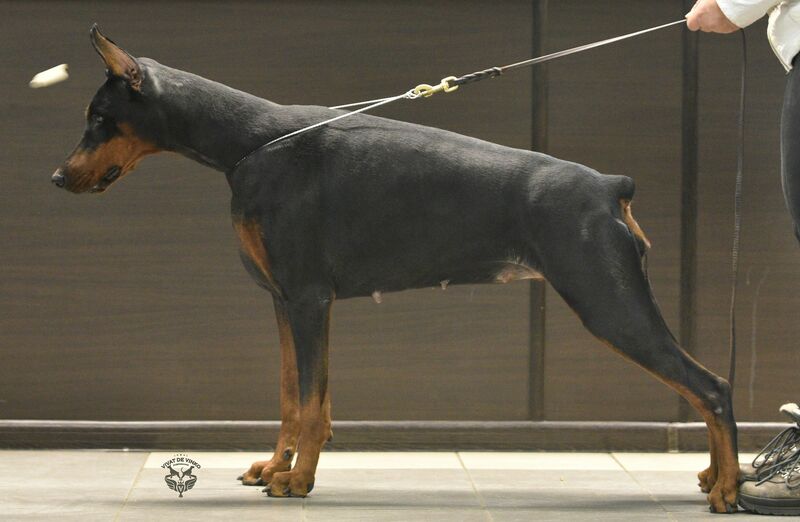 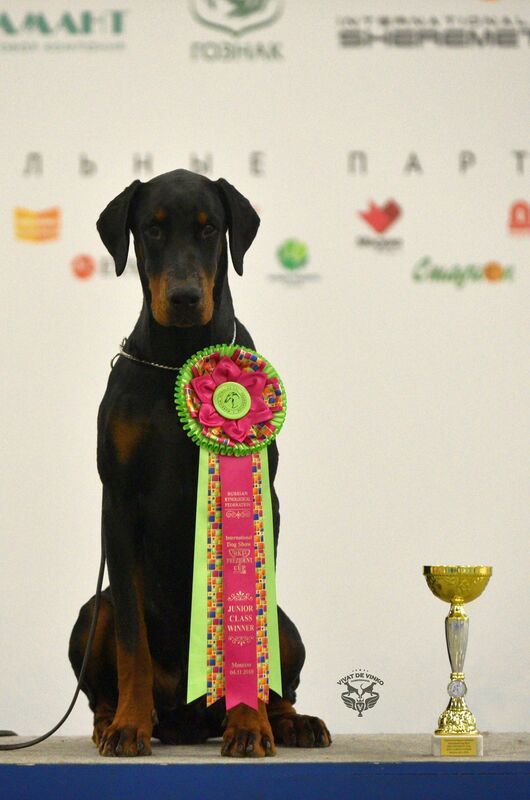 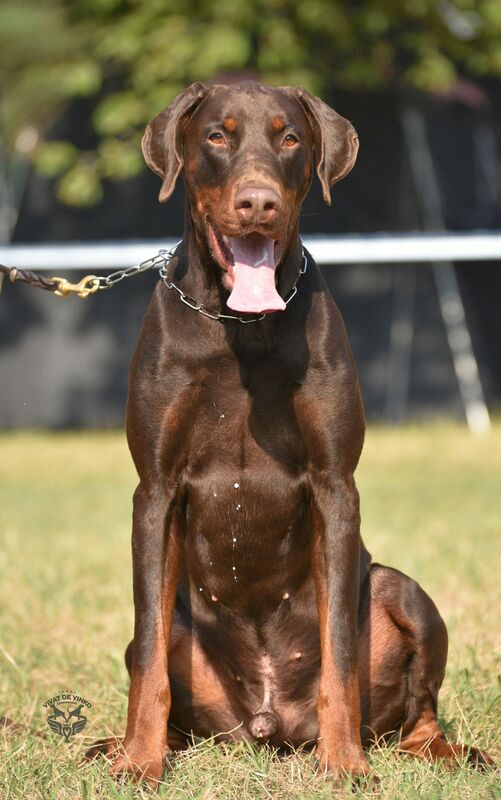 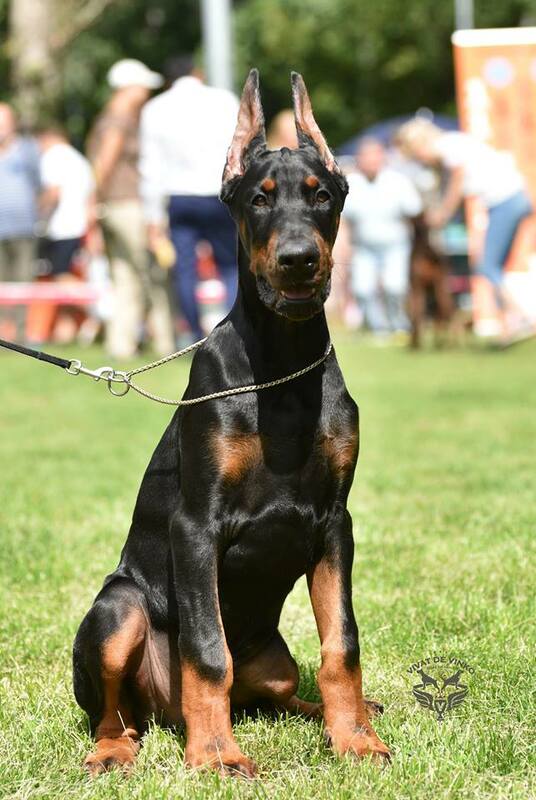 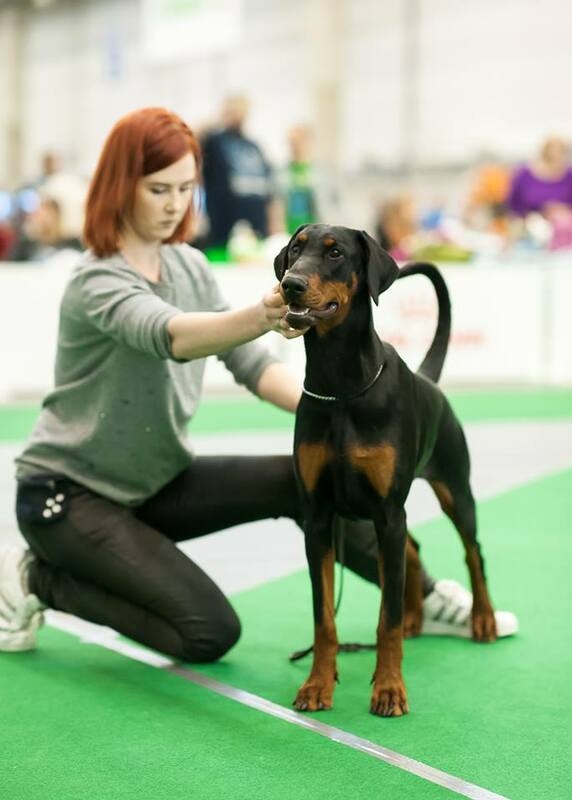 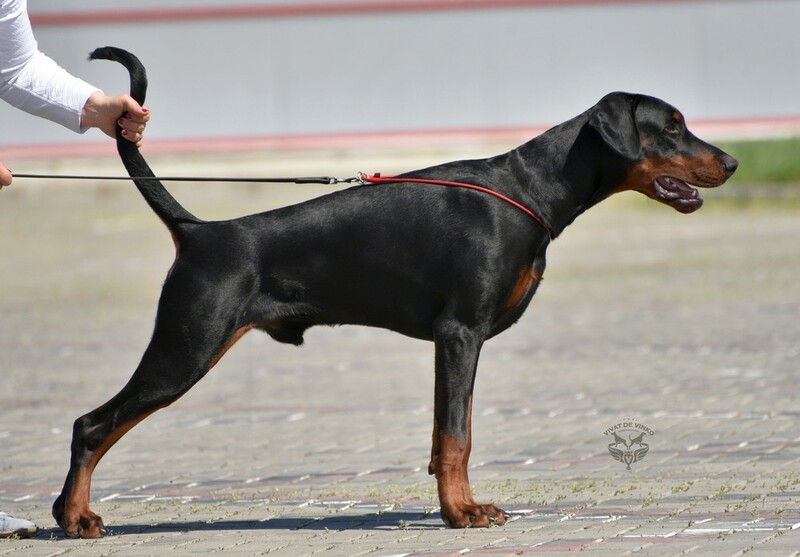 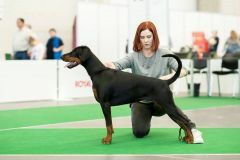 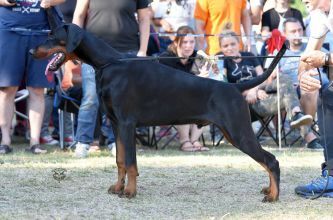 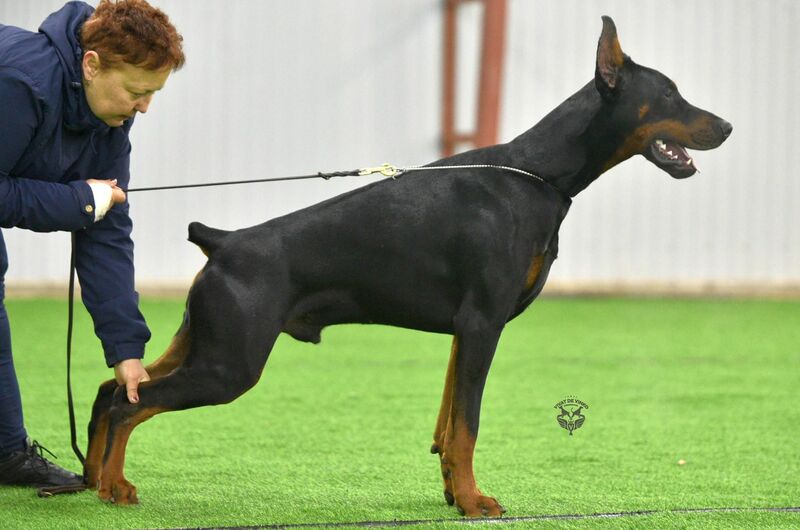 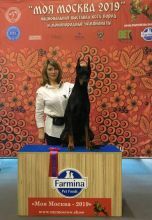 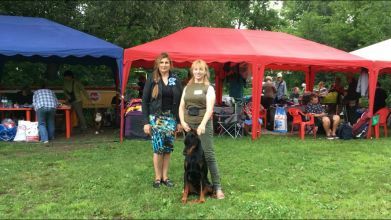 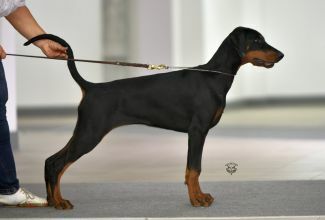 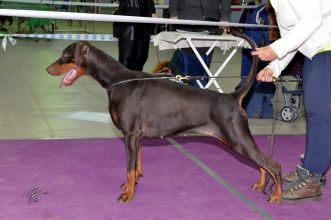 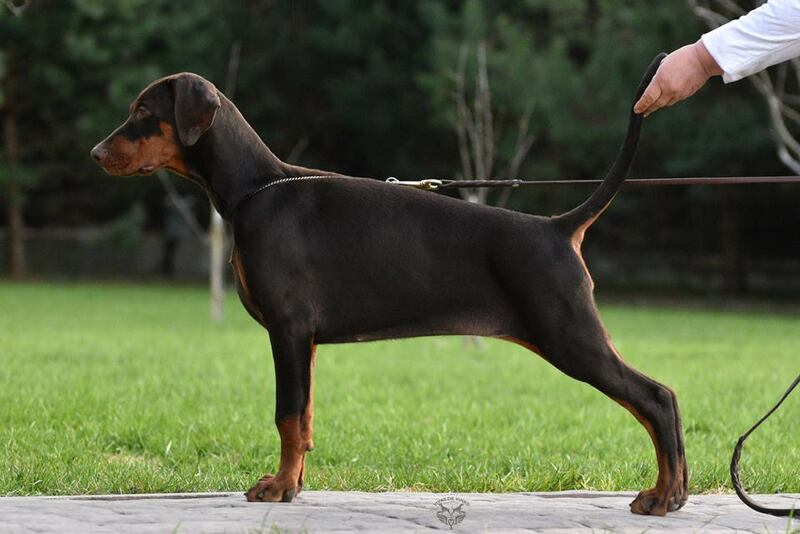 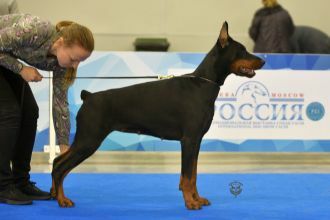 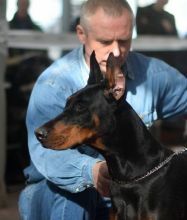 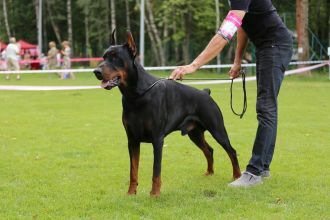 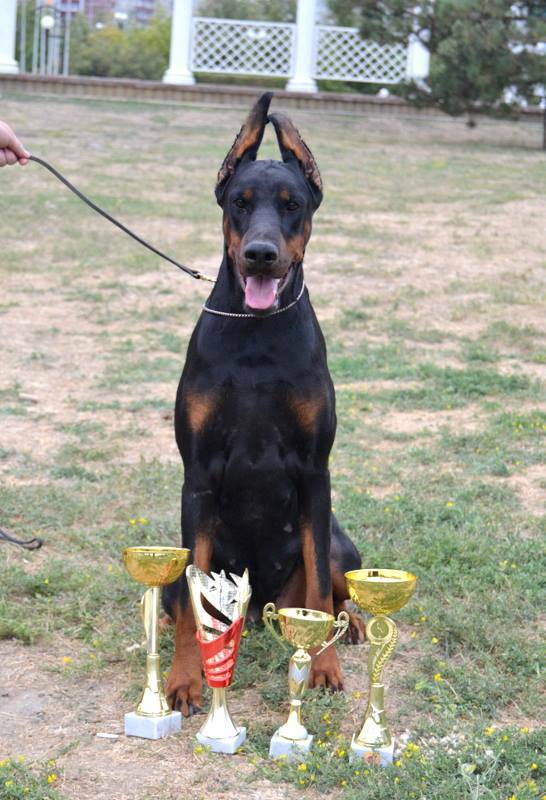 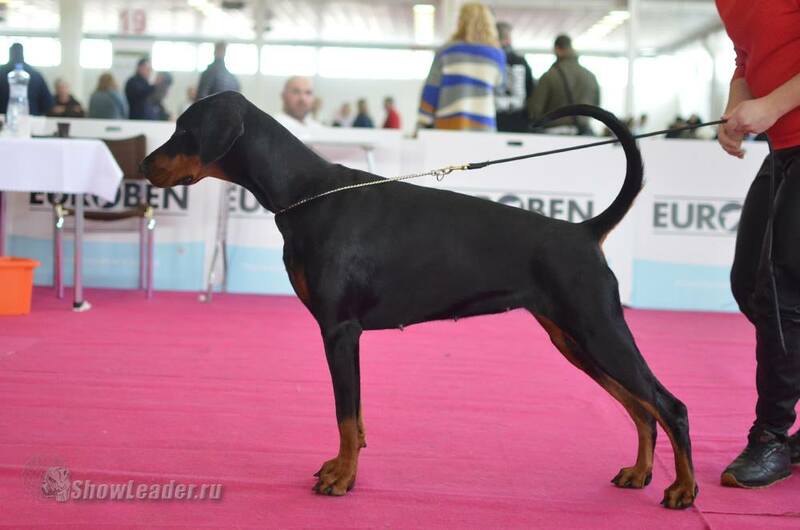 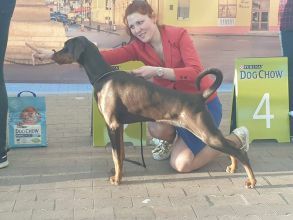 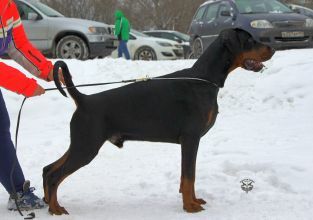 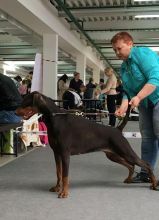 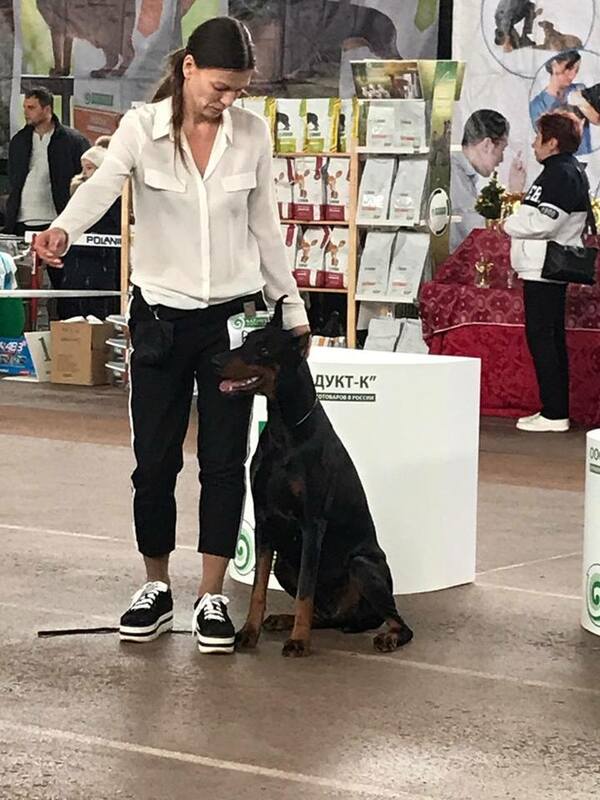 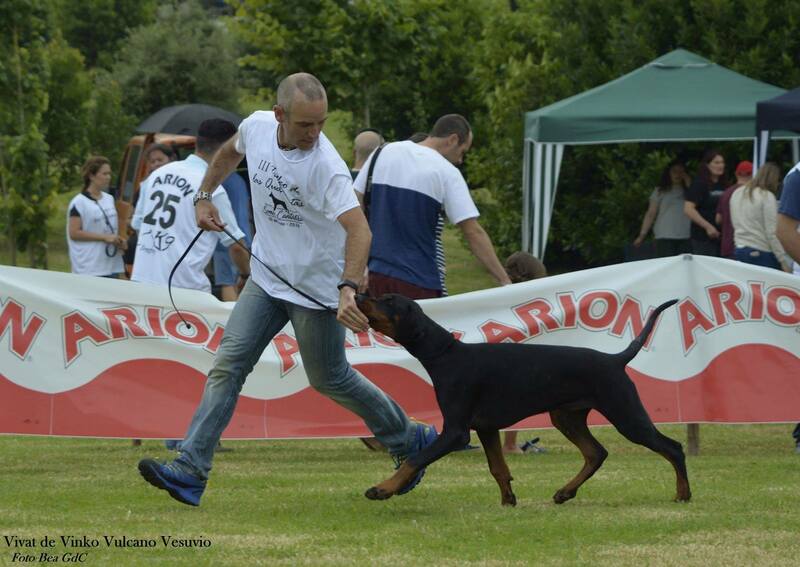 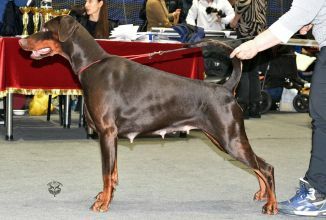 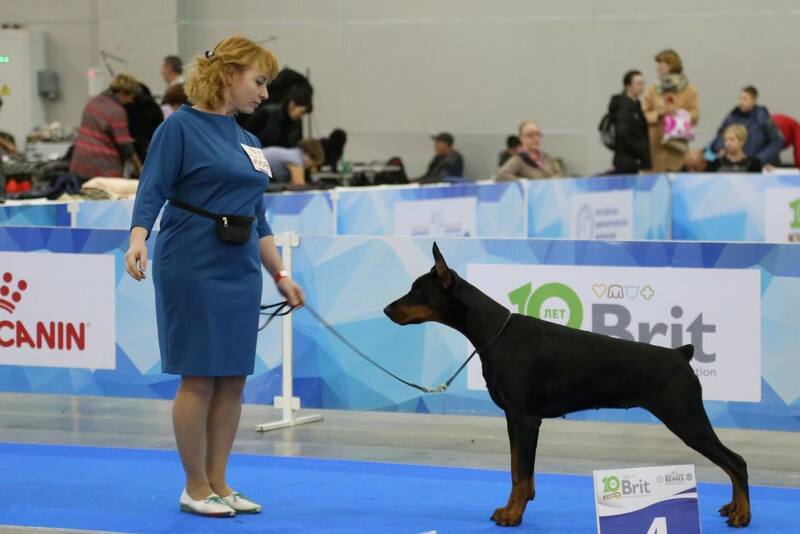 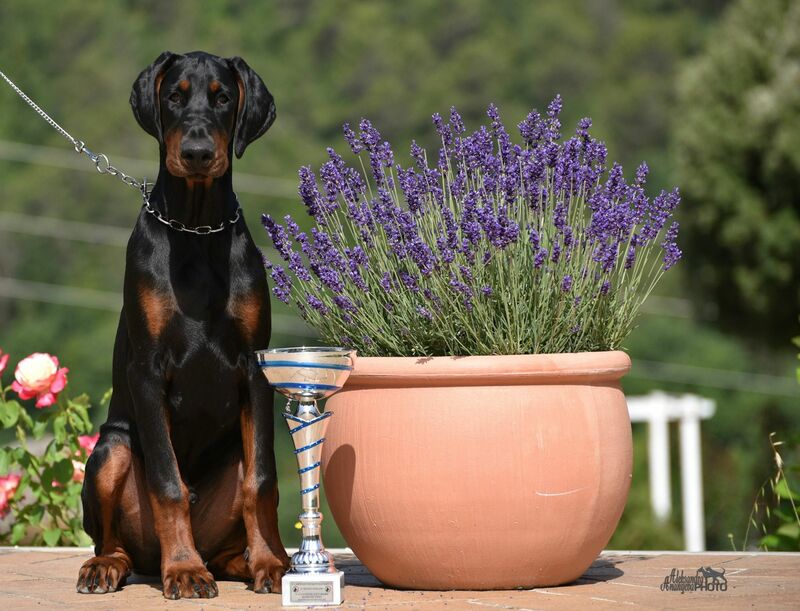 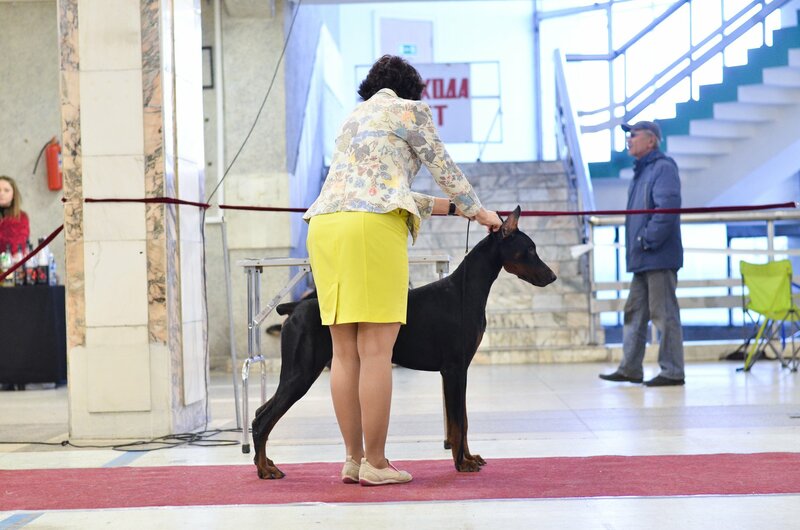 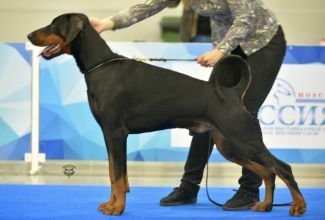 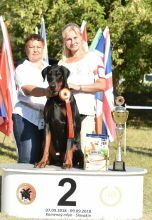 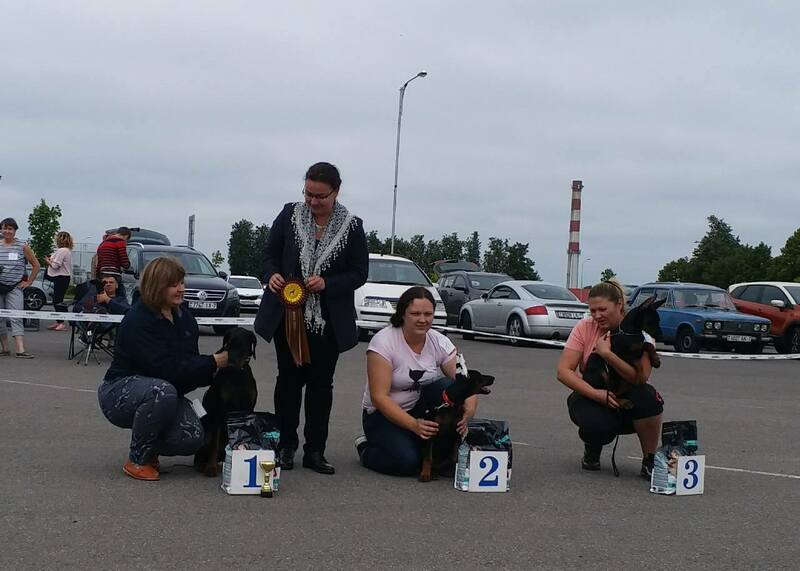 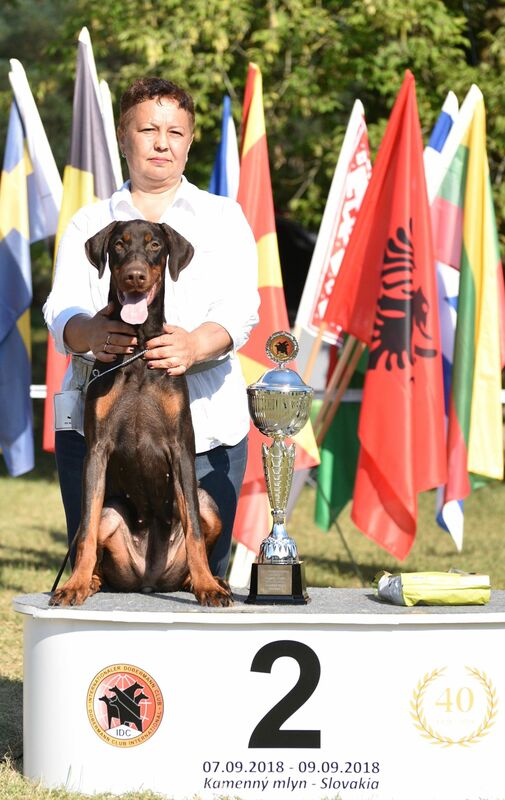 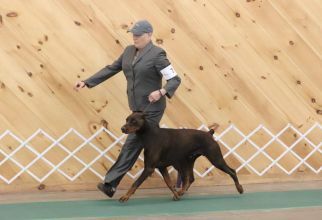 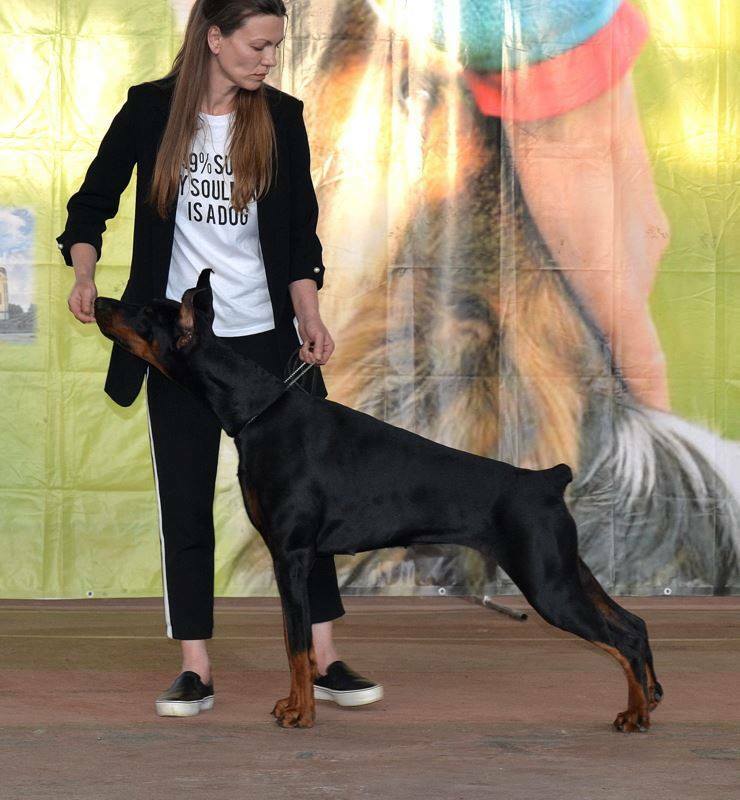 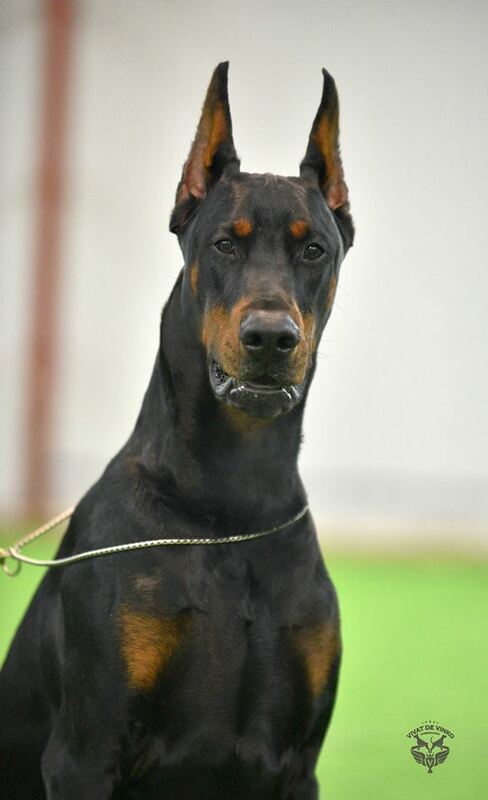 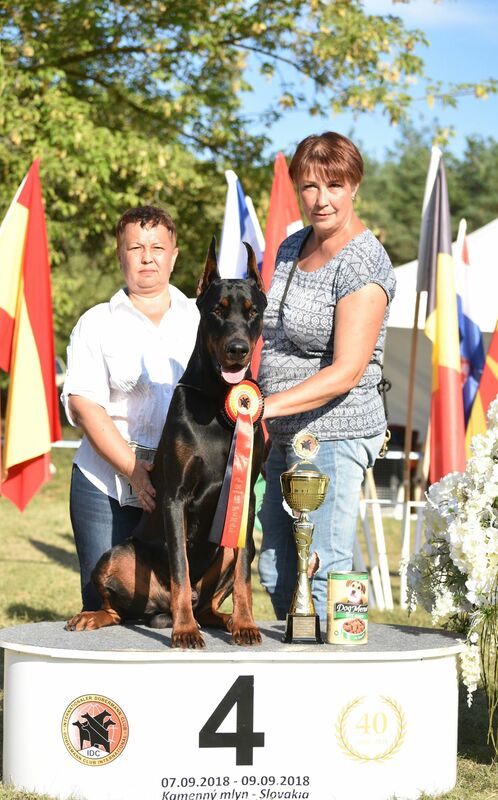 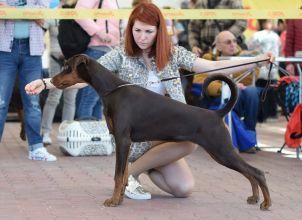 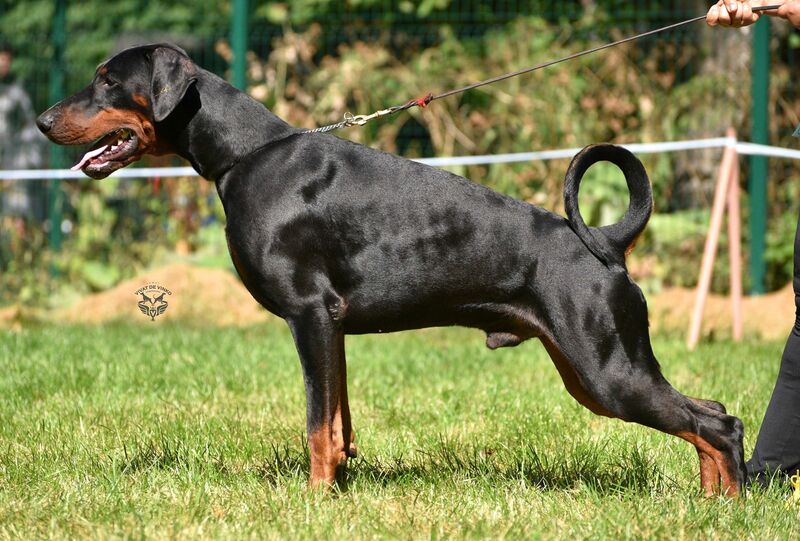 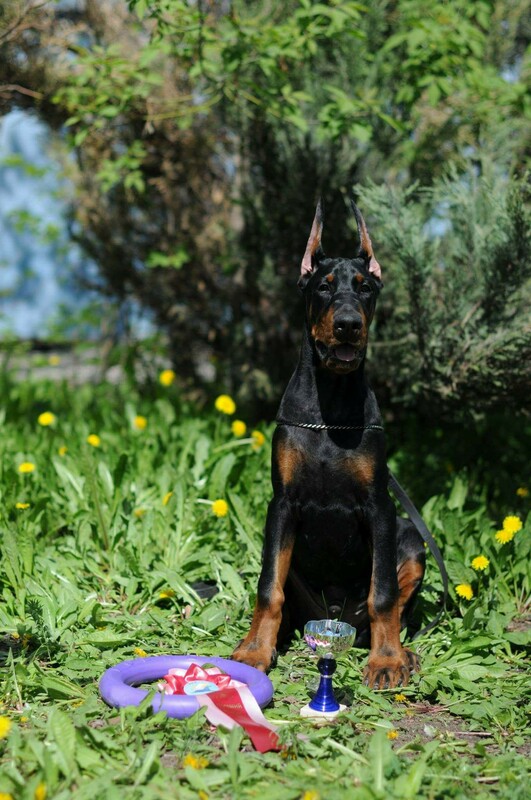 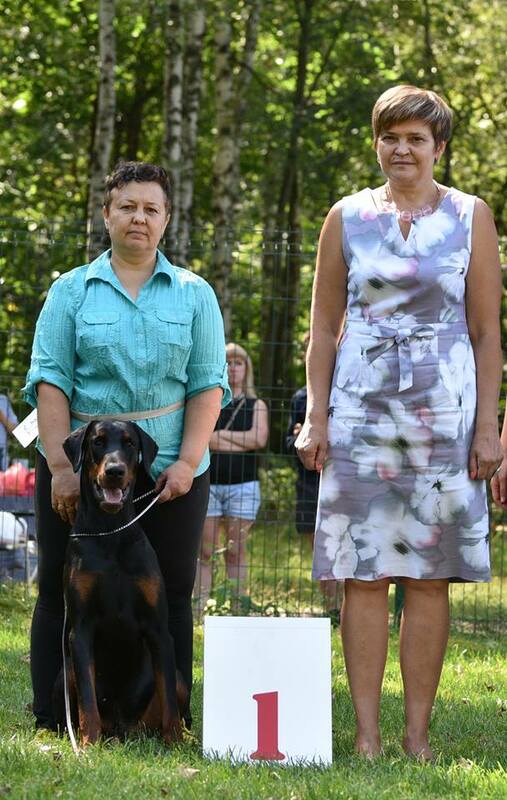 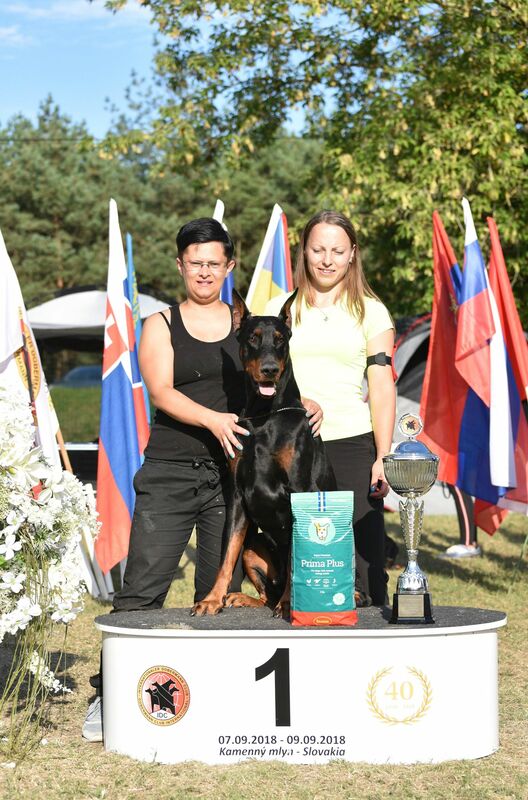 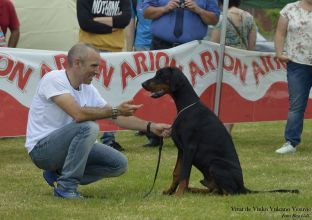 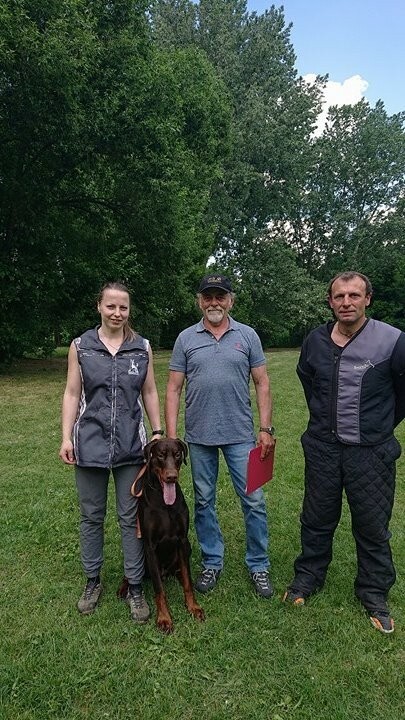 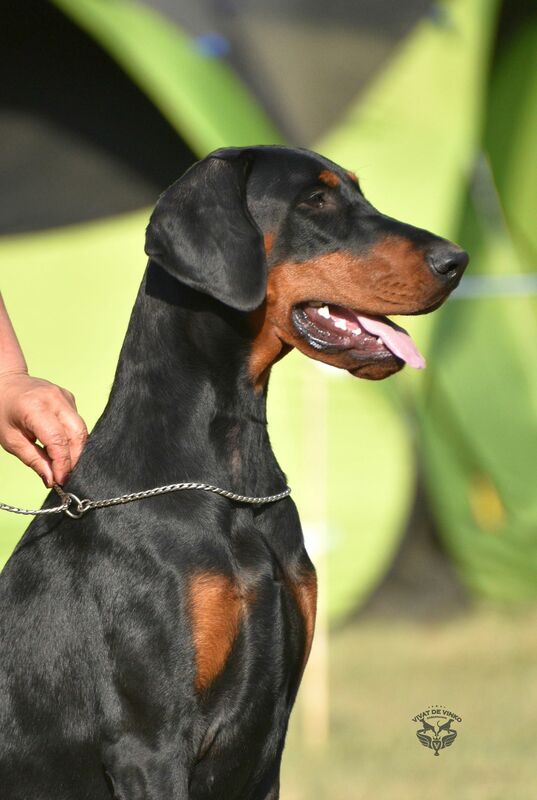 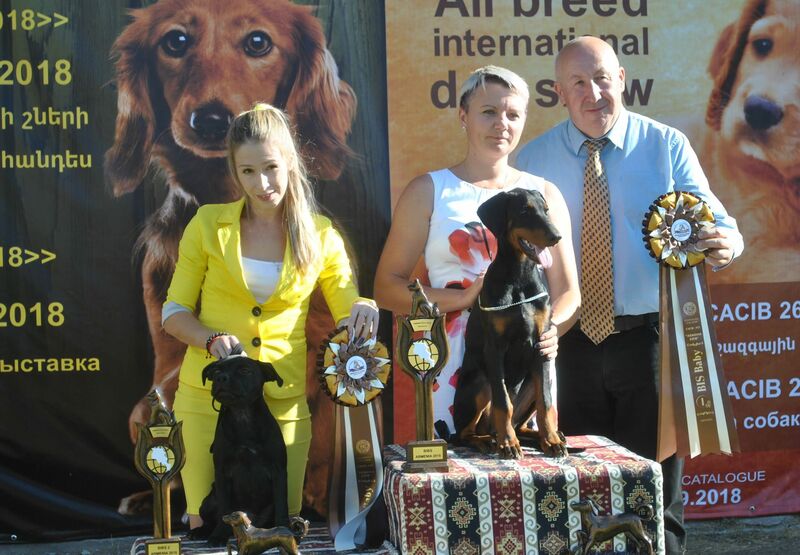 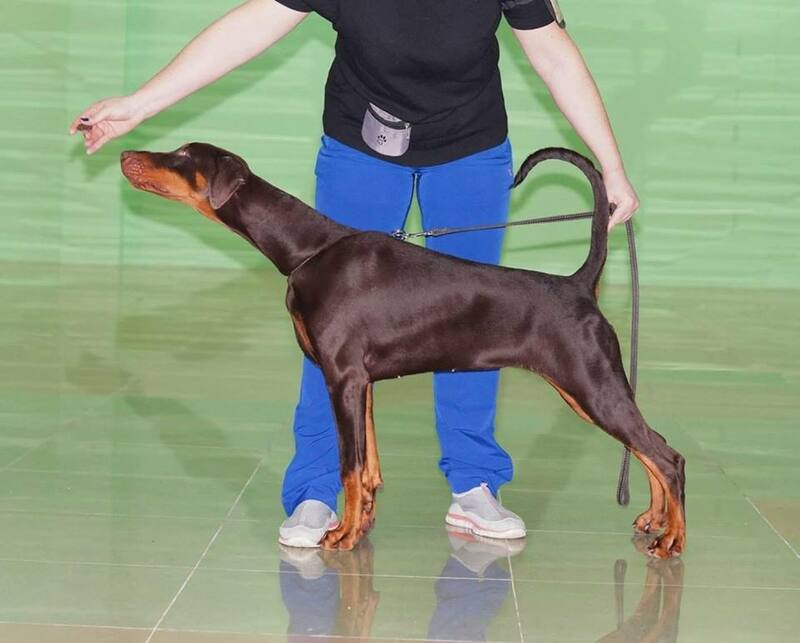 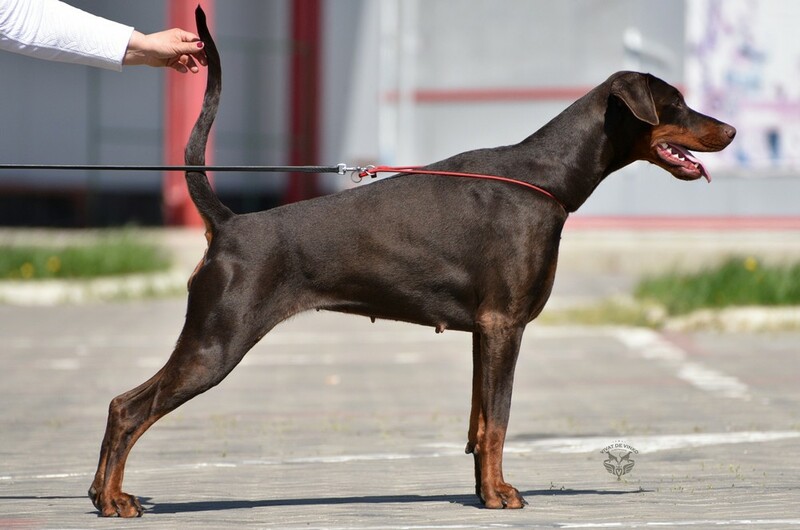 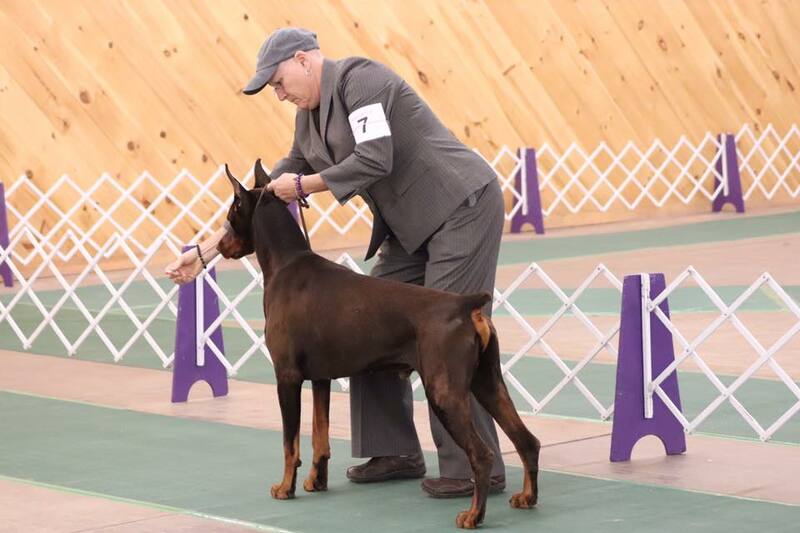 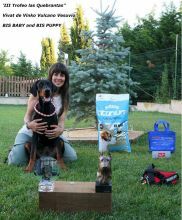 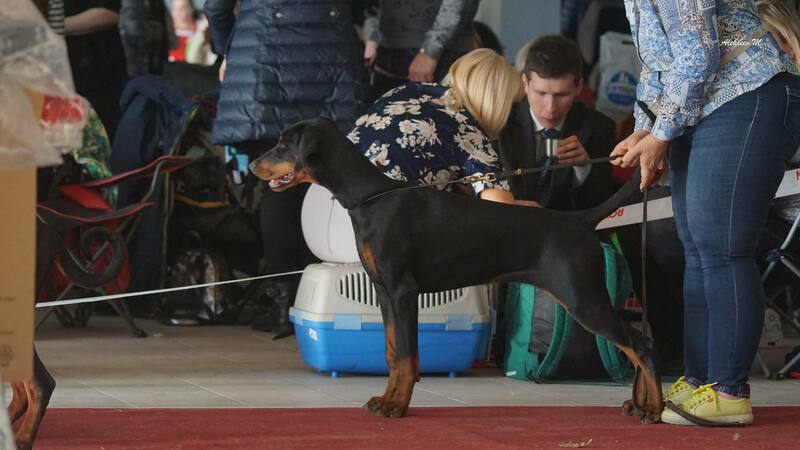 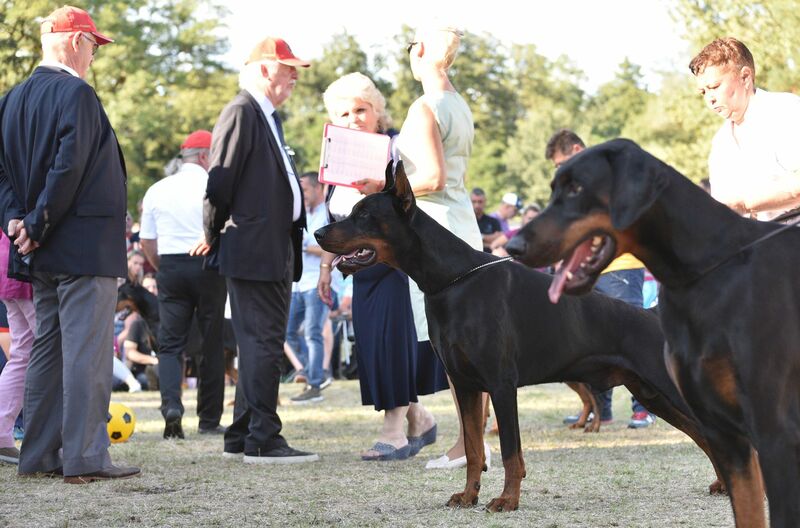 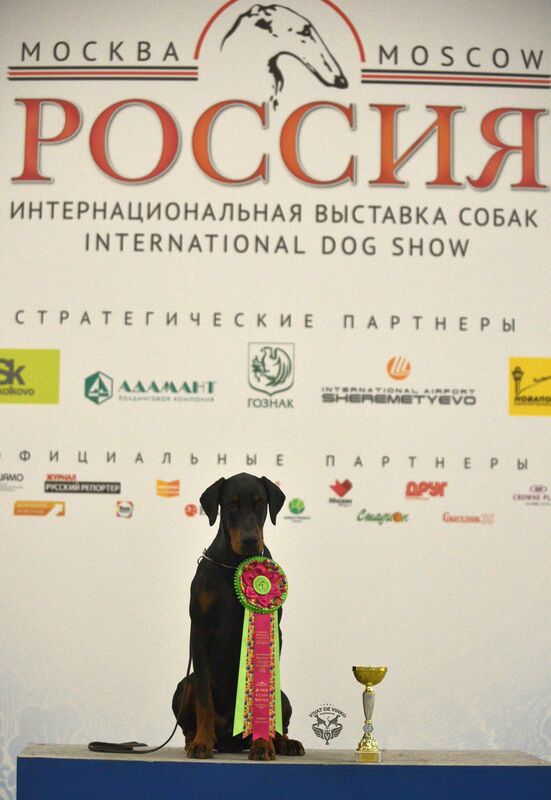 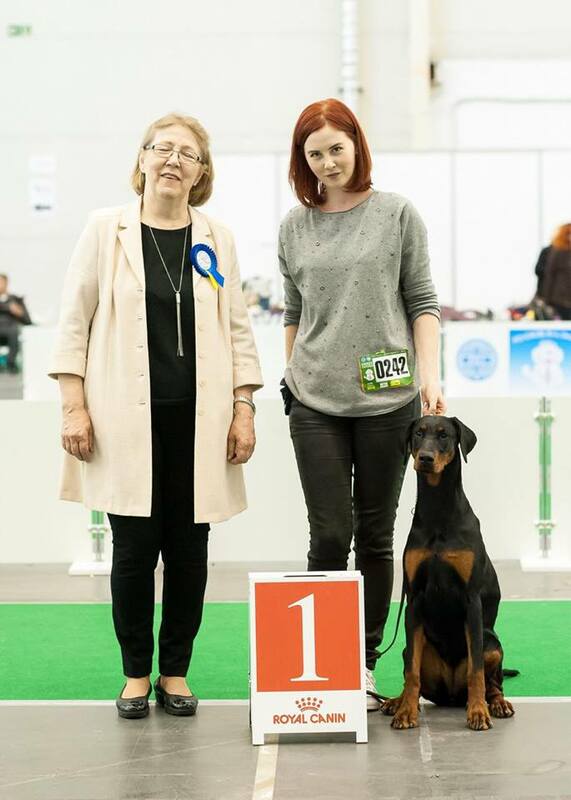 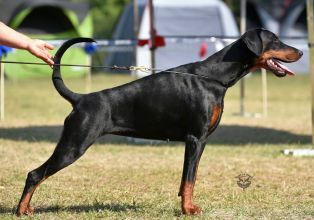 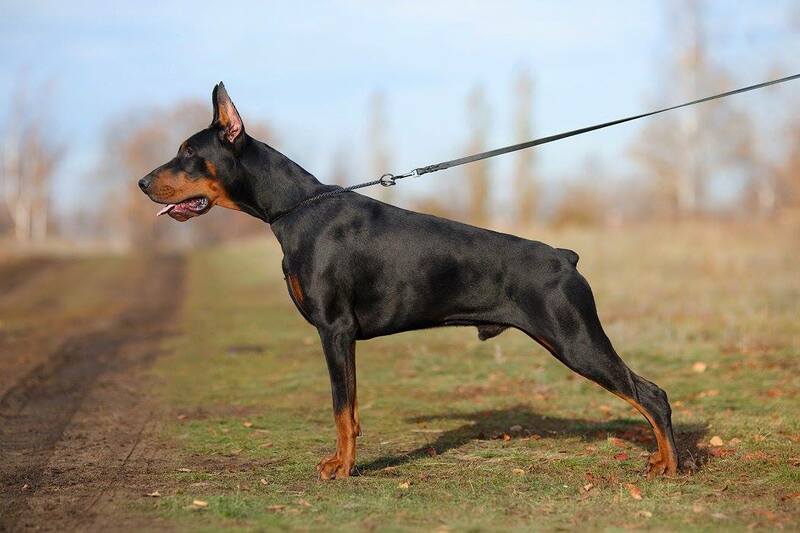 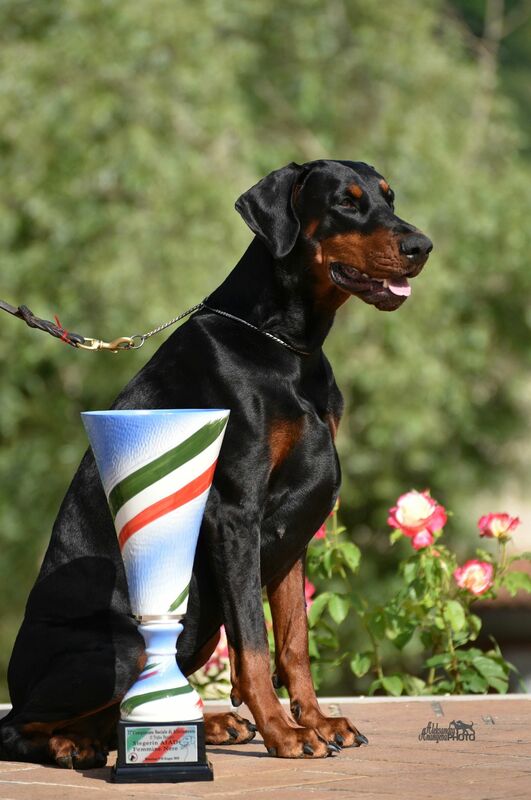 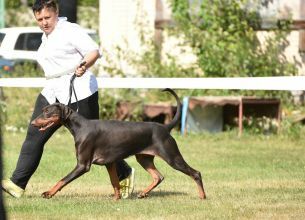 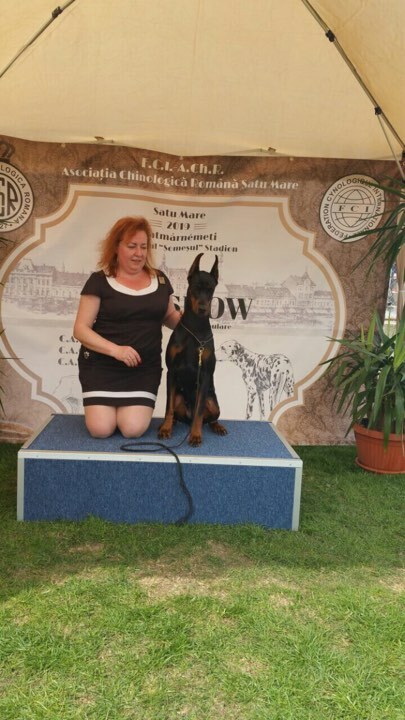 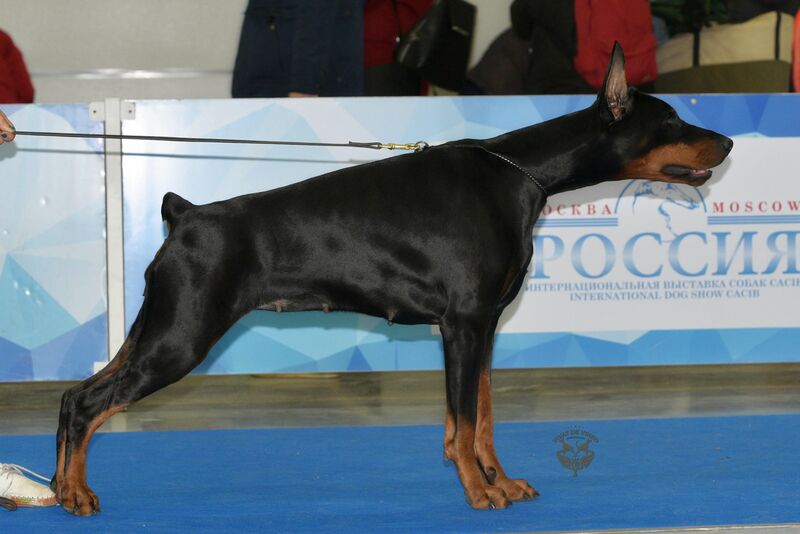 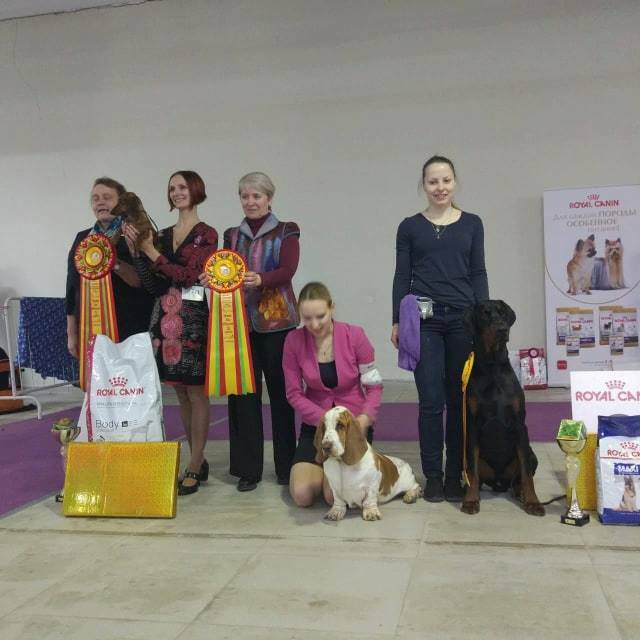 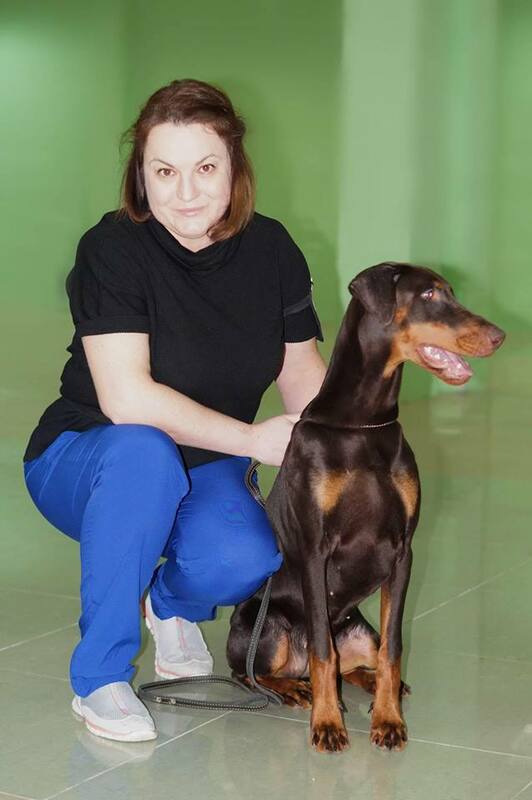 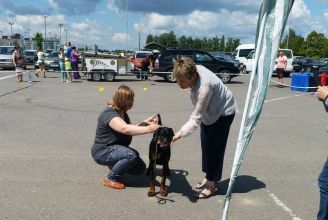 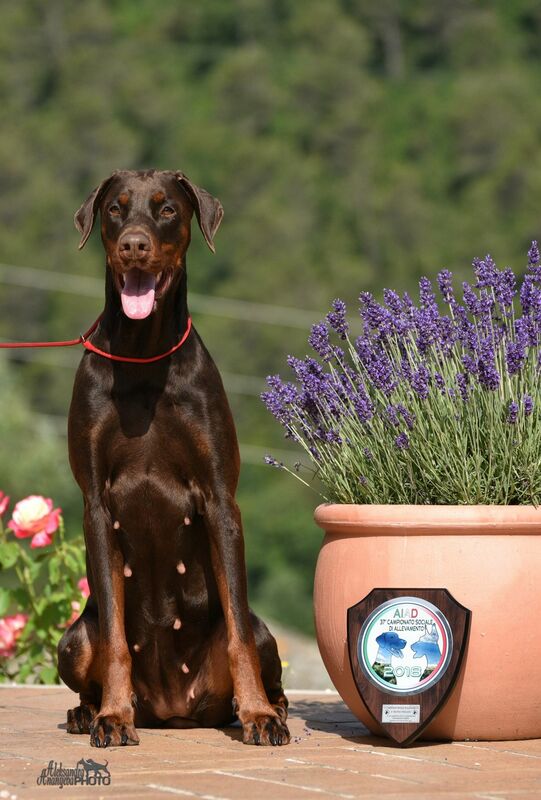 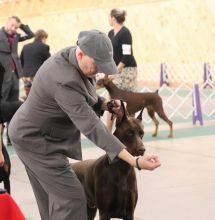 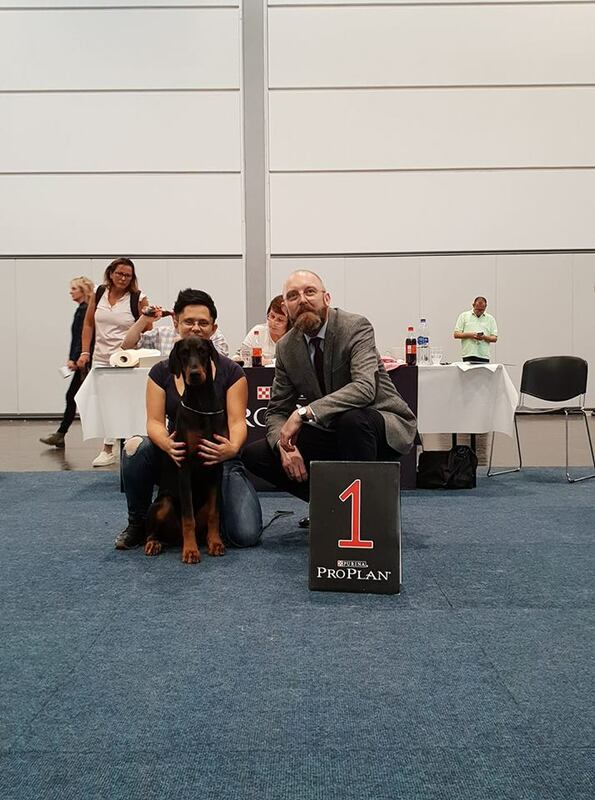 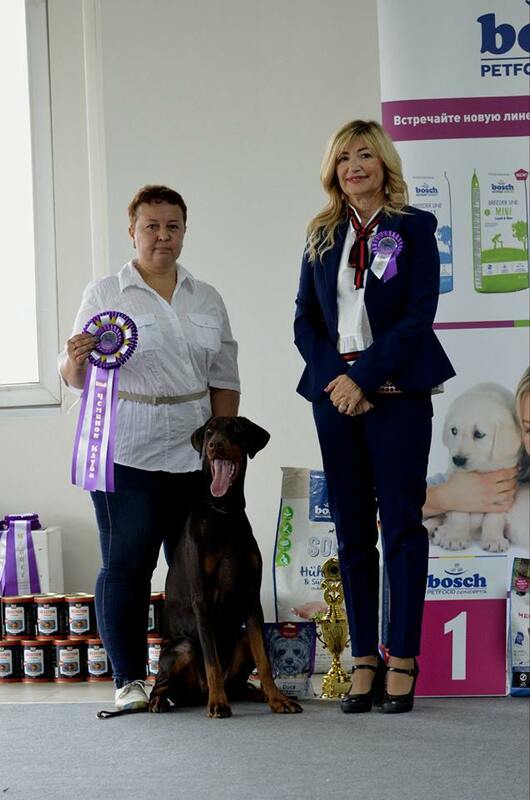 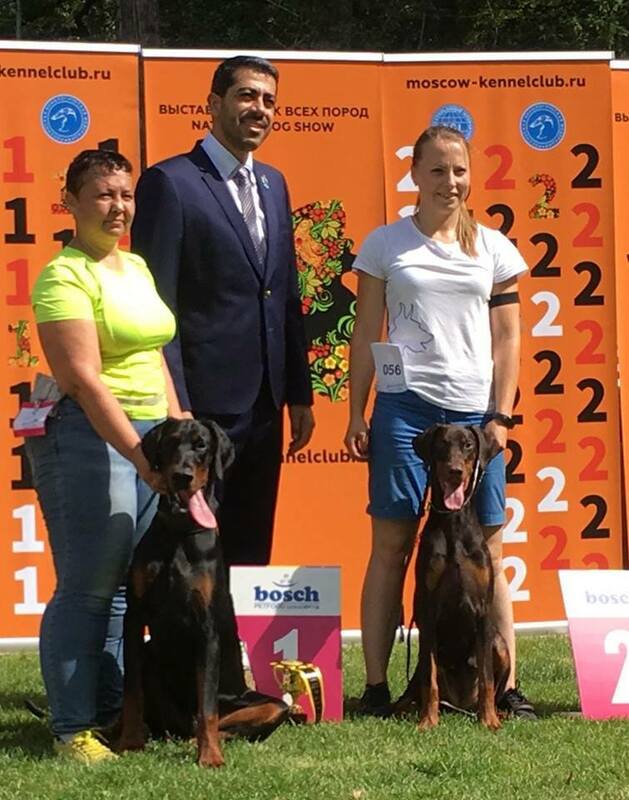 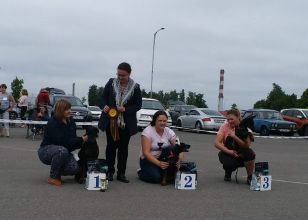 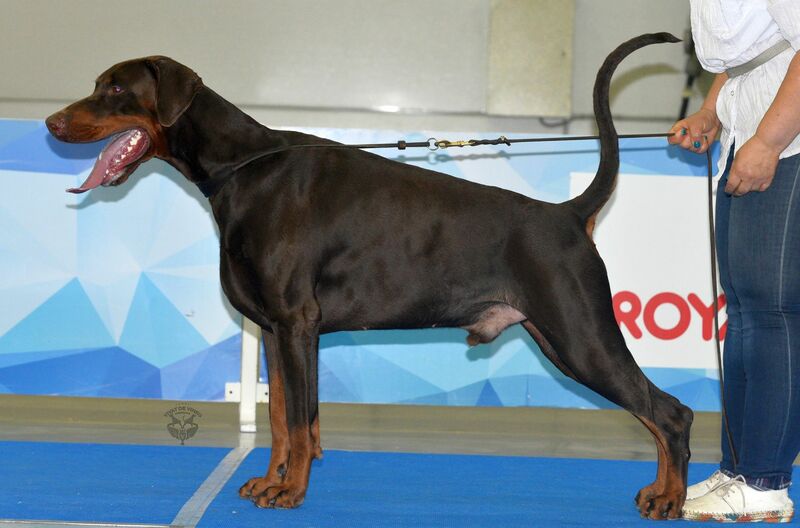 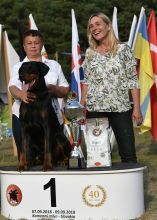 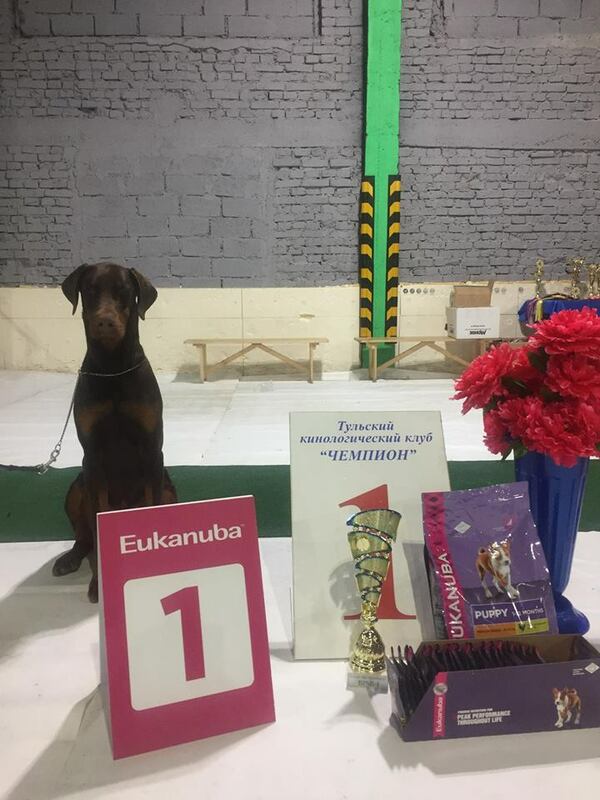 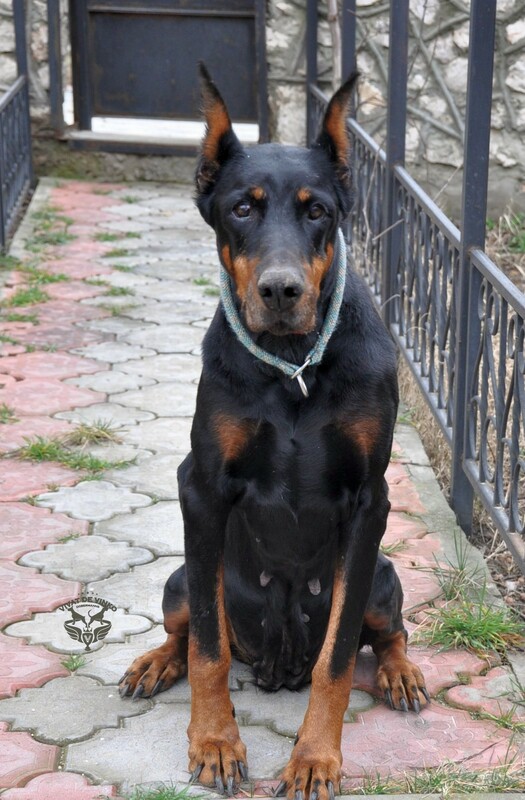 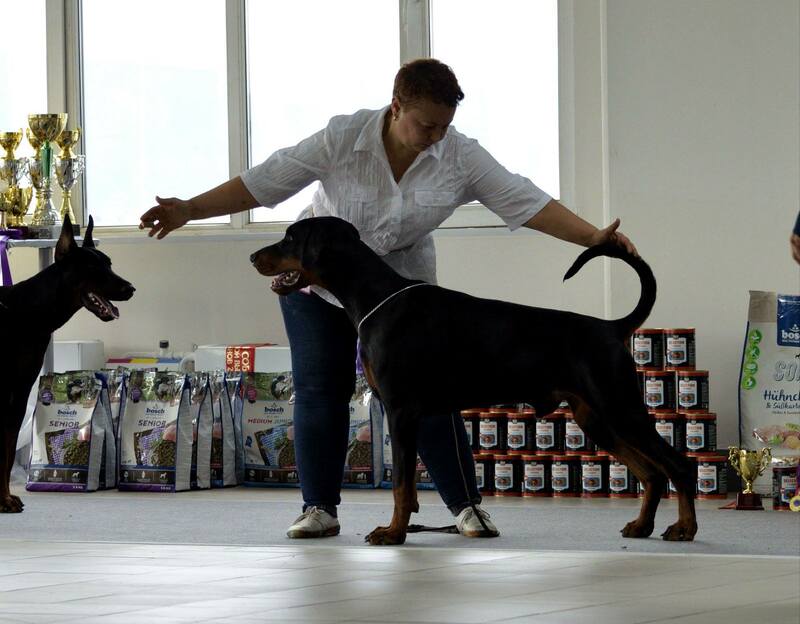 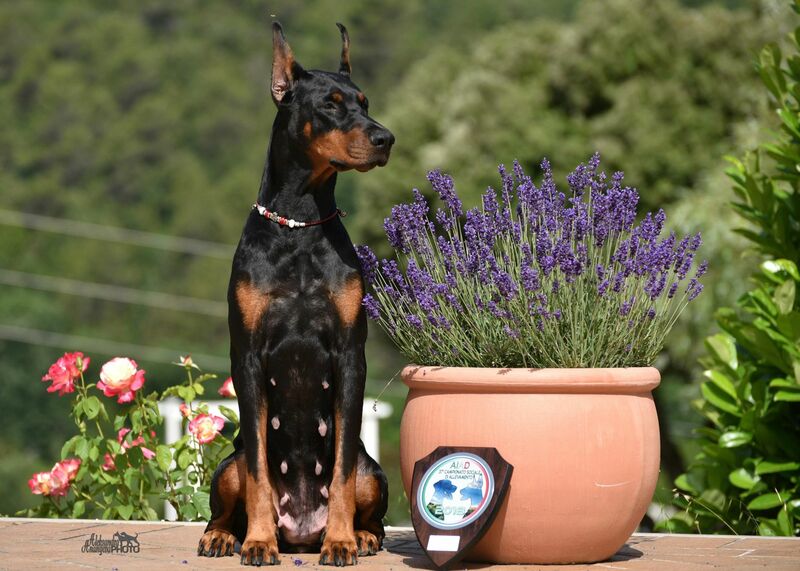 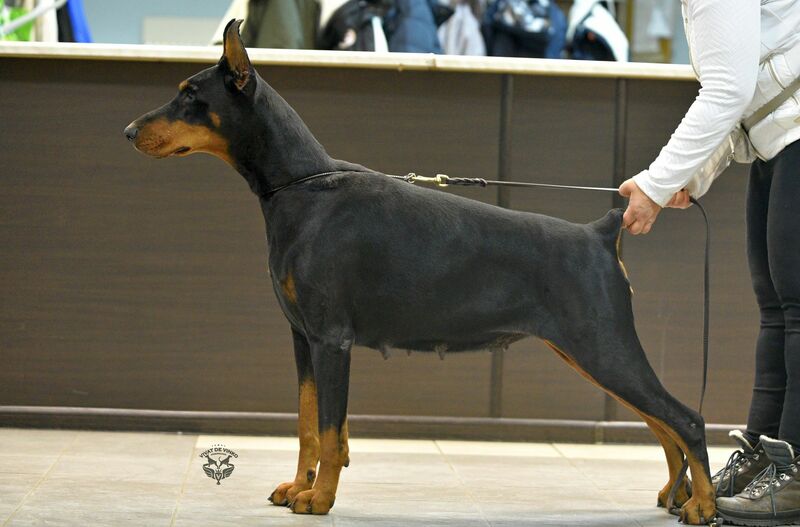 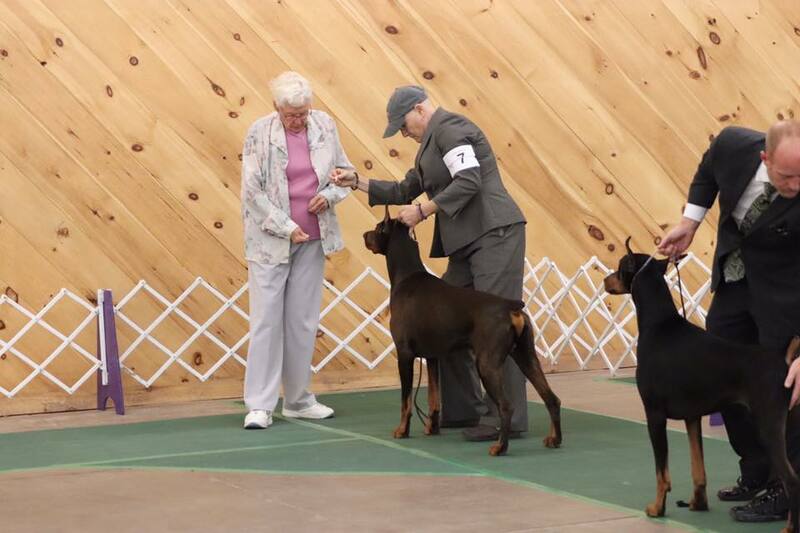 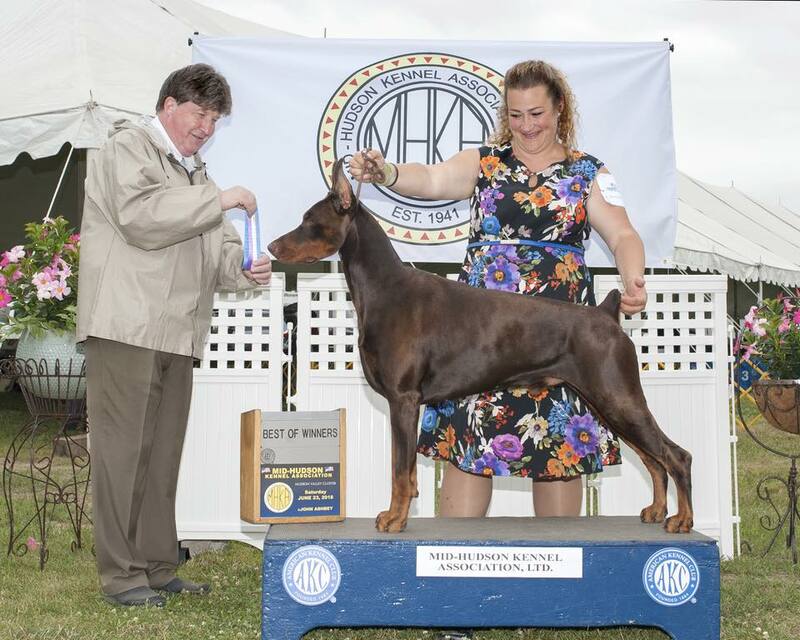 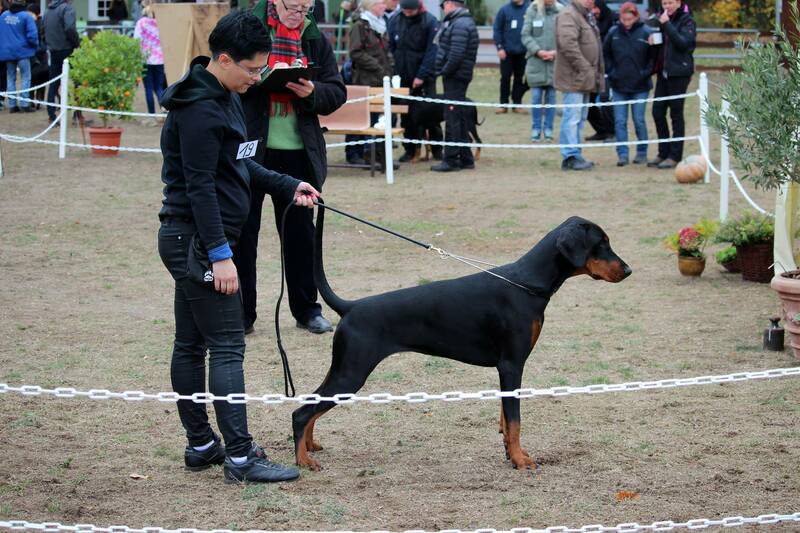 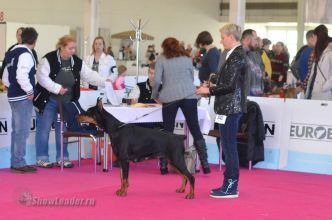 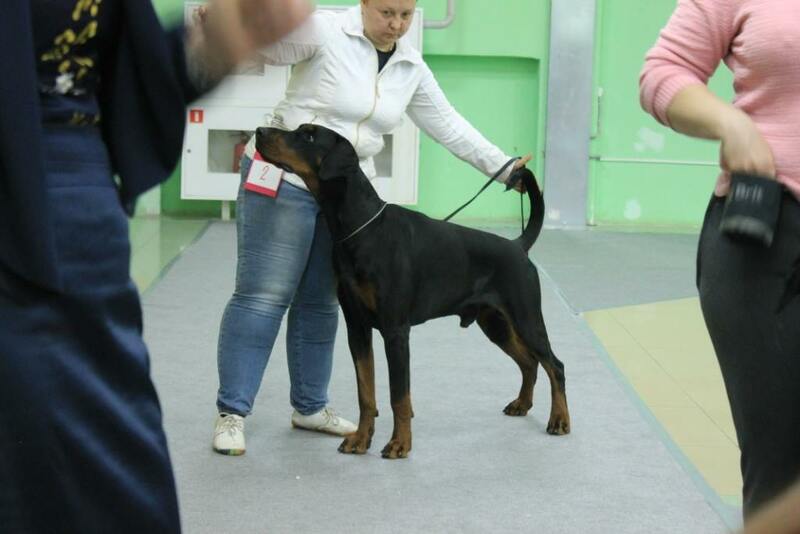 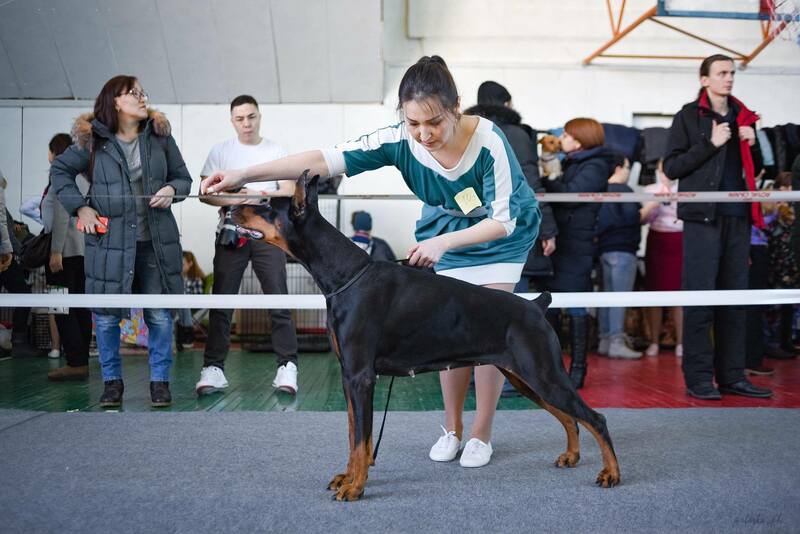 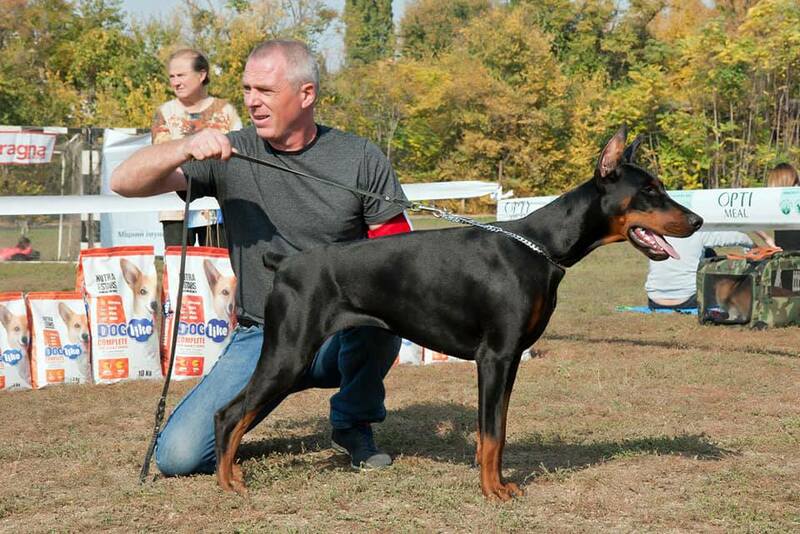 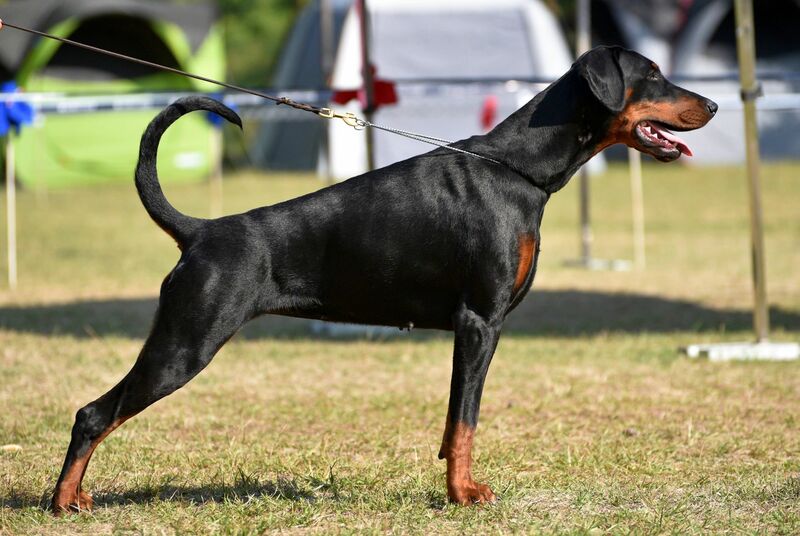 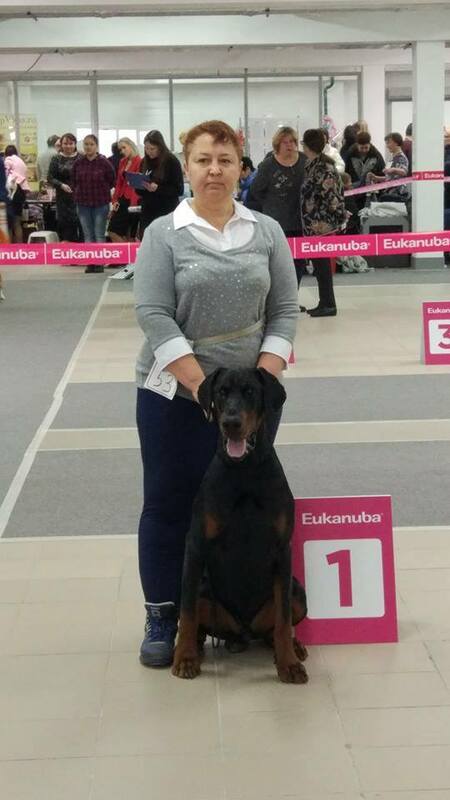 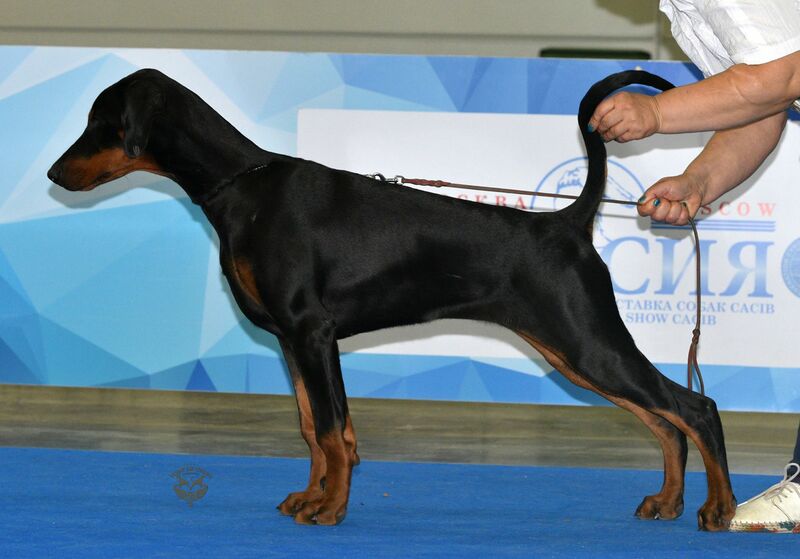 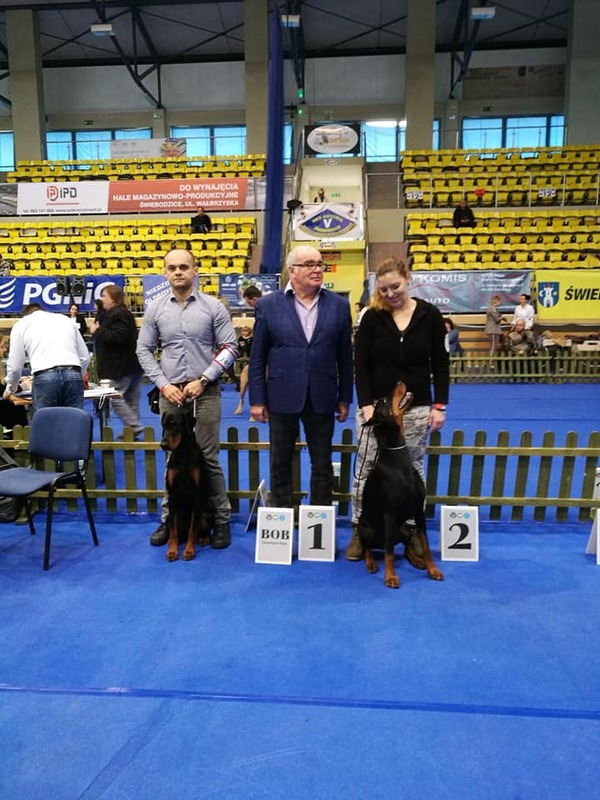 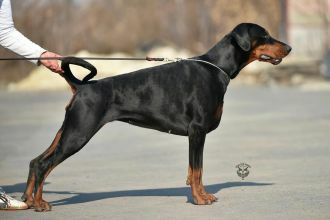 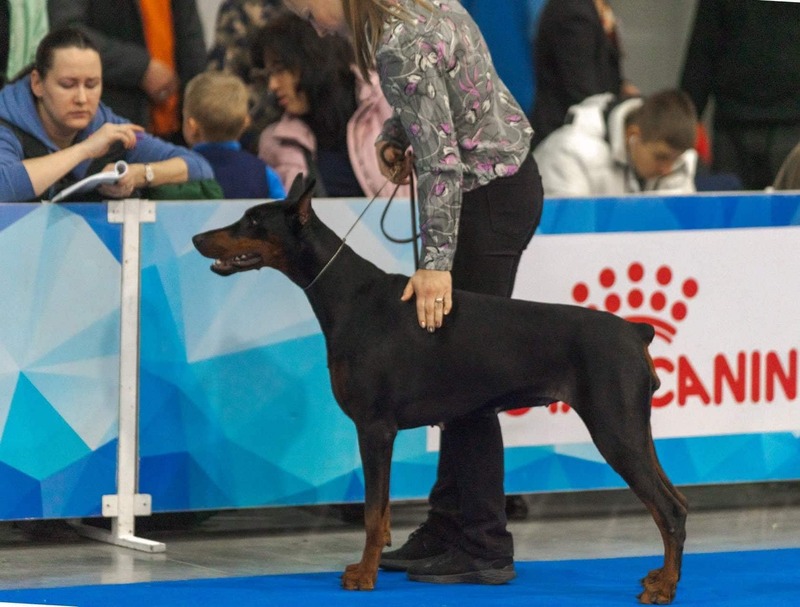 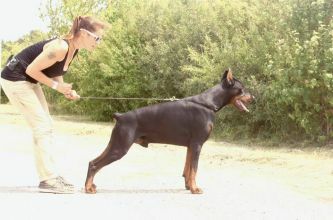 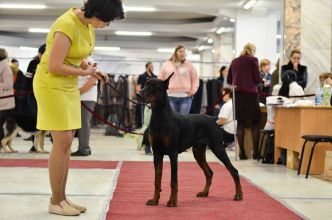 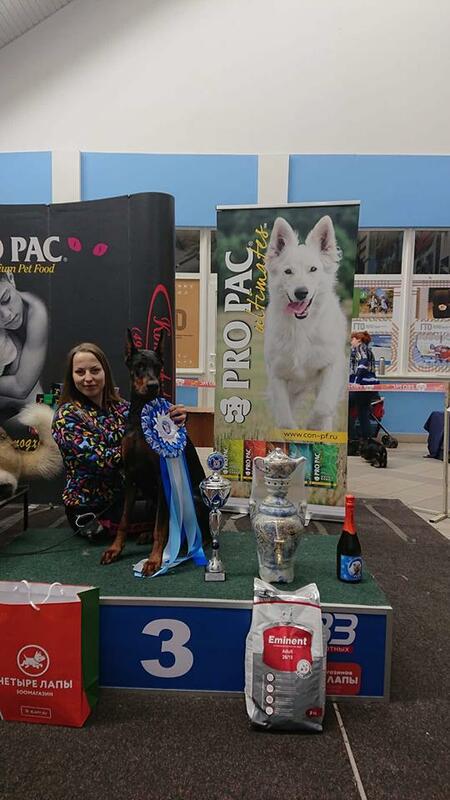 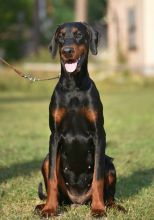 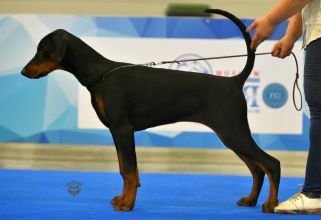 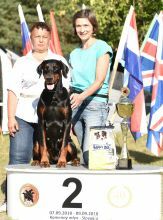 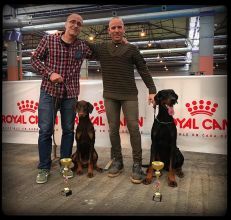 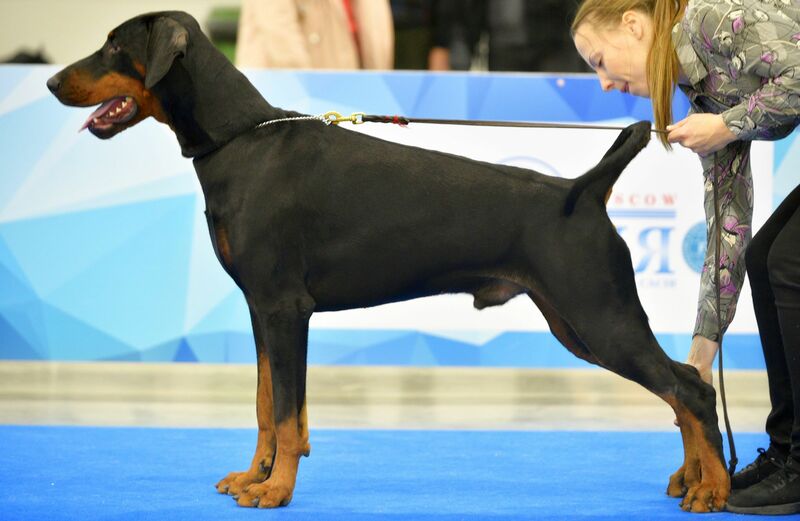 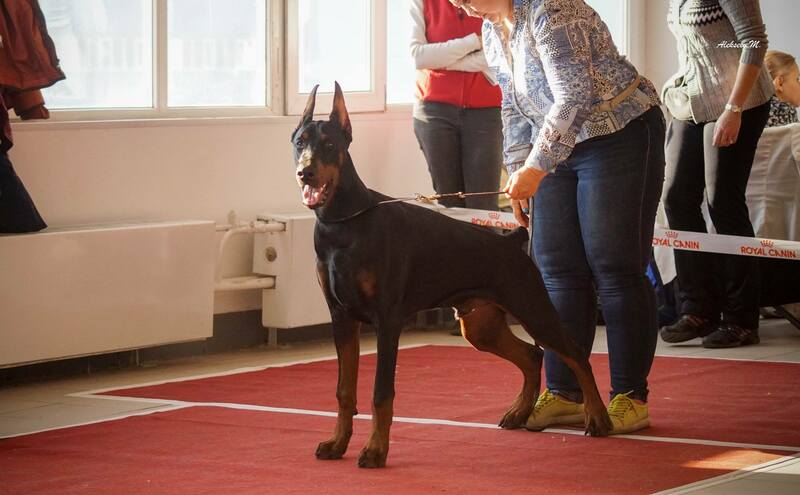 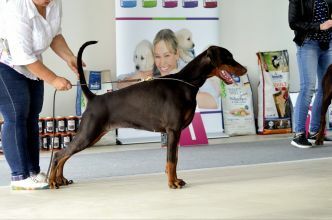 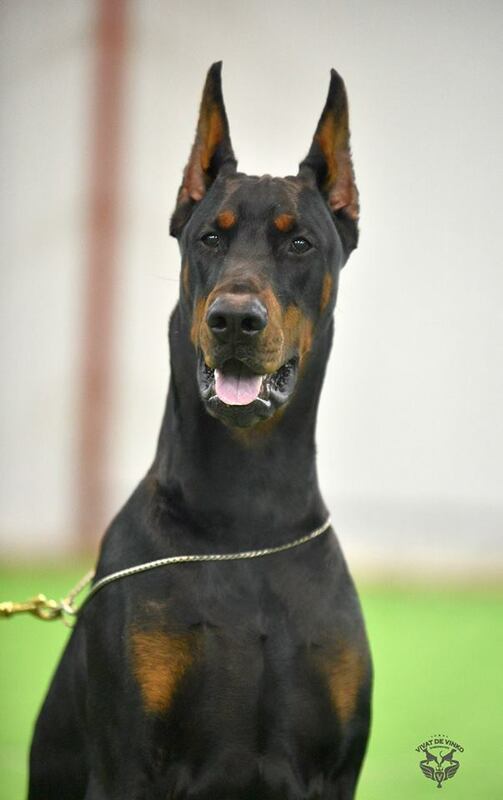 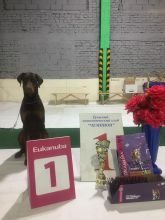 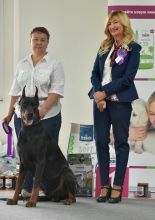 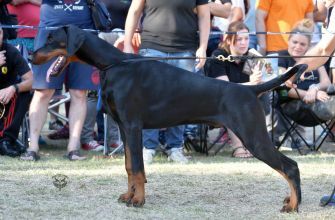 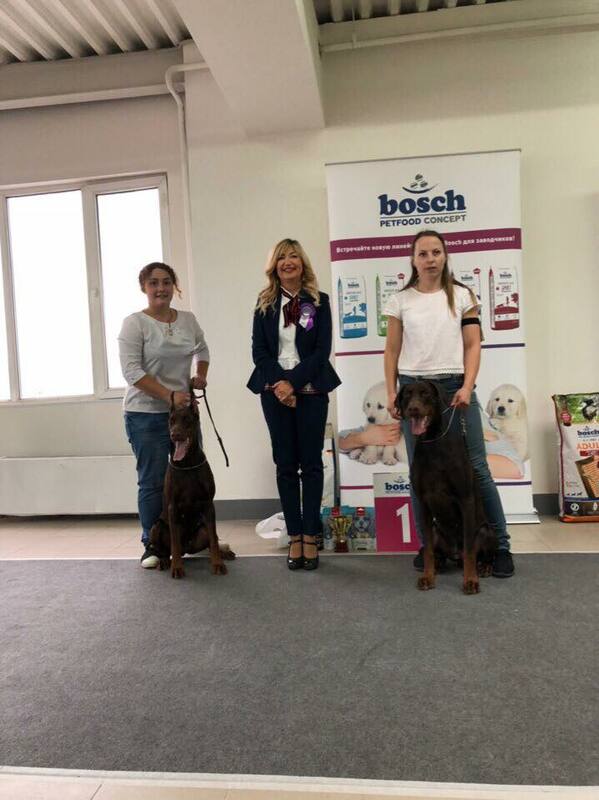 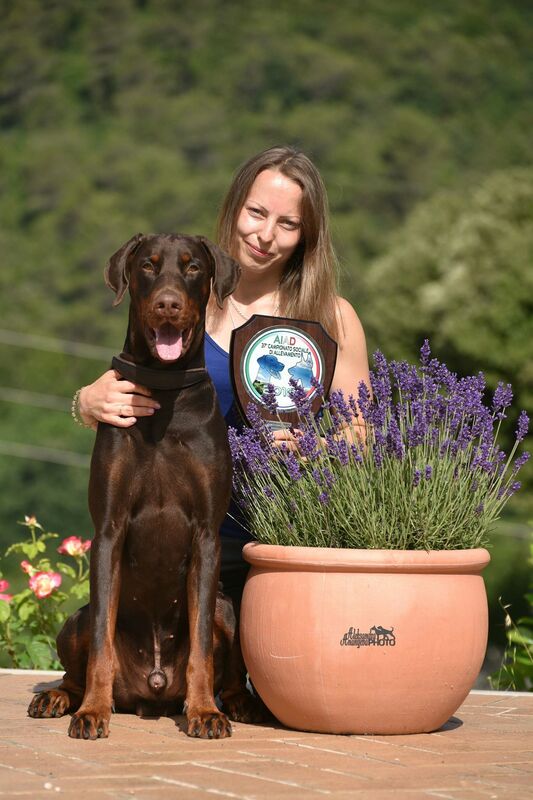 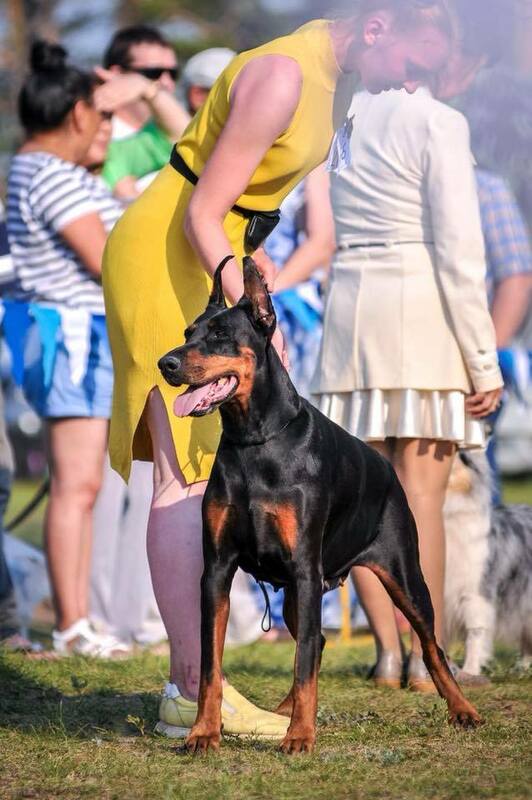 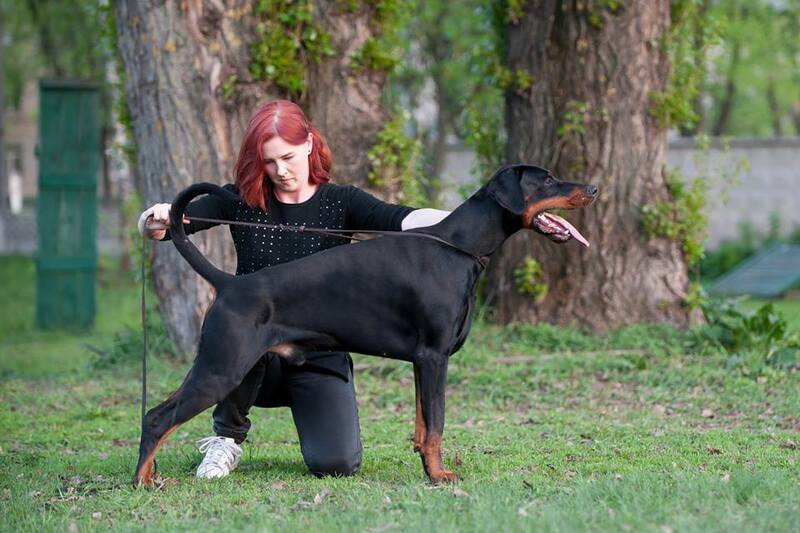 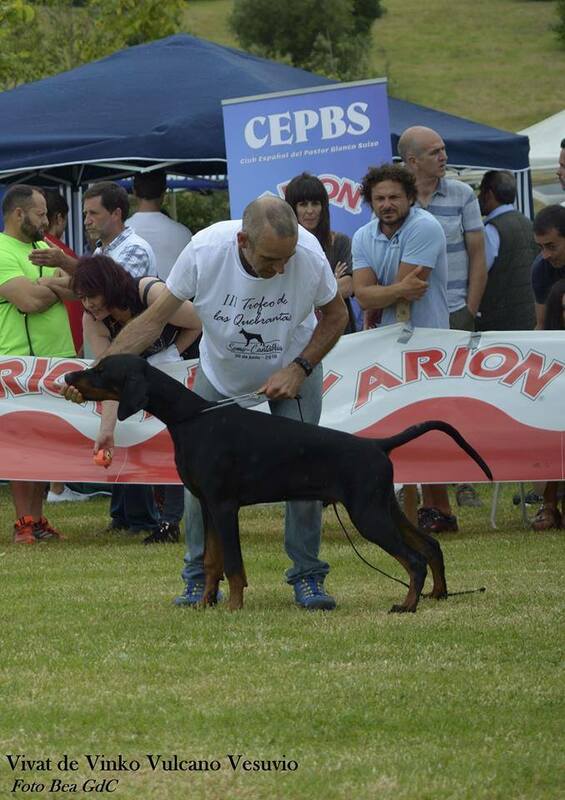 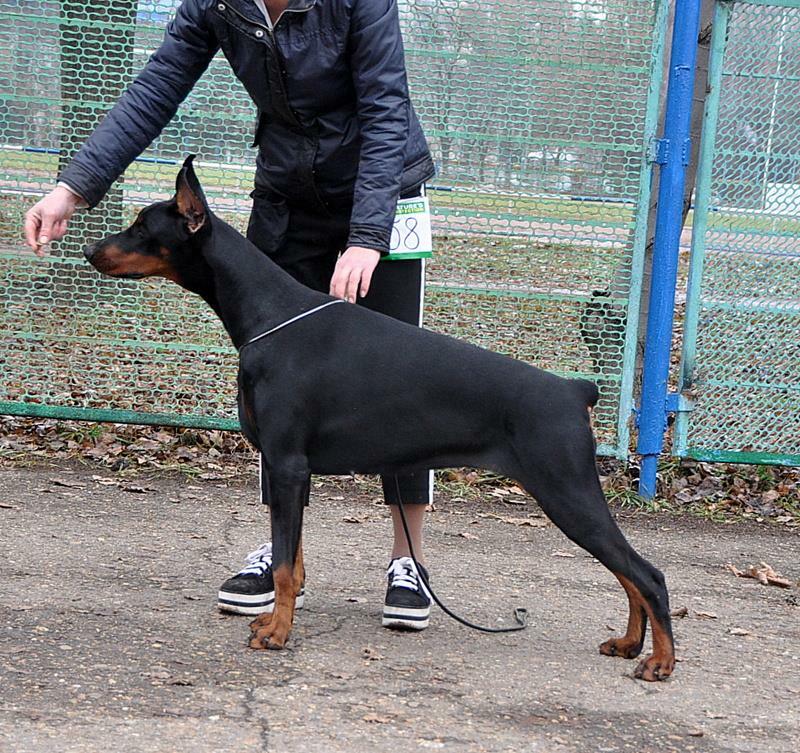 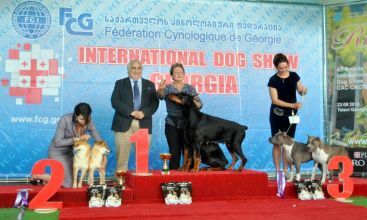 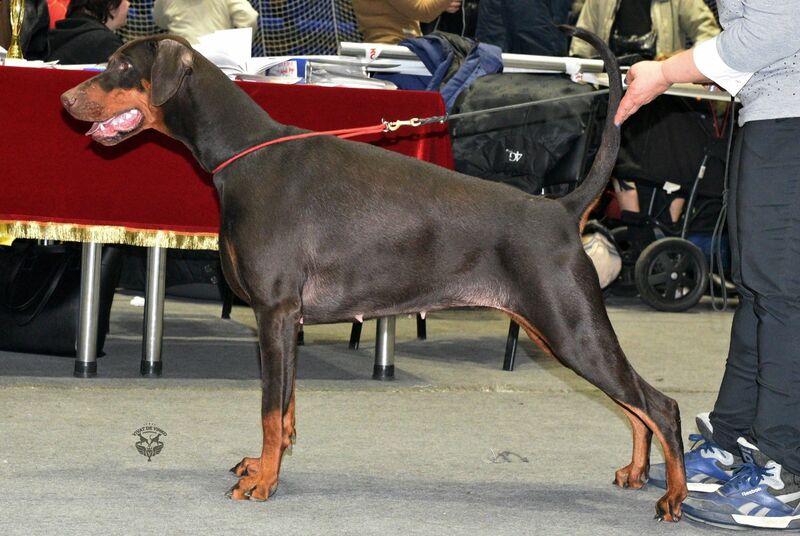 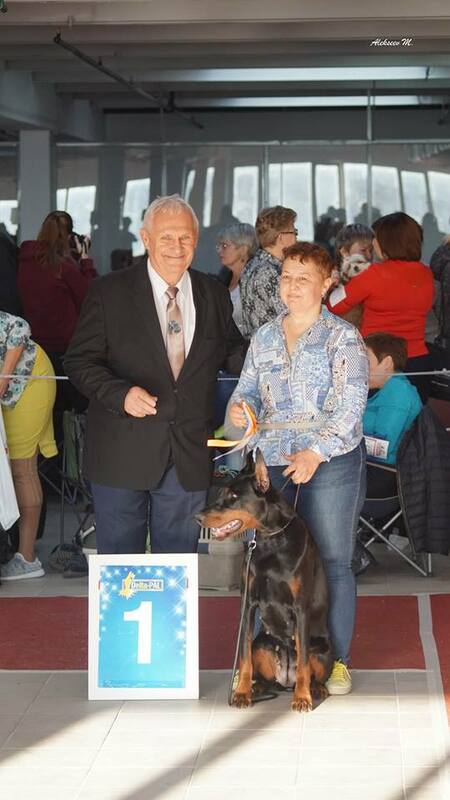 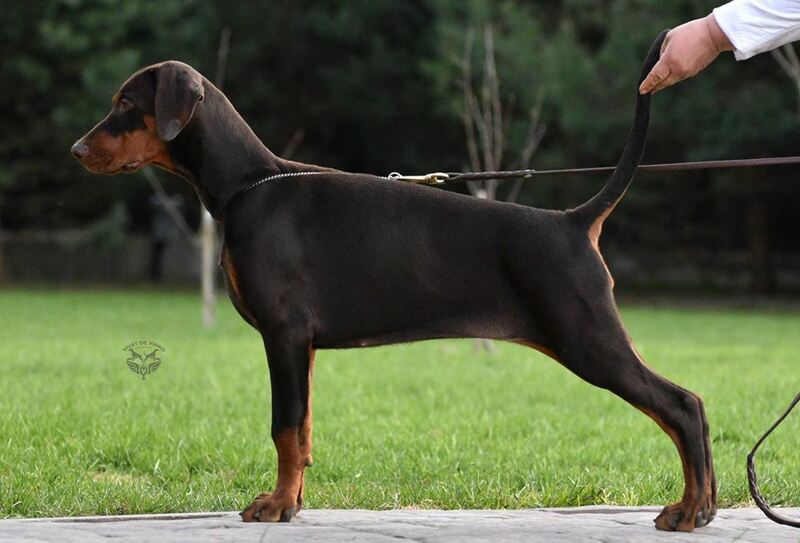 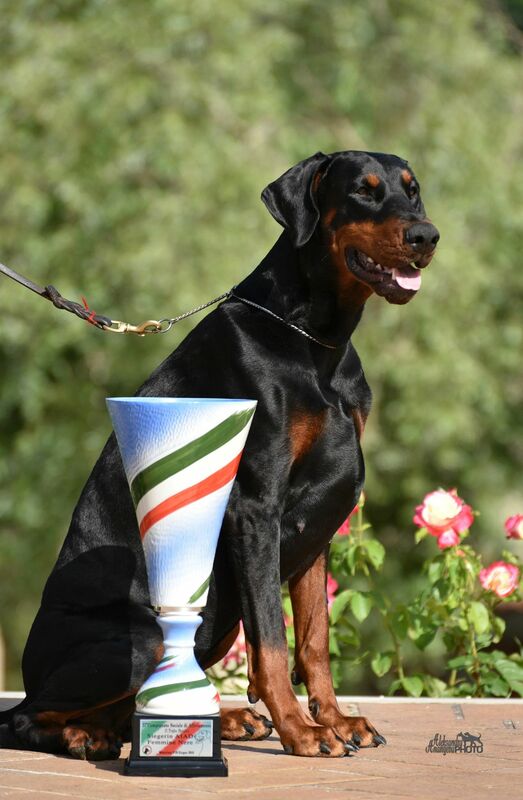 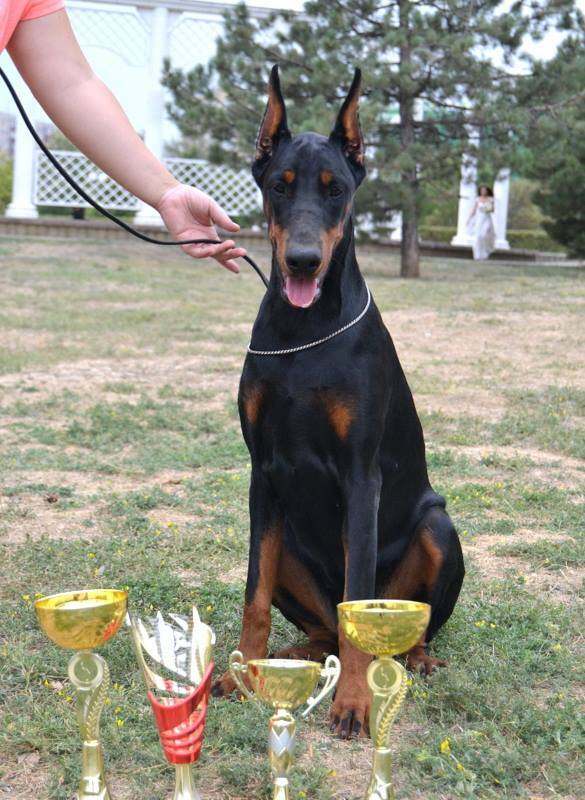 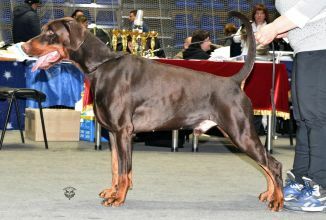 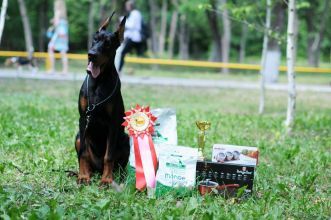 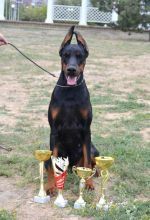 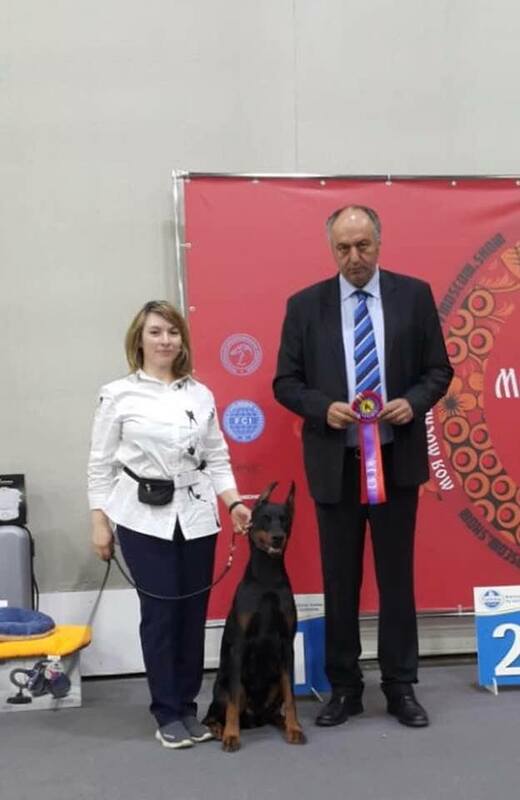 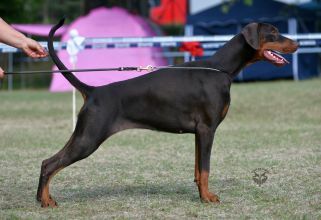 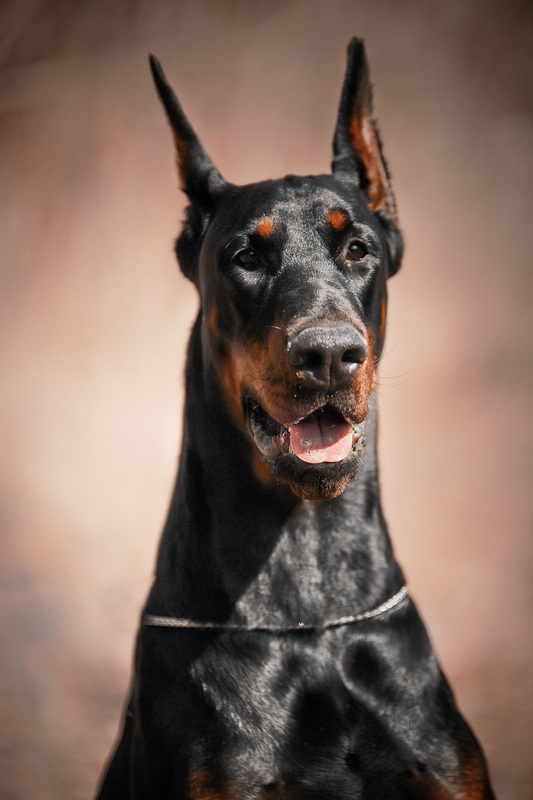 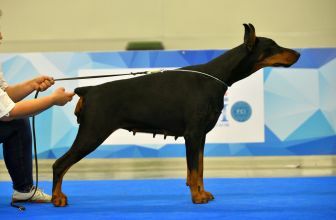 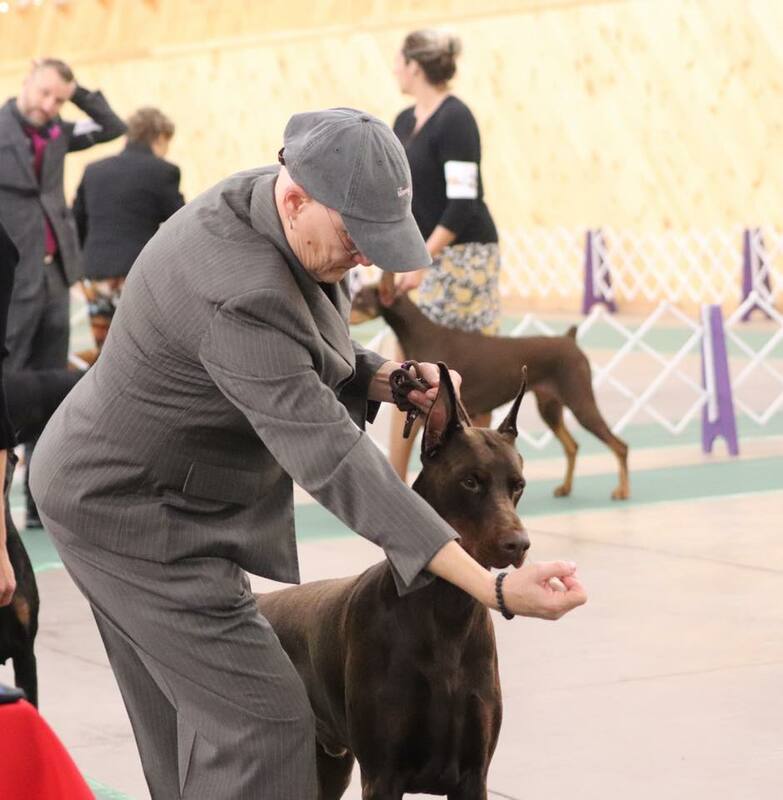 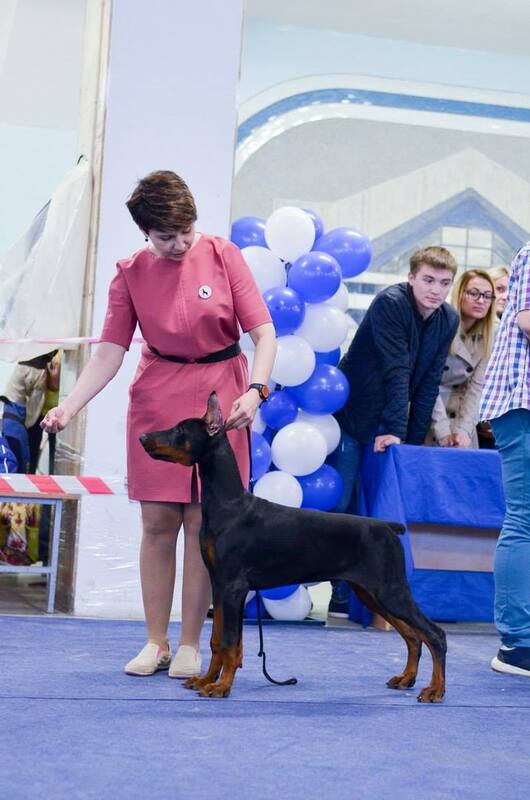 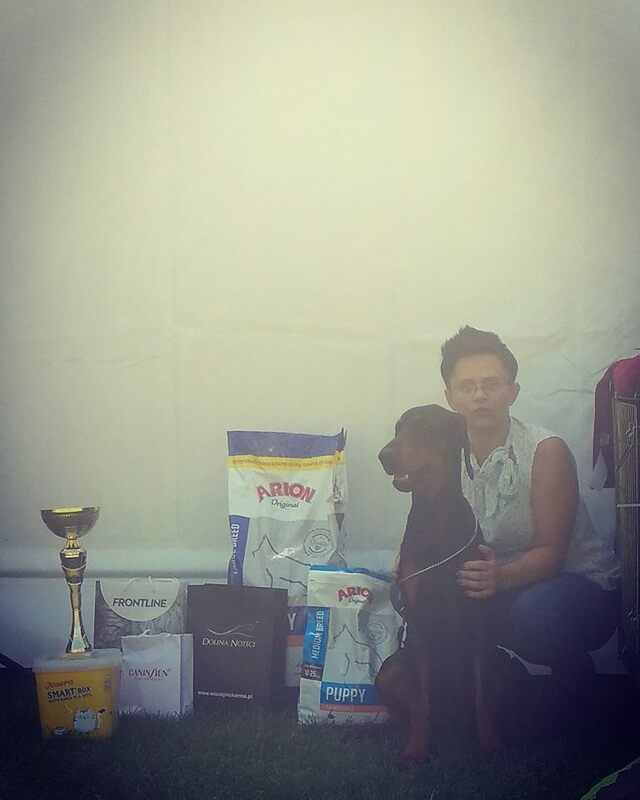 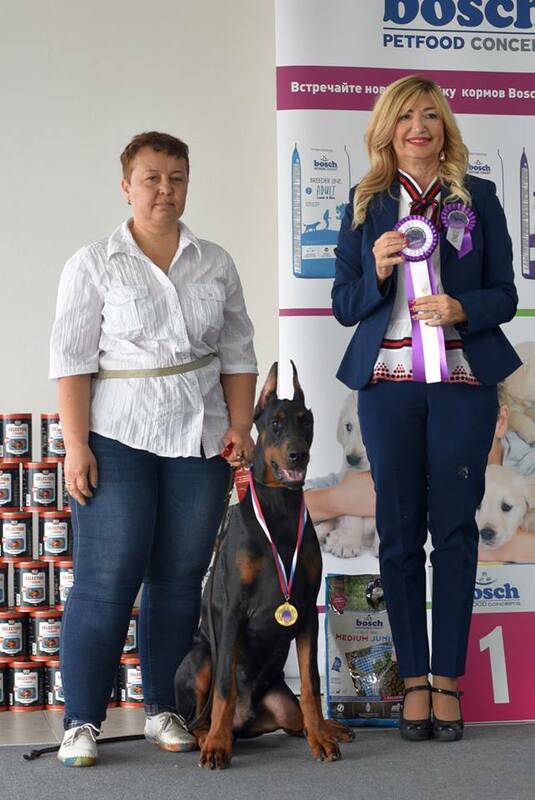 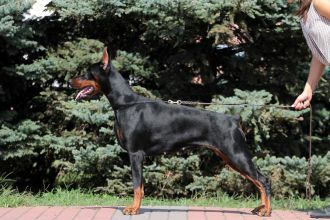 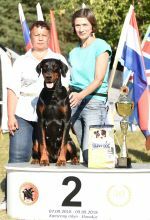 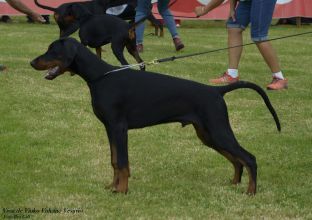 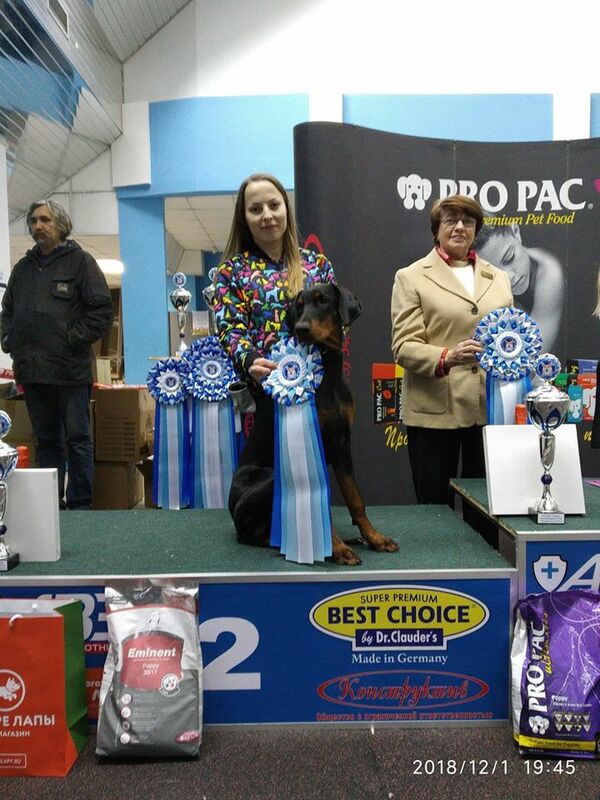 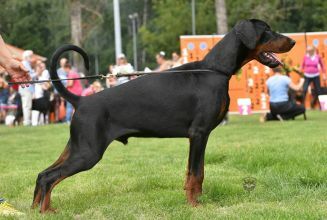 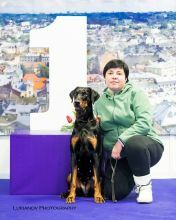 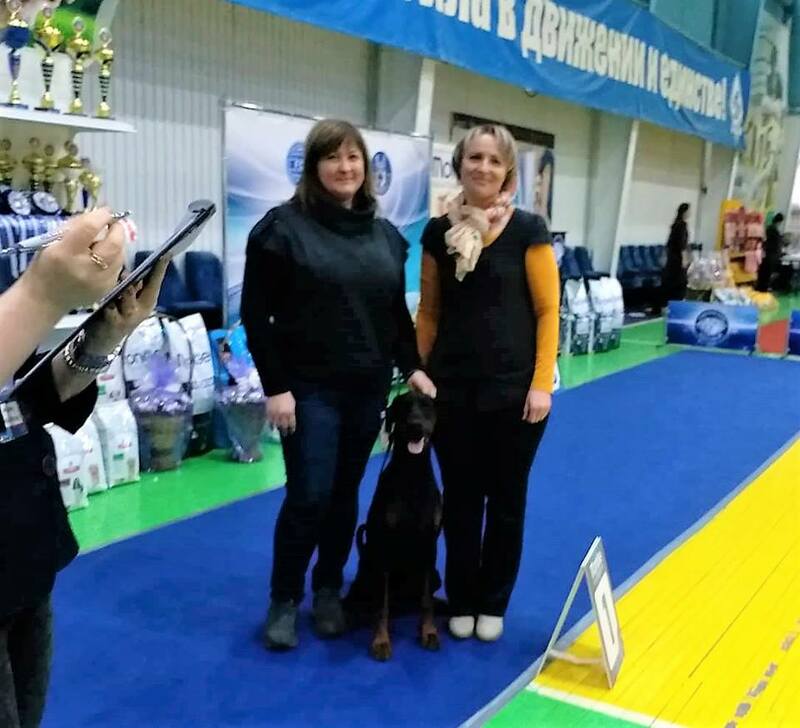 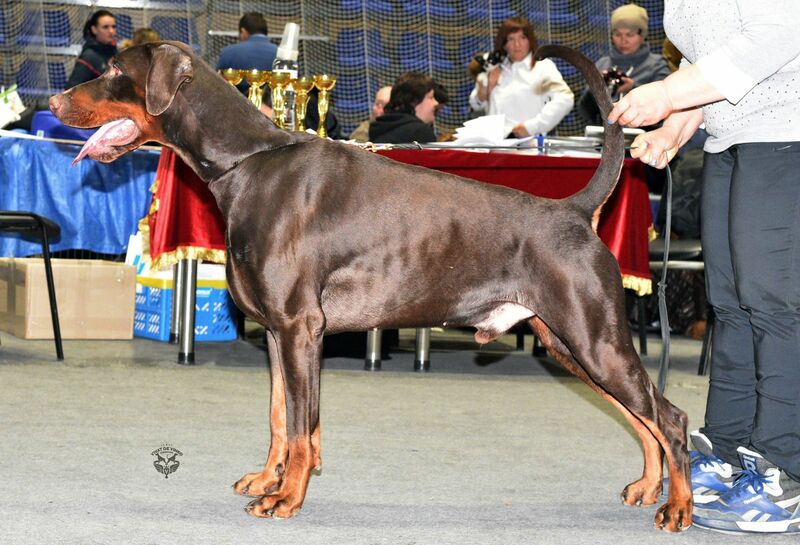 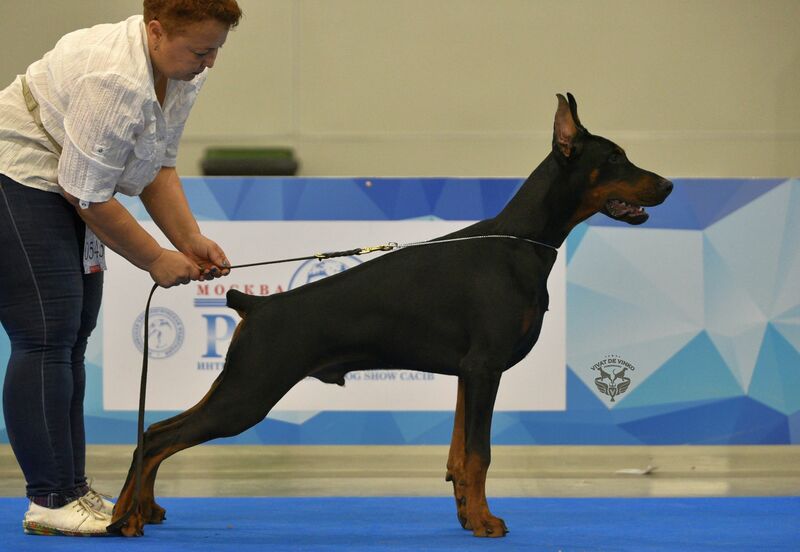 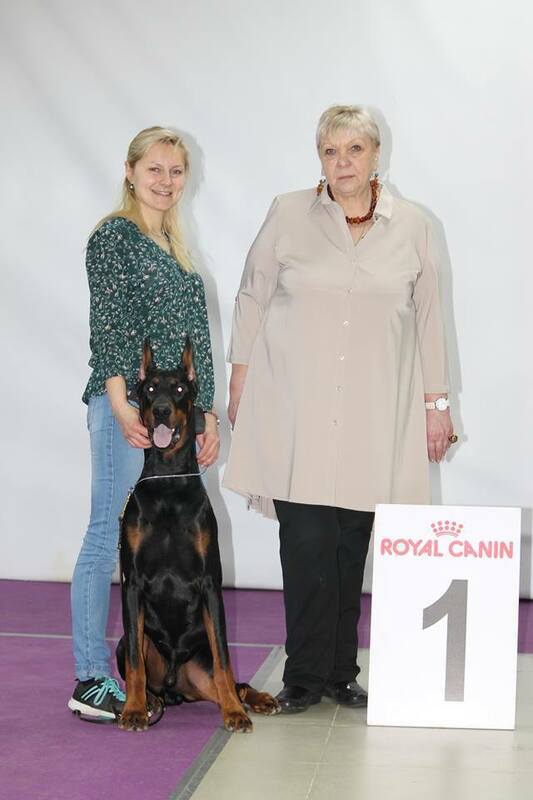 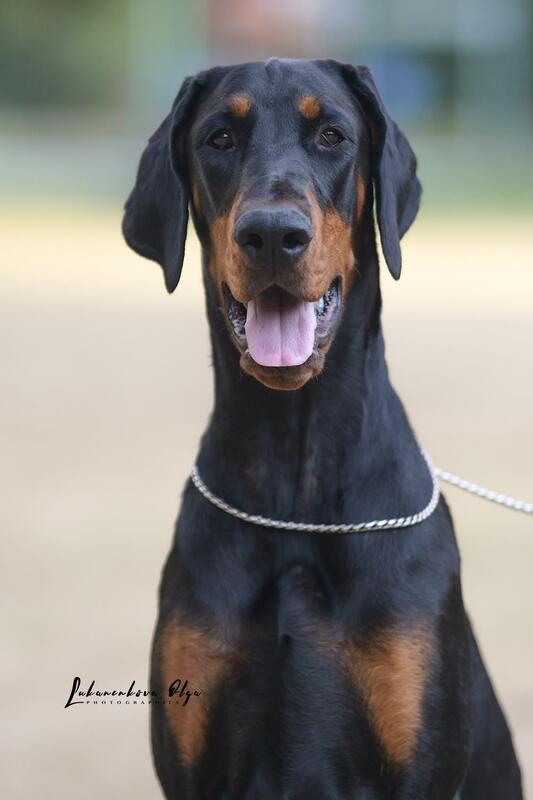 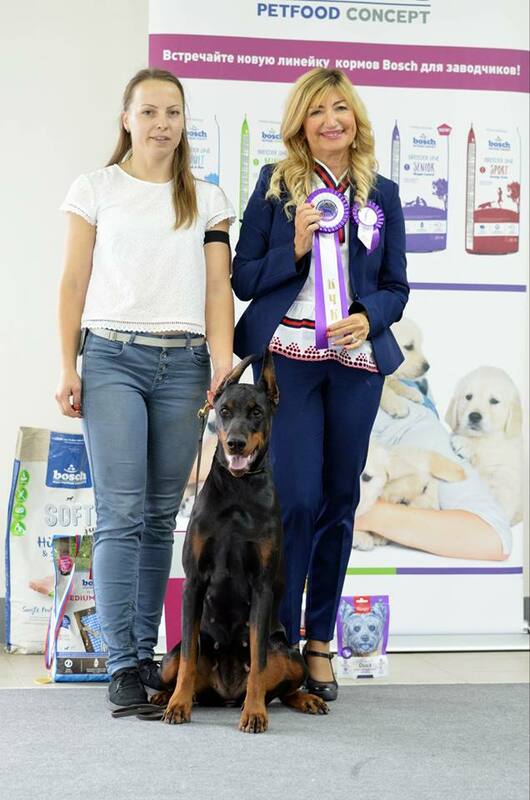 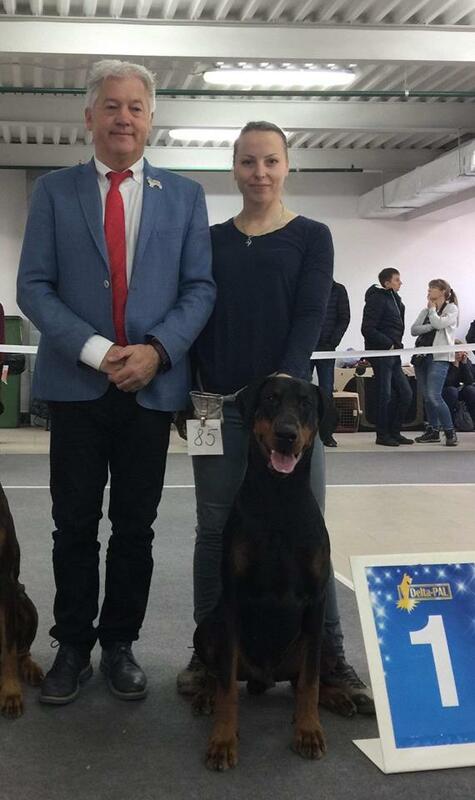 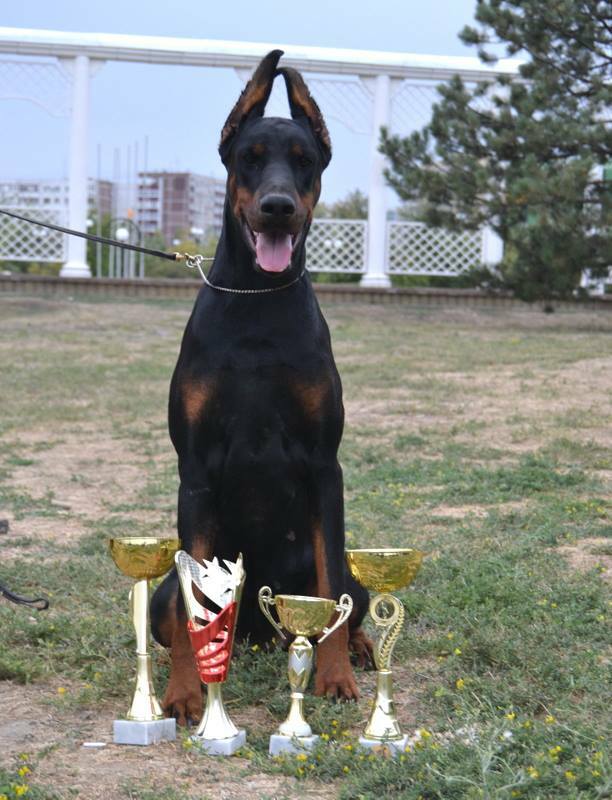 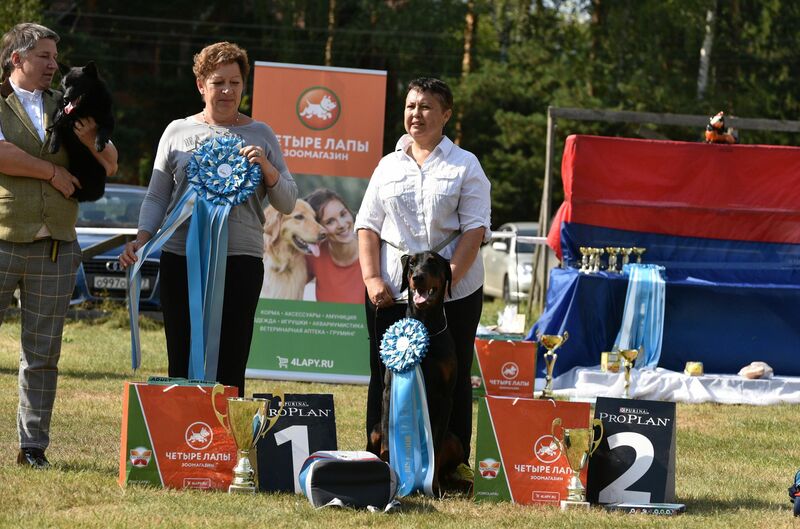 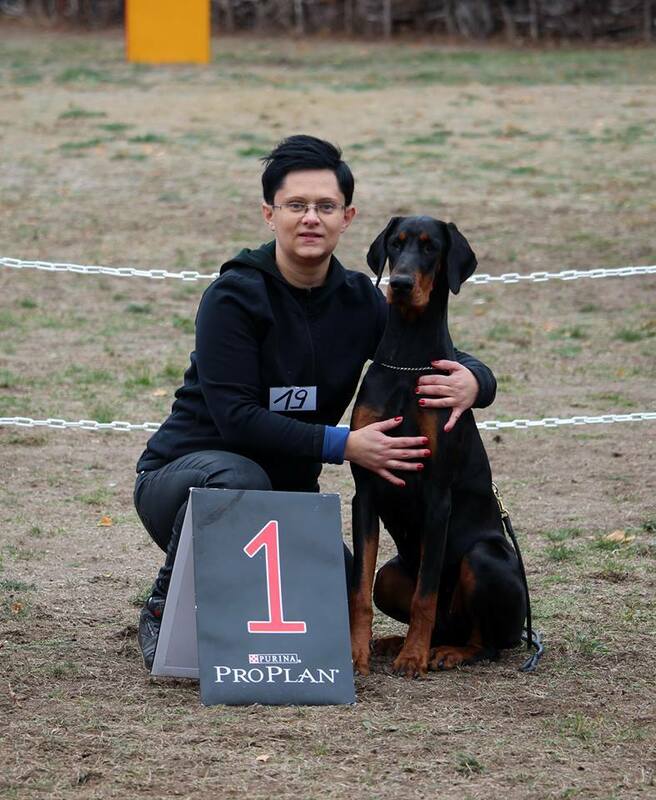 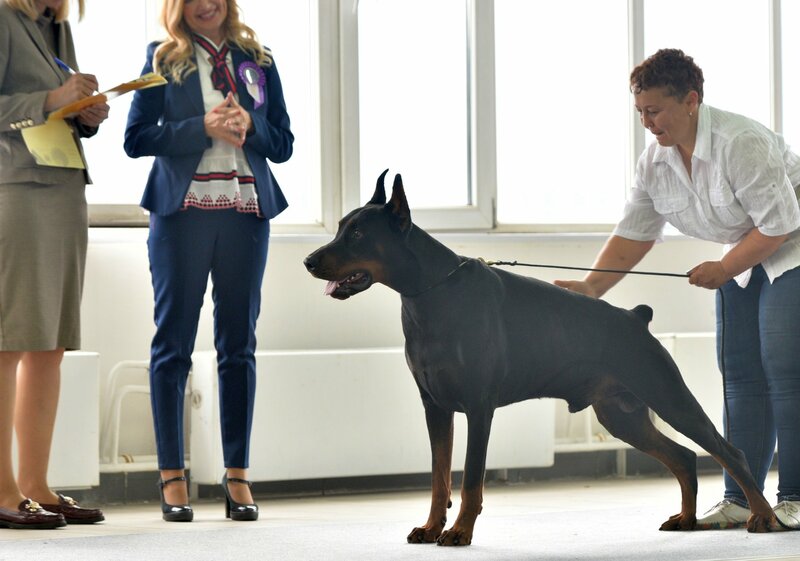 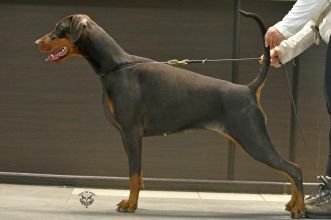 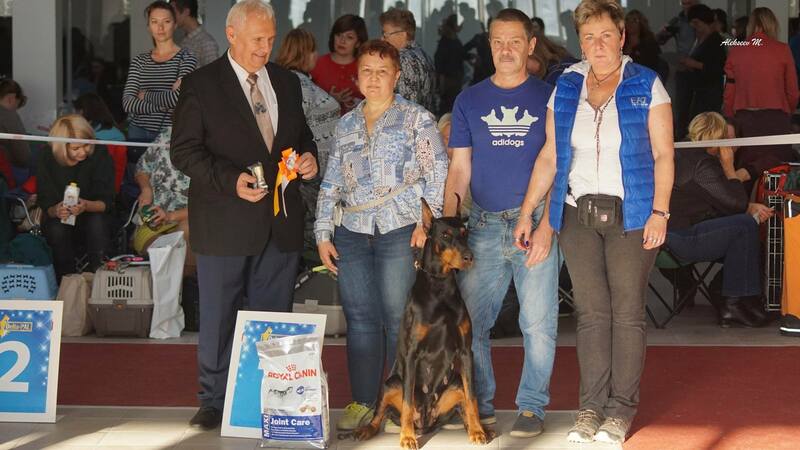 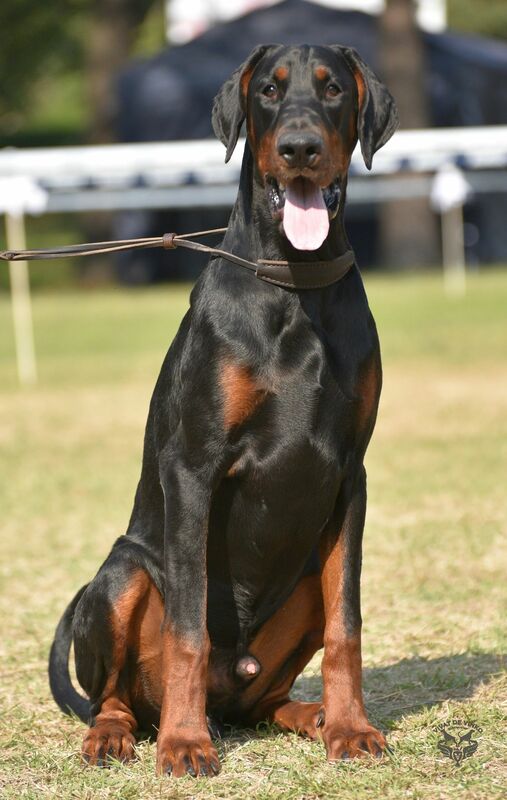 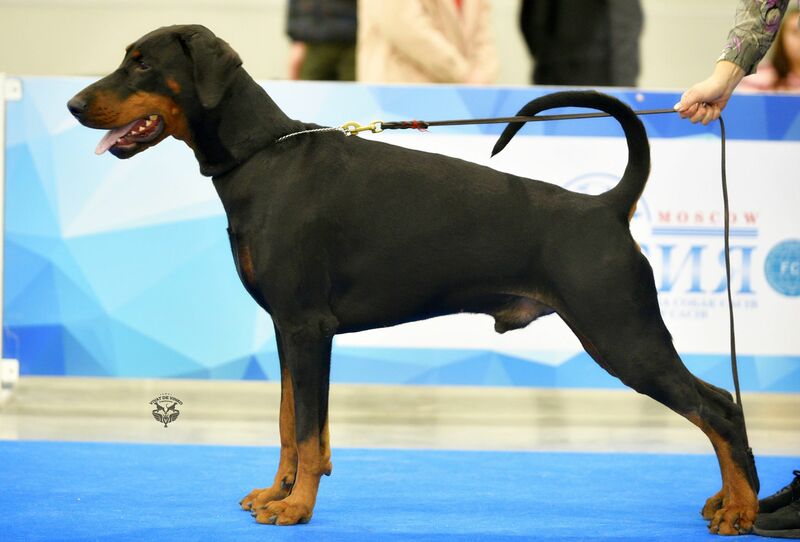 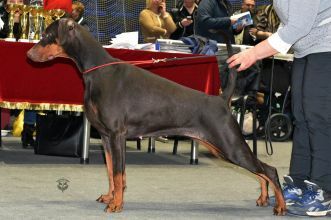 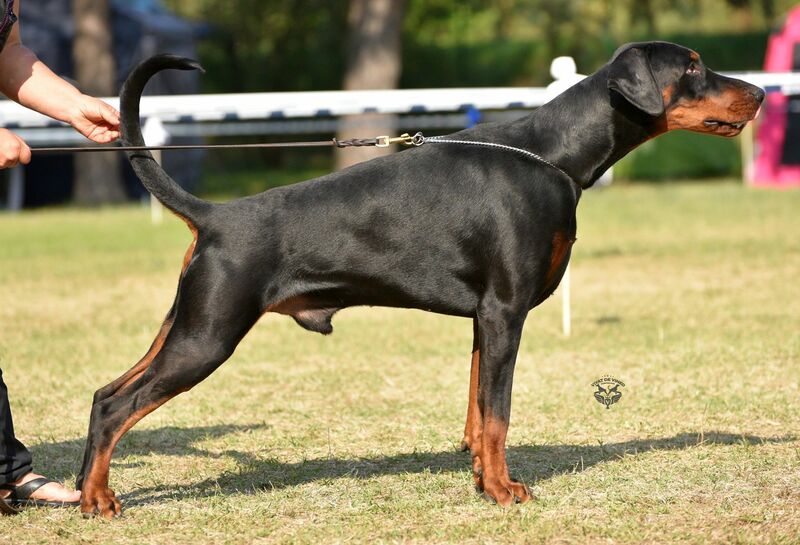 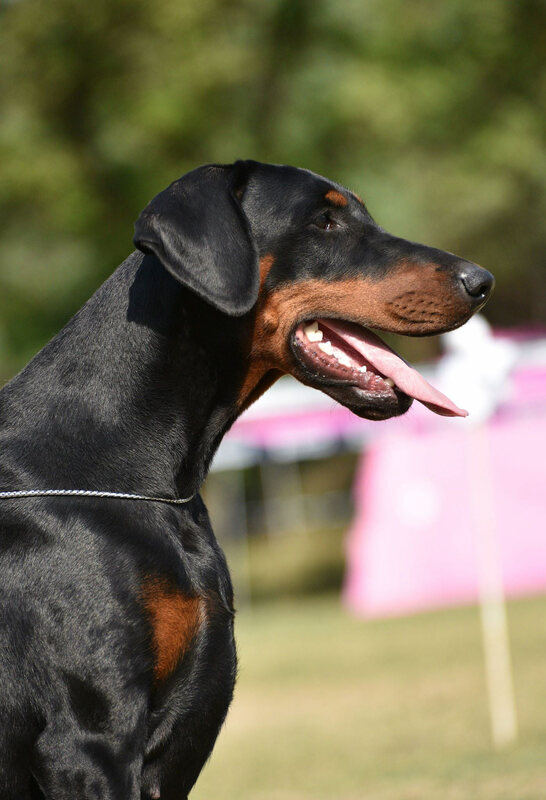 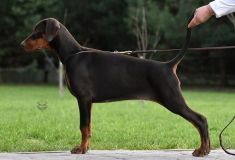 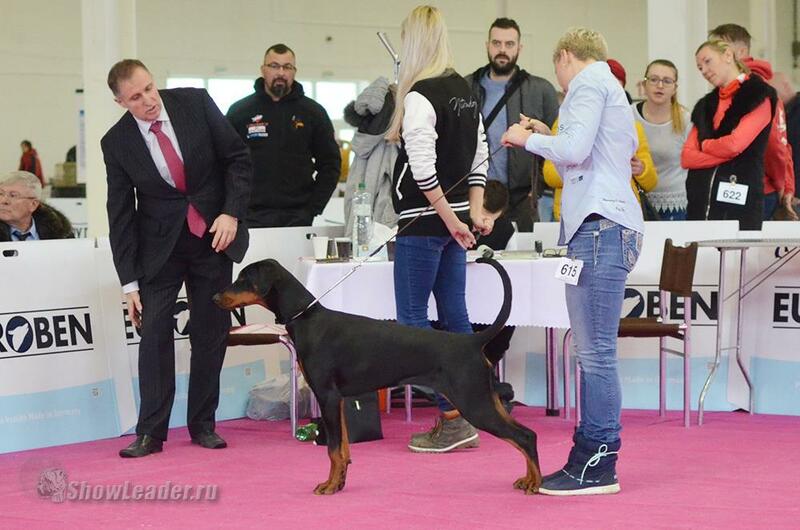 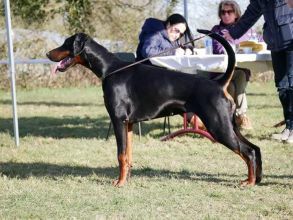 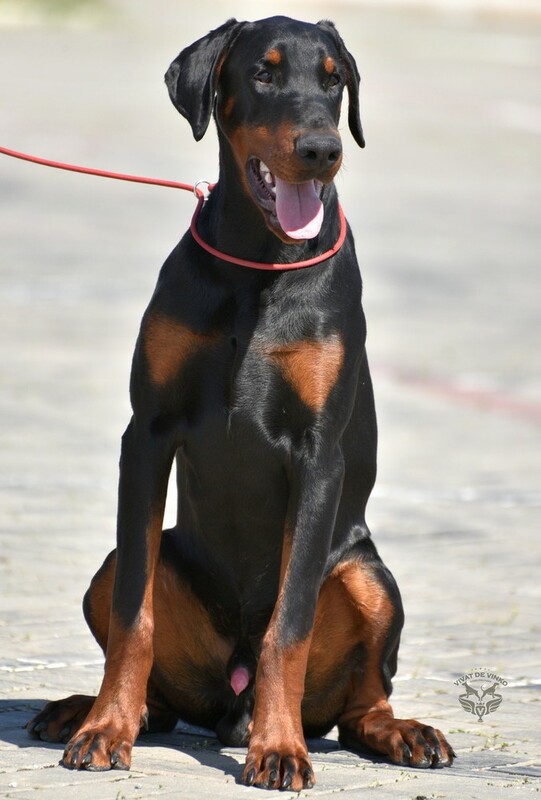 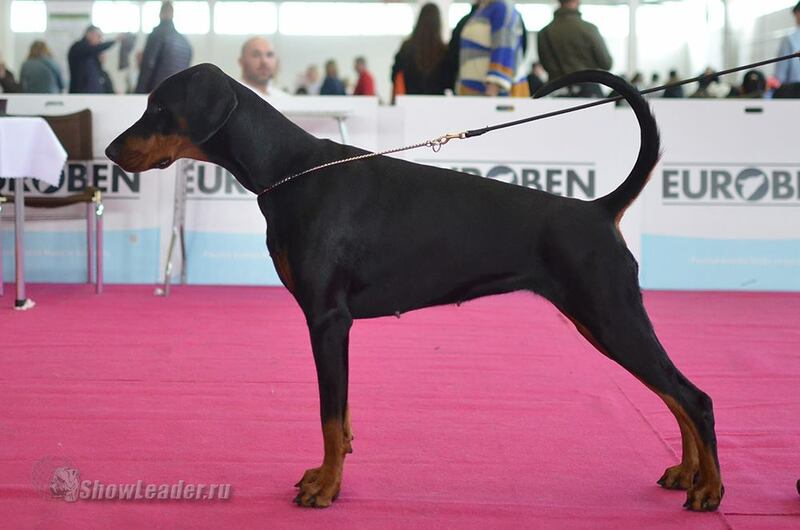 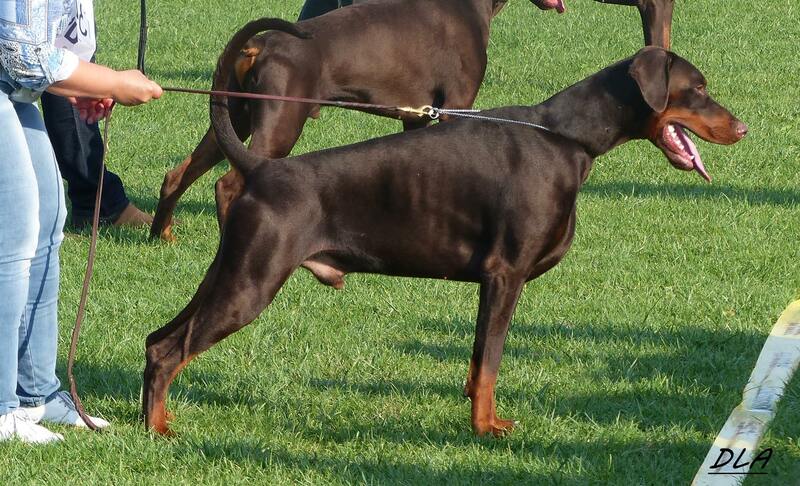 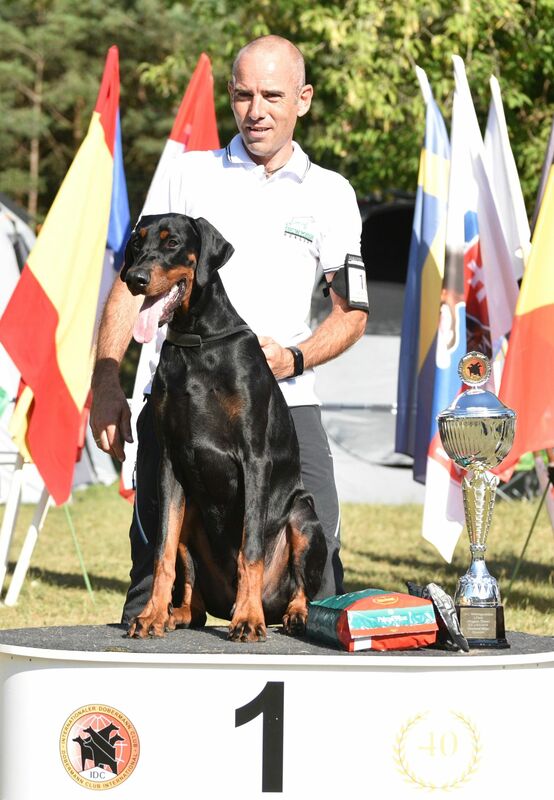 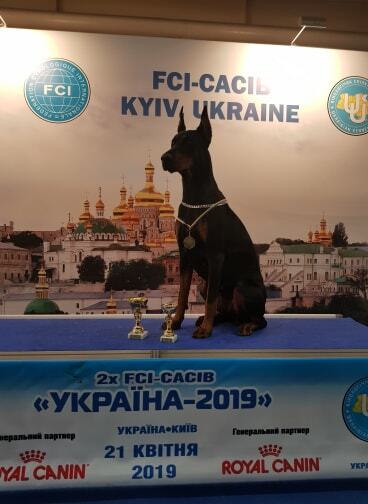 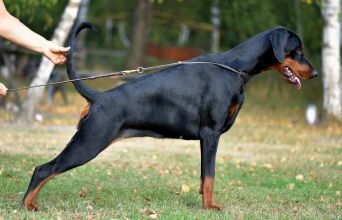 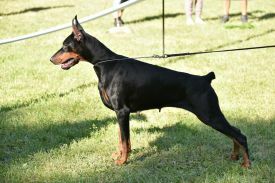 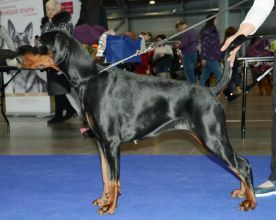 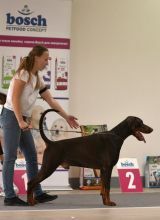 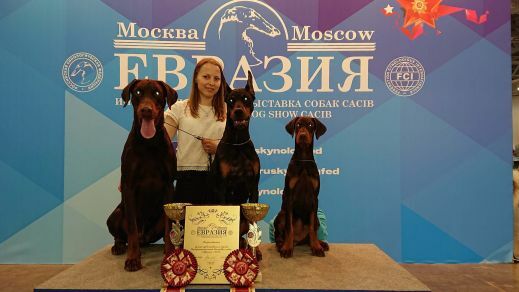 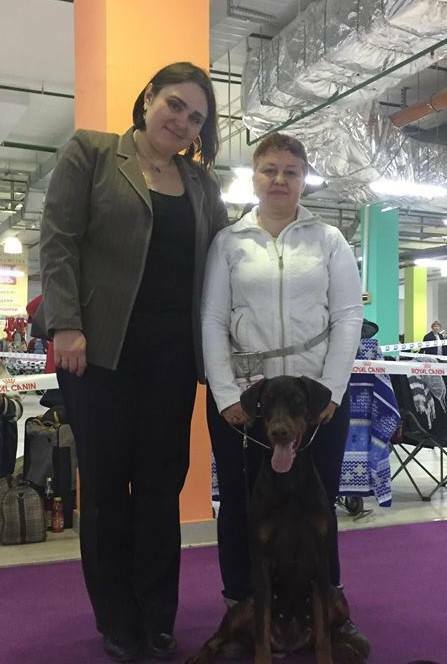 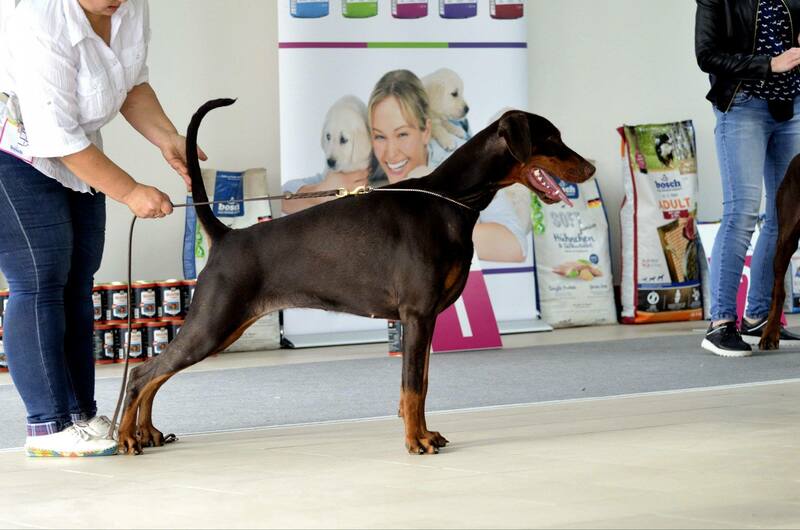 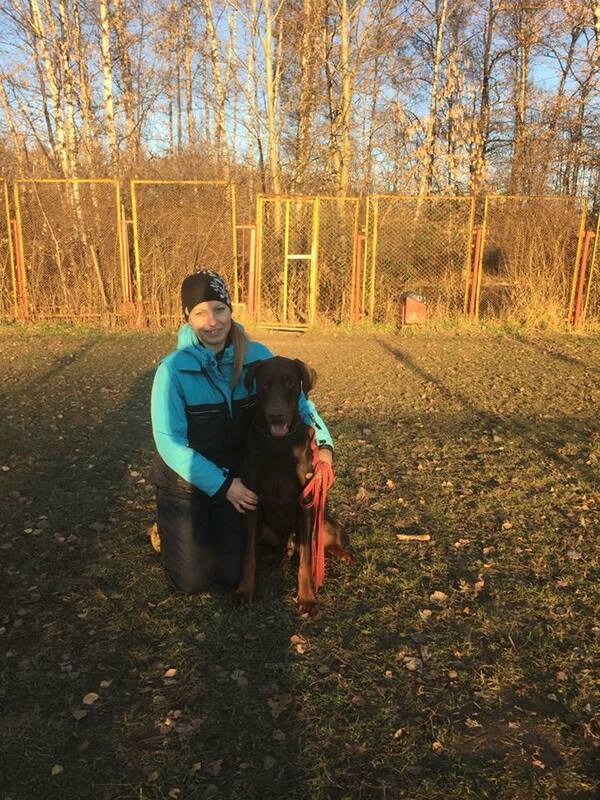 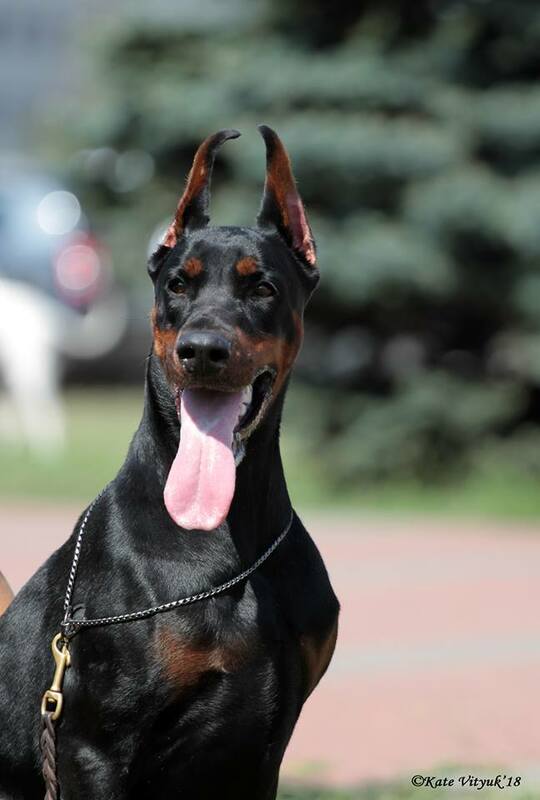 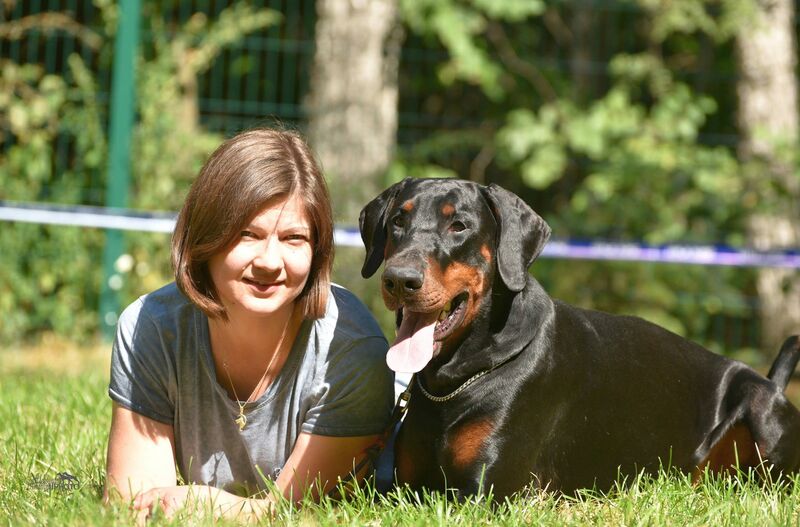 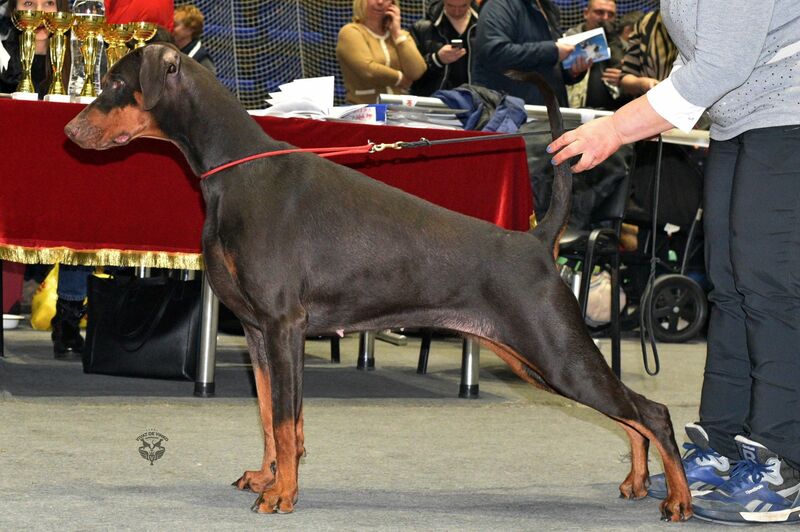 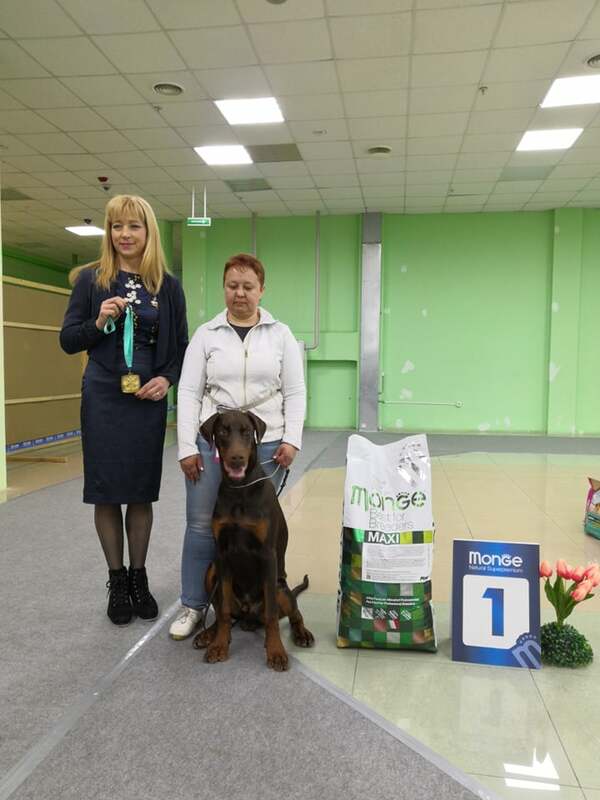 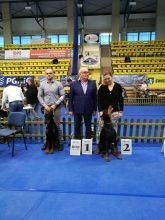 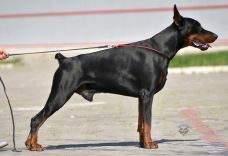 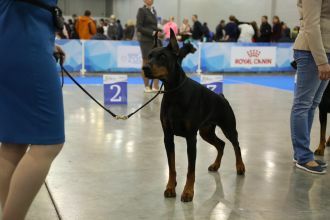 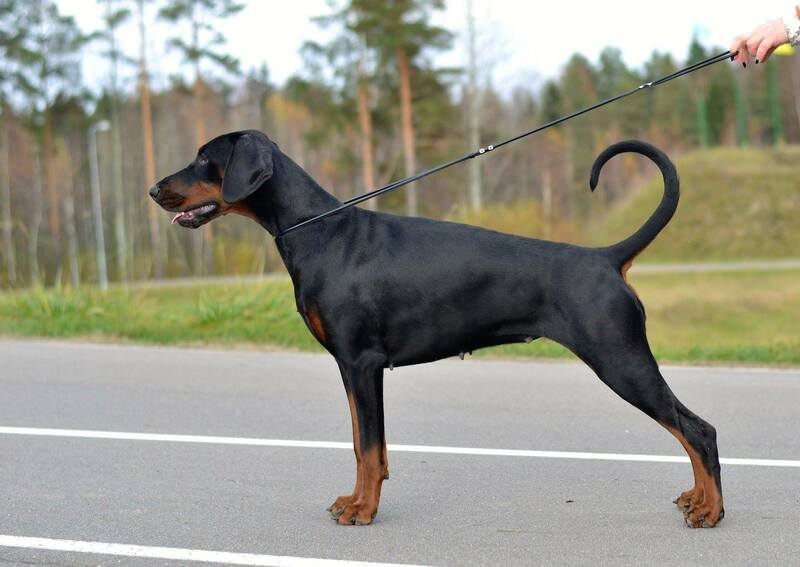 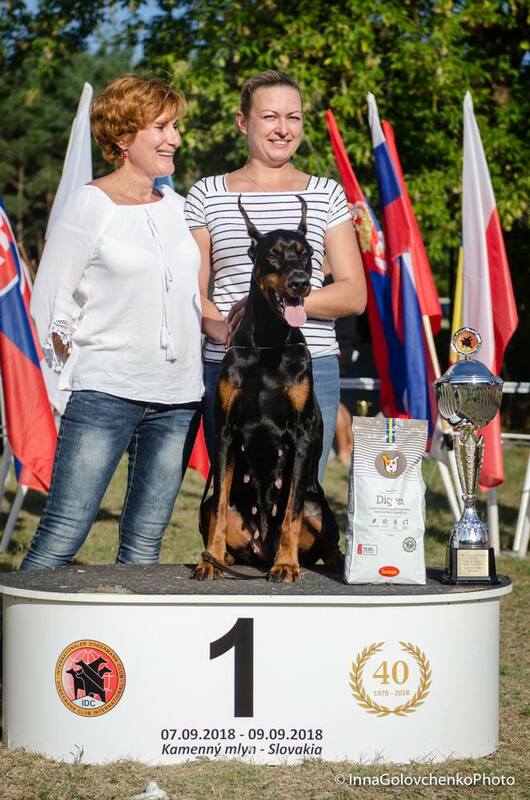 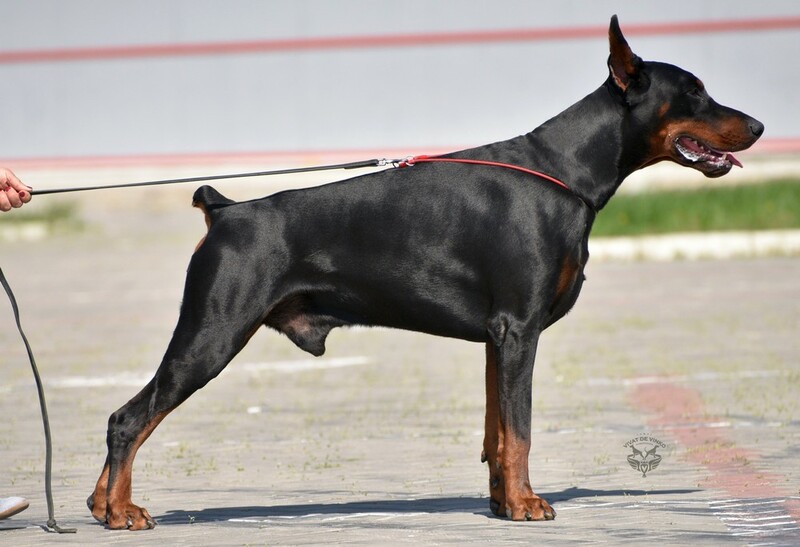 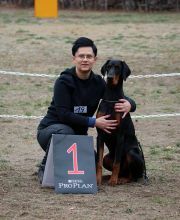 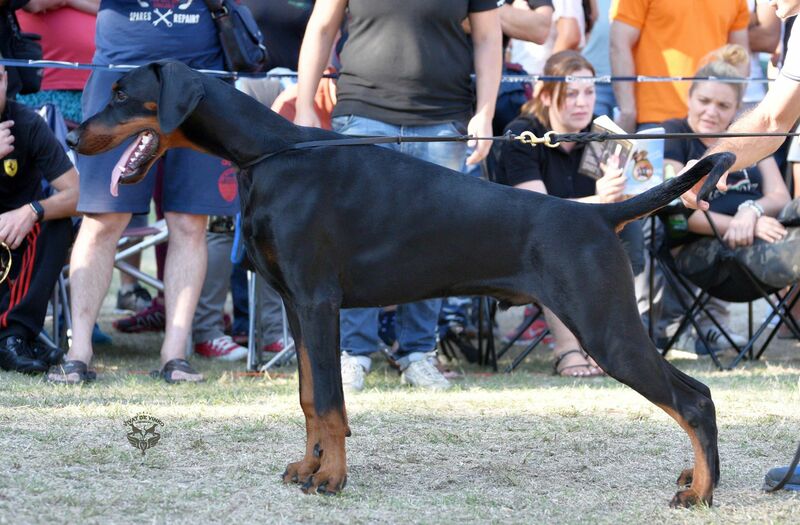 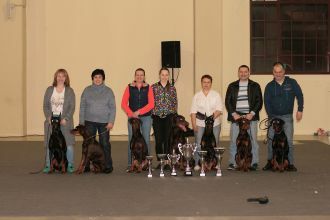 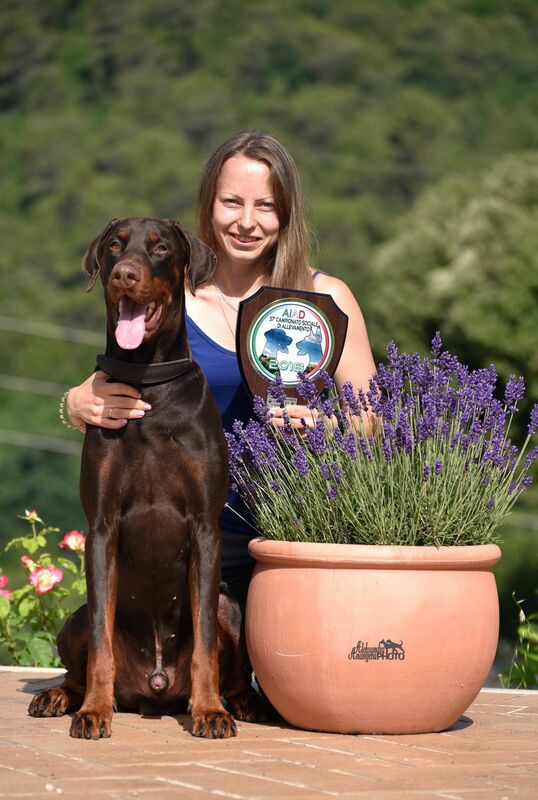 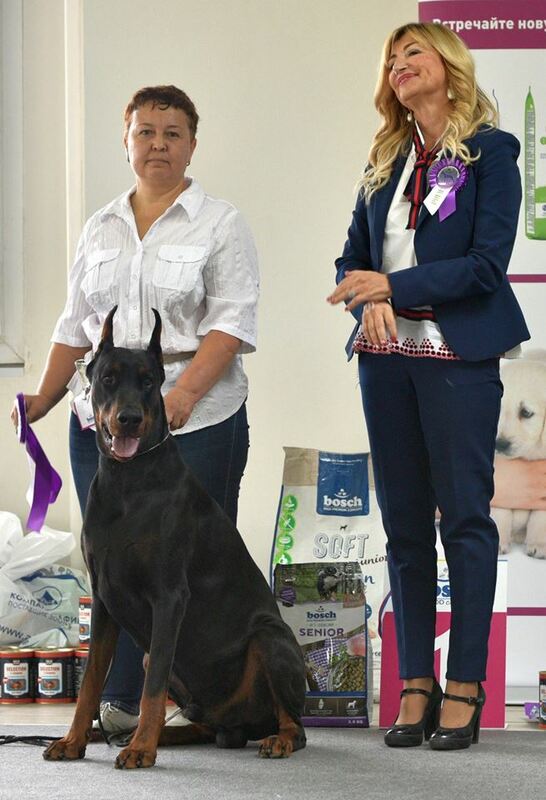 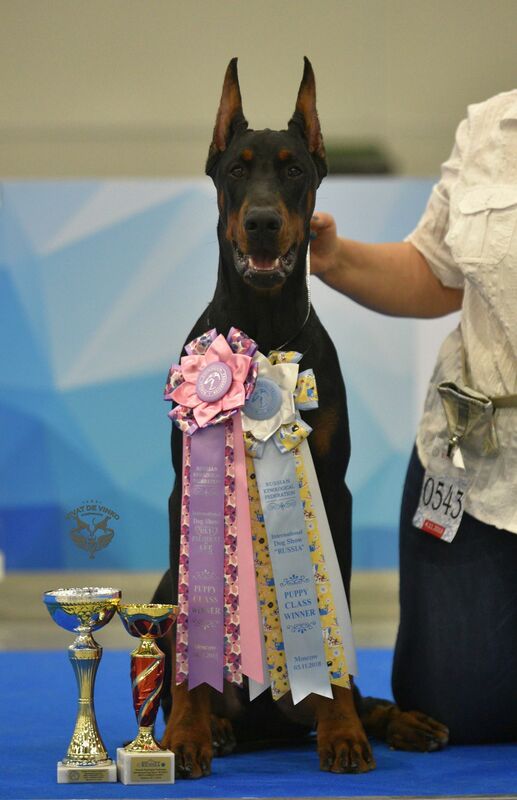 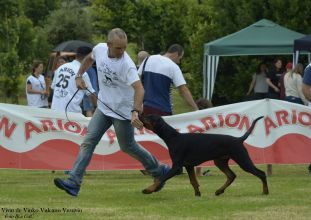 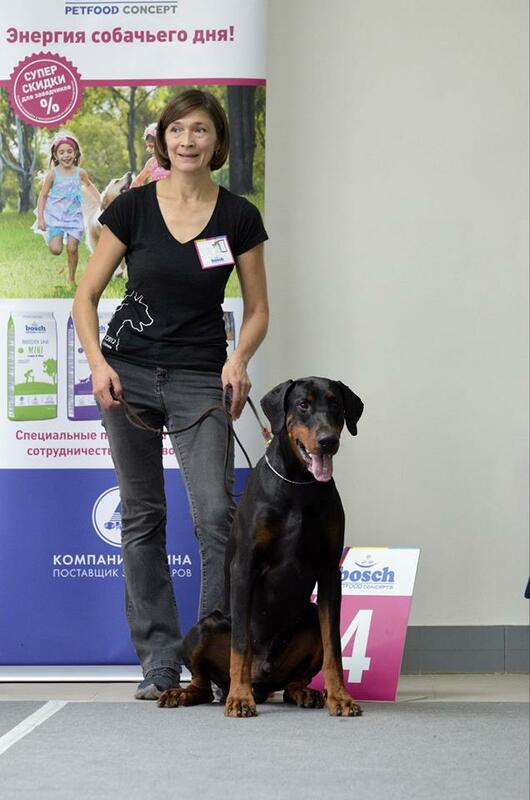 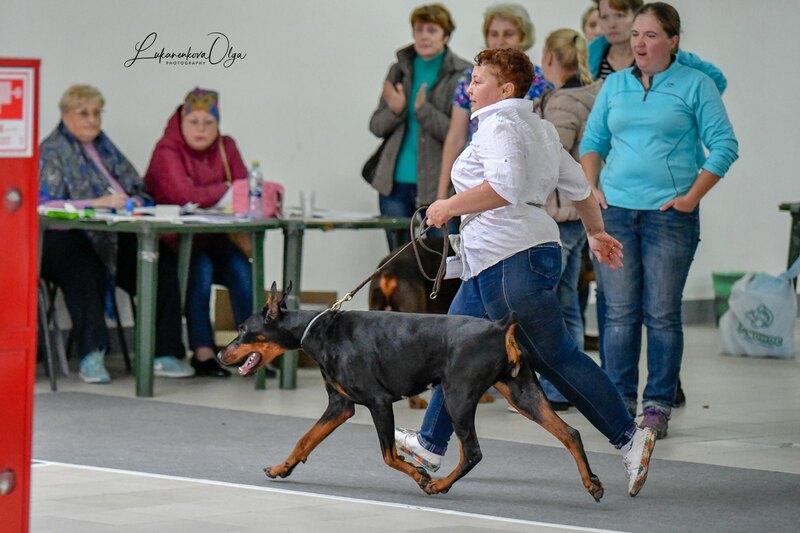 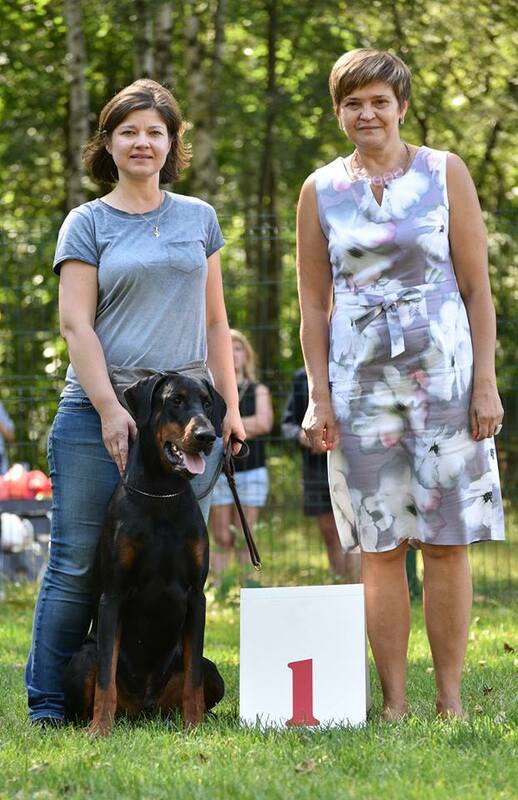 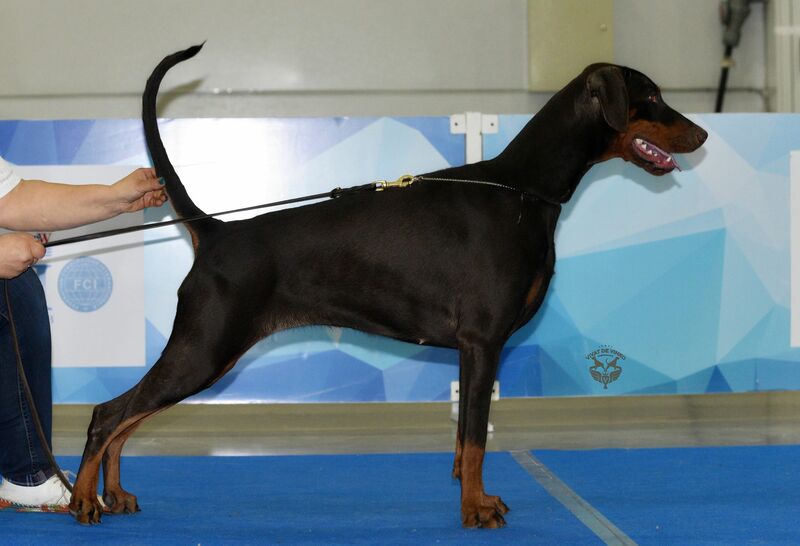 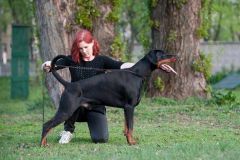 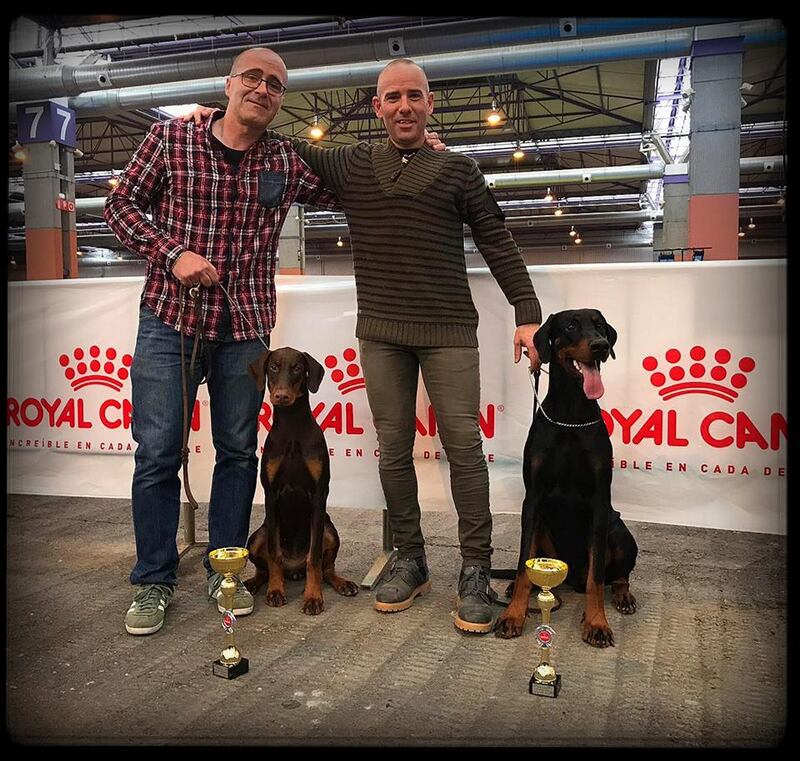 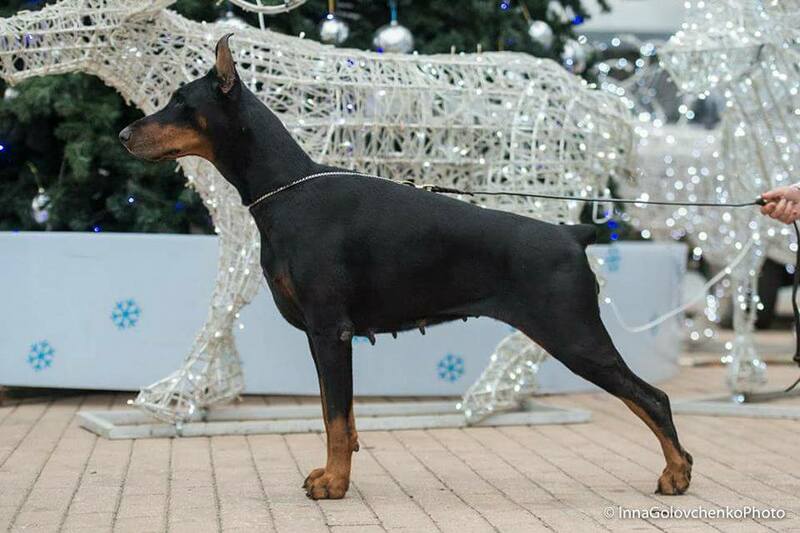 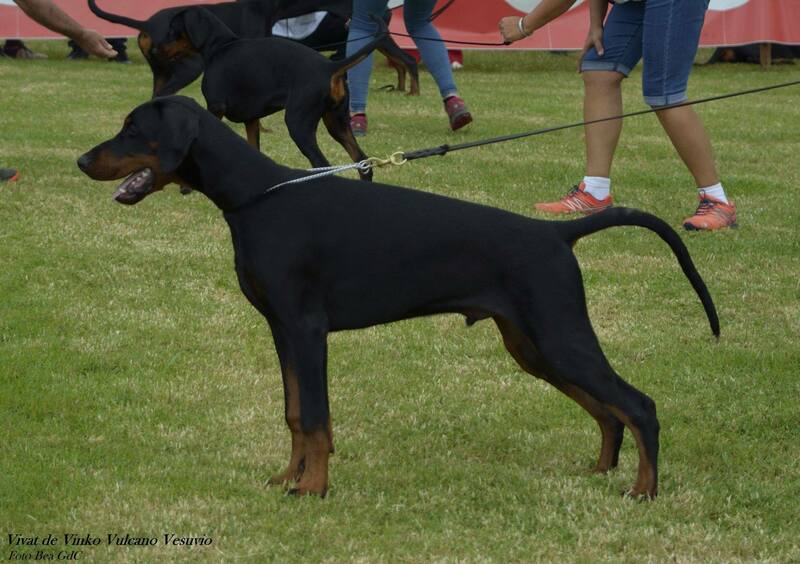 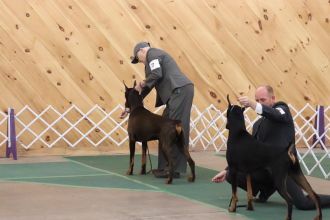 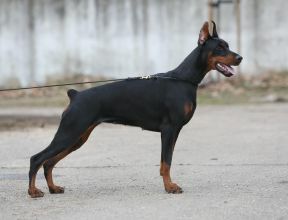 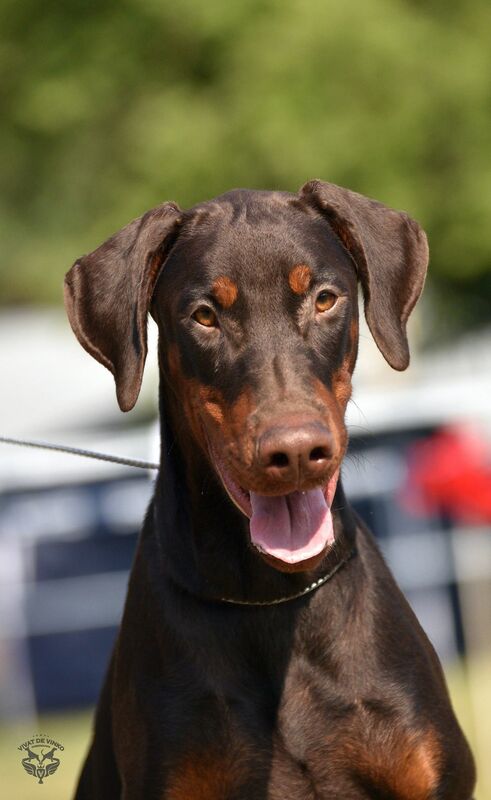 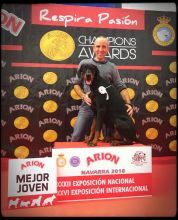 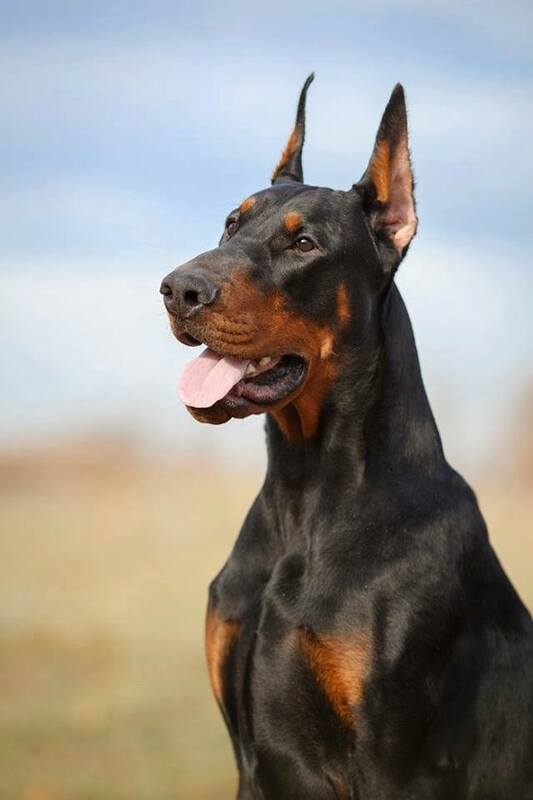 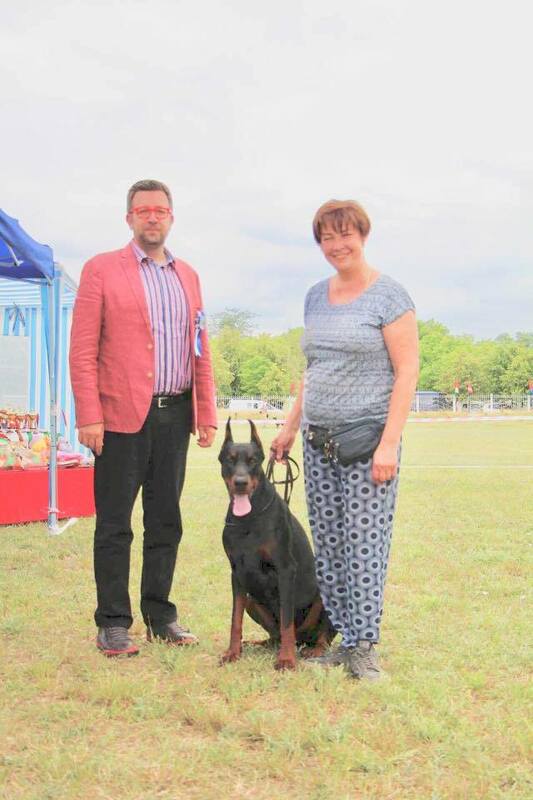 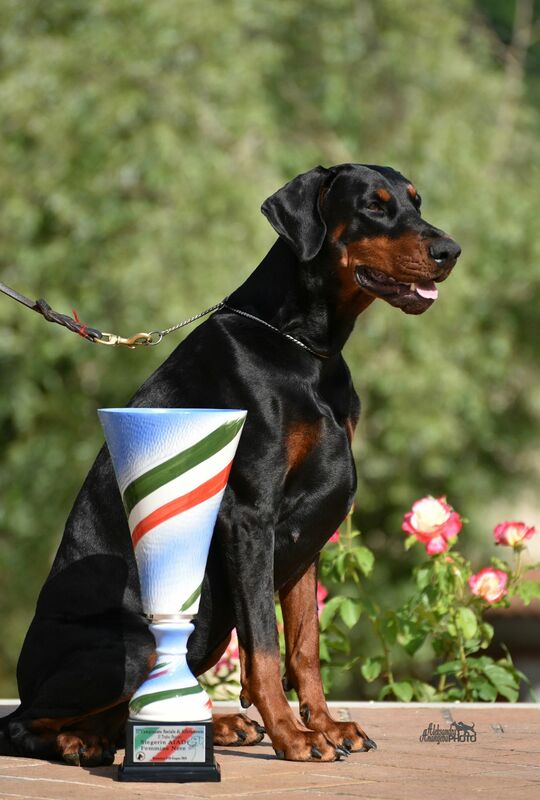 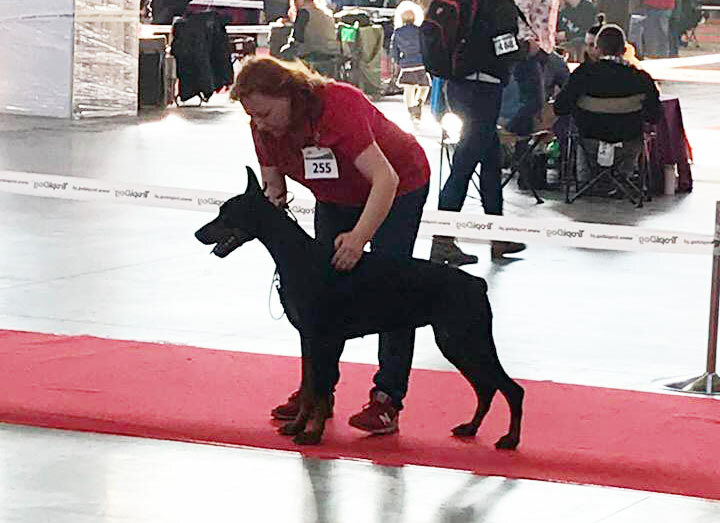 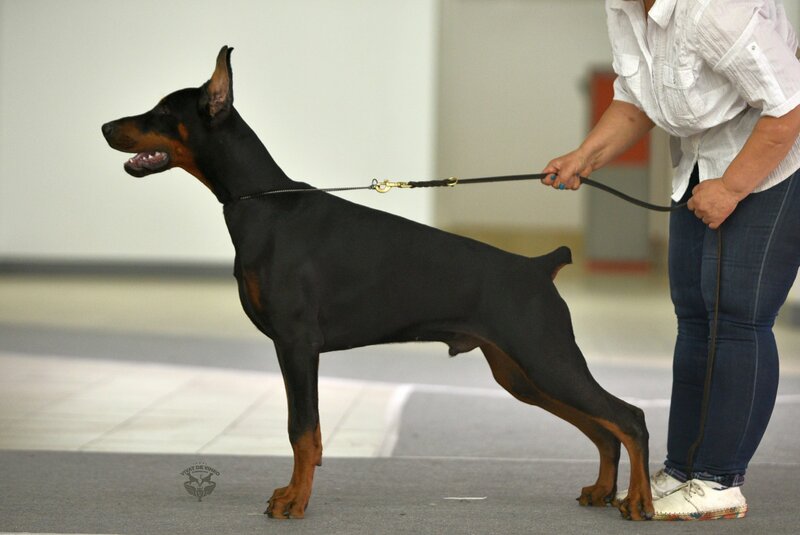 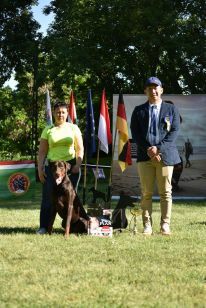 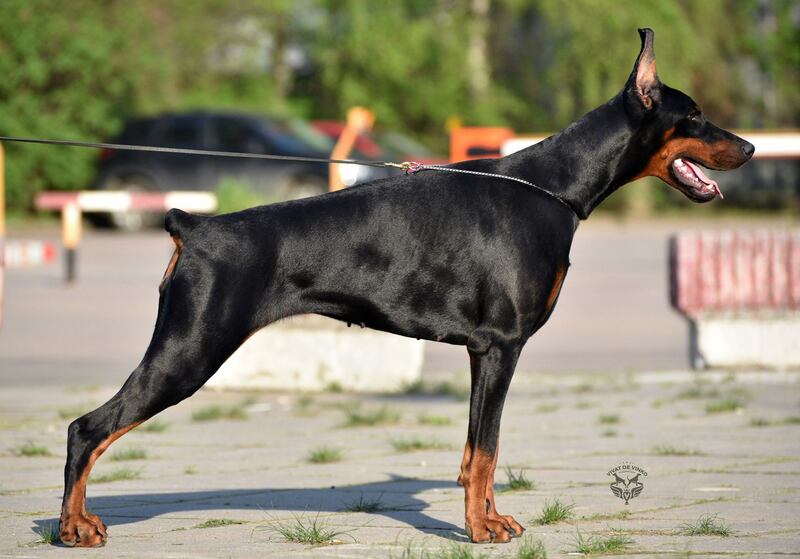 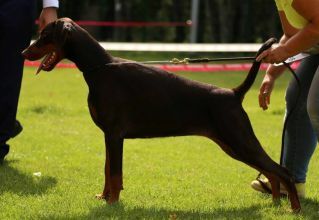 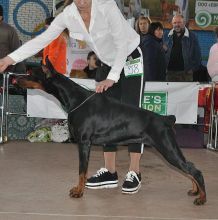 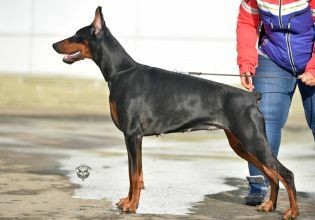 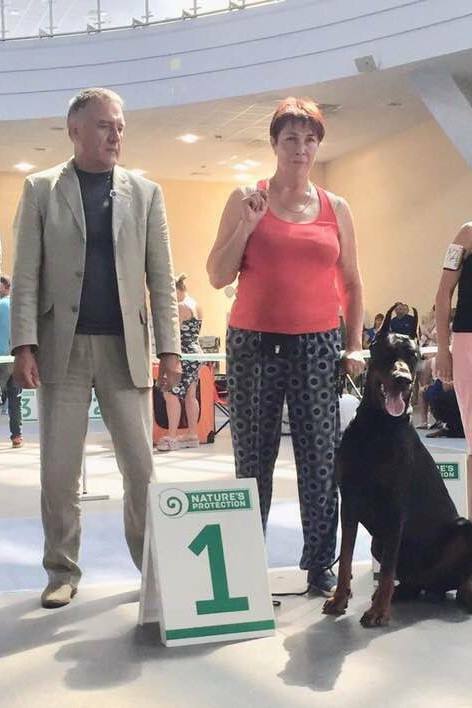 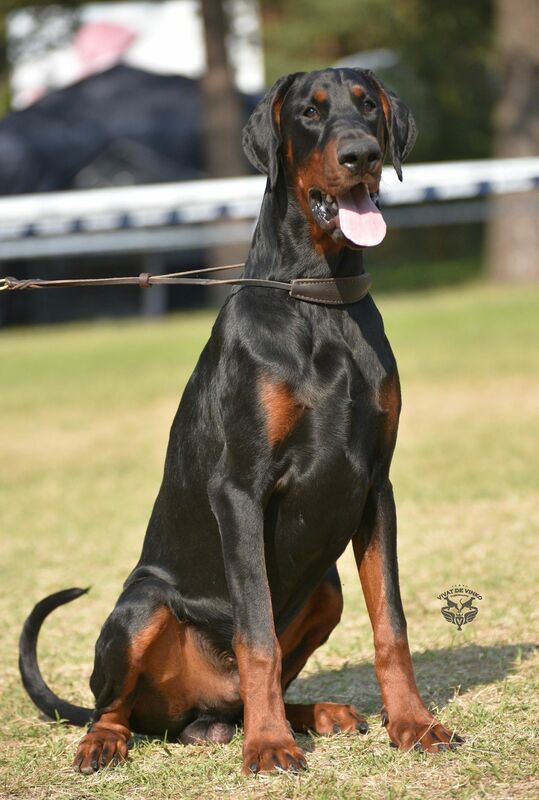 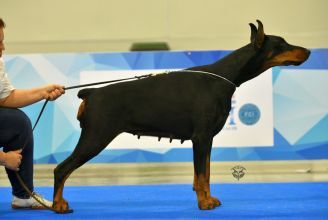 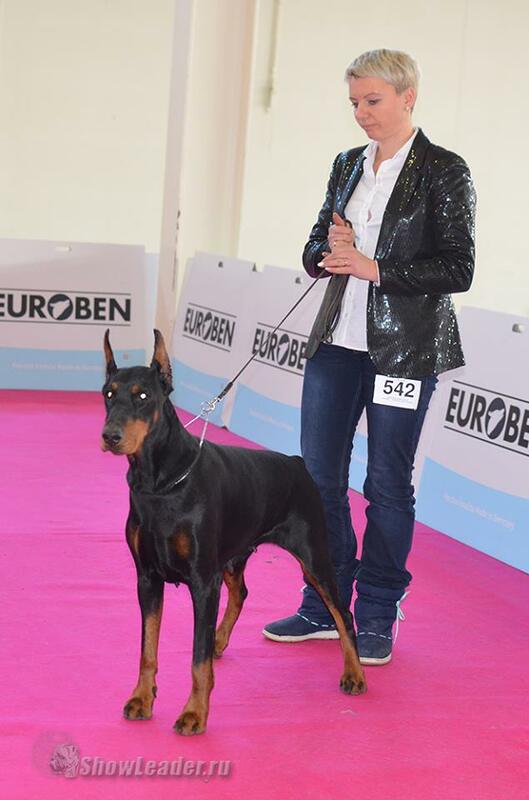 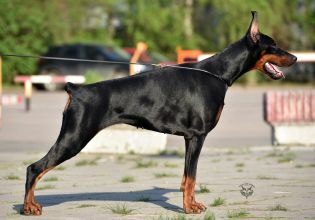 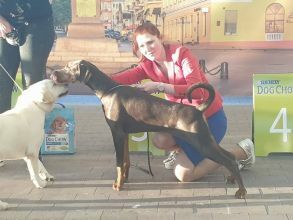 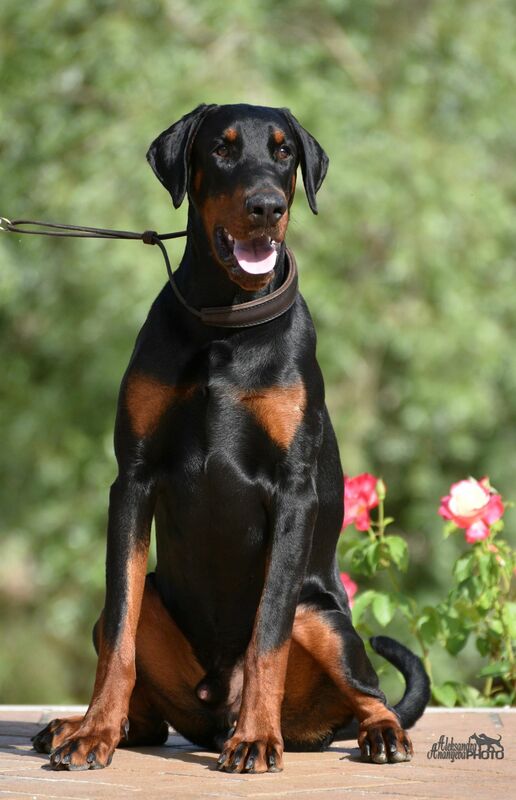 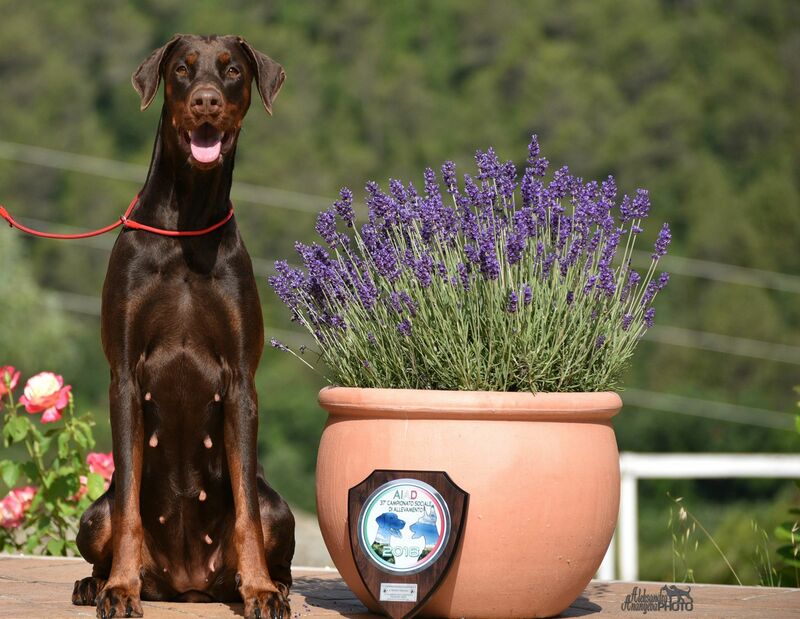 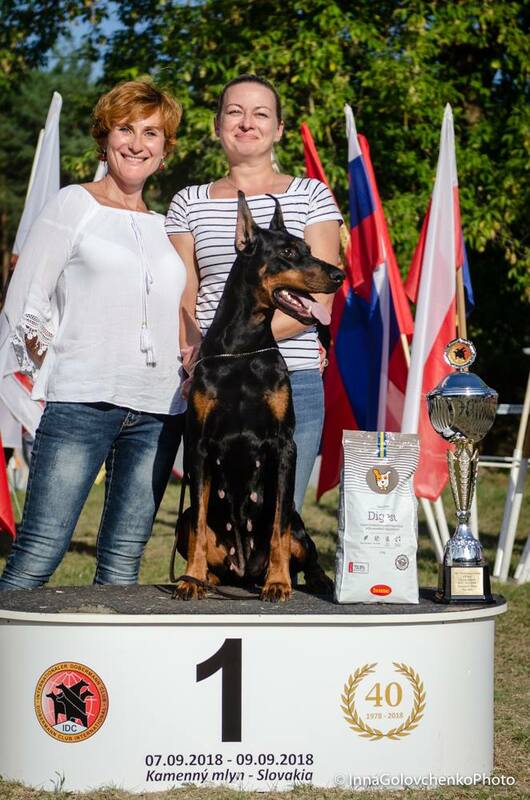 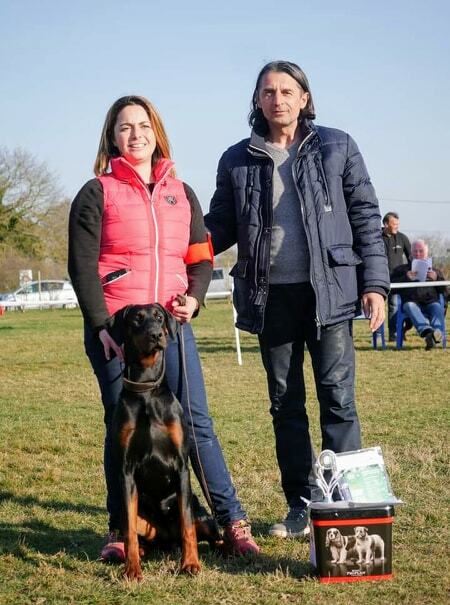 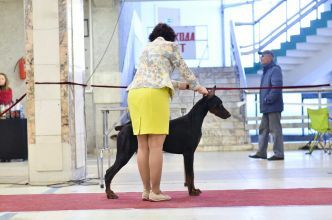 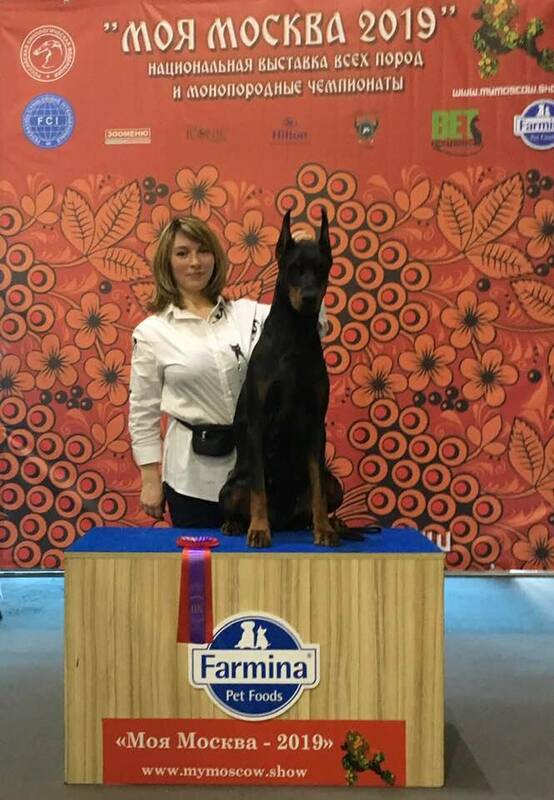 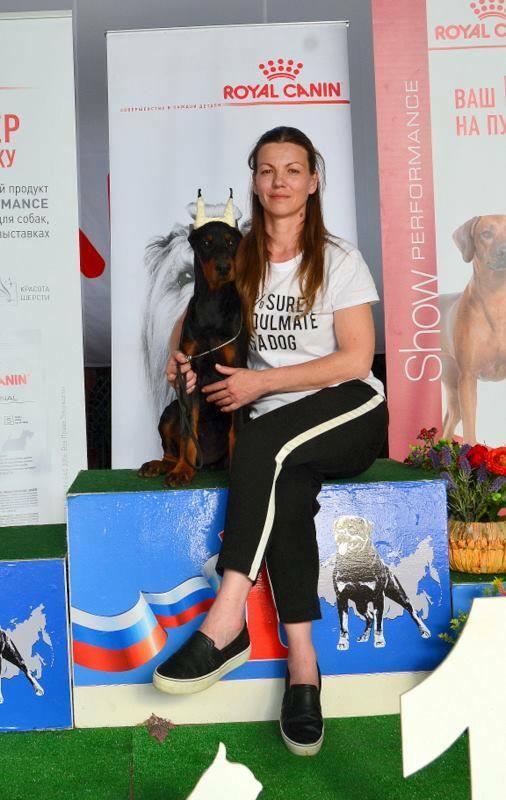 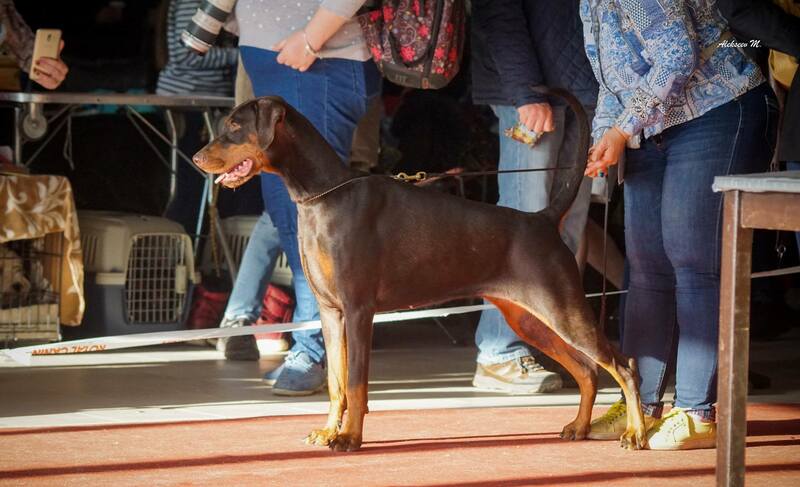 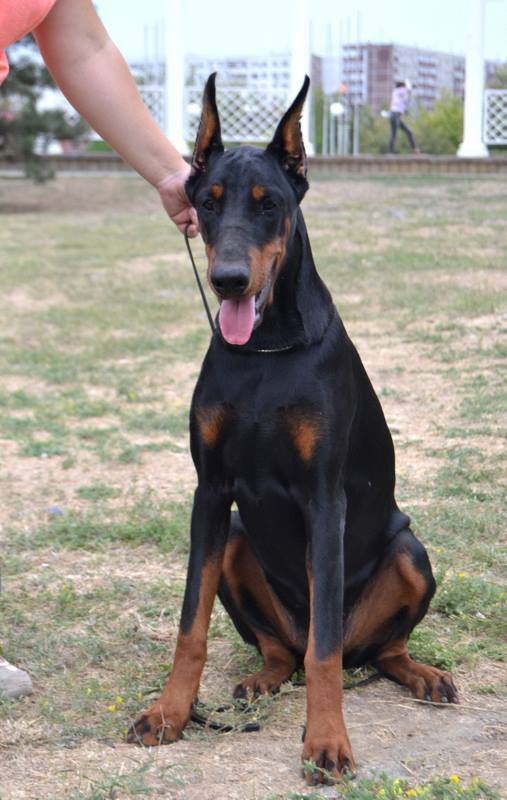 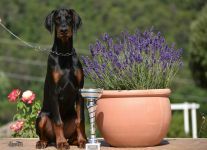 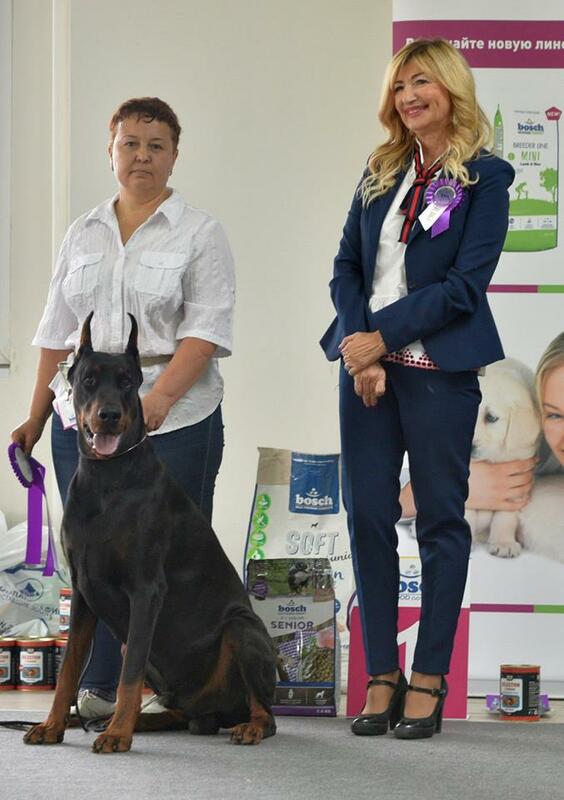 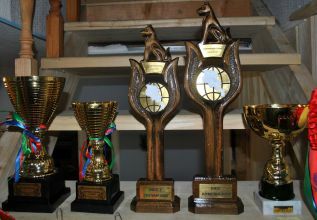 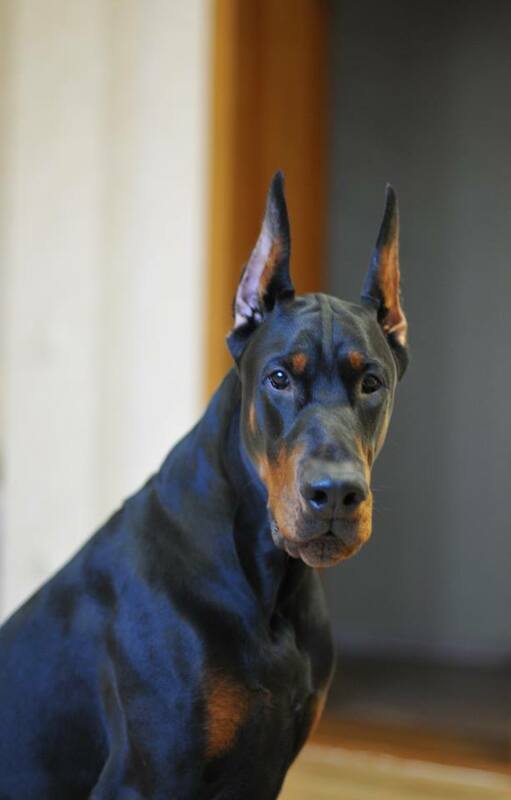 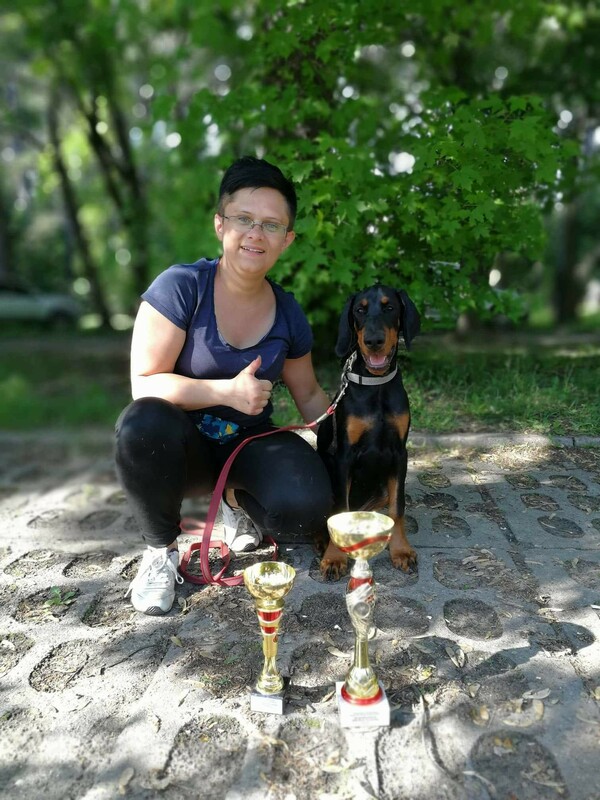 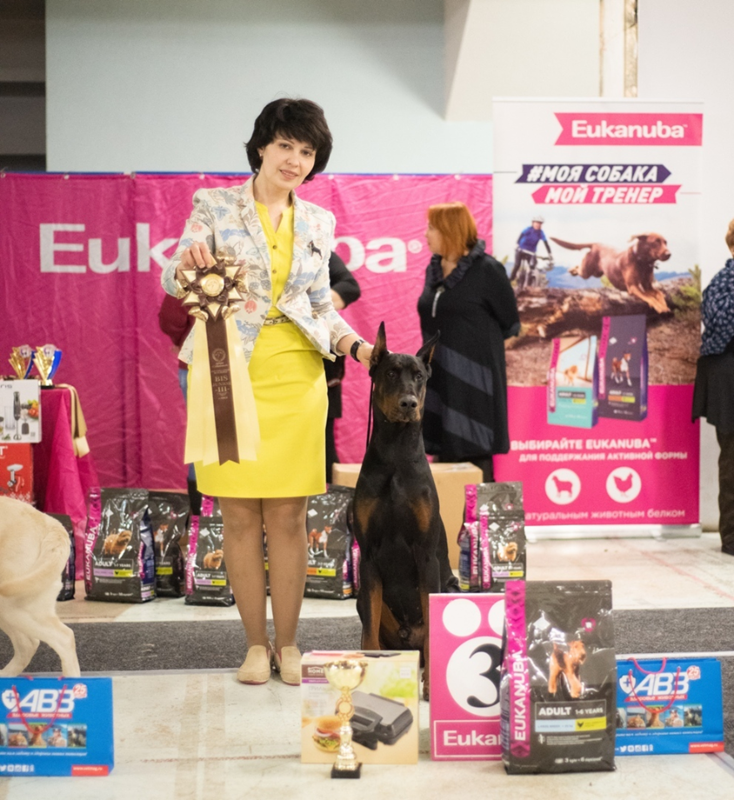 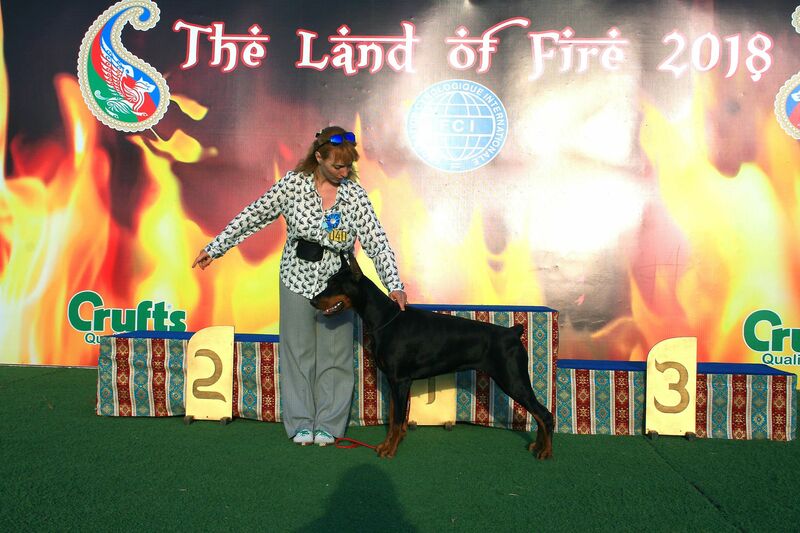 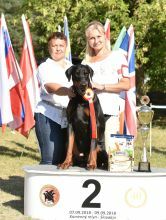 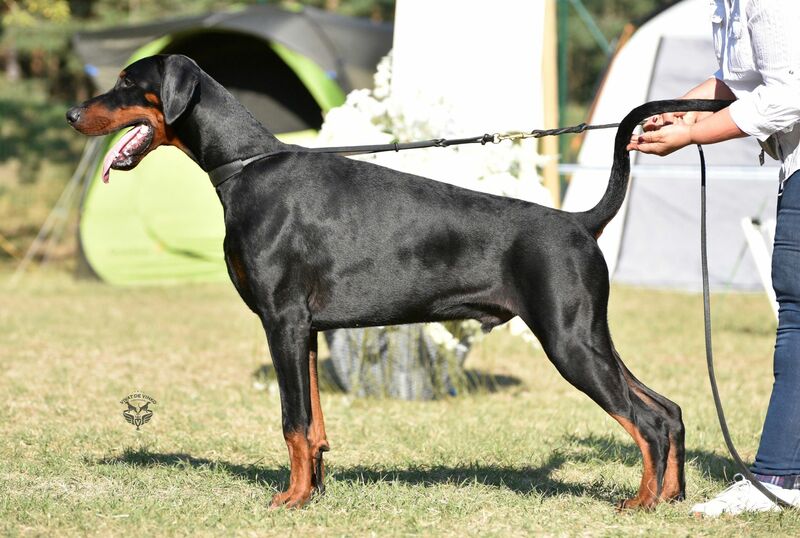 Finished title Russian Dobermann Club Champion. 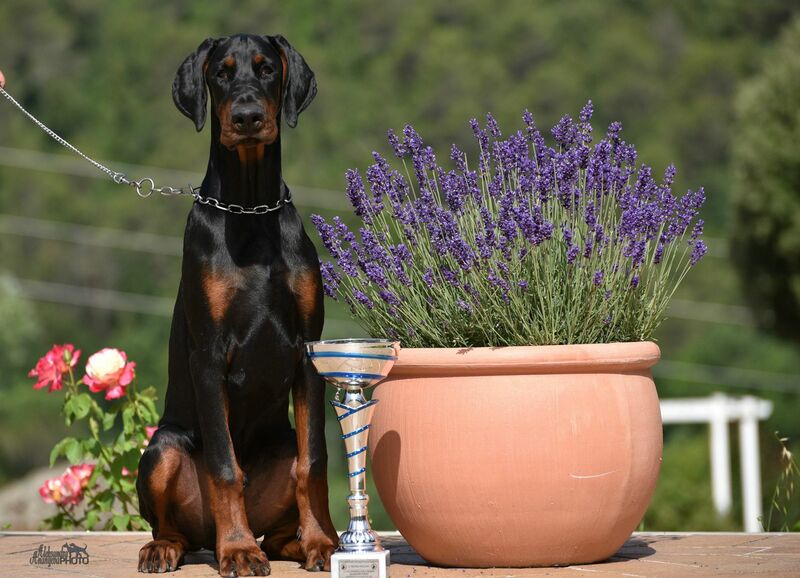 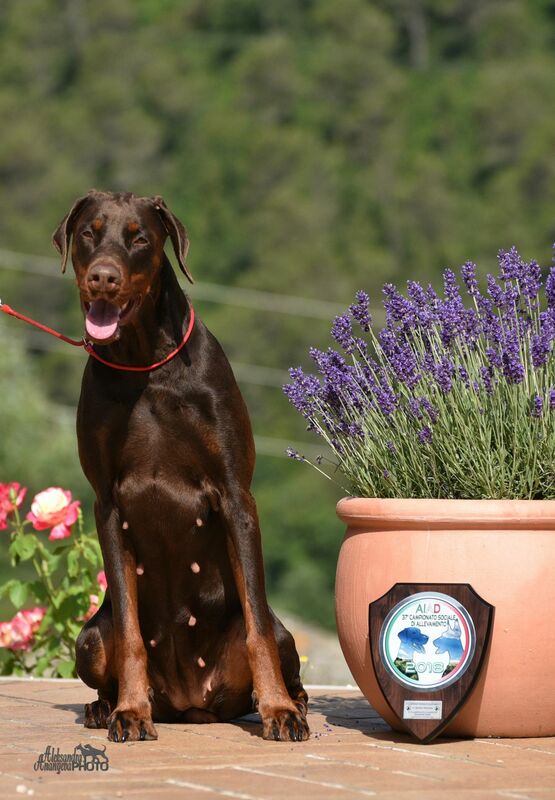 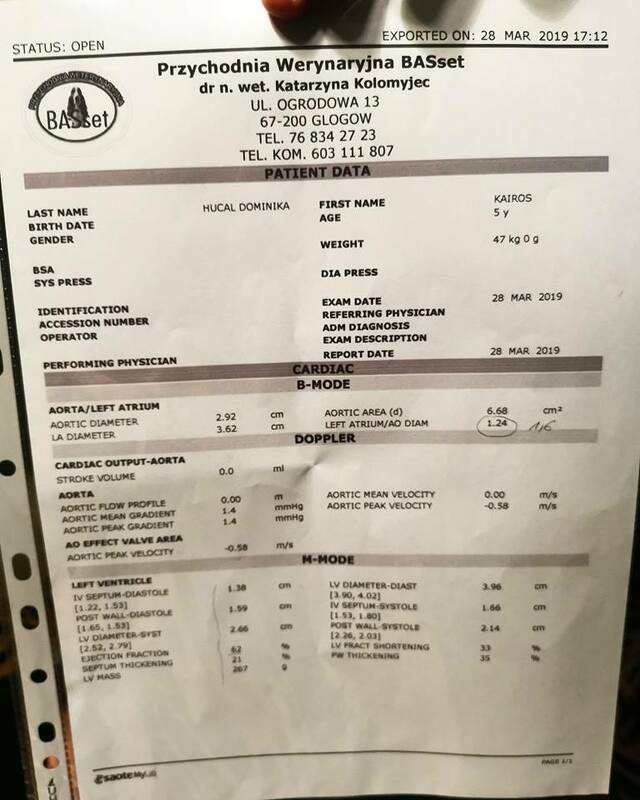 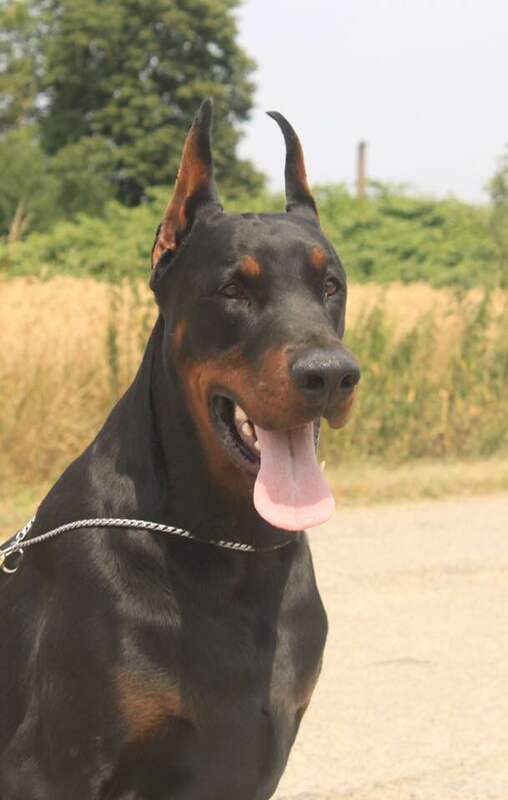 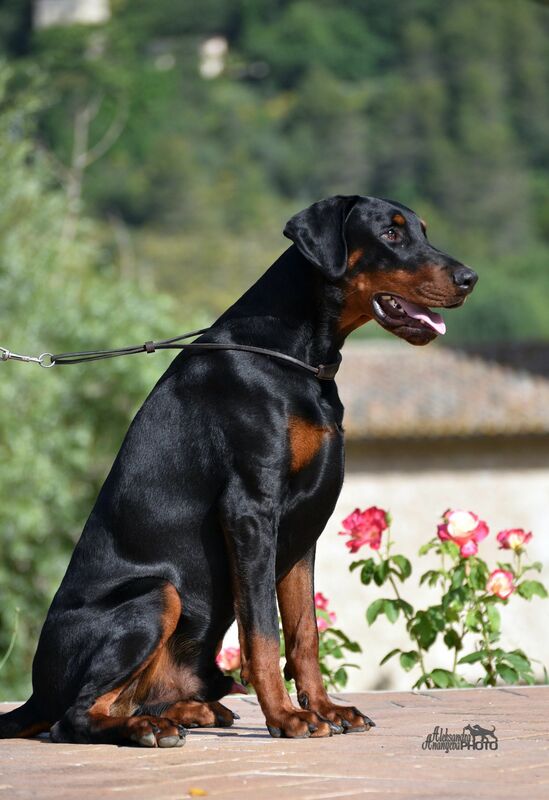 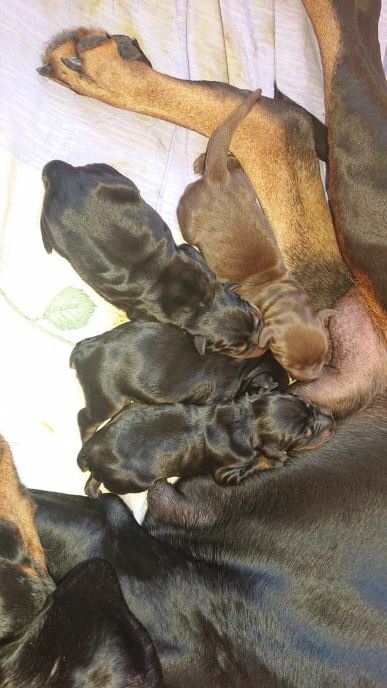 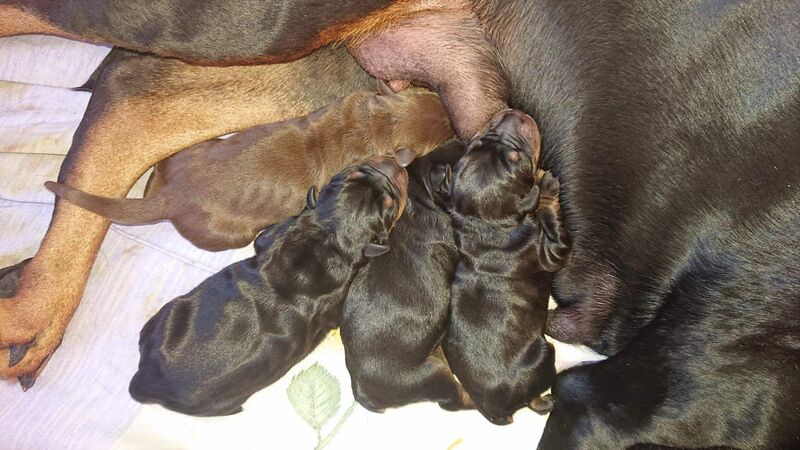 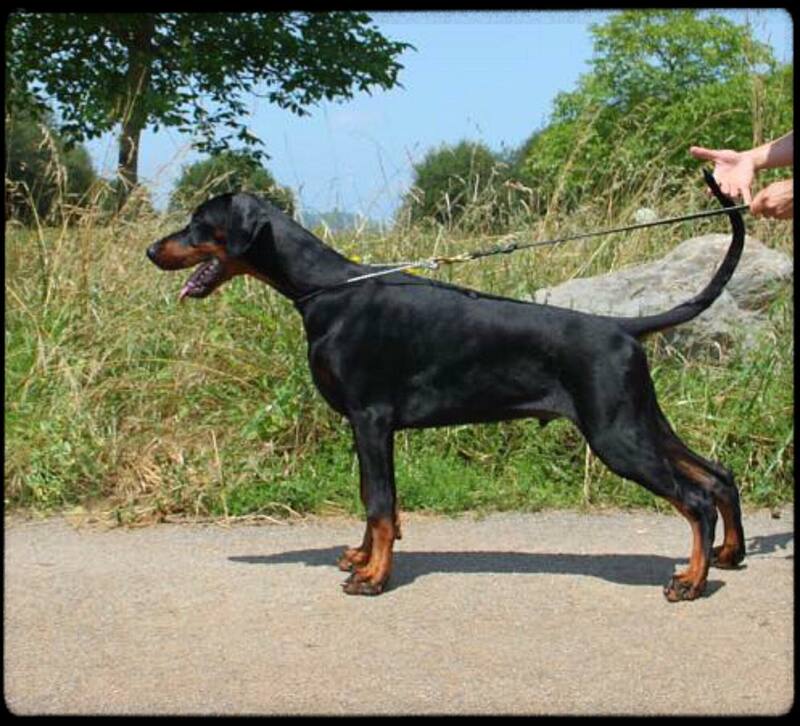 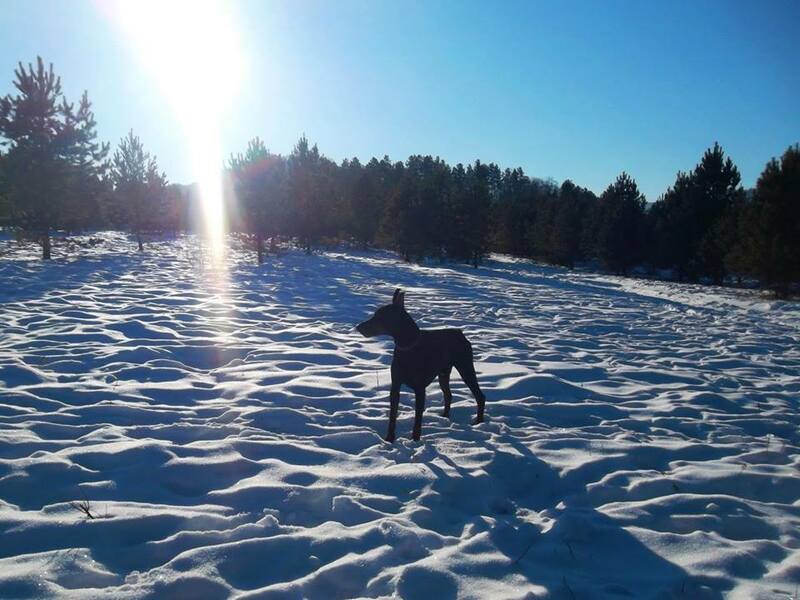 Vivat De Vinko Wendy Marvel ( Ayk Von Elbthor x Kalinka-Malinka De GrandeVinko)-ex.1, CW, JCAC, best Junior, BOB ! Finished title Junior Grand Champion of Ukraina! 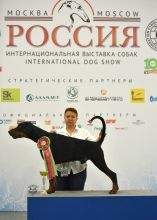 Finished title Veteran Champion of Russia! 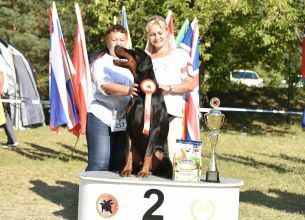 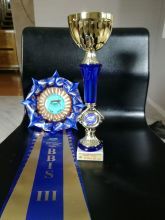 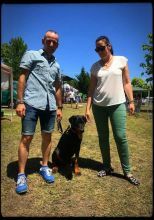 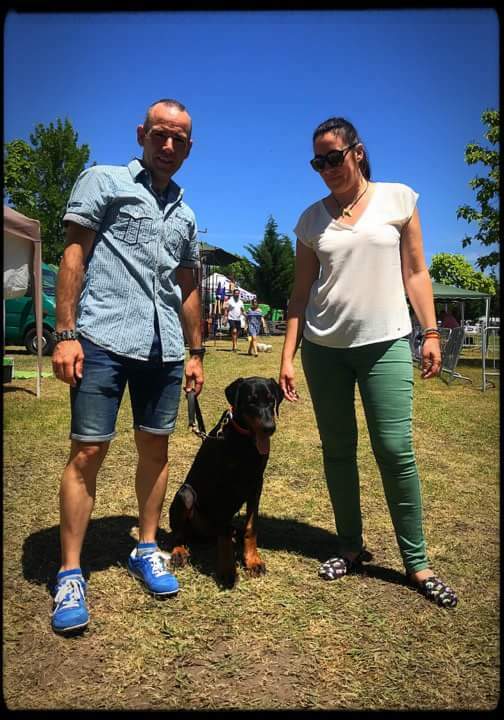 Vivat De Vinko Wealdburg (Ayk Von Elbthor x Kalinka-Malinka De Grande Vinko) With Victories at Shows and successful passing of testing! 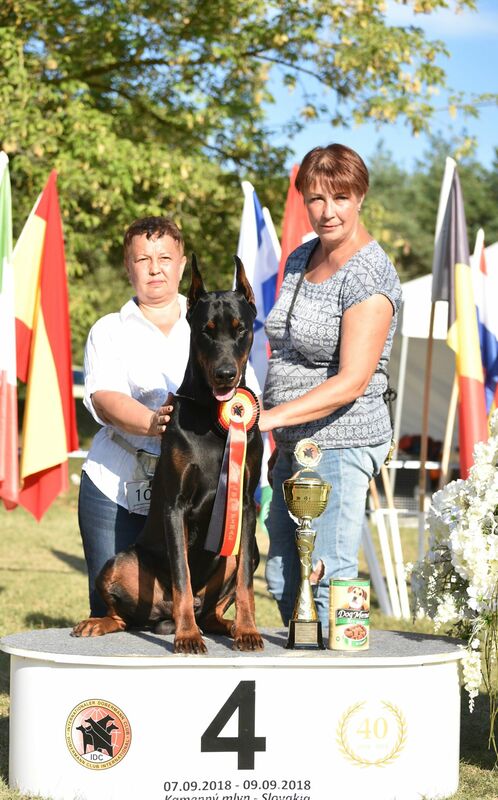 Vivat De Vinko Wealdburg finished title Junior Champion of RKF! 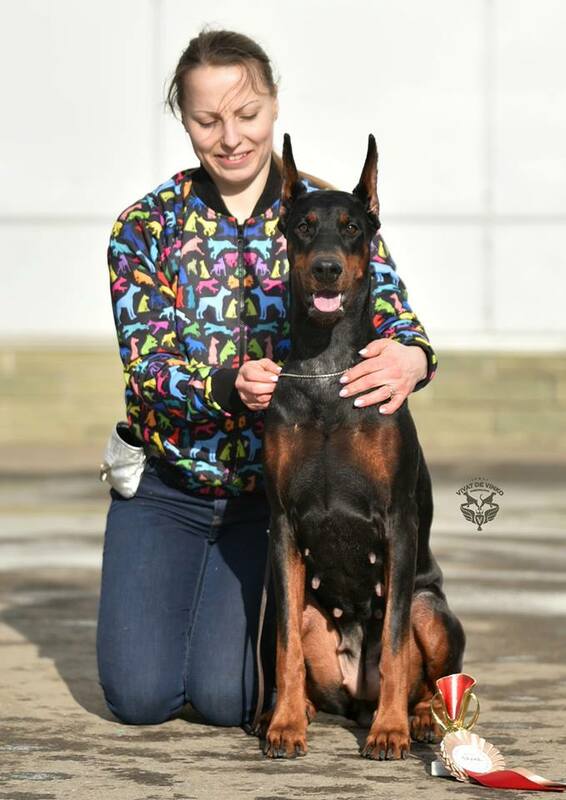 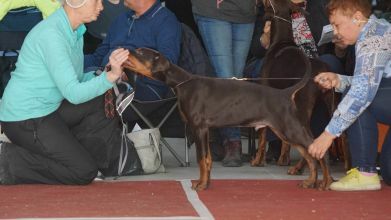 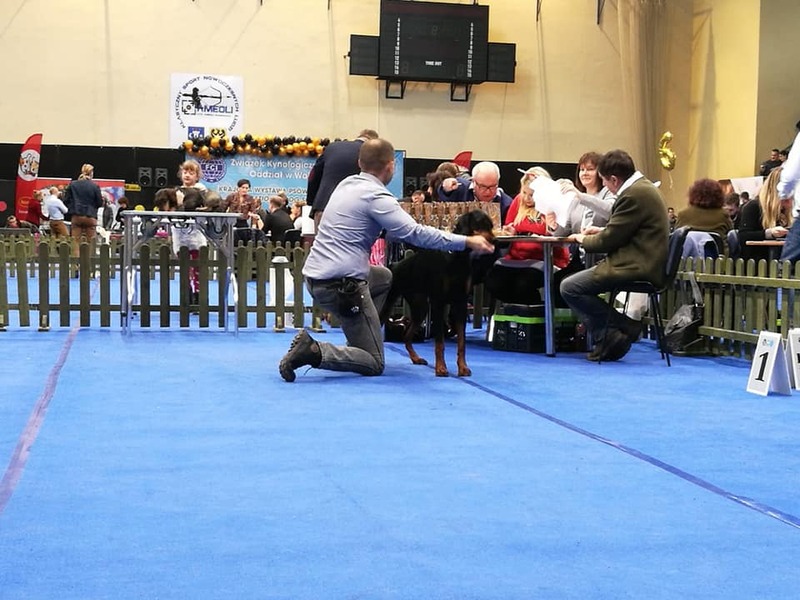 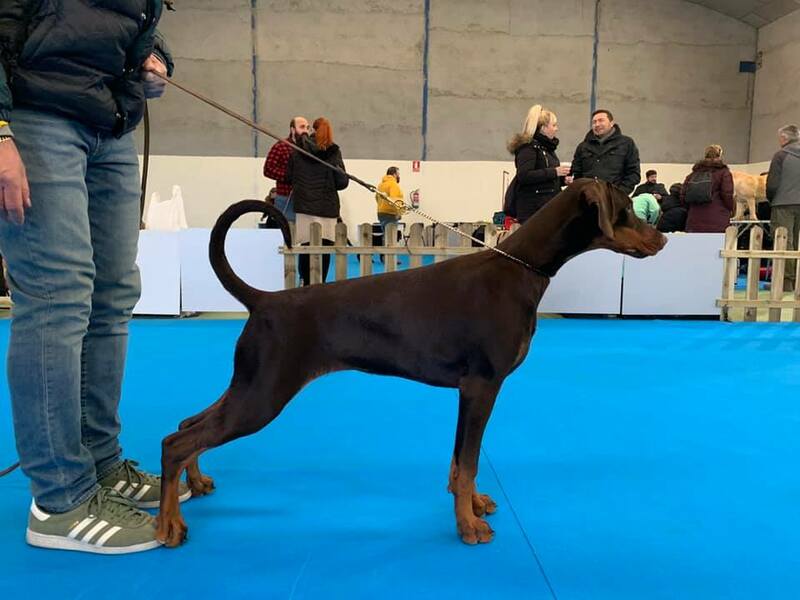 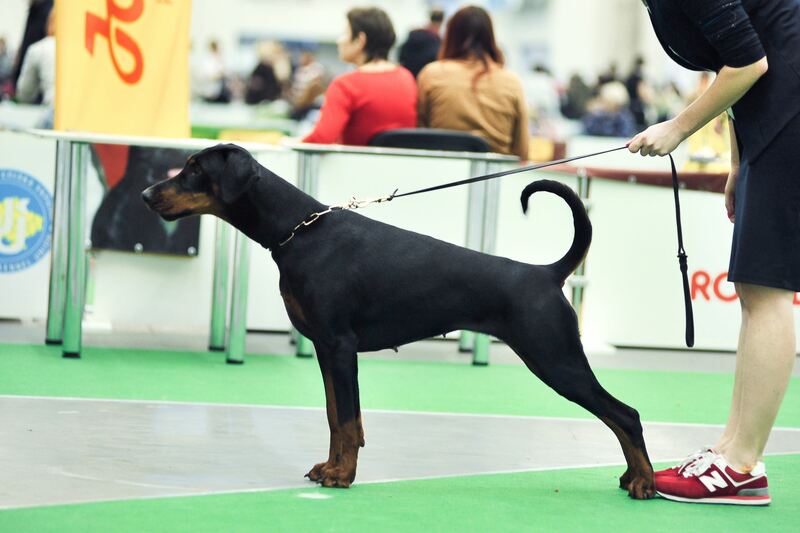 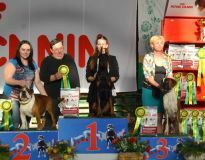 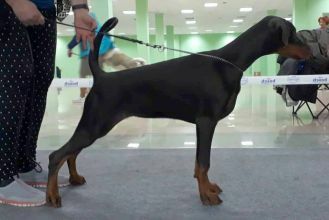 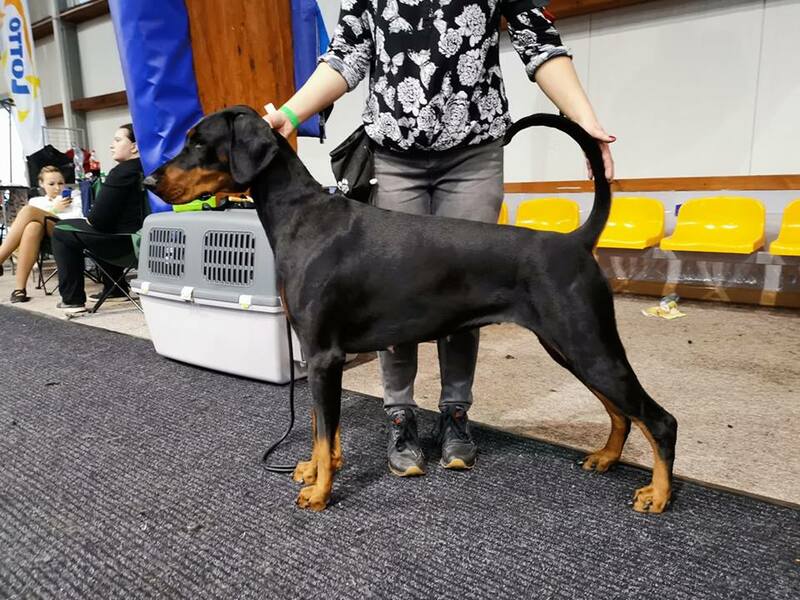 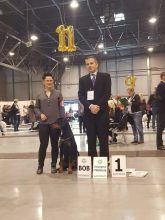 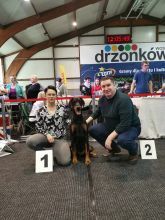 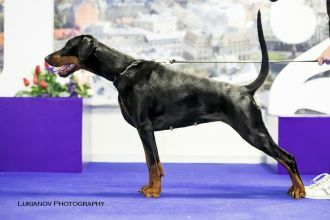 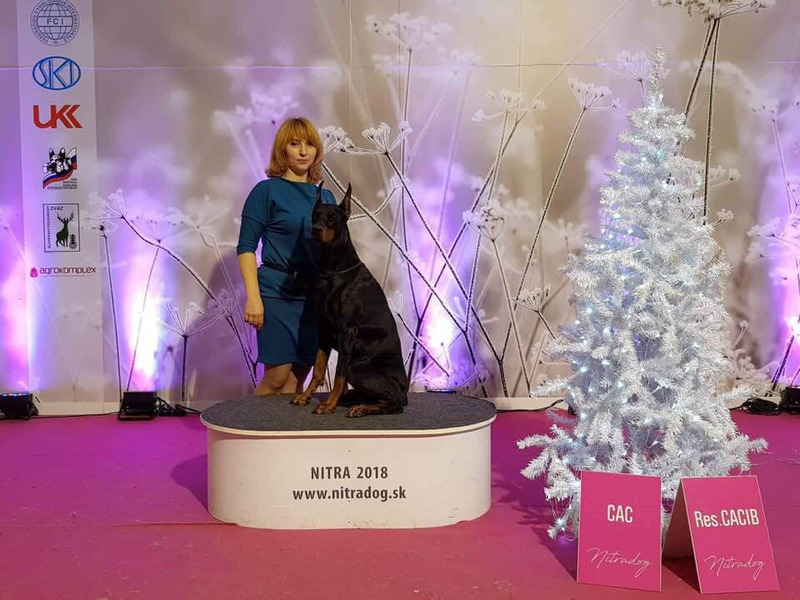 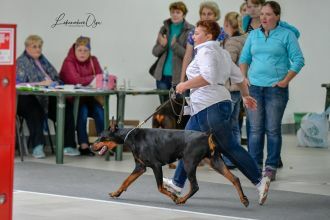 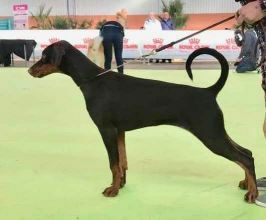 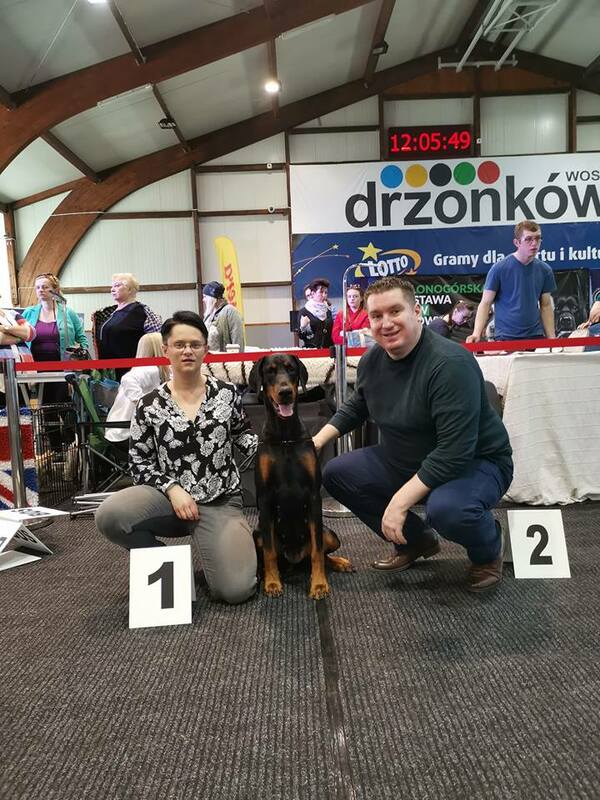 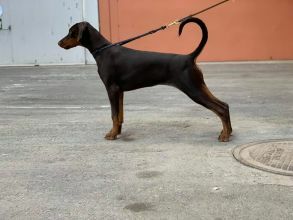 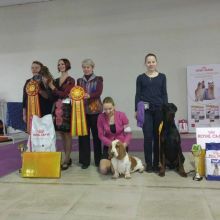 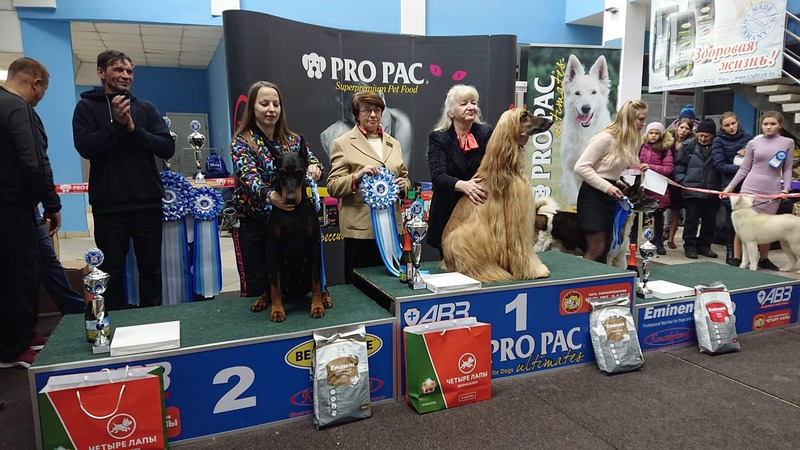 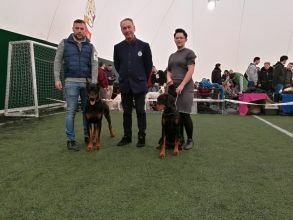 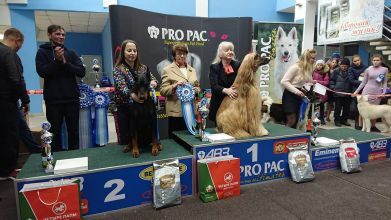 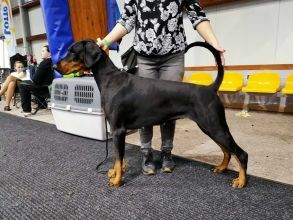 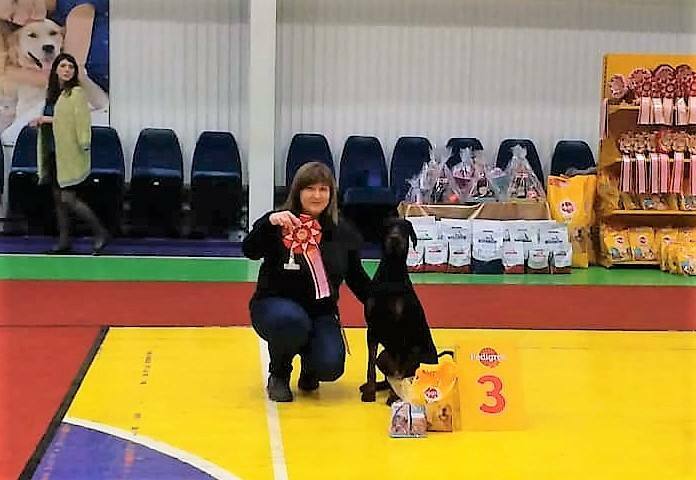 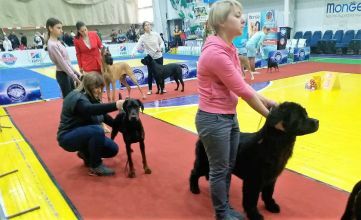 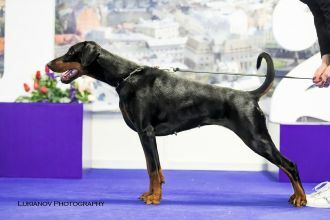 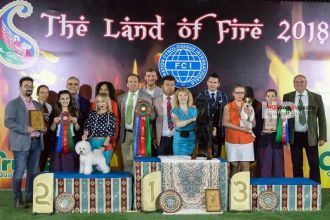 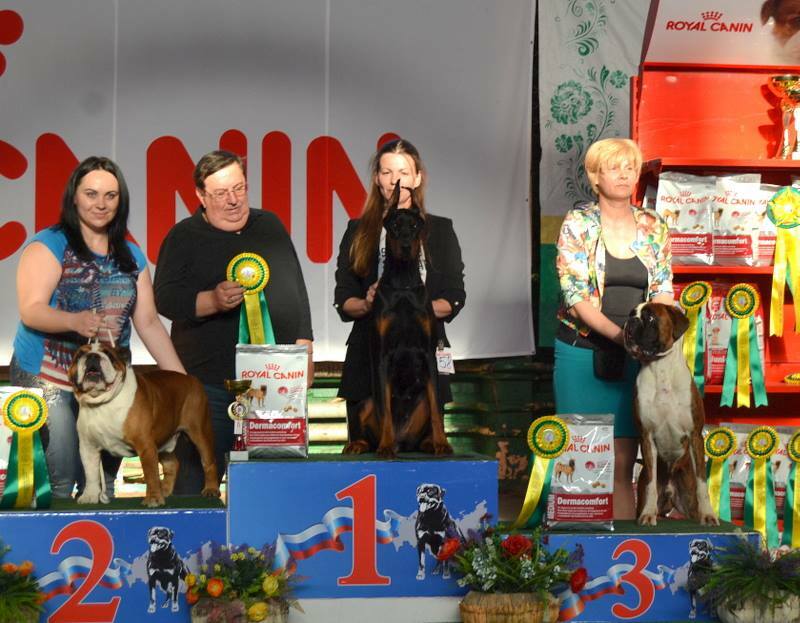 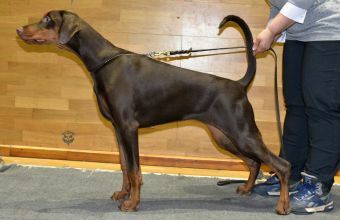 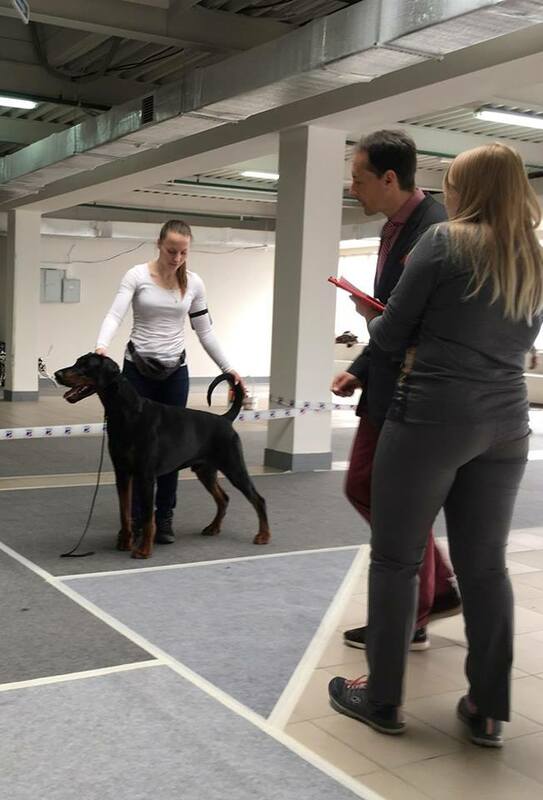 02.03.19 CAC Show RKF CH "Mordovia-2019"
Vivat de Vinko Wendy Marvel (Ayk vom Elbthor x Kalinka Malinka de Grande Vinko )- 1 exc., JCAC, Best Junior, BOS. Finished title Junior Champion of Ukraine! GEKATA DE VINKO IZ DOLINY DALMENOV (Pluto de Grande Vinko x Aida de Grande Vinko) - 13 years!!! Vivat De Vinko Wealdburg finished title Junior Champion of Russia! 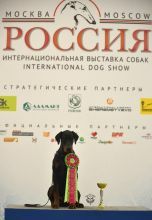 Finished title Junior Champion of Russia! 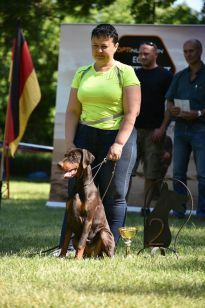 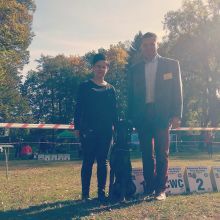 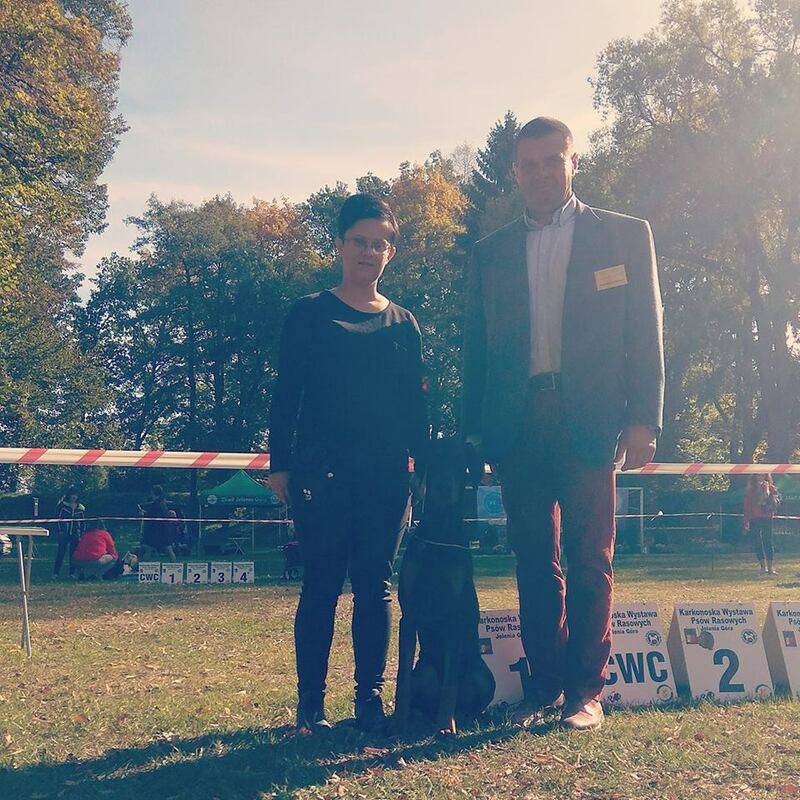 Vivat de Vinko Willi Wise (Ayk v. Elbthor - Kalinka-Malinka de Grande Vinko) - Best puppy, Res. BIS puppy!!! 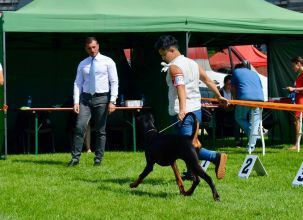 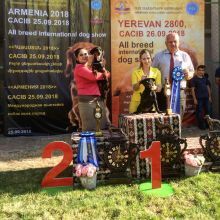 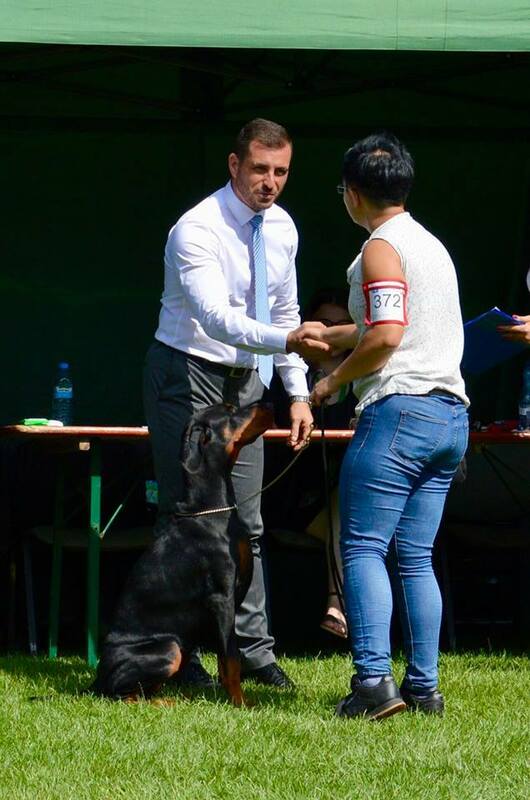 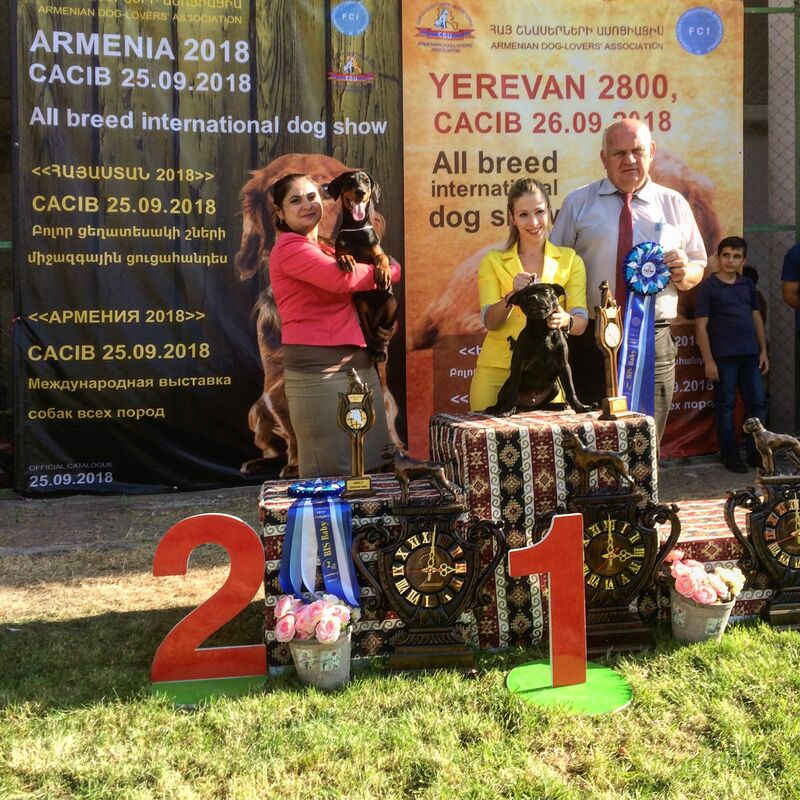 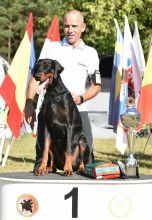 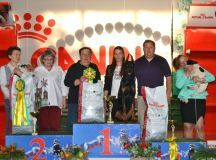 KNYAZ MOSKOVII DE GRANDE VINKO (Oksamit de Grande Vinko- Alastriona de Grande Vinko) - CACIB, RCACIB, Champion of Georgia, Armenia, Azerbaijan, Kura champion, Caucasus champion, Closed the title of Interchampion! 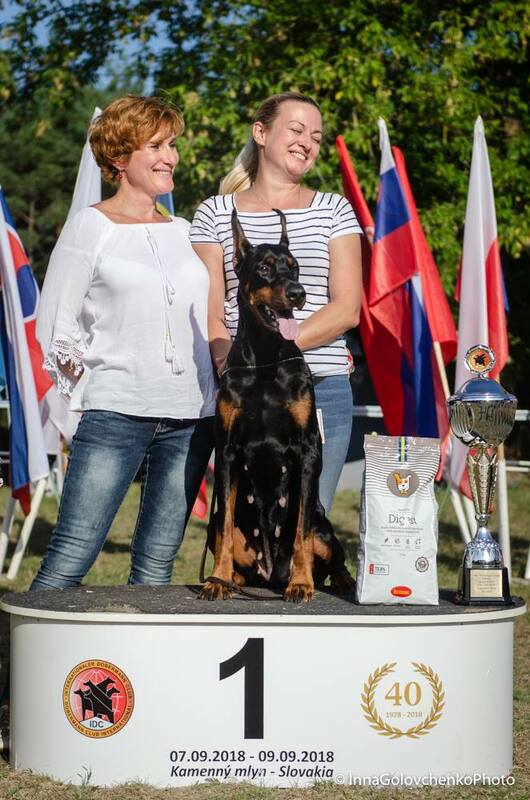 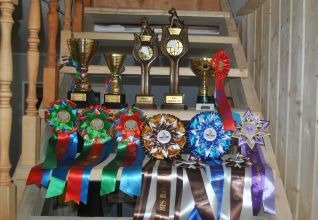 Vivat de Vinko Umberto (Quickstep King of Darckness & Diana Princess Warrior De Grande Vinko) 2xJCAC, 2xBEST JUNIOR, 2xBOB! 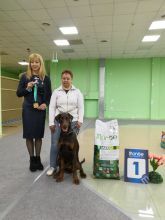 Finished title Russian Junior Champion! 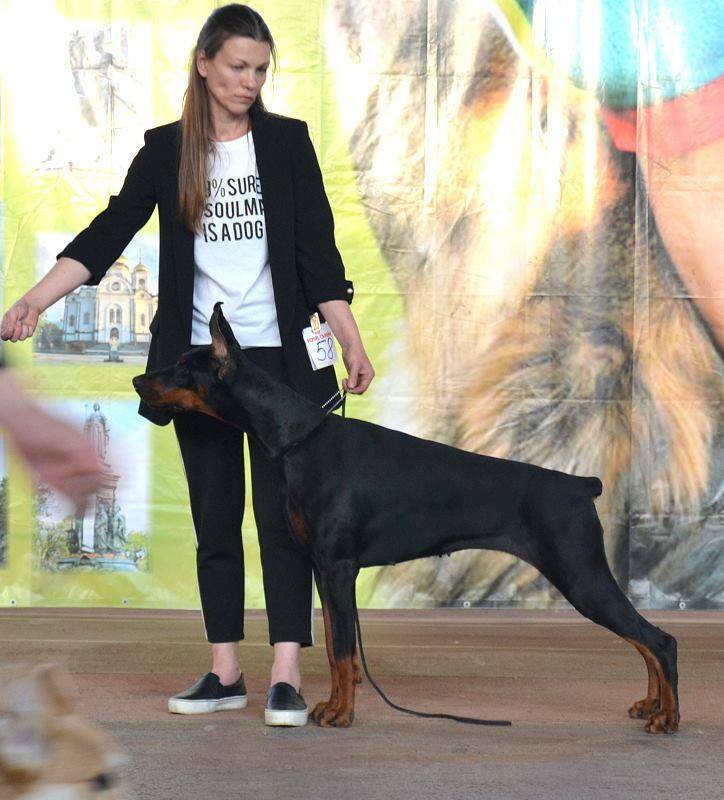 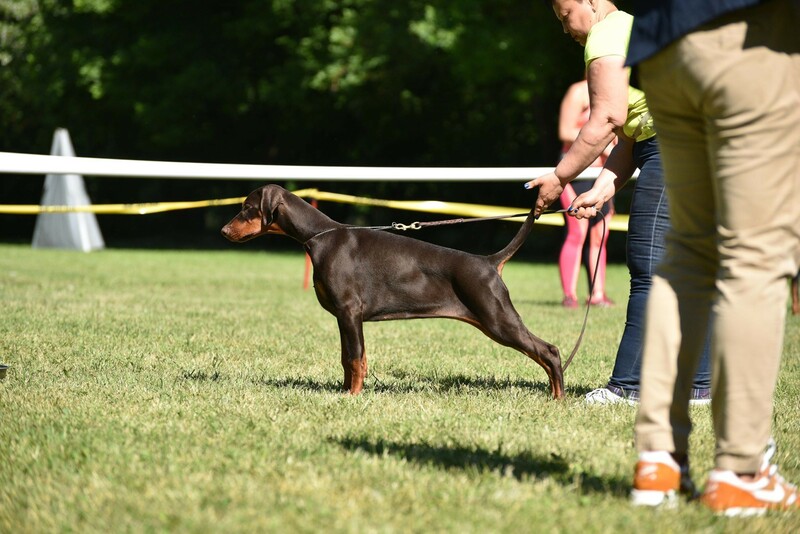 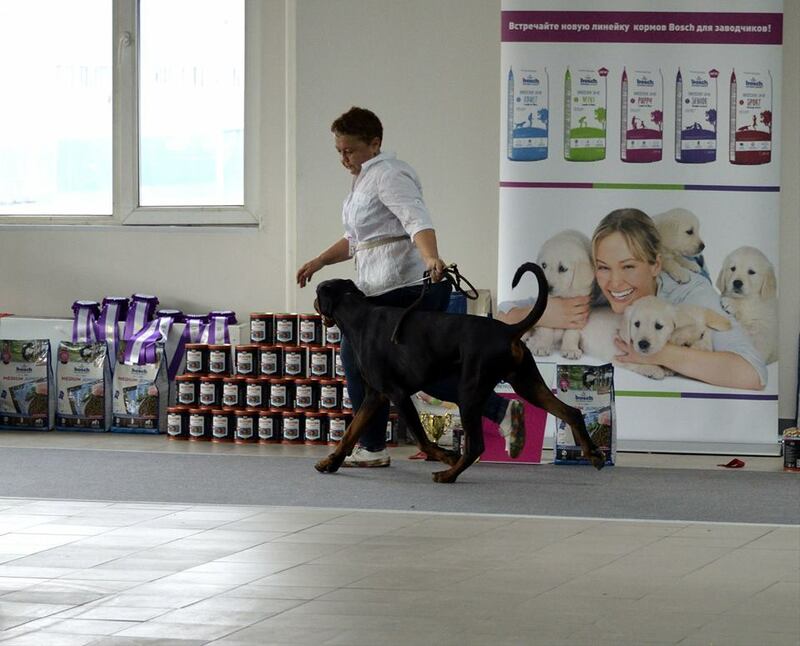 05.08.18 Special Dobermann Show, Moscow. 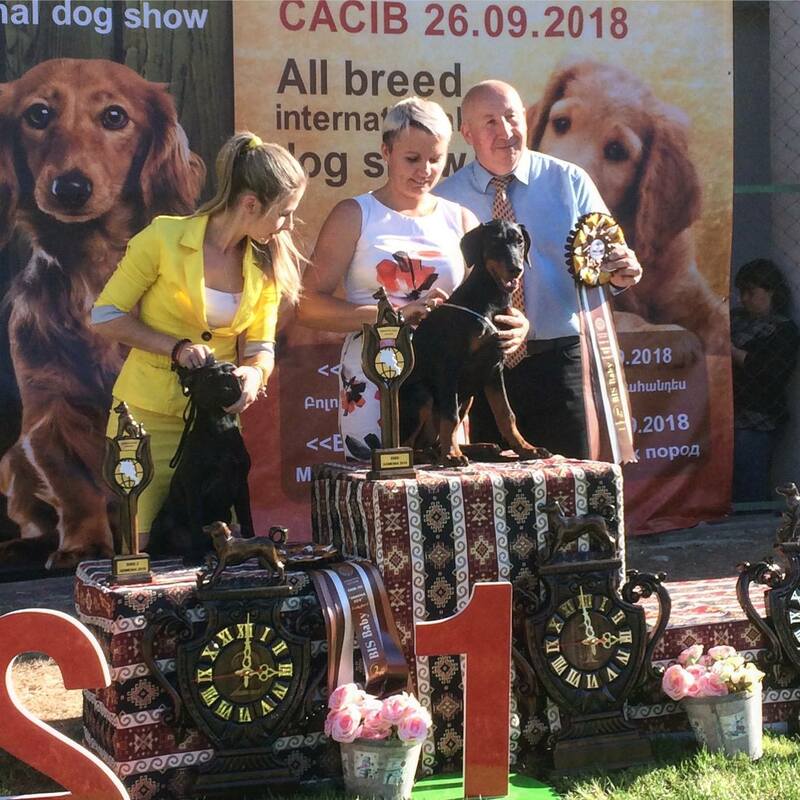 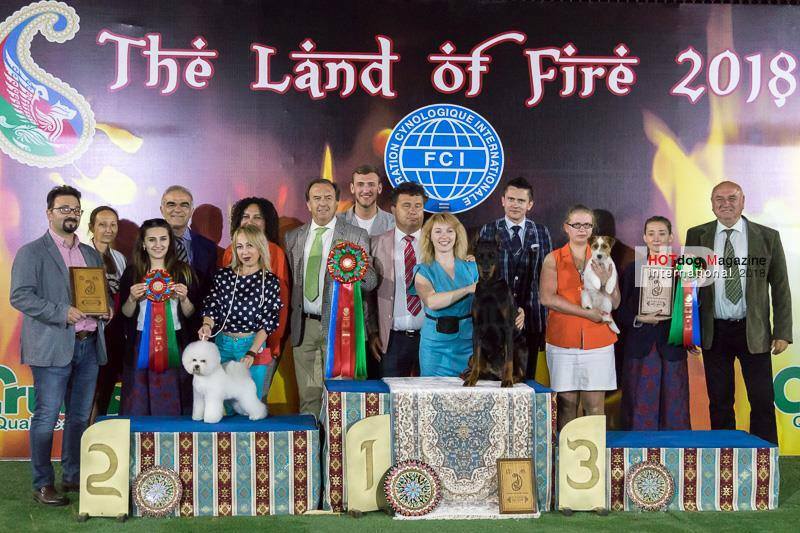 Club Winner "Moscow Championship"
03.06.2018 CAC-FCI-Show "Meeting of friends"
Vivat de Vinko Willi Wise (Ayk v. Elbthor - Kalinka-Malinka de Grande Vinko) - Bis Baby black. 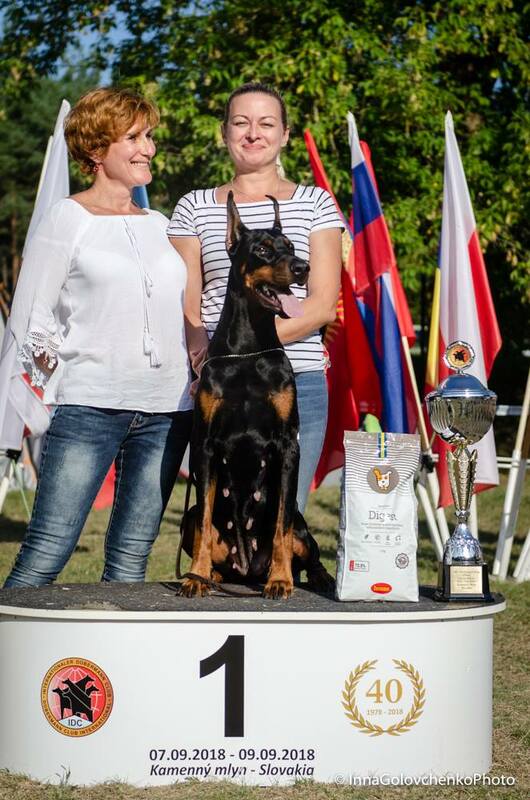 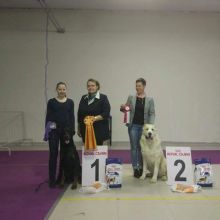 KALINKA-MALINKA DE GRANDE VINKO (Oksamit de Grande Vinko-Alastriona de Grande Vinko) - working class winner! 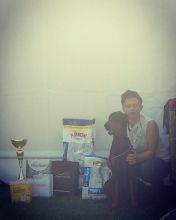 Champion of Hungary!!! 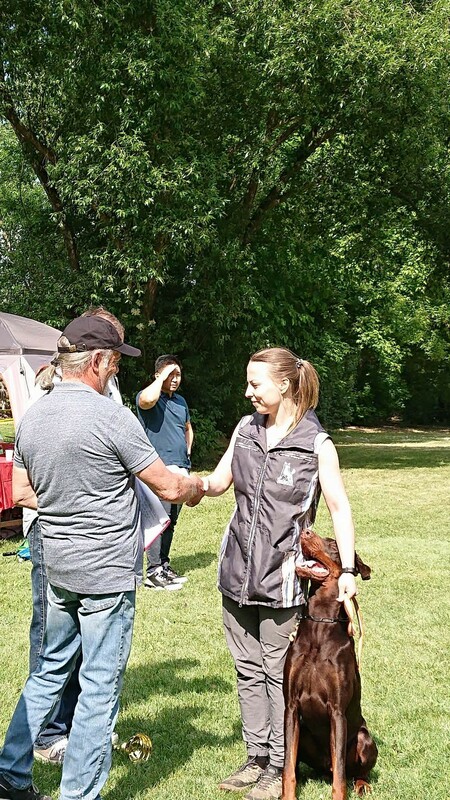 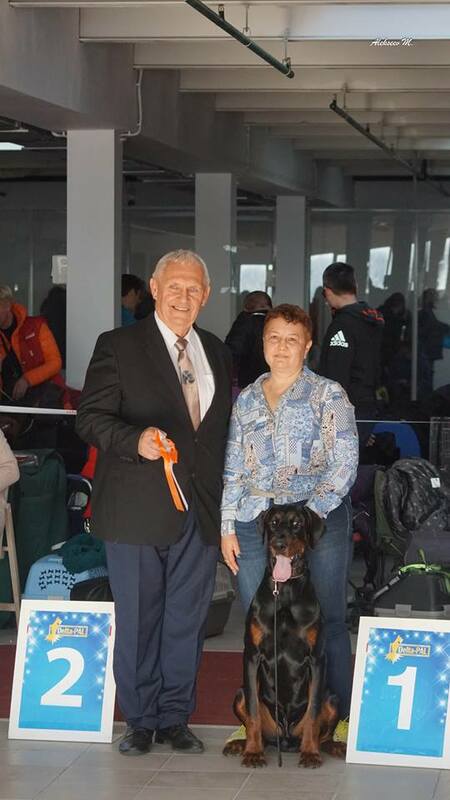 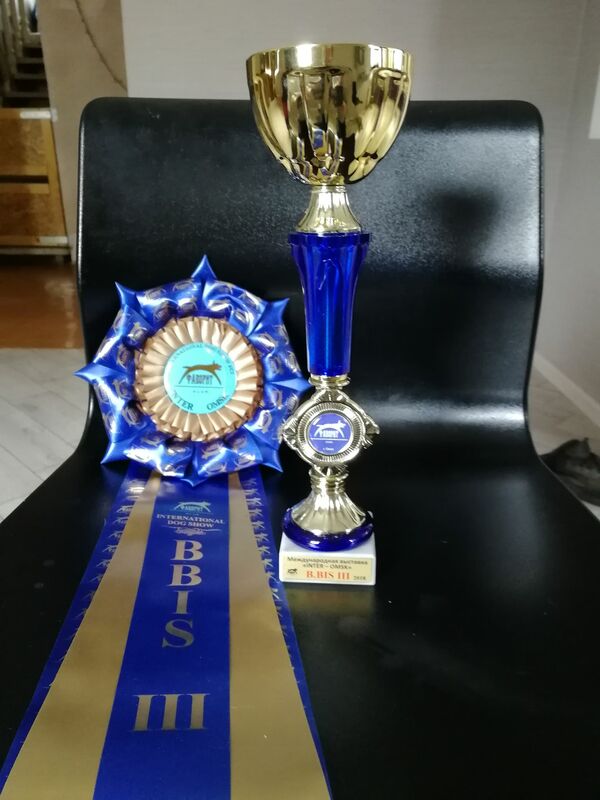 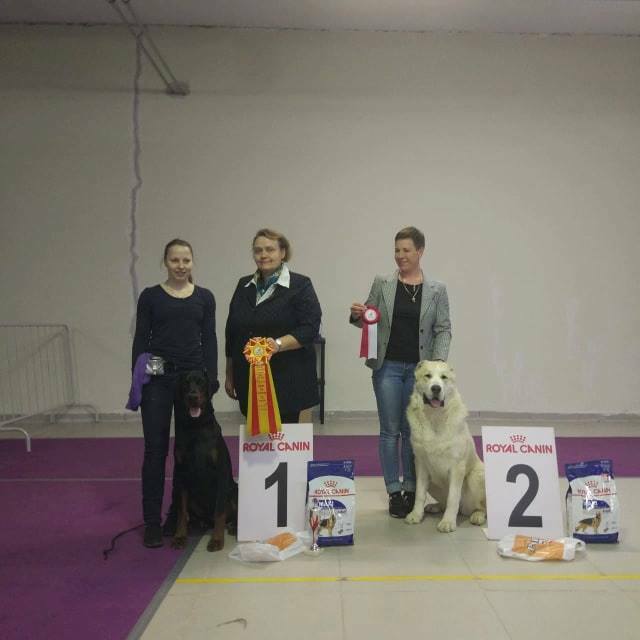 Huge congratulations to the owners of our dogs with the victories at the exhibitions on 28-29.04.2018! 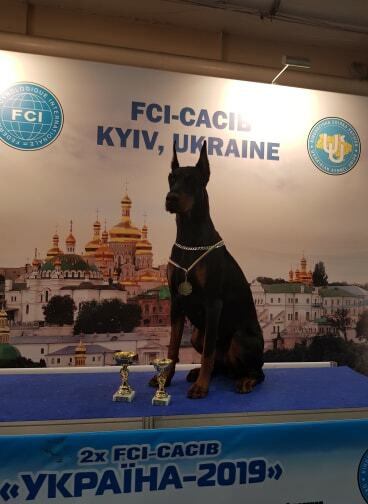 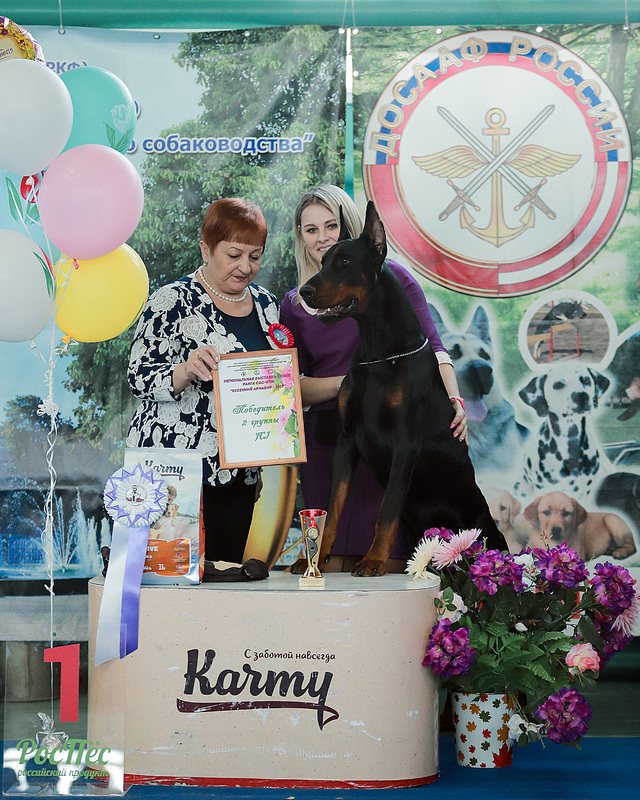 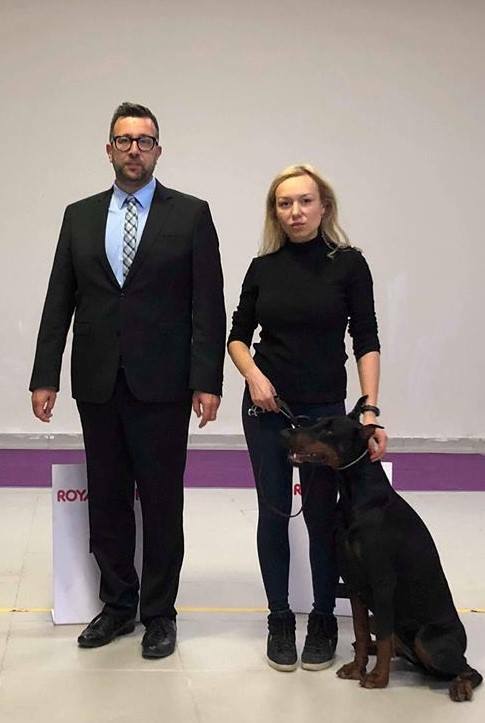 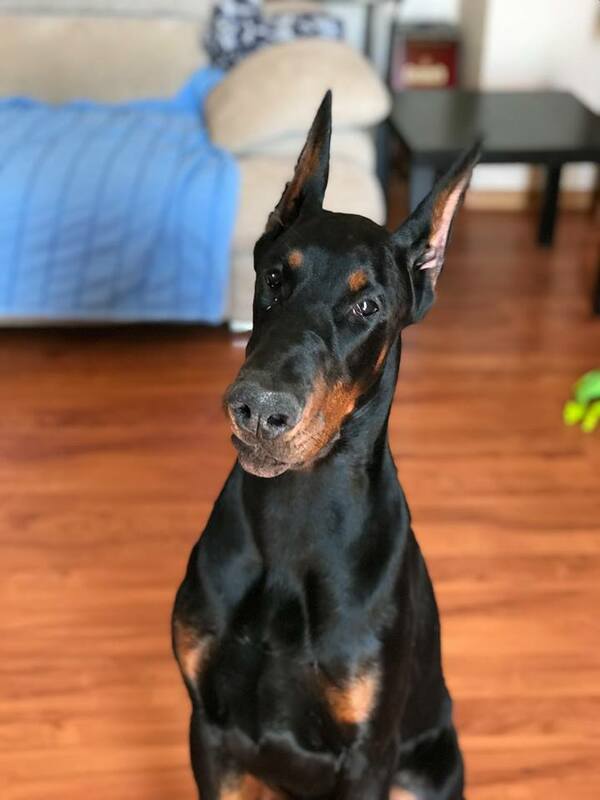 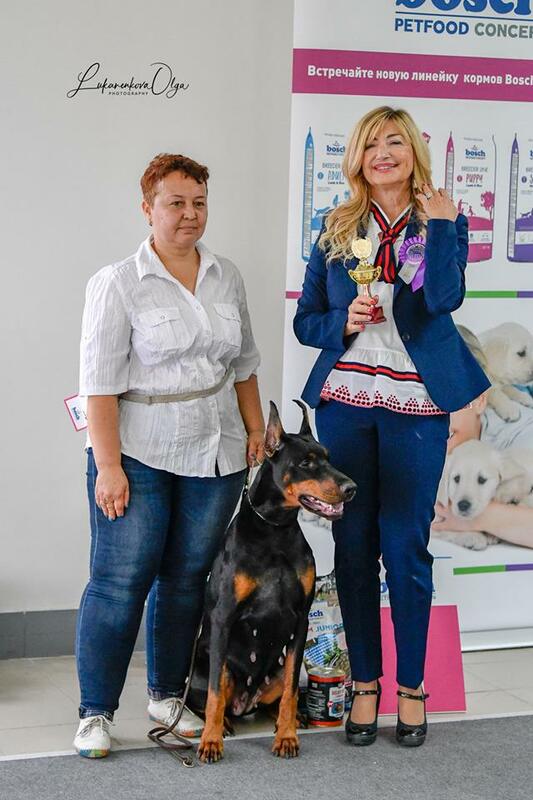 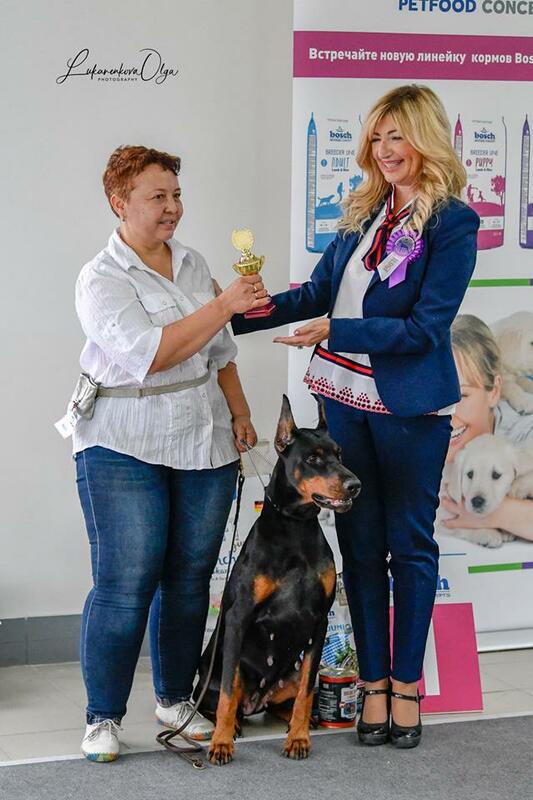 04/28/2018 Kiev FCI-CACIB, "Zoloti Vorota 2018"
VIVAT DE VINKO VITALE MARE NERO (Okean Elzy de Grande Vinko x Zarina Mare Nero de Grande Vinko ) BABY CLASS WINNER , BEST BABY!